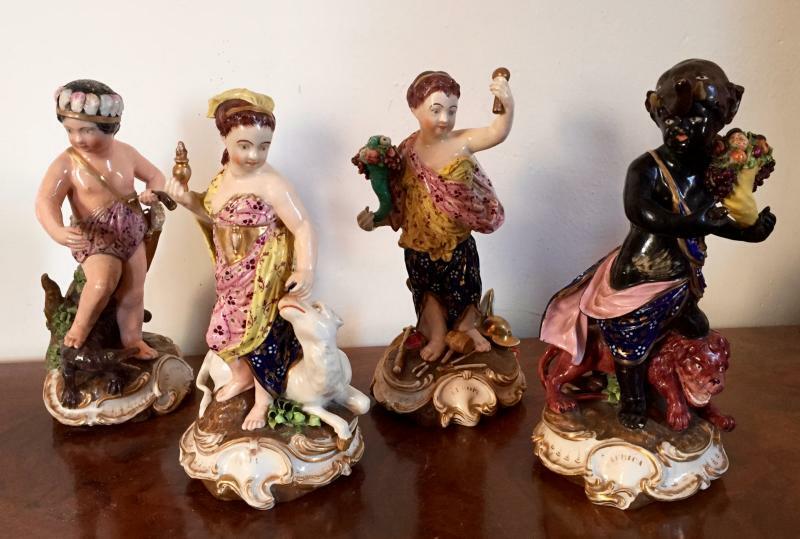 18th century pearlware Four Seasons figures in pink luster. 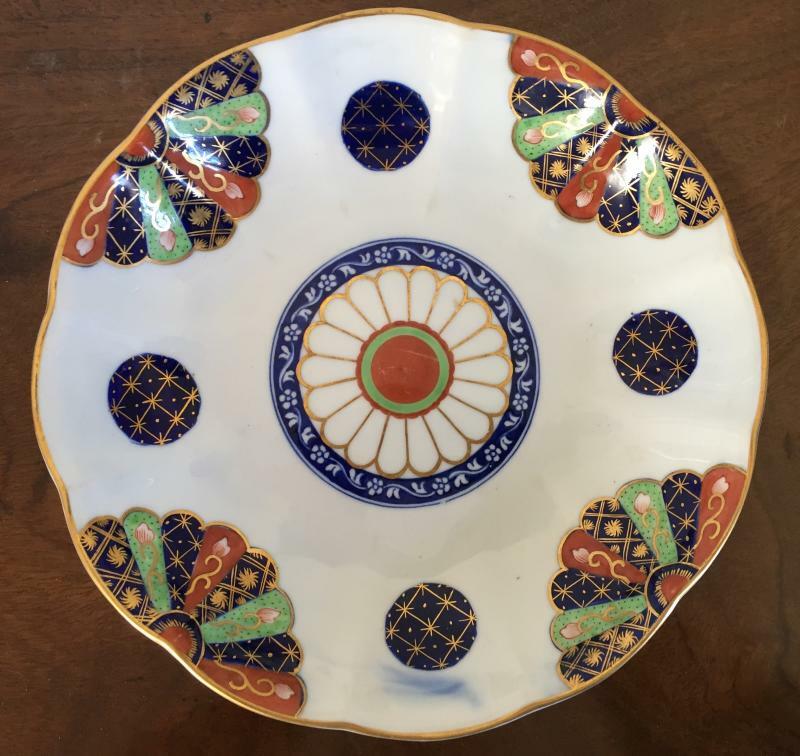 Extensive collection Coalport Rock & Tree imari porcelain including a pair of fruit coolers with liners, tureens for soup and sauce, sucrier, plates and bowls..
18th century Worcester porcelain lozenge shape dessert dish with central reserve of Droitwich Spa. Early 19th century Englsih reticulated chesnut basket decorated with flowers. 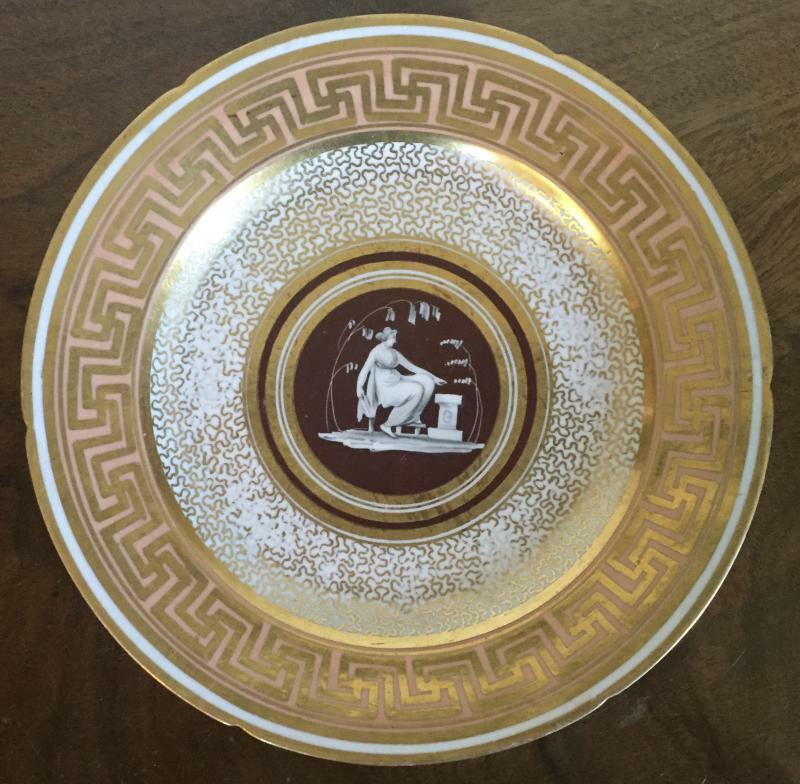 Coalport porcelain plates decorated with classical figures and gilt Greek key border on salmon and brown ground 1810. 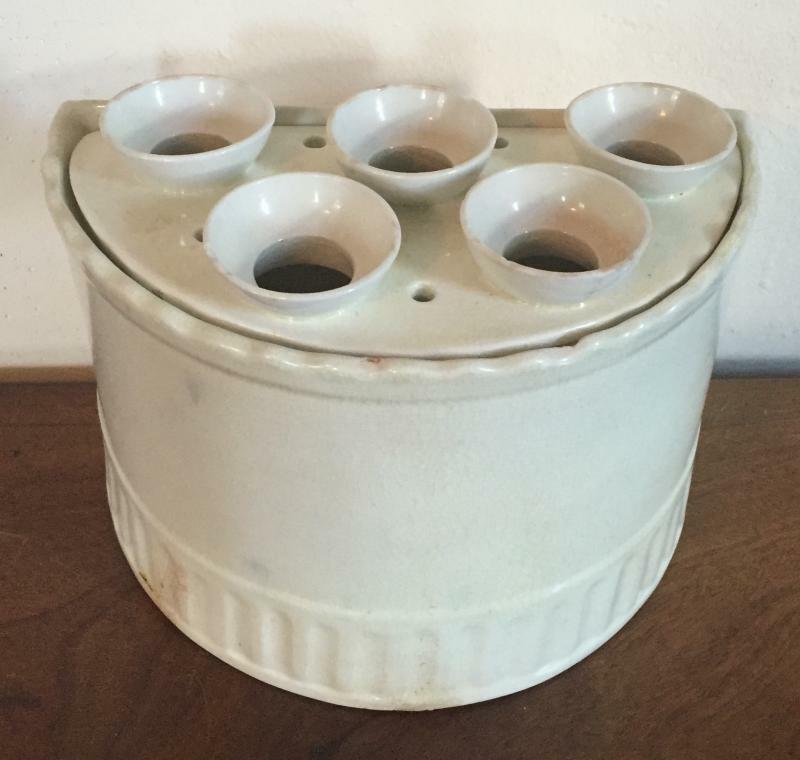 Large, early 19th century Wedgwood pearlware hedgehog pot for crocus bulbs with under tray. 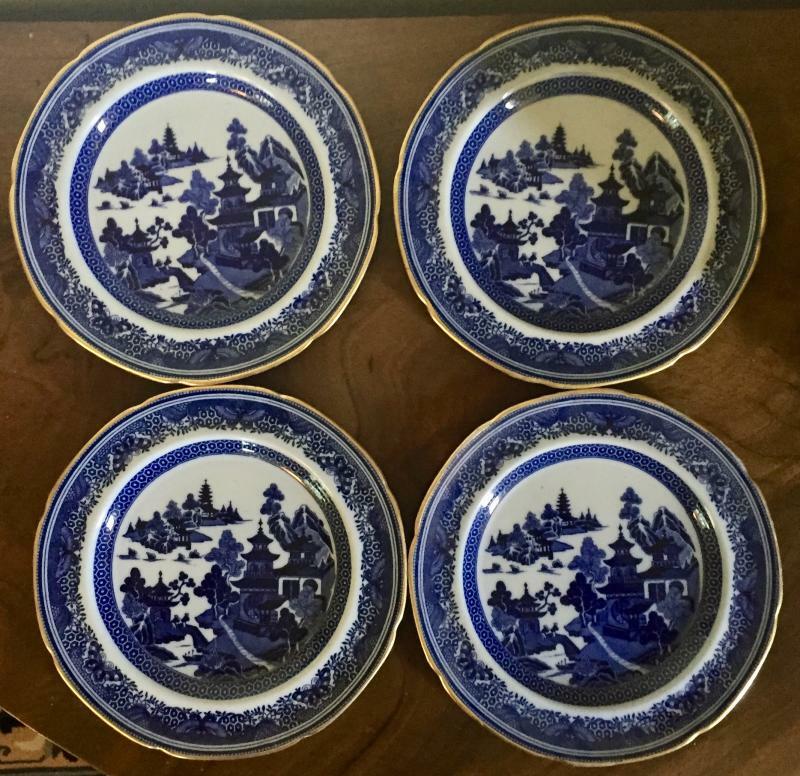 19th century Copeland Spode porcelain plates, platters, sauce tureen and entree dish in the Chinese Canton blue & white style enhanced by rich gilding. 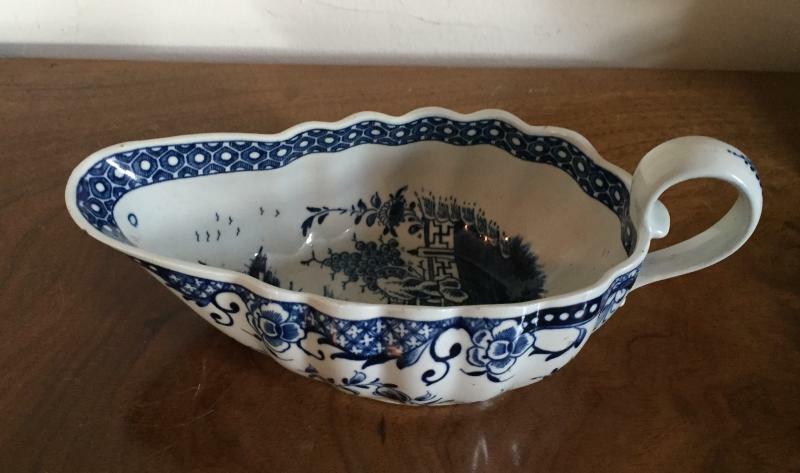 Mason's Patent Ironstone China rococo shell shape dish with sprig cornflower decoration - early 19th century. Early 19th century Wedgwood and Sunderland pink moonlight luster including a large vase in the Chinese taste measuring 19 1/4" tall. 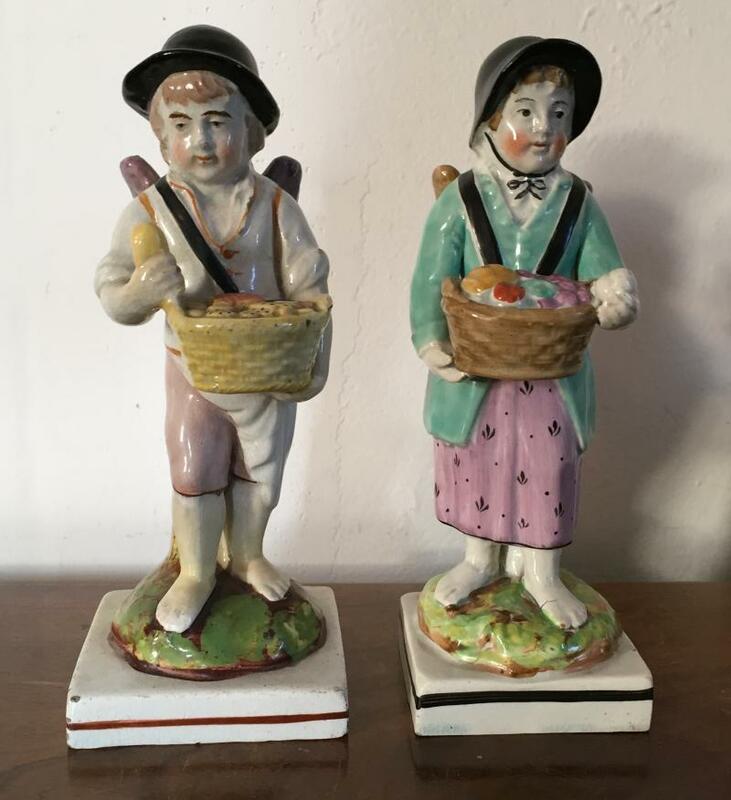 Pair early 19th century pearlware figures of Gardeners. 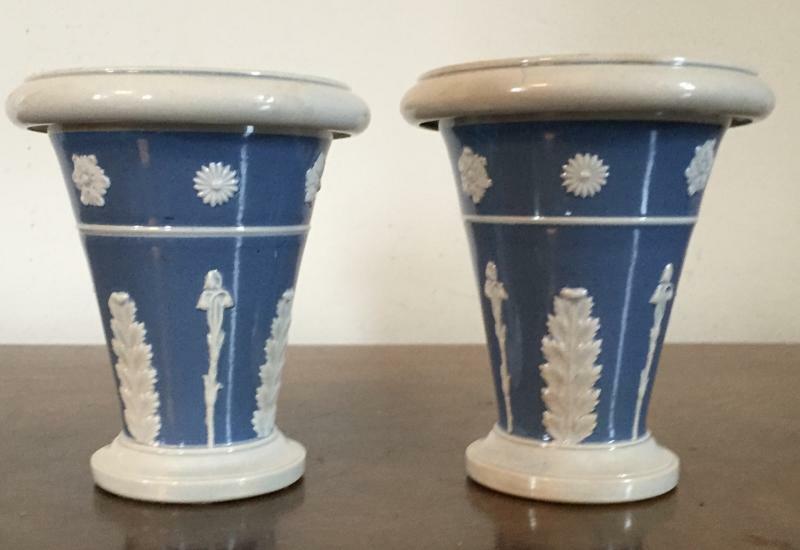 Pair early 19th century Ralph Wood pearlware vases with neoclassical sprigging on light blue ground. 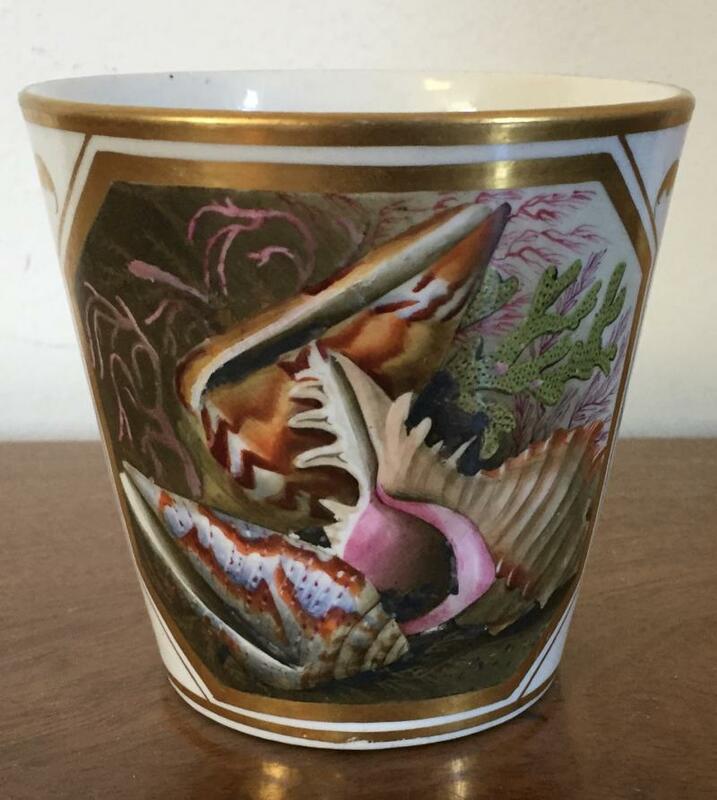 Coalport porcelain beaker vase decorated with hand painted sea shells incuding murex conch and cones c. 1810. 18th century Liverpool bird cage feeder decorated with exotic birds in the Chinese taste. 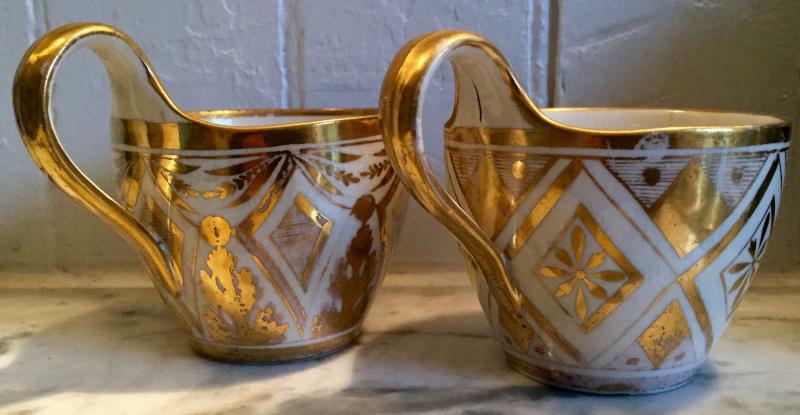 Pair 18th century Leeds creamware hexagonal reticulated beaker form vases and covers. 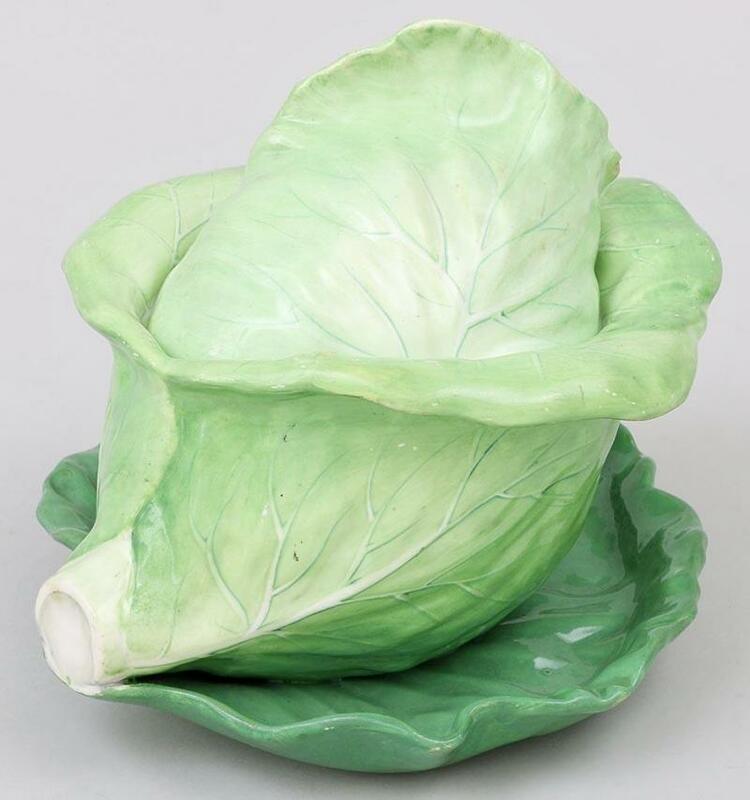 Lettuce or cabbage leaf tureens. 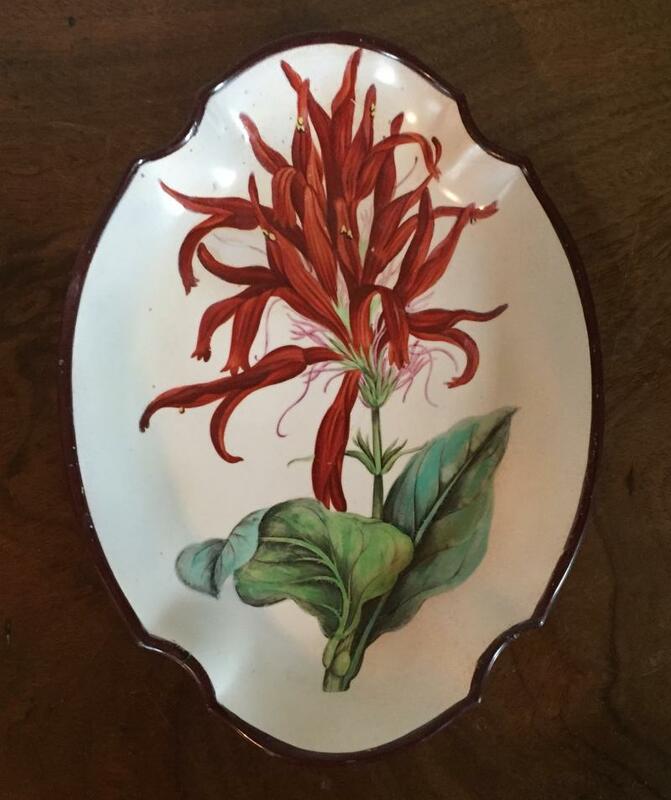 Large Wedgwood creamware tray or platter with red feathered edge - late 18th century. 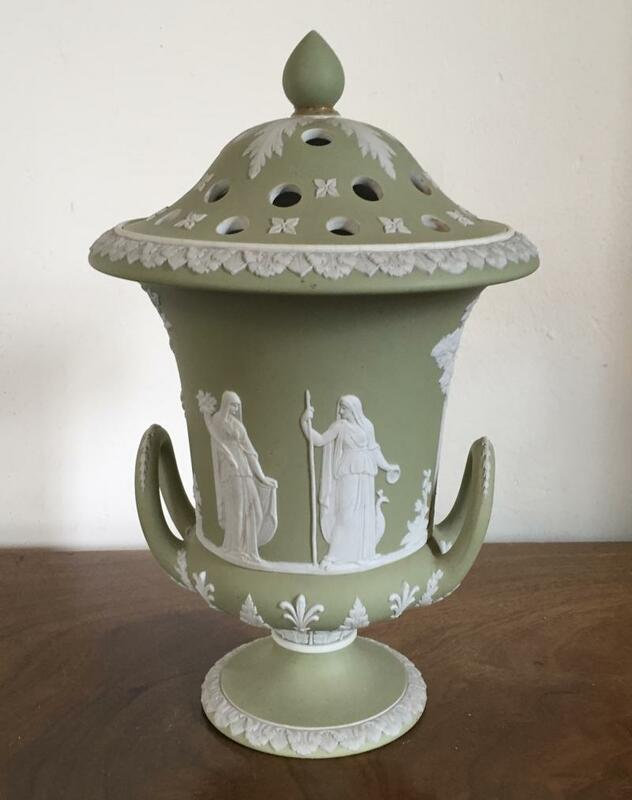 19th century Wedgwood light green jasperware urn with pierced cover. 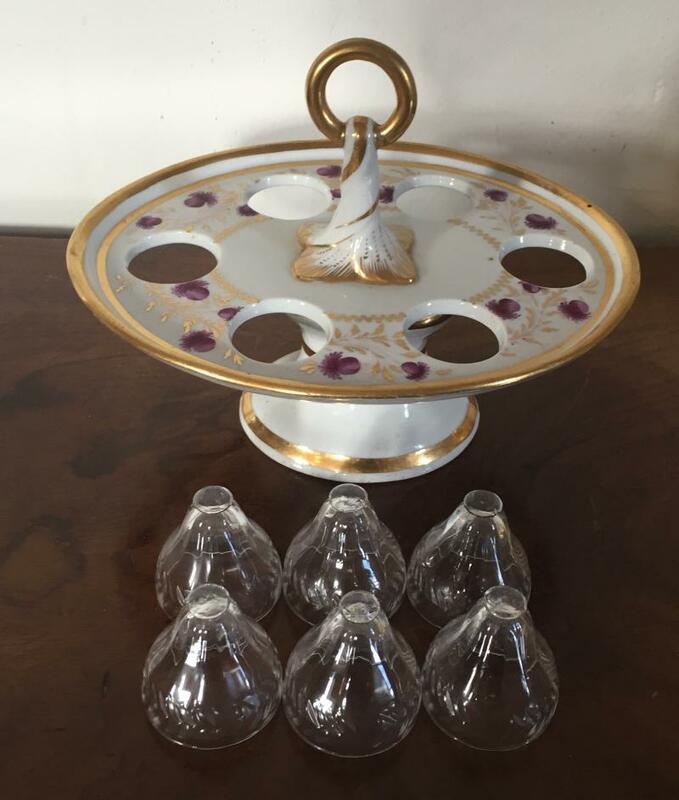 Early 19th century navette shape compote or tazza decorated with dragons. Large and important Staffordshire model of a poodle carrying a basket of fruit in its mouth by John & Rebecca Lloyd of Shelton 1840. 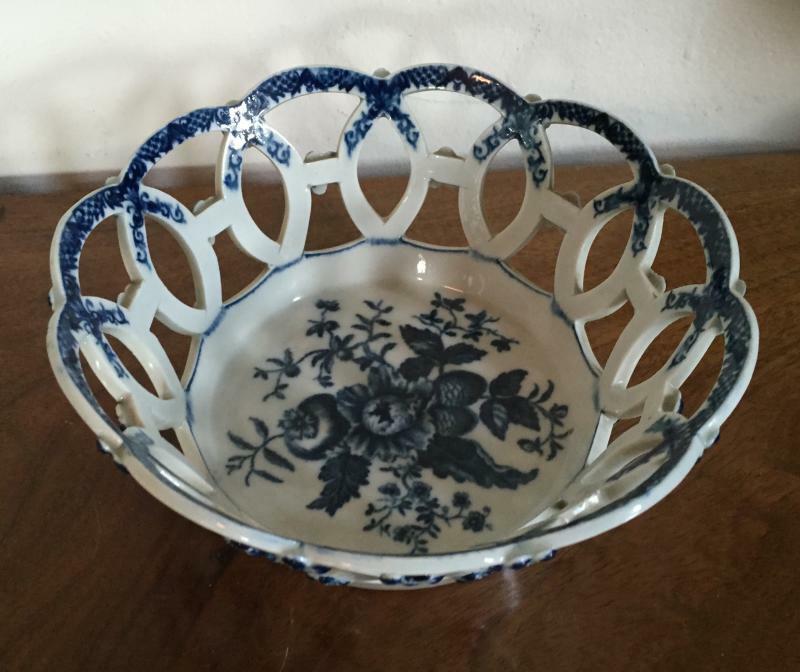 Early 19th century Coalport porccelain fruit cooler. 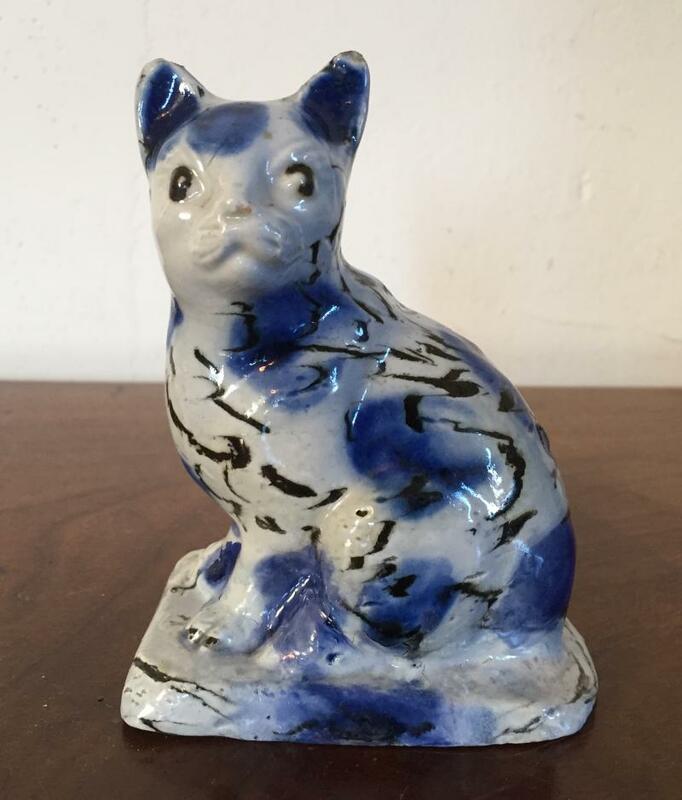 Staffordshire salt glazed stoneware agate model of a cat 1740. 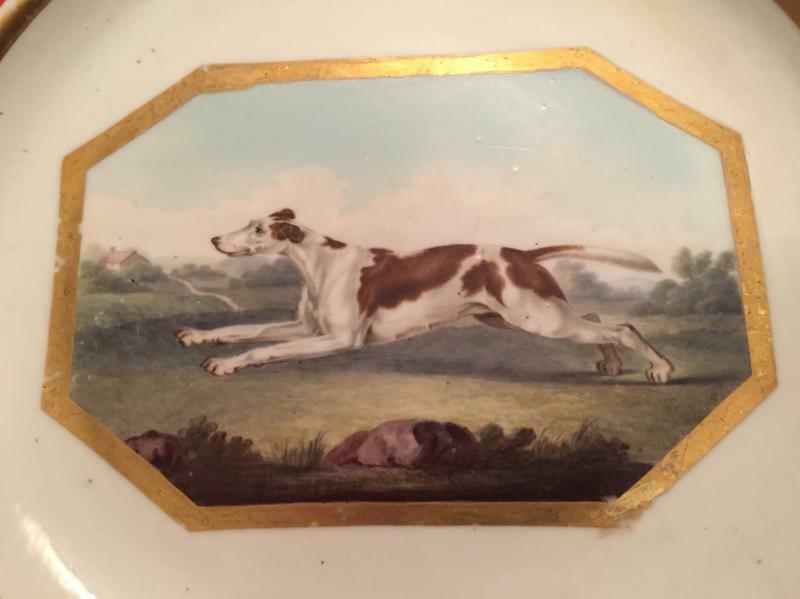 Large early Derby porcelain plate decorated with a central octagonal reserve showing a hunting dog coursing over landscape. 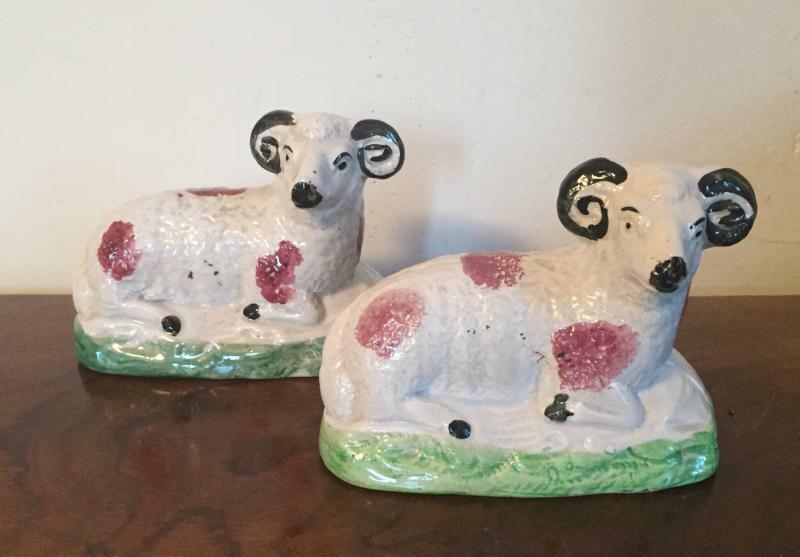 Pair Wood type pearlware figures of rams or sheep. 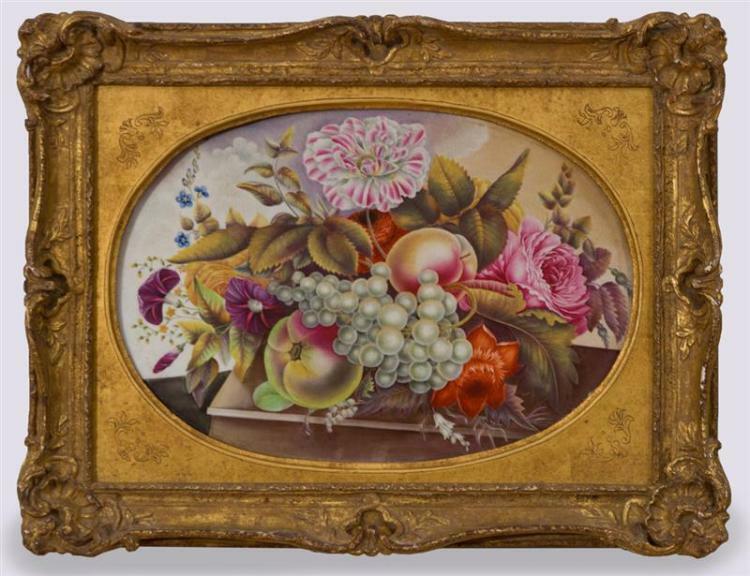 Early 19th century Derby porcelain plaque with fruit and flowers. 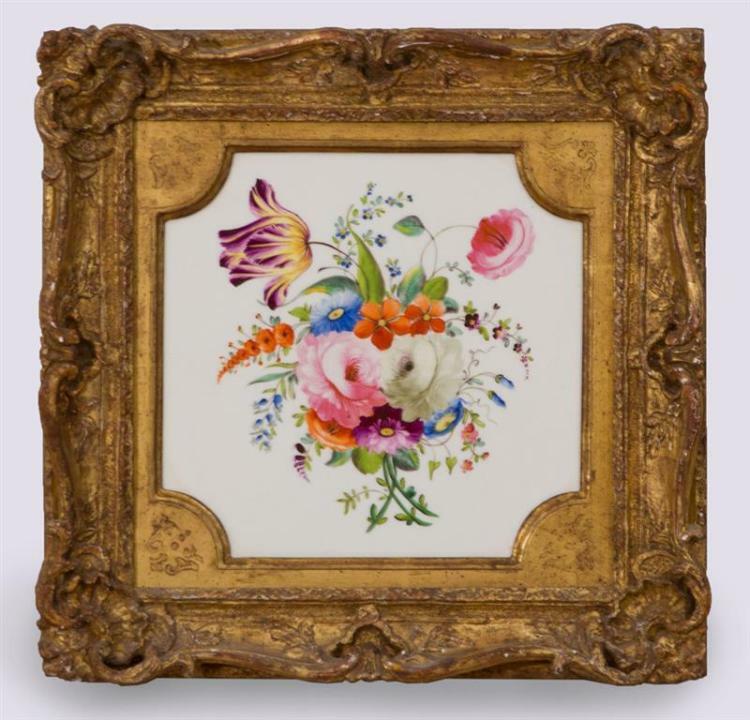 Early 19th century Derby porcelain plaque with floral sprigs. 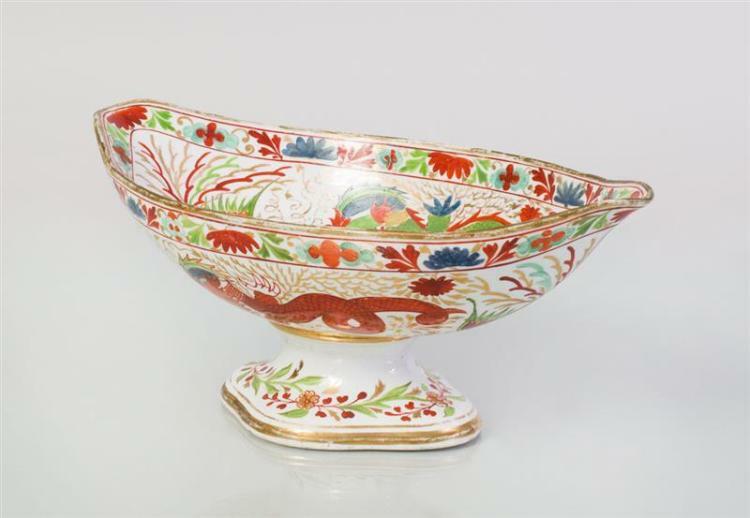 Large Spode imari porcelain punch bowl 1820. 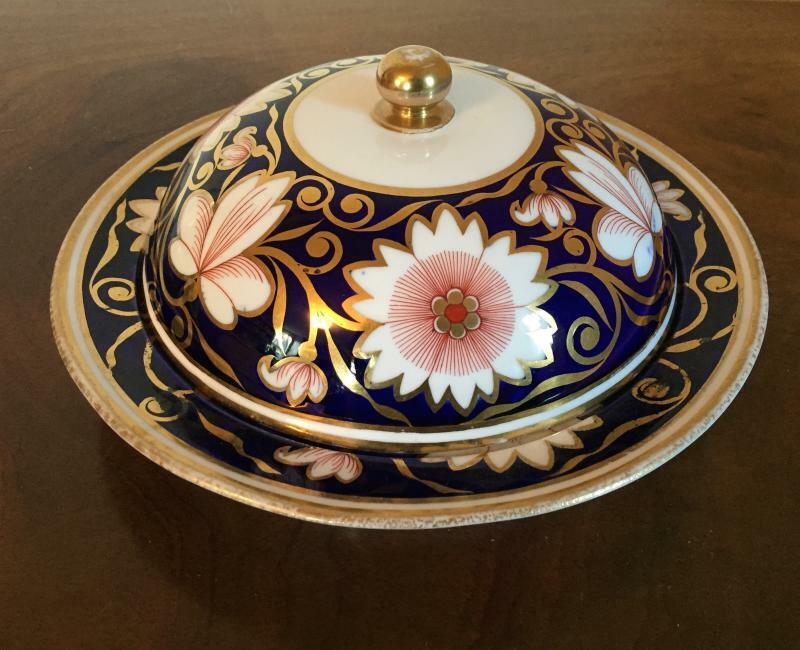 Spode imari porcelain muffin dish with dome lid 1810. 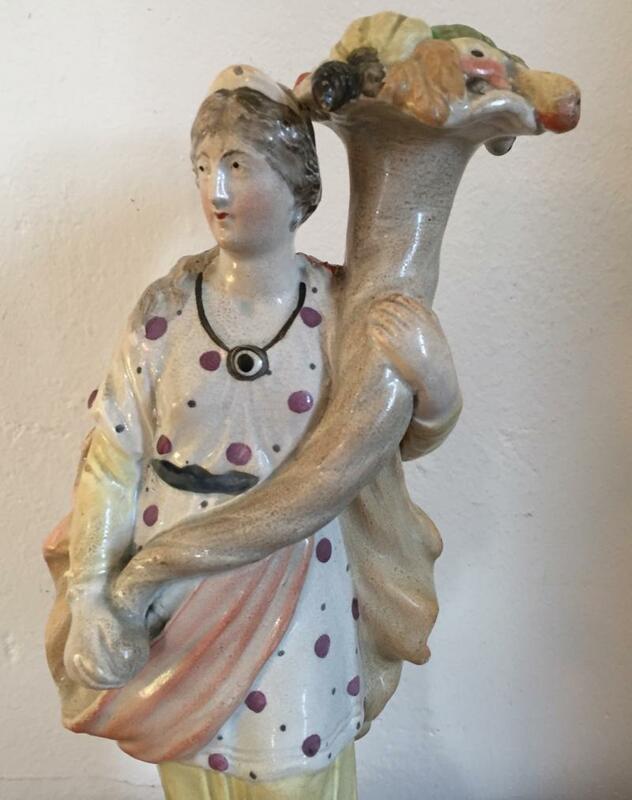 Large 18th c. pearlware figure of a lady shepherdess wearing a Gainsborough picture hat and carrying her sheep - 1790. 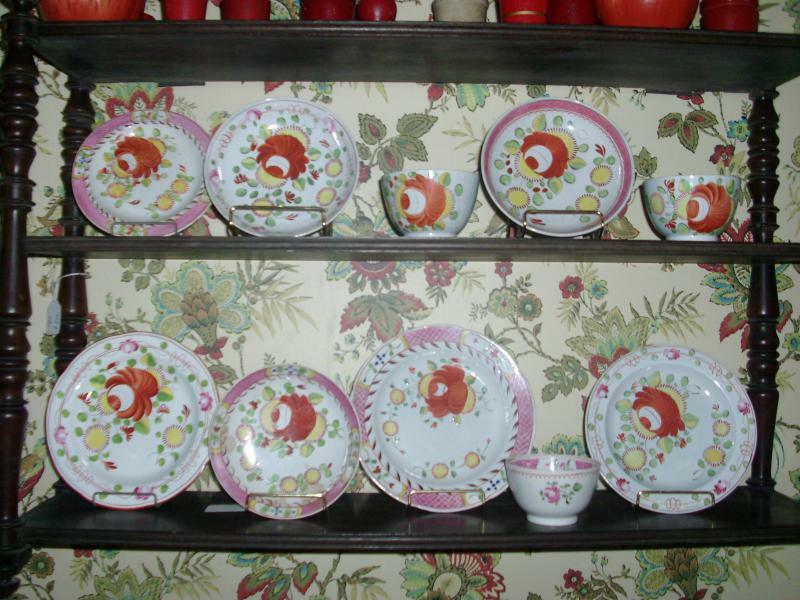 Wedgwood creamware in the red Etruscan pattern found in the Pink Dining Room at Dumfries House, Scotland. Vase shaped ewer for coffee, water or claret; dinner plates and soup bowls. 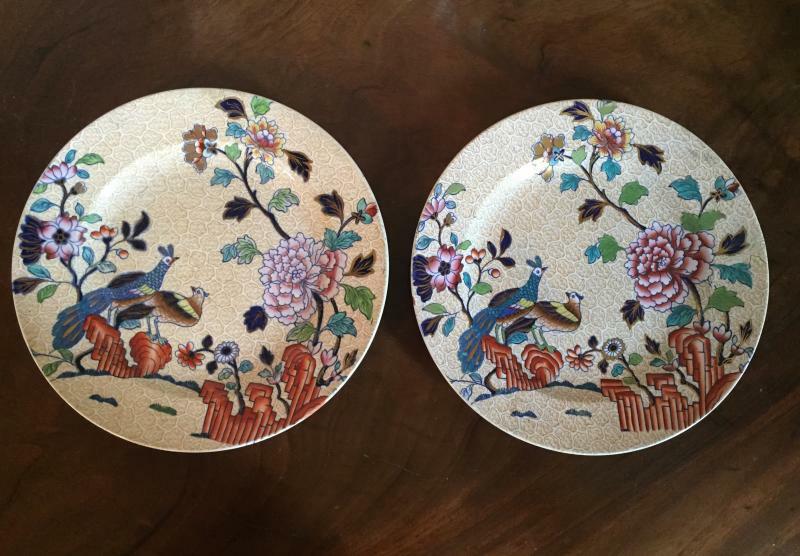 18th century Wedgwood Liverpool bird creamware platters decorated with exotic pea fowl and peacocks. 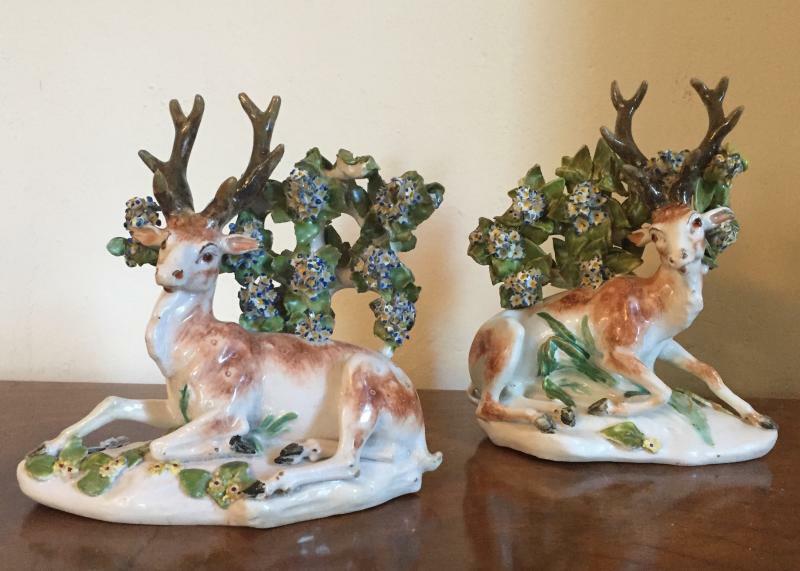 Pair 18th century Derby porcelain stags at lodge c. 1765. 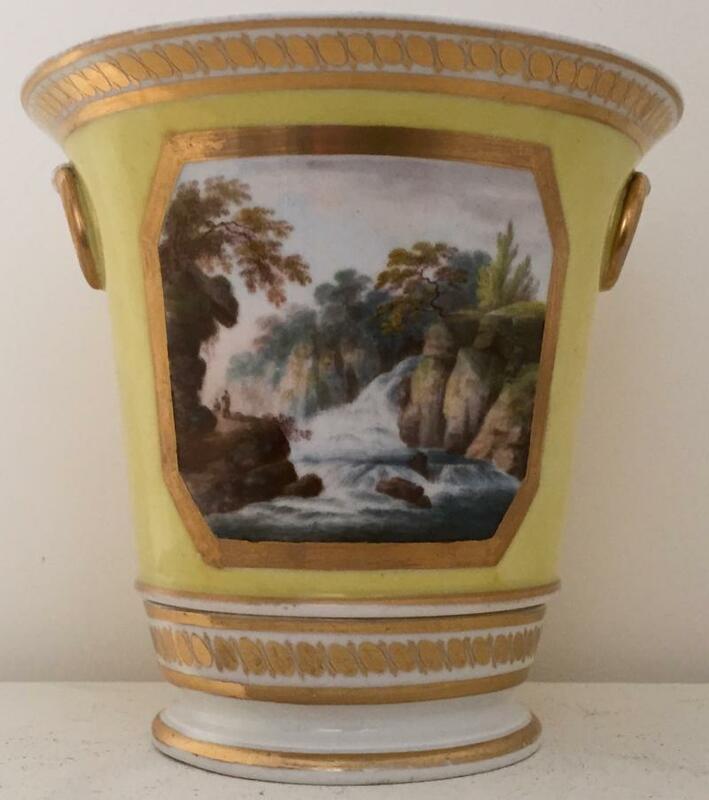 Large Worcester bough pot decorated with a riparian landscape on bright canary yellow ground c. 1805. 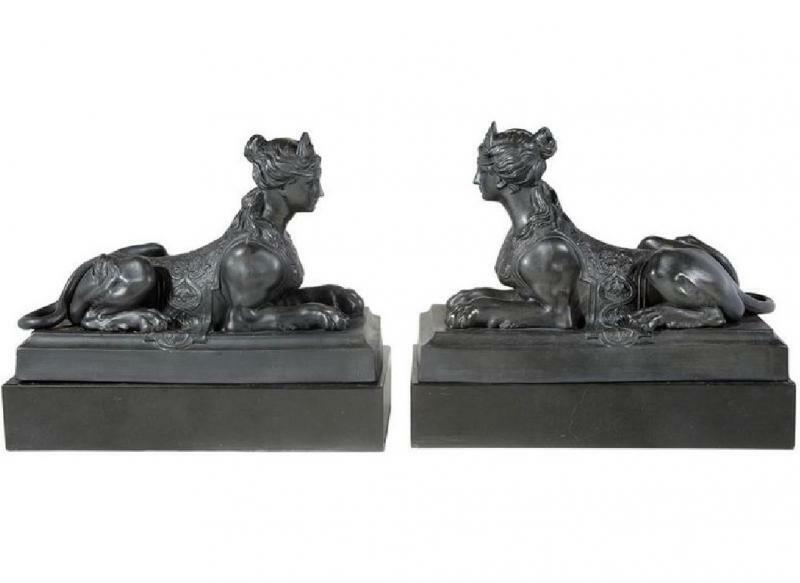 Large pair 19th c. Wedgwood Basalt Sphinxes. 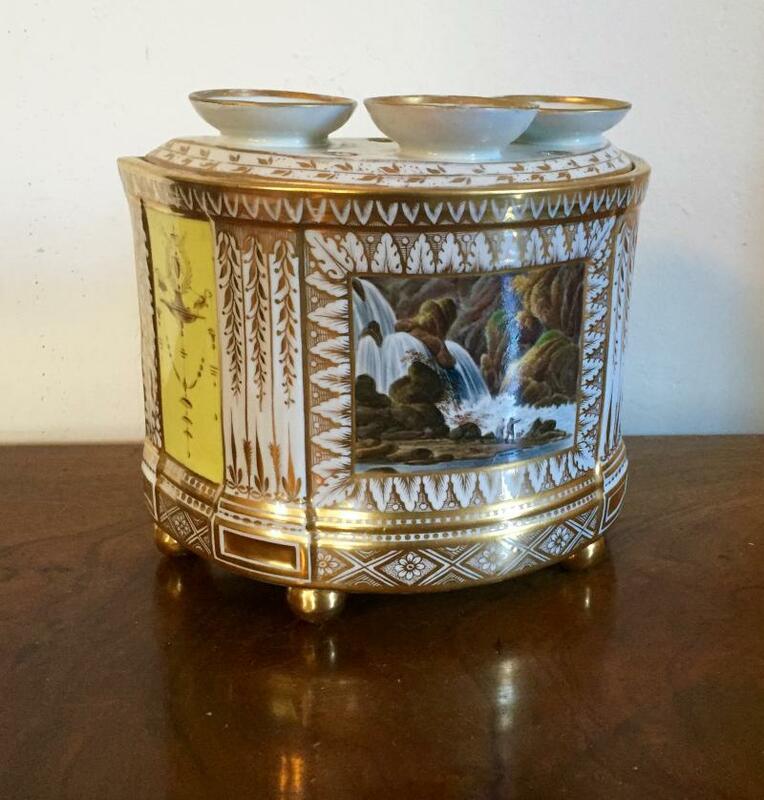 Coalport rock and tree sucrier or sugar box. 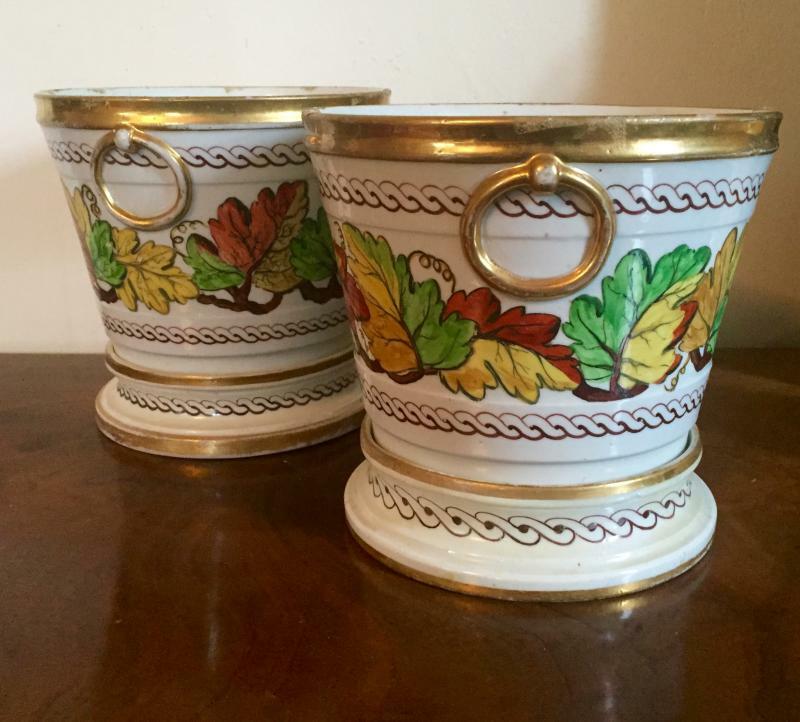 Large pair Coalport root pots & stands decorated with grape leaf garland and guilloche border - 1820. 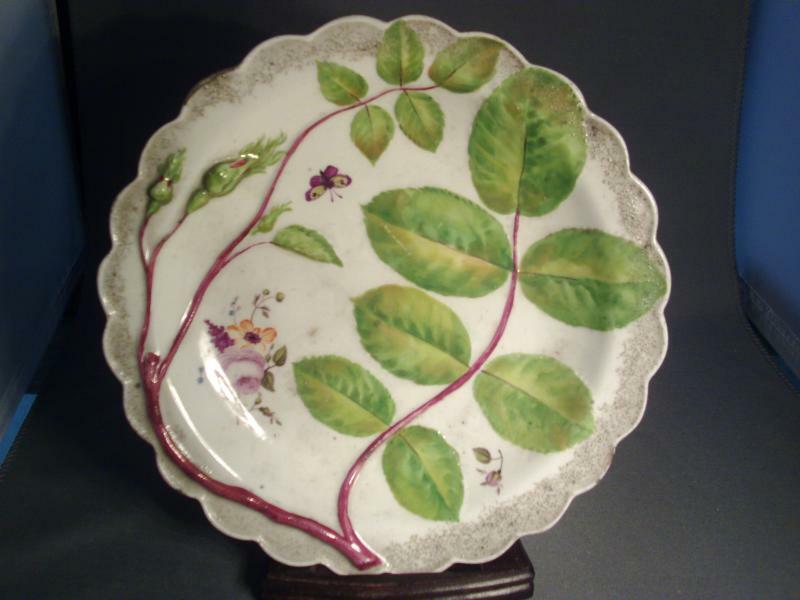 Mason's ironstone pink scroll leaf shape dessert dish 1813 - 1820. 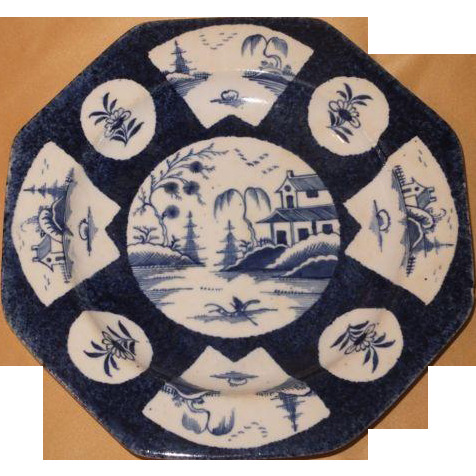 Early 19th century Mason's ironstone plates in the Chinese "table & flower pot" pattern 1820. 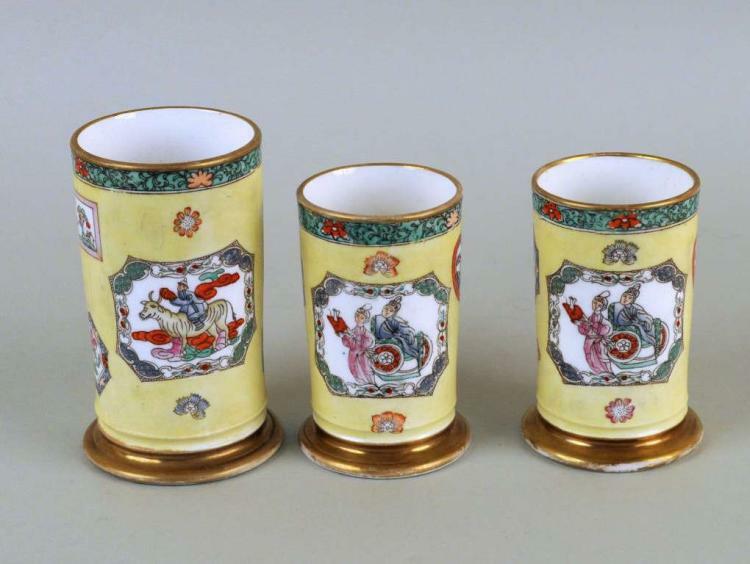 Garniture of 3 Mason's spill vases in the Chinese taste. 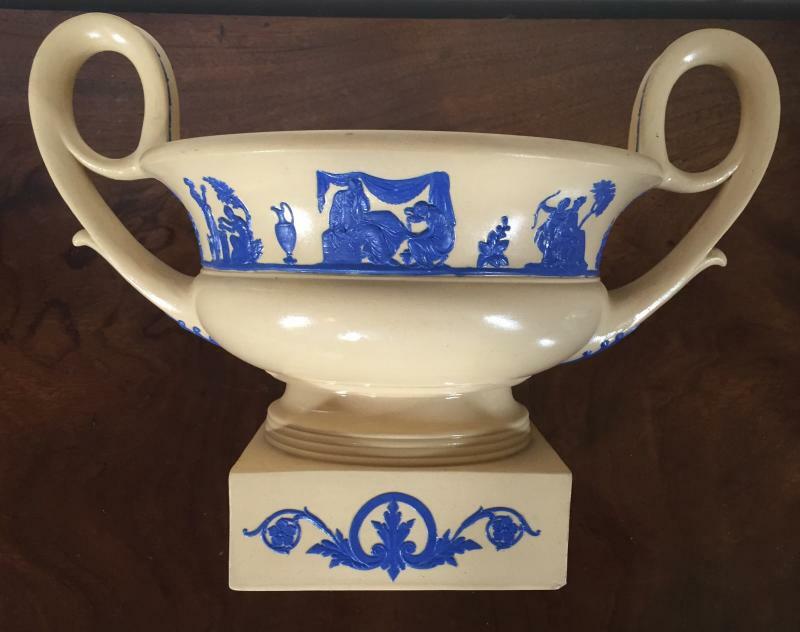 Wedgwood & Bentley creamware urn or vase with Bacchus head handles decorated in a faux agate glaze - 18th century. Now mounted as a lamp. 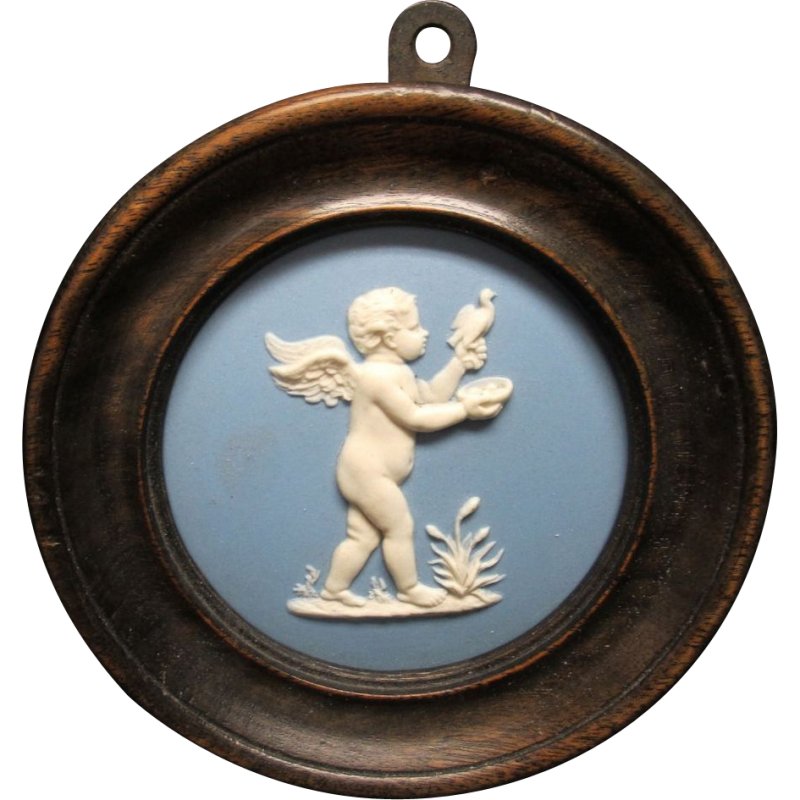 From a collection of 18th & 19th century Wedgwood jasperware plaques. 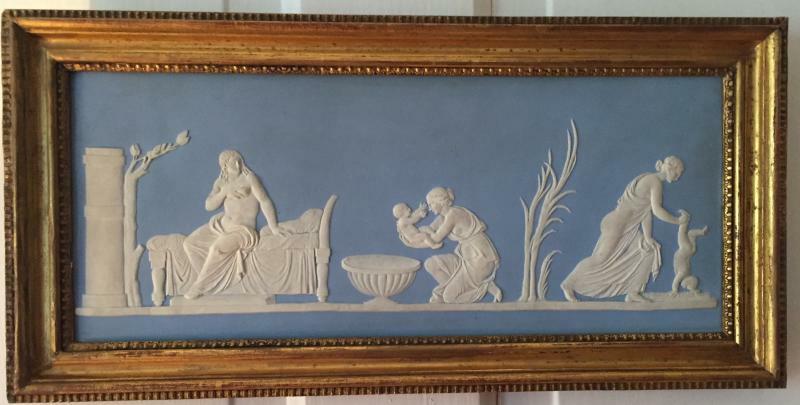 Large early Wedgwood light blue jasperware plaque in period gilt wood frame depicting the birth of Achilles. 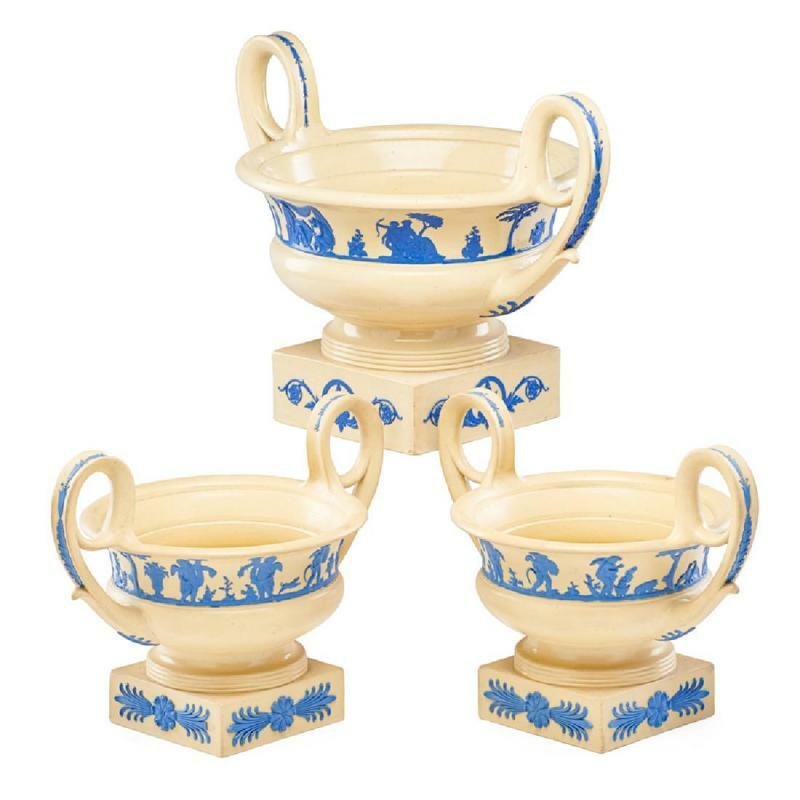 Trio 19th century Wedgwood urns of classical Greek Kantharos shape. 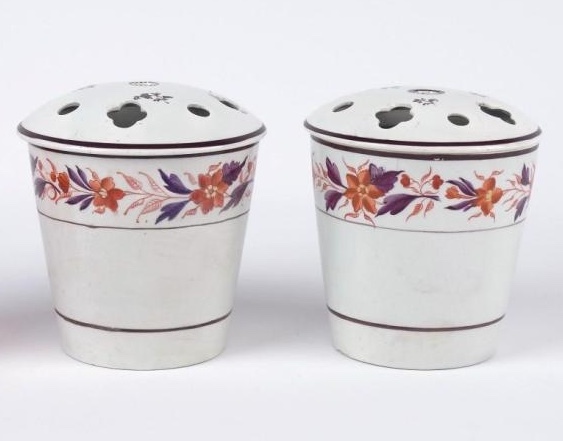 Pair early 19th century pearlware vases - bough pots and removable pierced lids decorated with sprig and floral garlands. 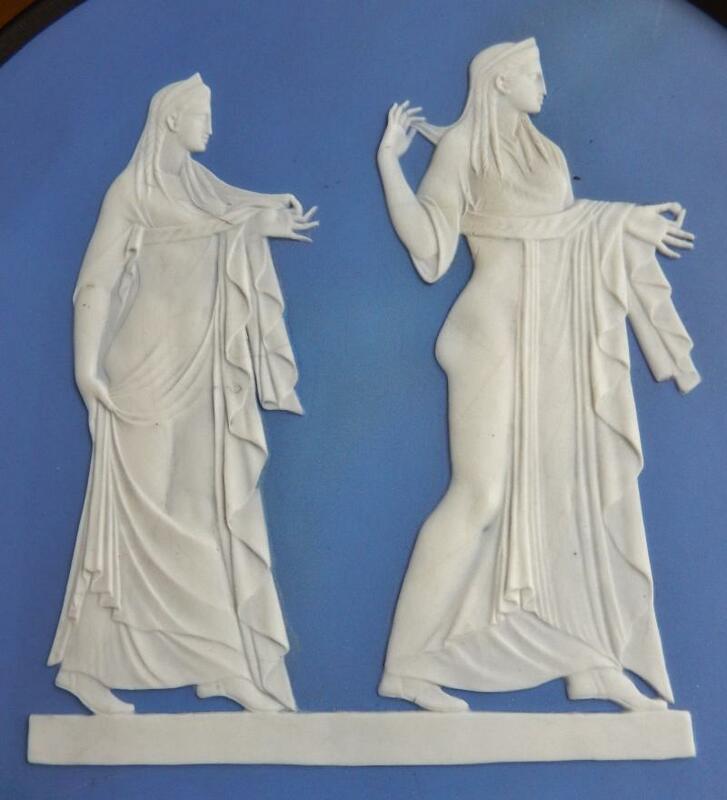 Large 19th c. Wedgwood neoclassical black basalt vase & cover. 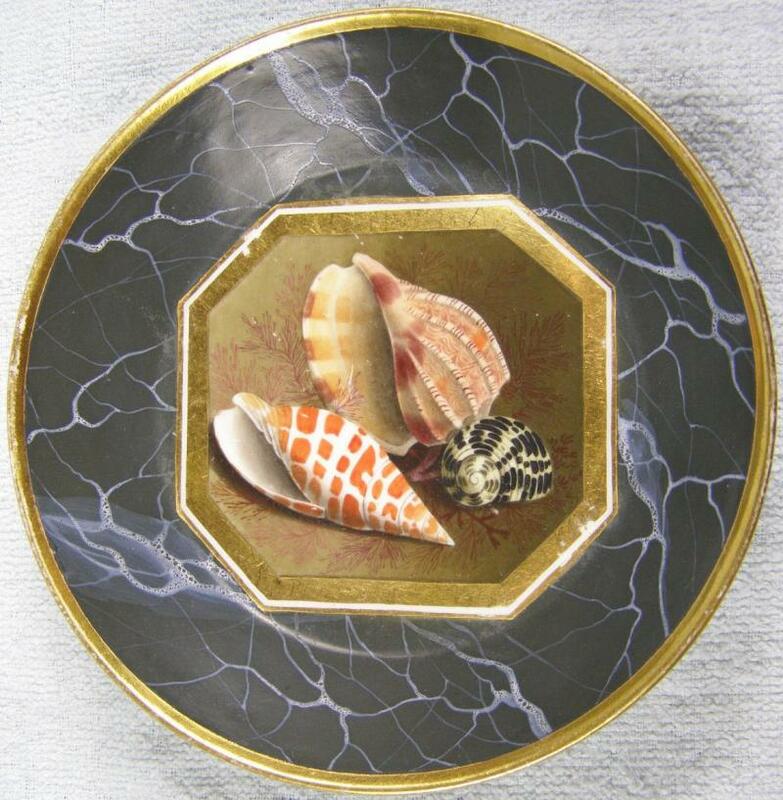 Early 19th century Worcester conchological sea shell decorated plate with faux marble ground. Fully marked - Flight & Barr, Coventry Street, London - c. 1805. 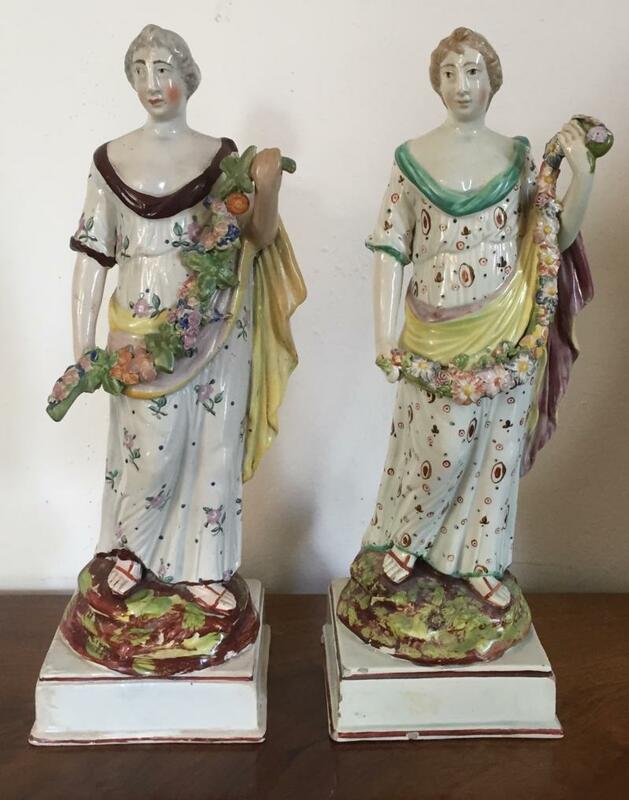 Three very large early 19th c. Enoch Wood Staffordshire pearlware figures of Flora. 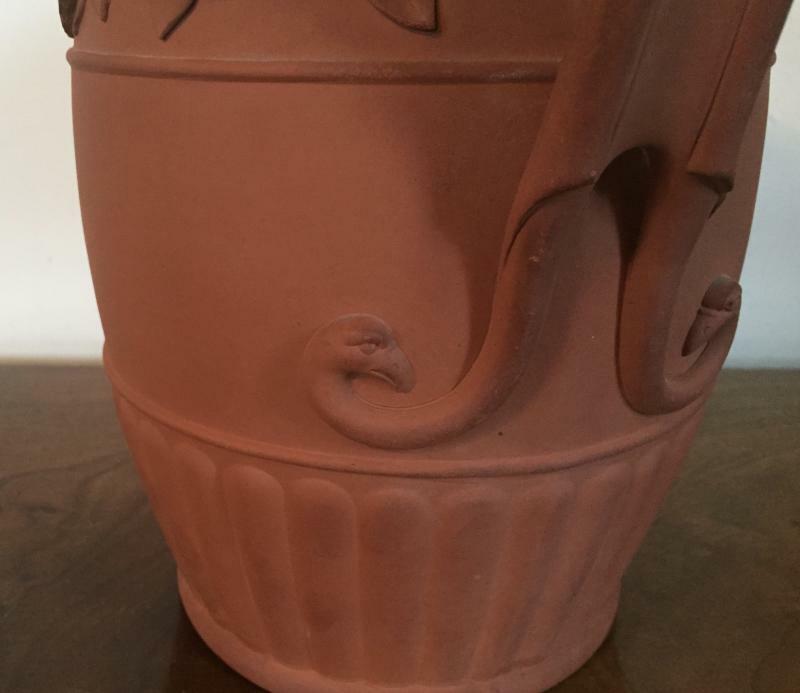 Spode root pot with dolphin mask handles. Bright orange ground enhanced by gilding - c. 1810. 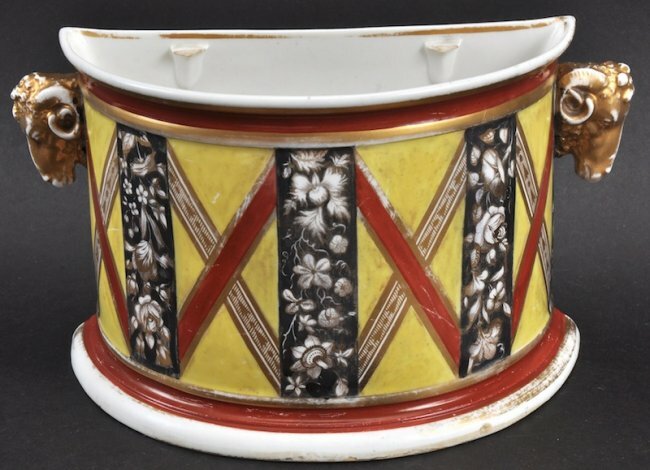 Large creamware chestnut basket and stand decorated with garlands of oak leaves and acorns; the handles with a smart harlequin scheme in yellow and brown. 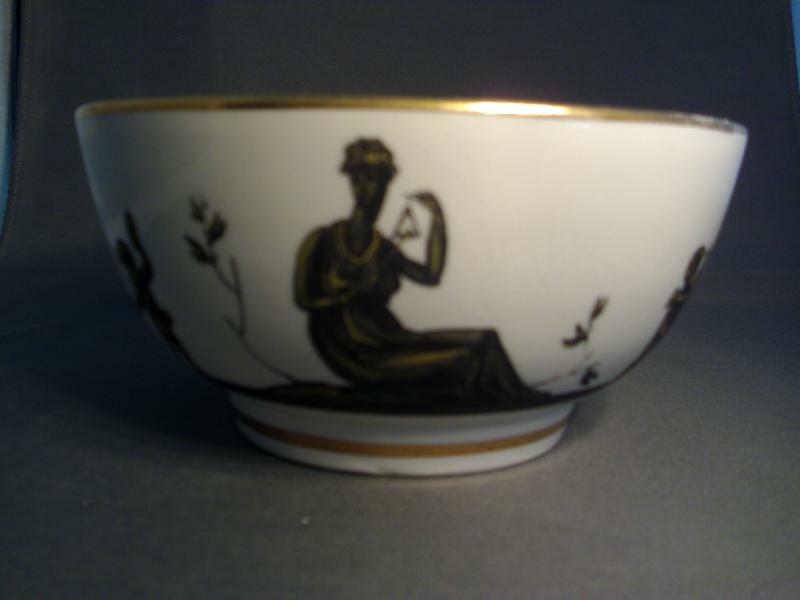 Made by Sewell at Newcastle Upon Tyne, c. 1800 - 1810. 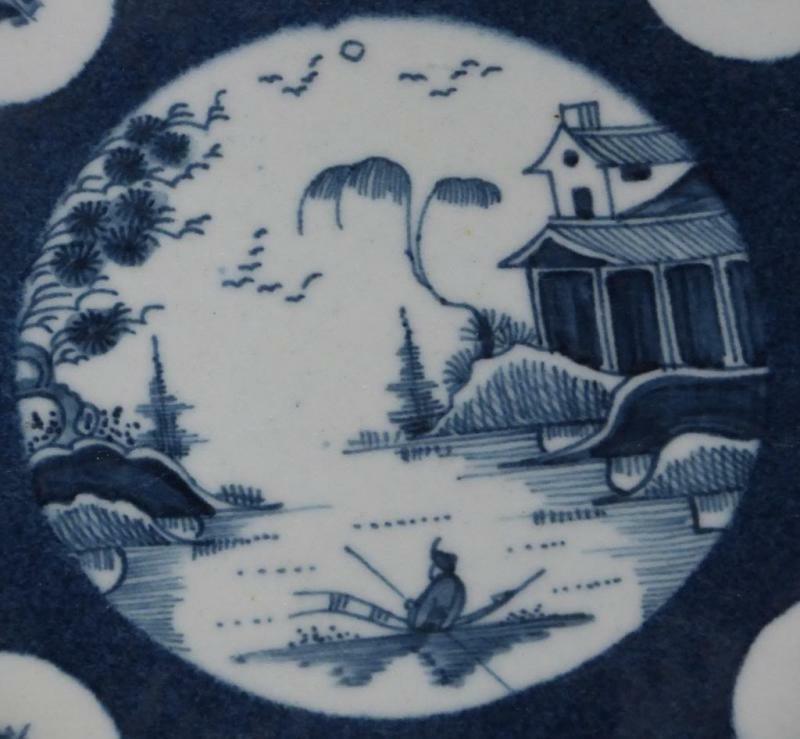 Pair 18th century English Delft blue & white plates with water landscape scenes of fishermen and boats in the Chinese taste. 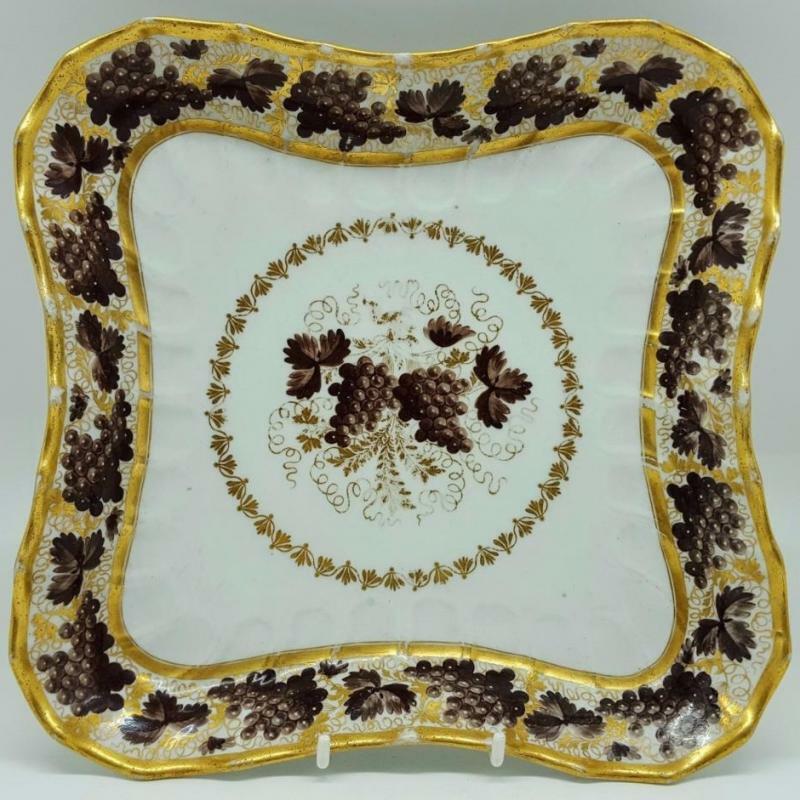 Worcester Flight & Barr porcelain square dessert dish with grape vine garland - late 18th century. 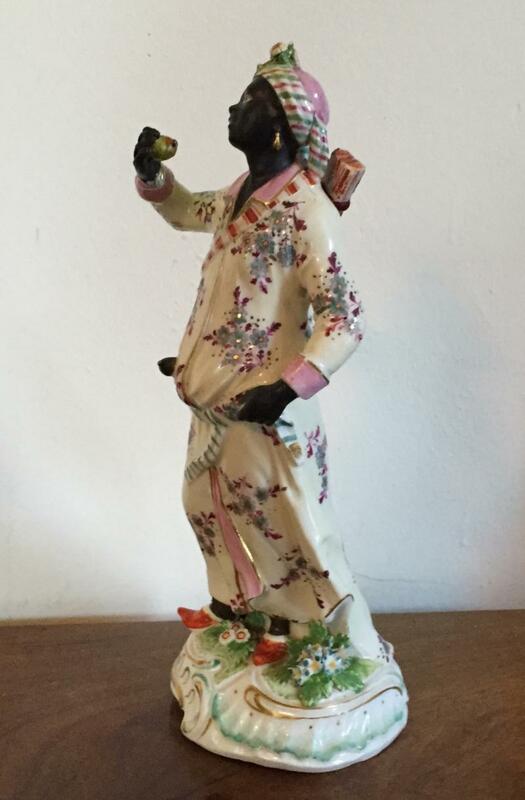 Monumental 18th c. Derby porcelain model of a moor c. 1765. For a similar figure refer to the collections database of the Victoria & Albert Museum. Measures 12" tall. Selection 18th century Worcester porcelain in blue & white. 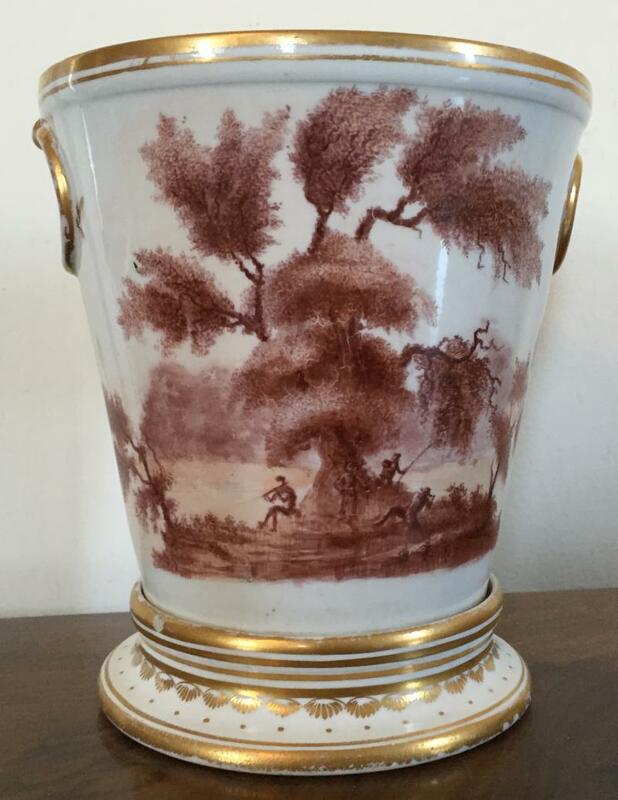 Large yellow ground Derby porcelain root pot and stand with named view - In Ahtol, Scotland - 1795. 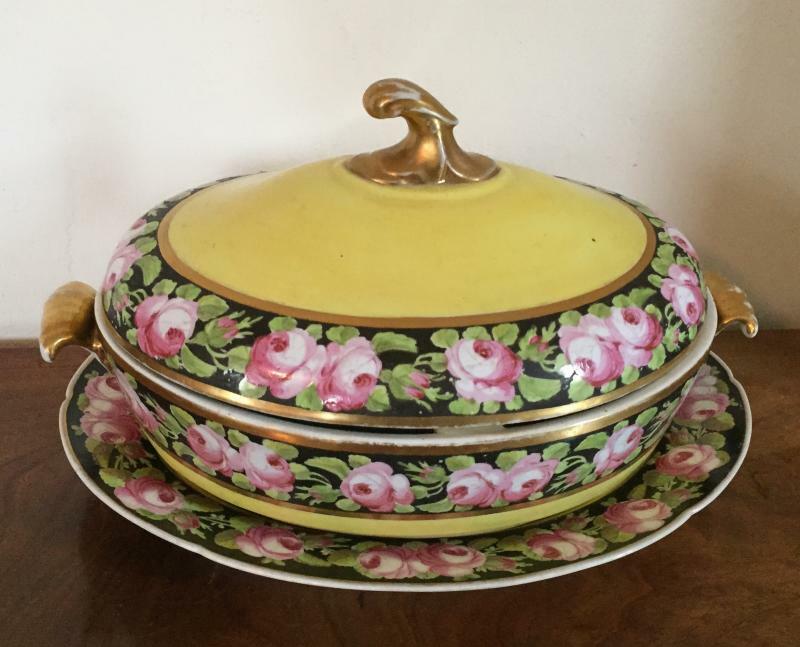 Large Coalport bright yellow tureens painted with a border of pink roses on a black ground, c. 1805. 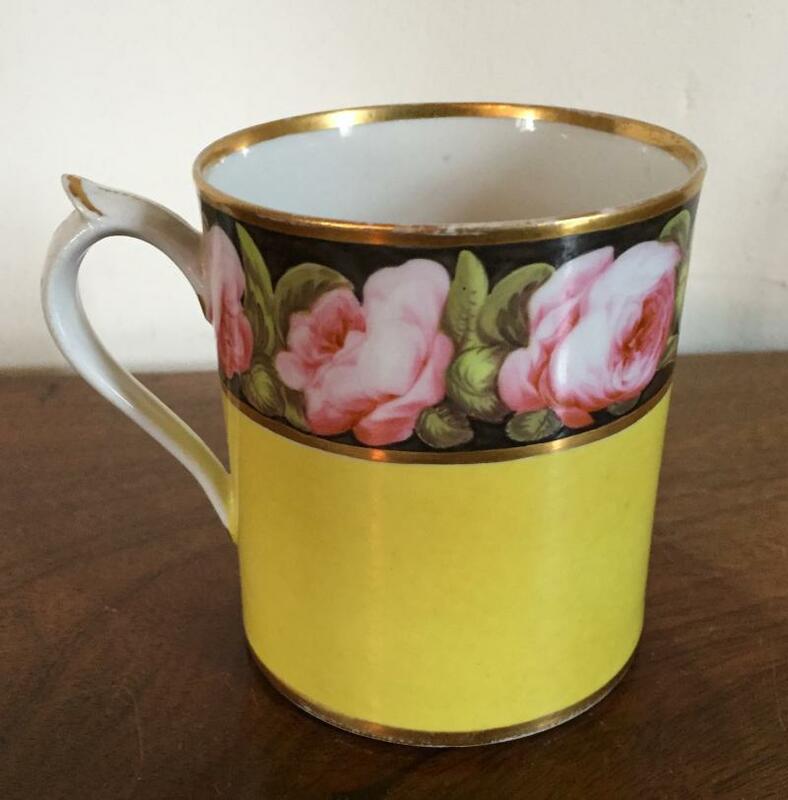 Coalport mug decorated with a border of pink roses on bright yellow ground c. 1805. 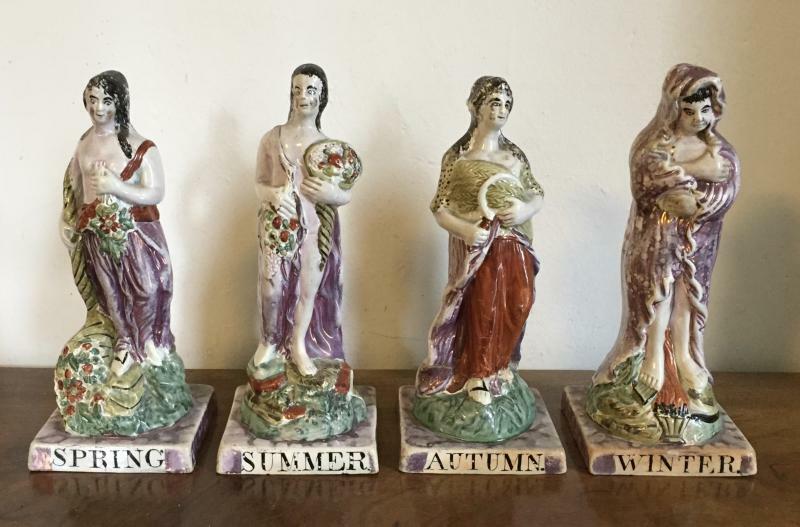 Mantel garnitures of Staffordshire pearlware figures representing the four season - spring, summer, fall / autumn and winter c. 1830. 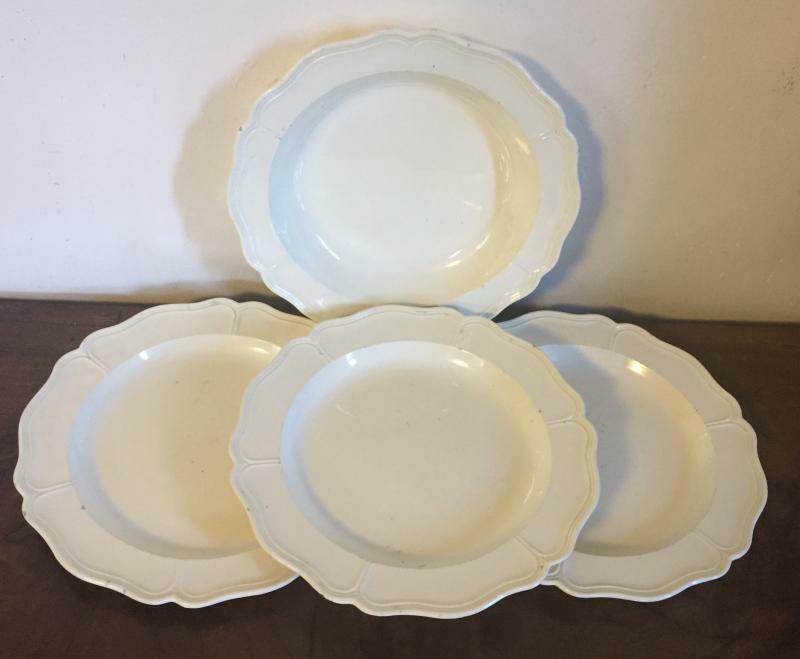 Early 19th c. Wedgwood creamware soup bowls, dinner plates and turkey platter. Early 19th c. Regency flower pot by Adams or Turner in the Wedgwood taste with satyr mask handles. 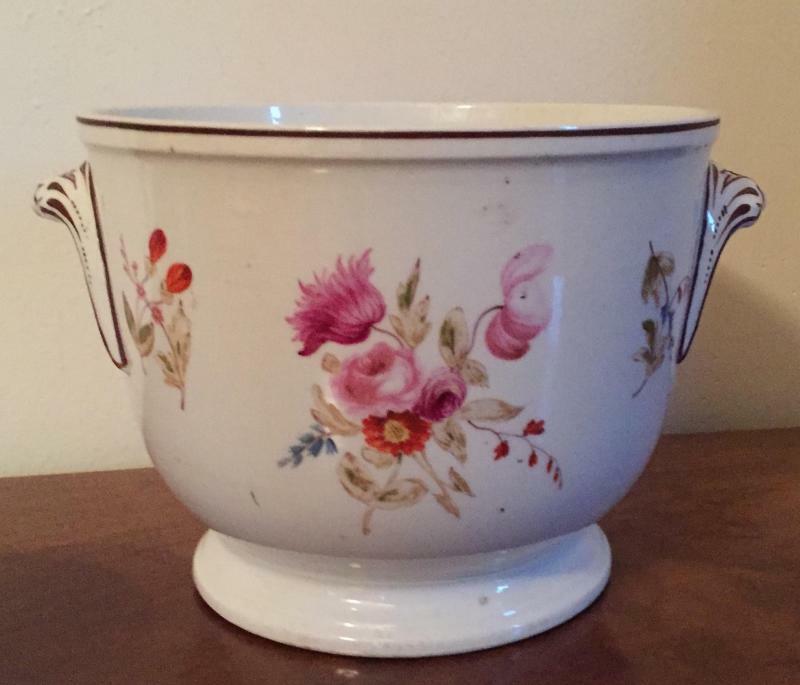 18th c. Derby porcelain cachepot planter decorated with sprig roses. 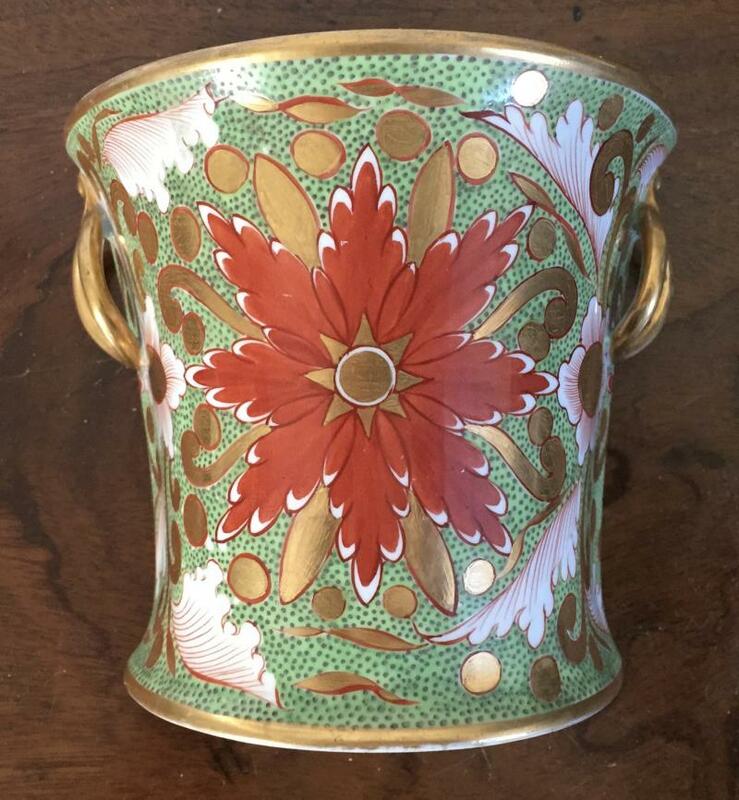 19th c. Coalport porcelain cachepot or bottle cooler decorated with botanical floral sprigs. 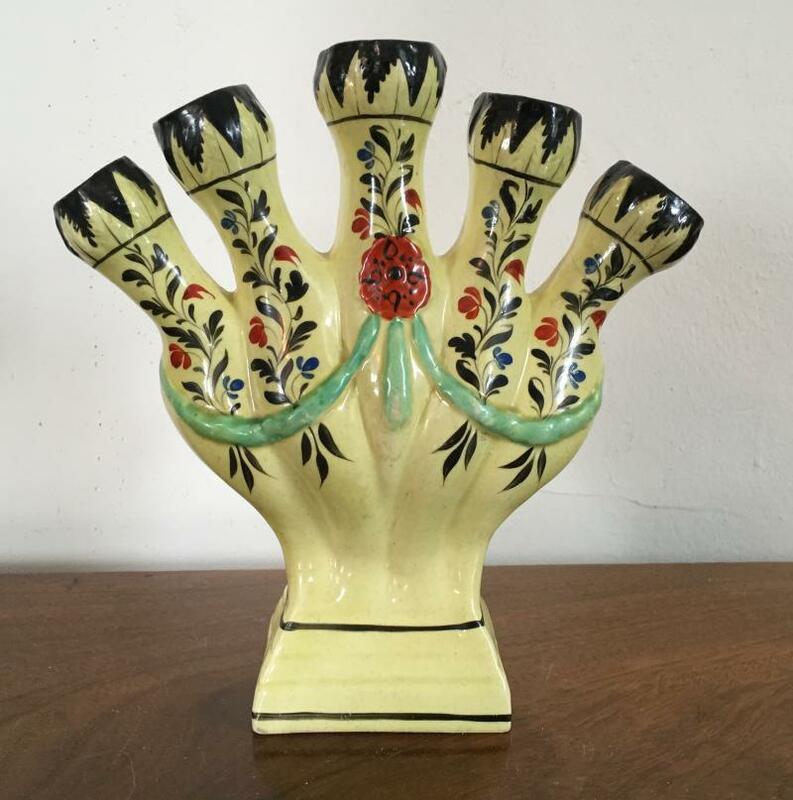 18th century Prattware urn form vase with snake handles, garland swags and blue feather edge. Flanked by two classical figures. Pinxton bough pot and cover decorated with a deer park on bright yellow ground - late 18th century. 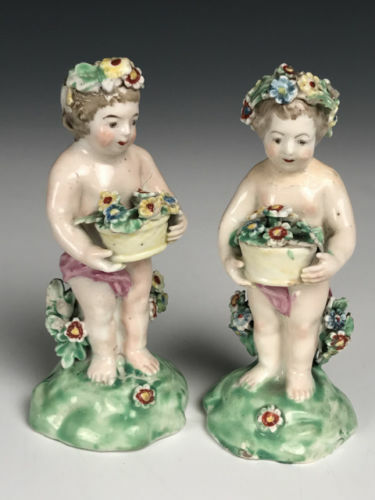 Large pair 18th c. Derby porcelain trophies in the form of topiary rose bushes in neoclassical garden tubs with foliate handles above applied rings - 1780. Early 19th c. Worcester porcelain topographical vase decorated with a named view of Malvern Gate, Worcestershire. Prince of Wales feather handles. 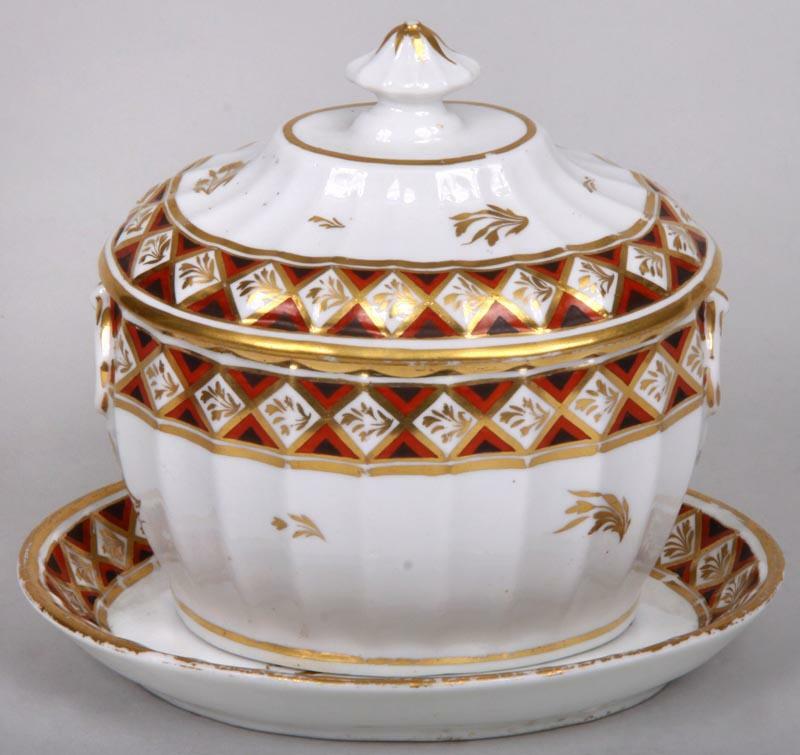 18th century Worcester porcelain chestnut basket with armorial crest. Handles with applied flowers. 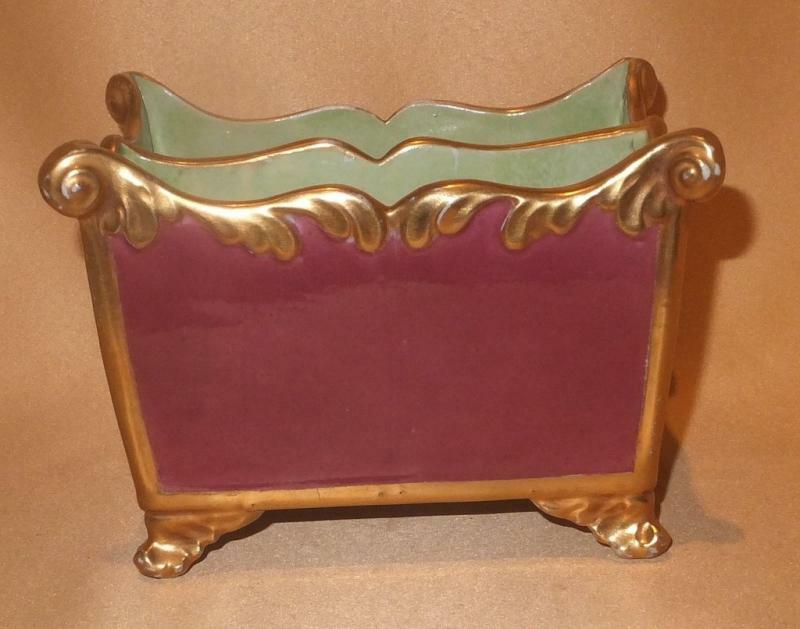 Use of bright iron red and yellow glaze with profuse gilding. 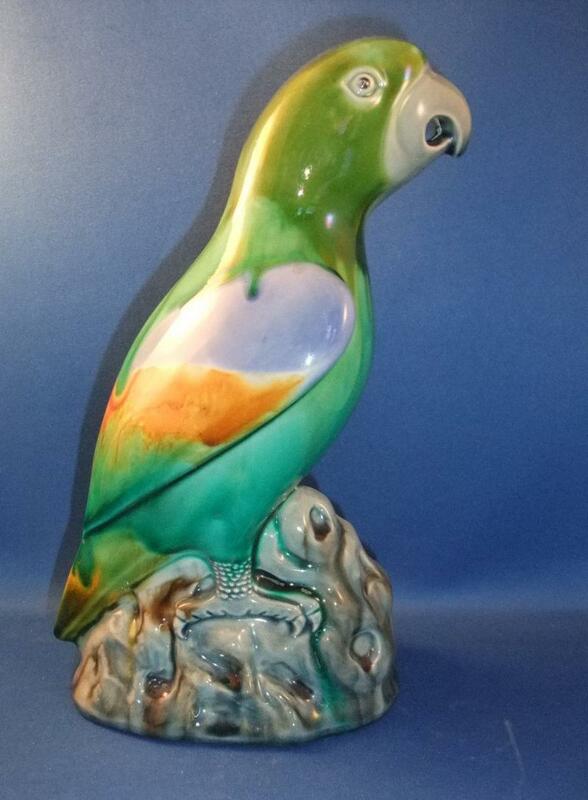 19th century Mintons majolica parrot in the Chinese kangxi taste. 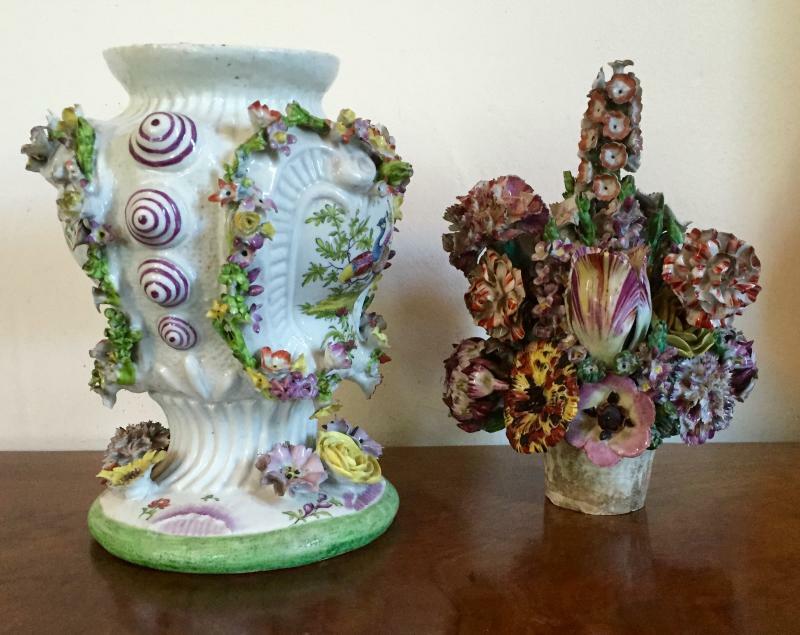 Pair early 19th century Wedgwood tricolor jasperware vases with neoclassical lilac reserves. Measure 5 1/4" tall. 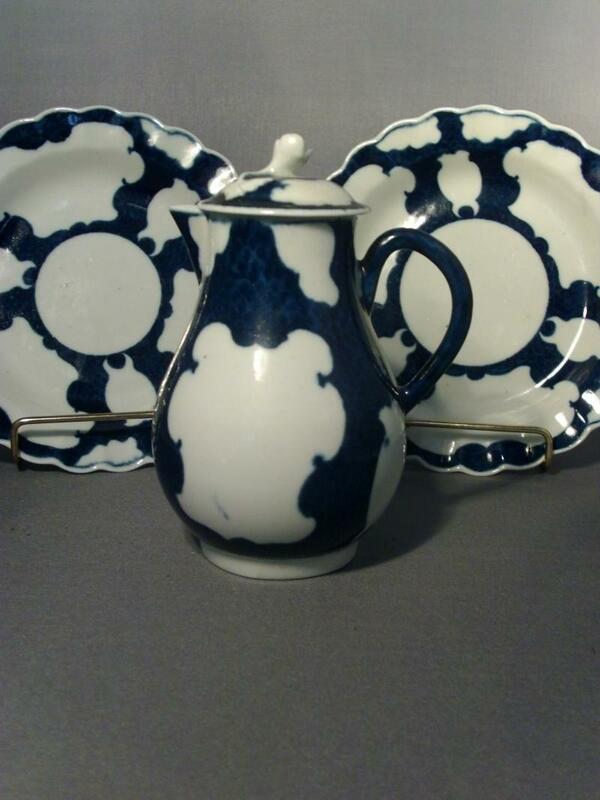 Early 19th c. Mason's Ironstone China - pitcher and soup bowls in blue and white Chinese Canton pattern. 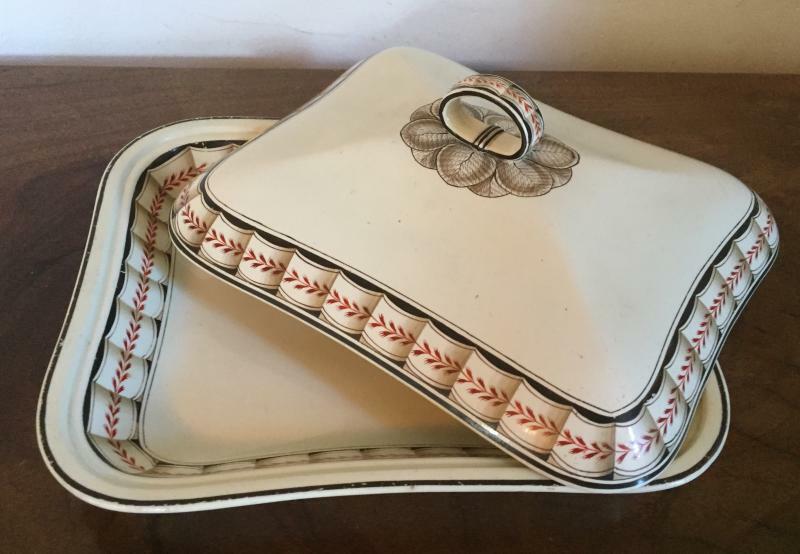 Large pearlware soup tureen, platters and plates with green feather edge. 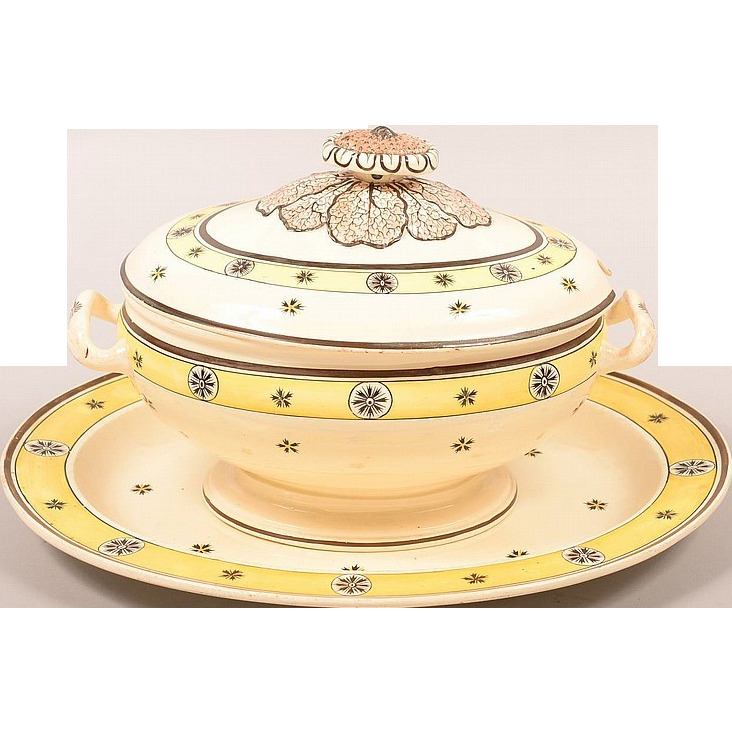 Tureen measures 15 1/4" long. 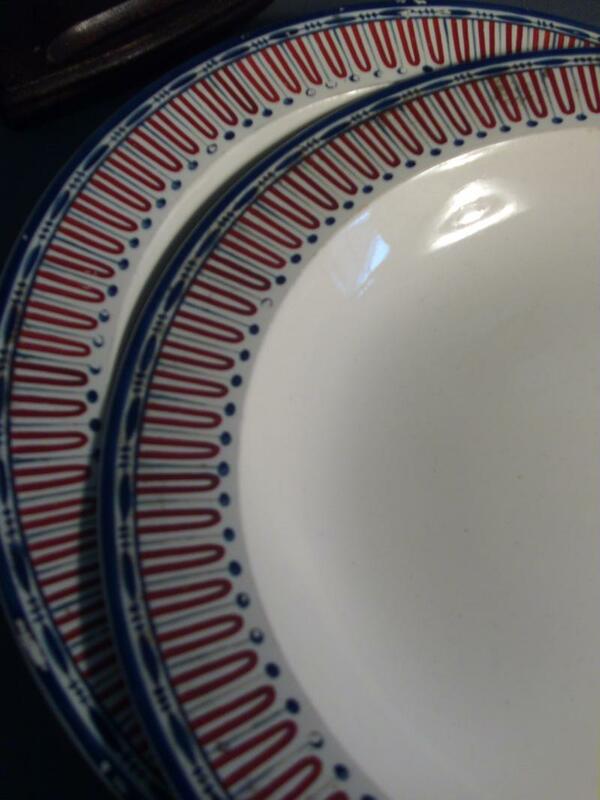 18th c. Wedgwood creamware in the Etruscan pattern. Similar examples at Dumfries House Museum. 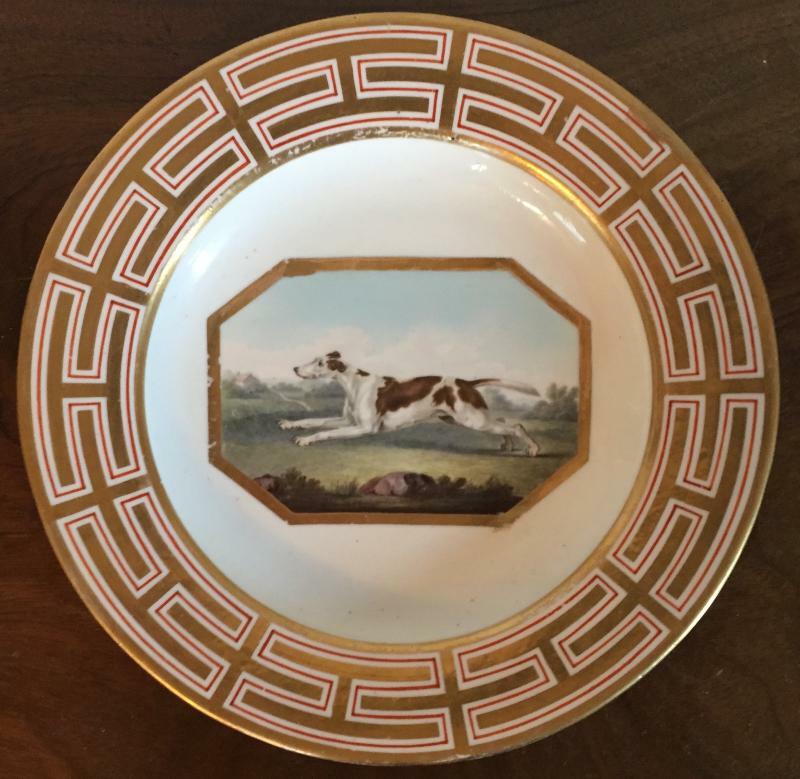 18th century Worcester porcelain saucer in the Chinese taste. 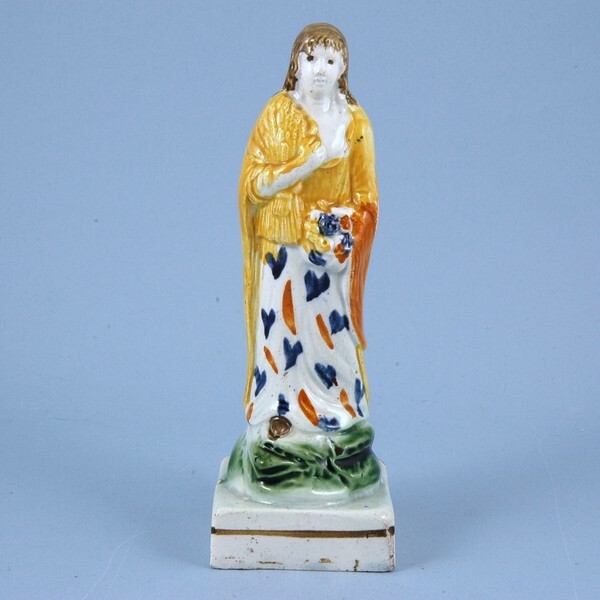 18th c. Prattware allegorical figure of summer c. 1790. 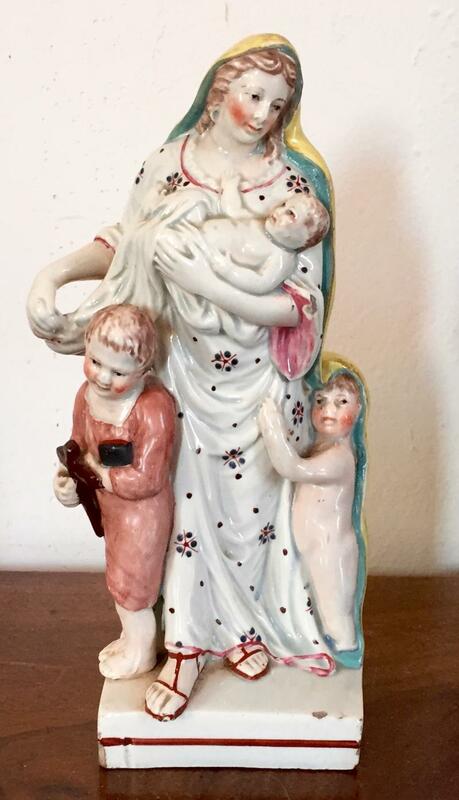 18th century pearlware jug depicting Peace and Plenty 1790. 18th c. pearlware jug depicting smokers and drinkers - marked WOOD - 1790. Pair 18th c. English New Hall porcelain small plates decorated en grisaille with oak leaf and acorn border. Antique 18th century Neale & Co shell decorated creamware shield shape dish. - 1780. 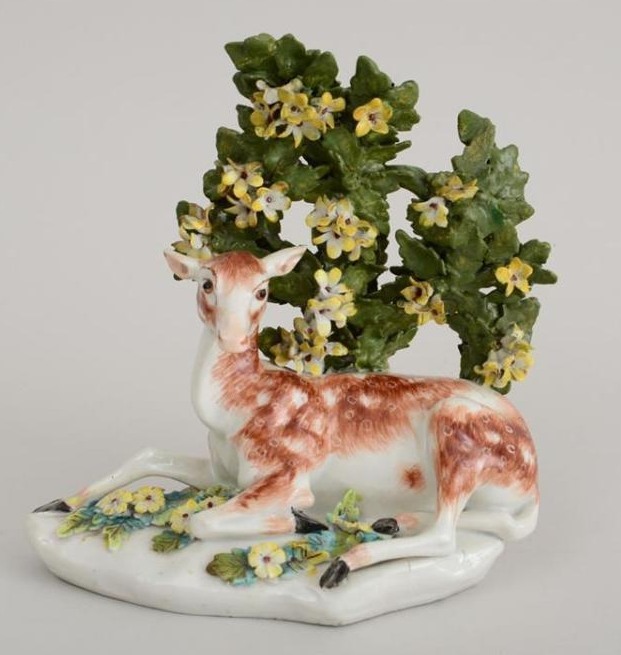 Large 18th century Derby porcelain model of a stag at lodge. 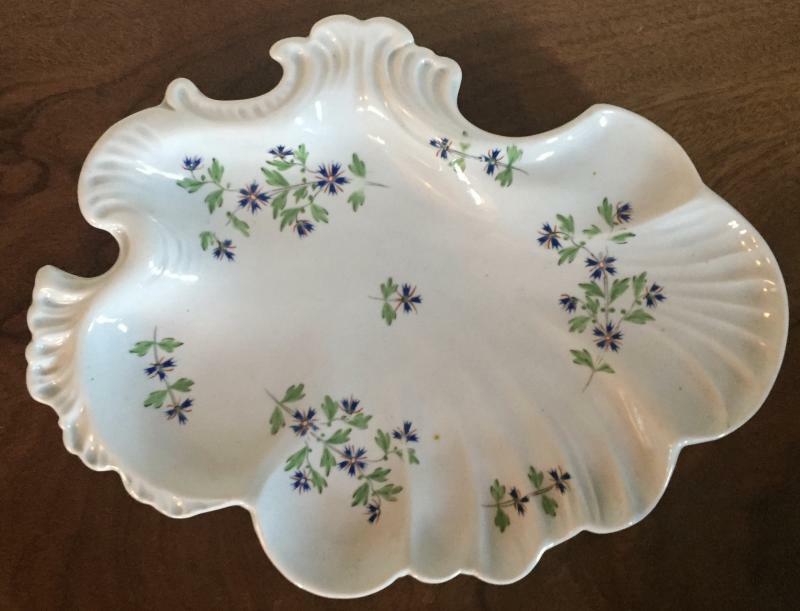 Large scale 18th century Chelsea porcelain leaf form dish. 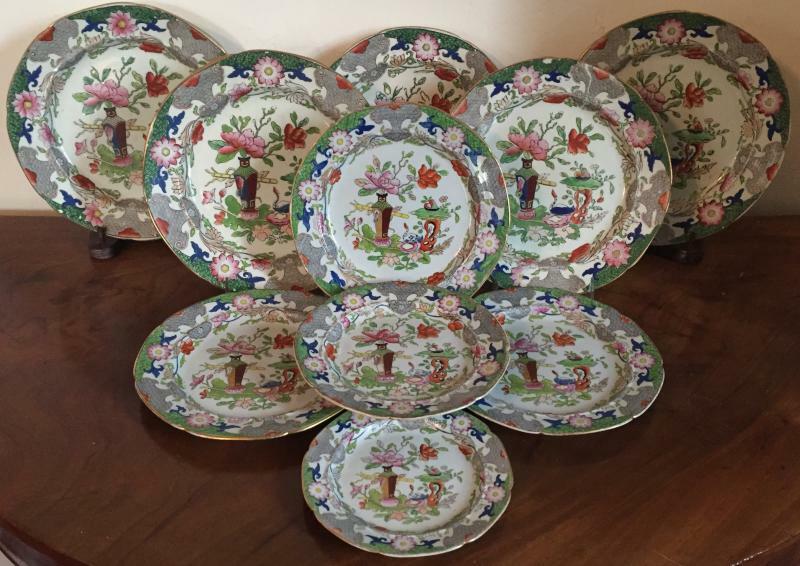 Extensive collection Coalport rock & tree imari porcelain c. 1810. 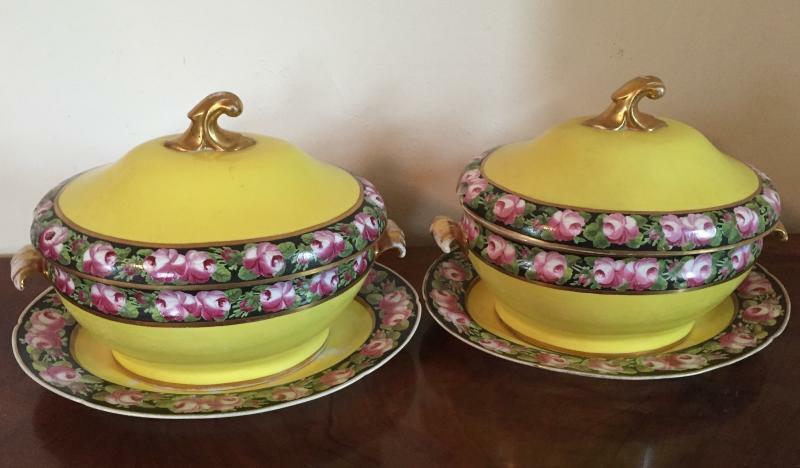 Pair early 19th c. Thomas Lakin creamware lustre sauce tureens with recumbent lion finials. 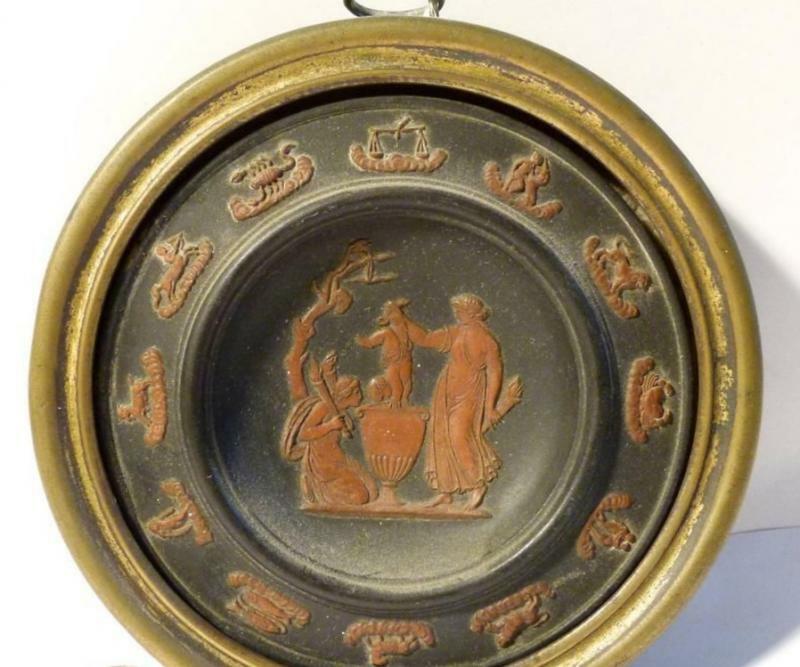 Late 18th c. Wedgwood basalt plaque of the zodiac in rosso antico palette. 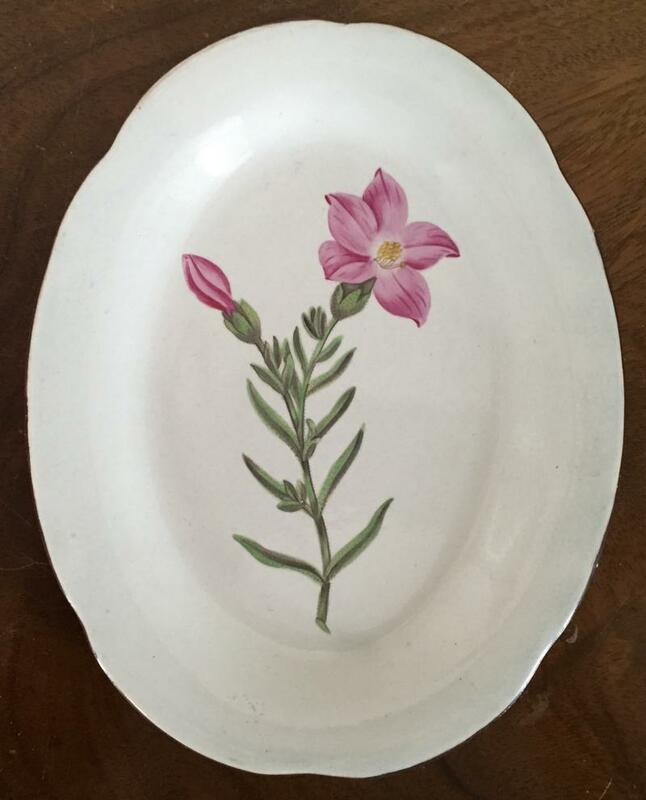 Neale & Co. pearlware botanical dessert dish c. 1810 decorated with named specimen - rose mallow. 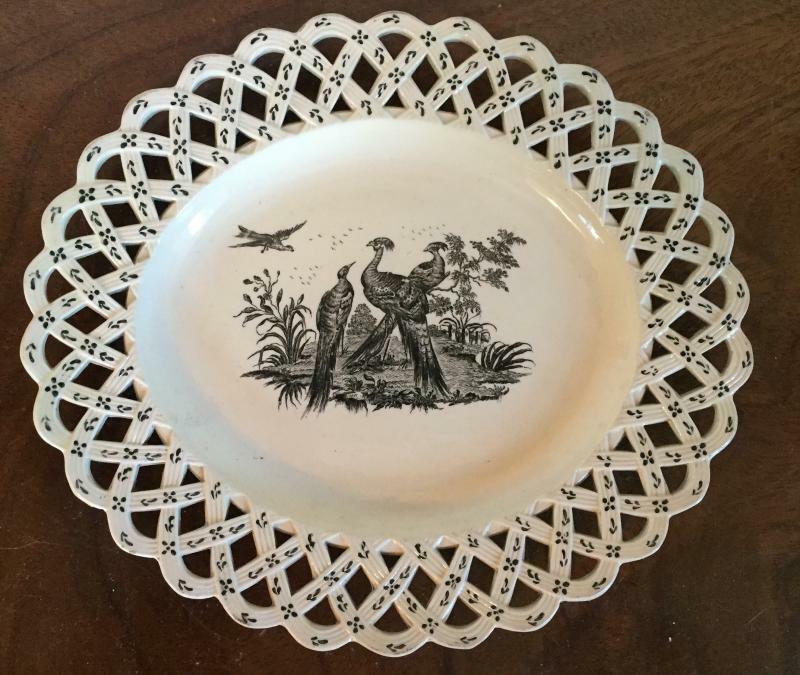 Shorthose botanical creamware dishes of quatrefoil and various other shapes decorated with named specimens. 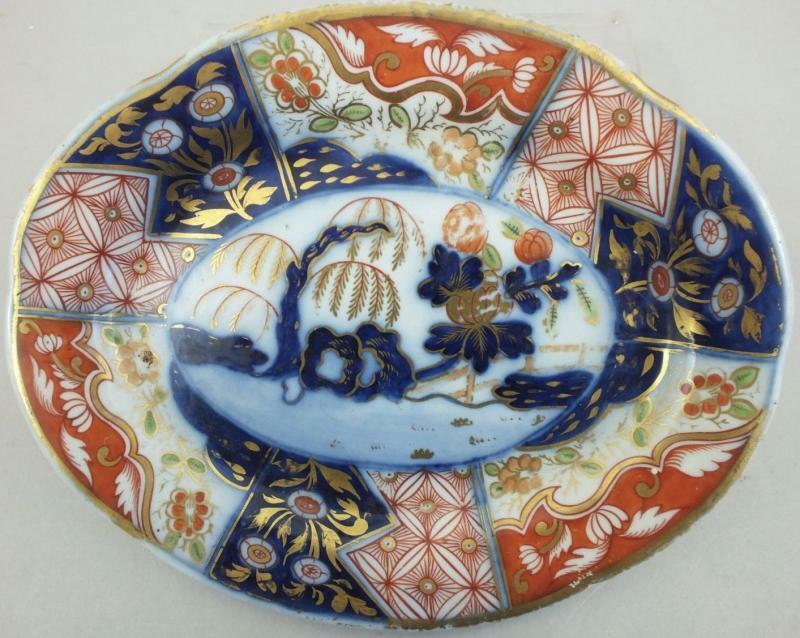 Don Pottery creamware botanical shell shaped dish - early 19th c.
18th c. Worcester 'Dragon in Compartment' or 'Bengal Tiger' imari porcelain plates. 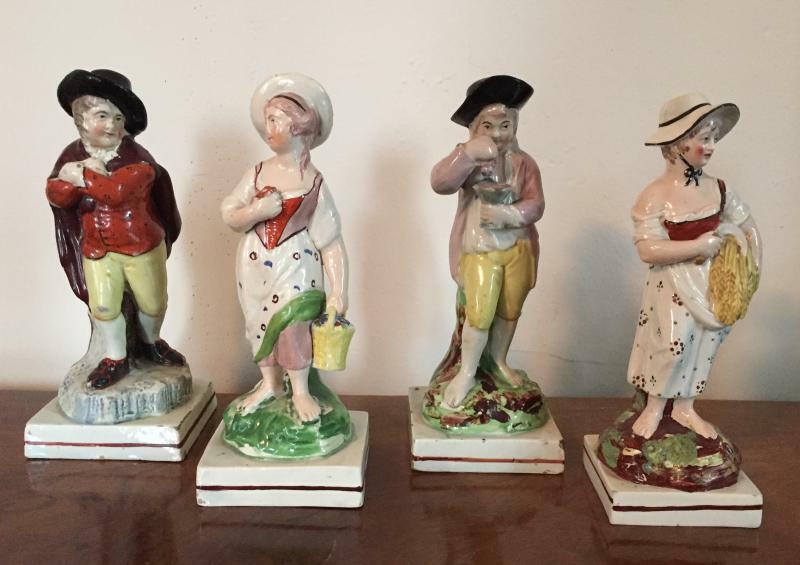 18th century Staffordshire pearlware busts of philosophers Rousseau and Voltaire. 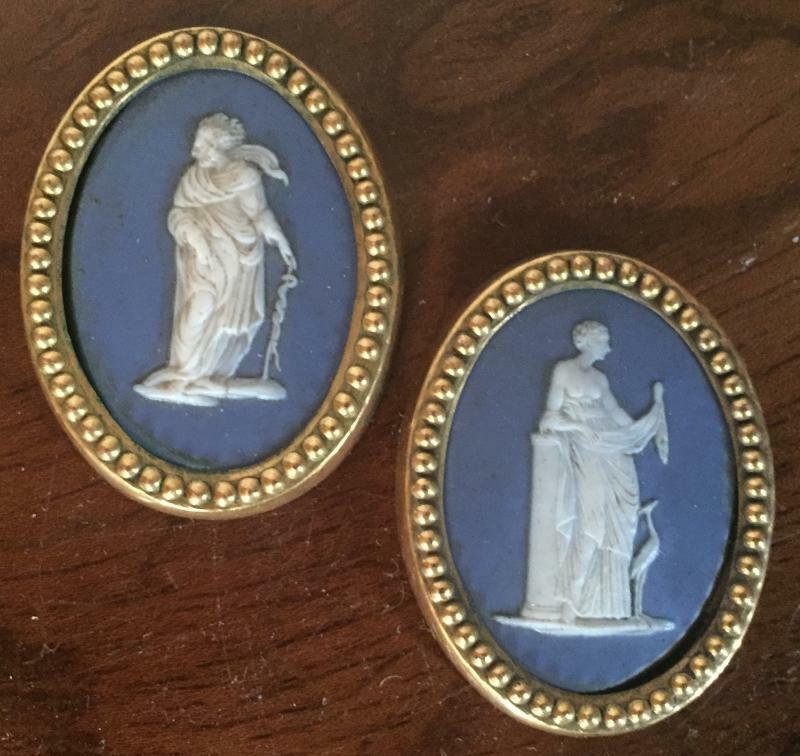 Pair 19th century Wedgwood jasperware architectural plaques by Thomas Lovatt framed in ormolu collars and depicting domestic scenes. 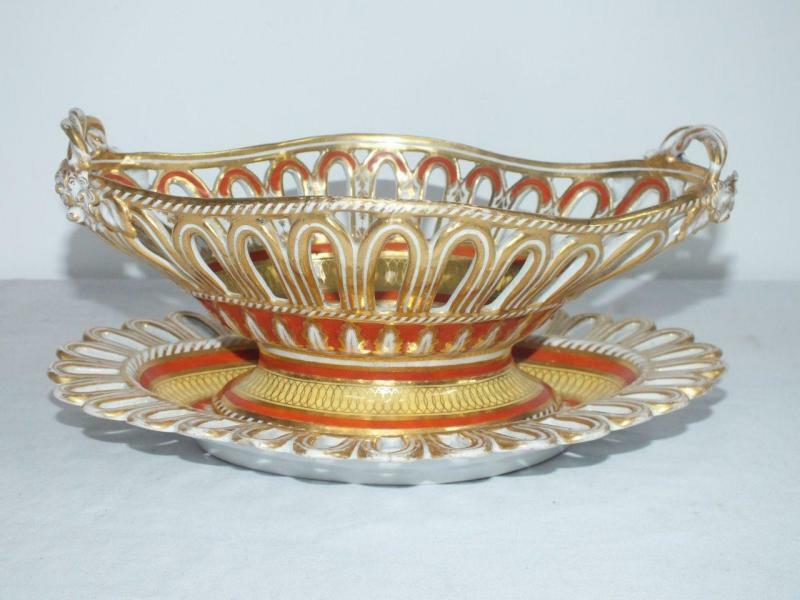 Large 18th century Chelsea red anchor centerpiece bowl of navette form decorated in bright puce with exceptional gilding in the manner of Sevres. 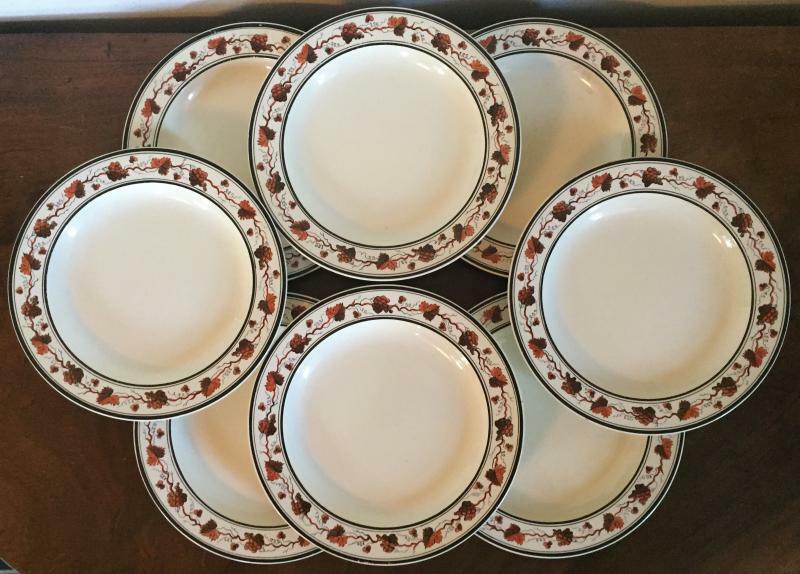 A rare dozen 18th century Wedgwood creamware plates or soup bowls with scalloped rims measuring just under 10" in diameter. 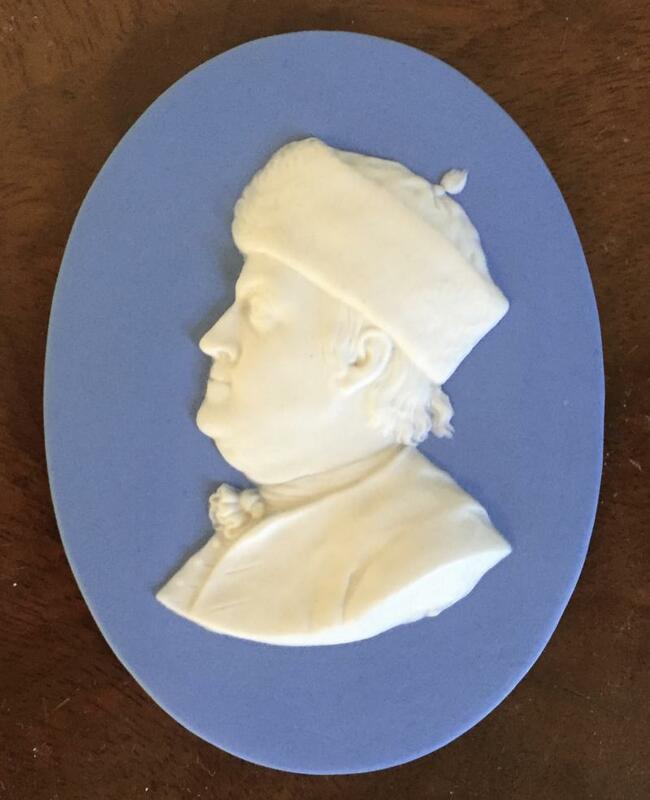 Decorated with neoclassical feather edge in moulded relief at the rim. 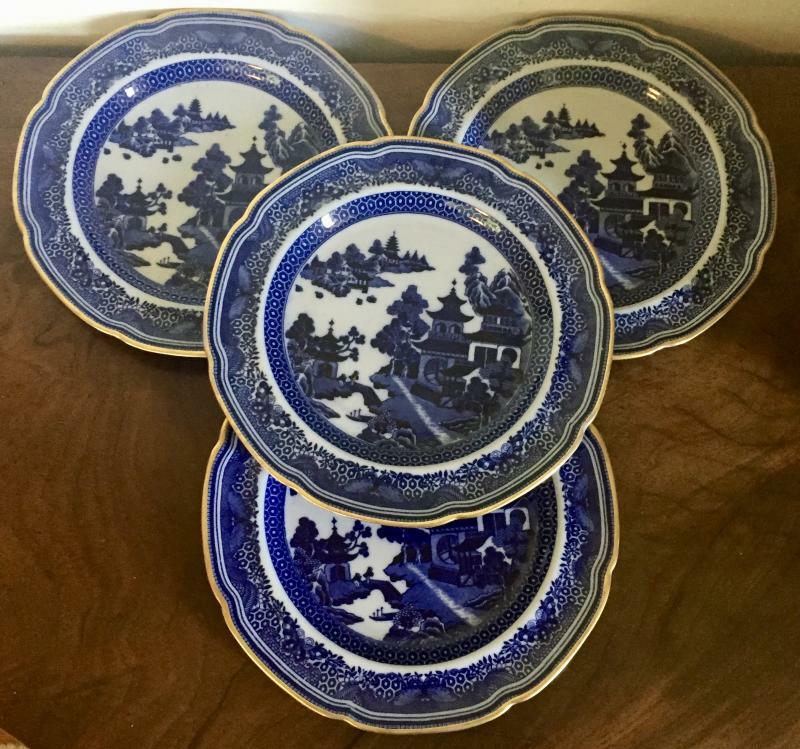 Four 18th century Wedgwood creamware dinner plates. Fine Worcester pastille burner urn decorated with a London Thames scene. 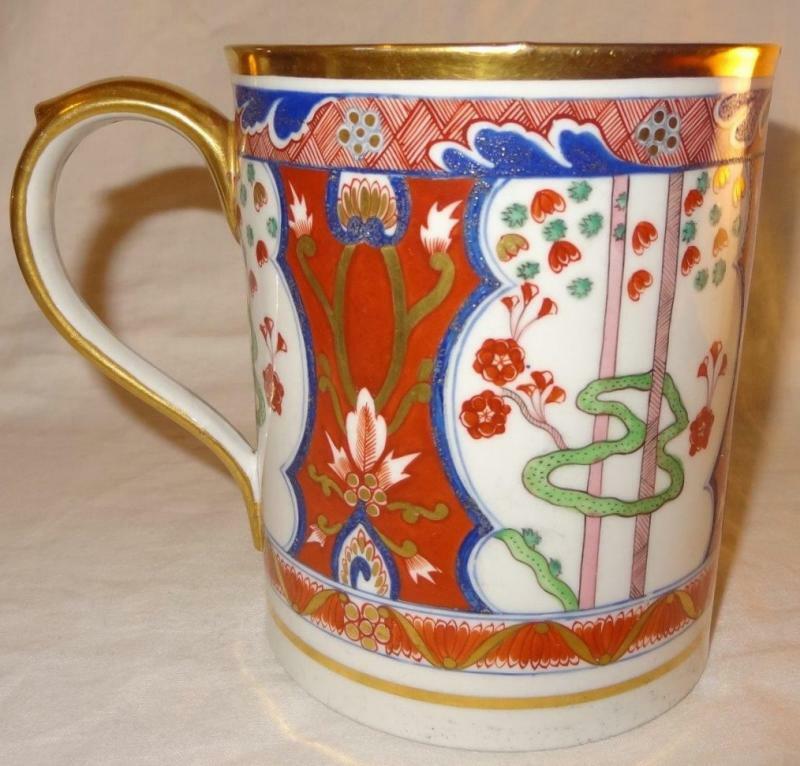 18th century Worcester Dr. Wall blue scale porcelain tankard decorated with exotic birds and insects. 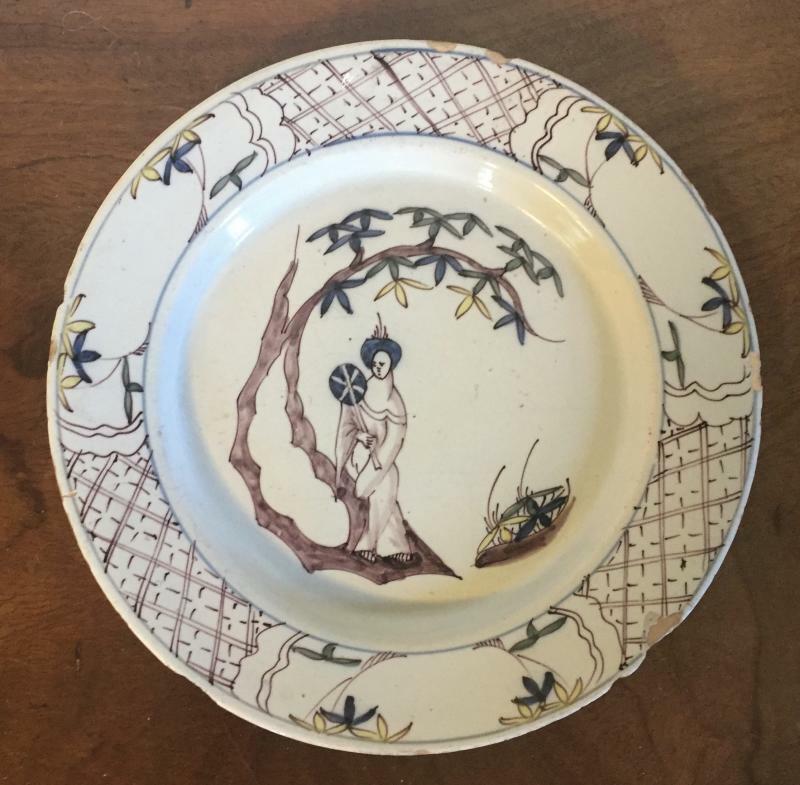 Pair early 19th c. pearlware plates with central reserves showing a woman at shore resting on an anchor awaiting her sailor at sea - emblematic of Hope. Fine and rare pair Worcester Barr Flight & Barr cachepot decorated with "View Near Lymington Hampshire" on a salmon ground c. 1805. 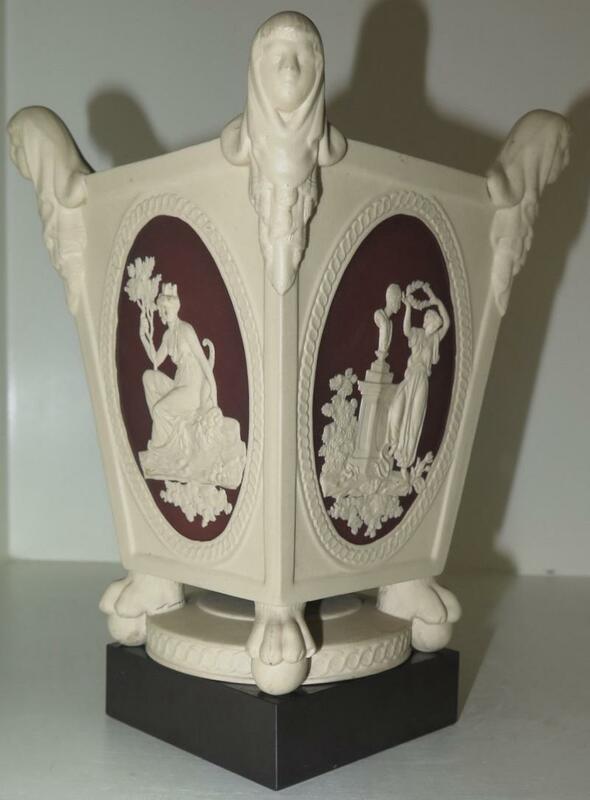 18th c. Wedgwood & Bentley basalt vase with cover. 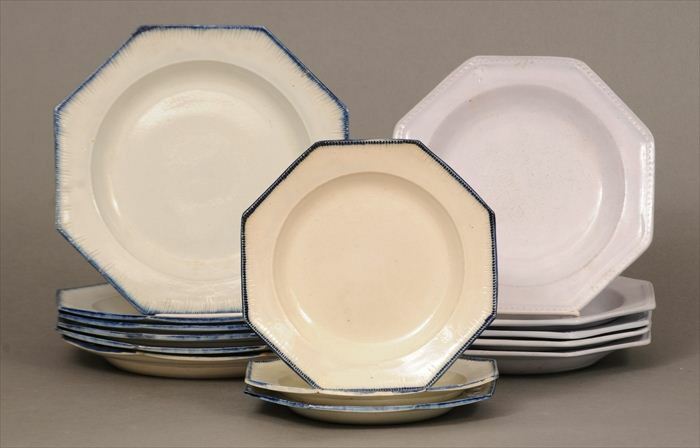 Selection mid 18th century Worcester and Bow porcelain plates in powder blue to mimic Chinese kangxi porcelains - c. 1760. 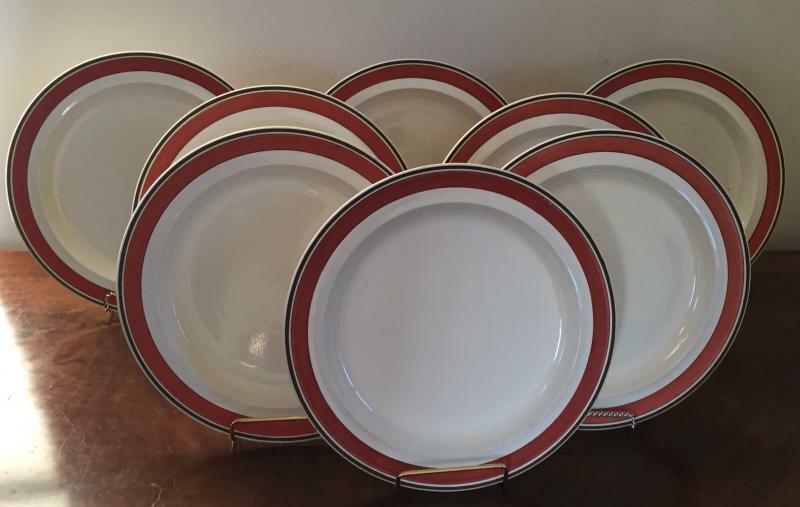 We have a dozen - some round, some octagonal and some with ruffled edge. Wedgwood Pearl scallop shell plates - cream with gold accents - 19th century. Pair large Mason's Ironstone China entree dishes and covers - Pink Scroll - 19th c.
Selection early Staffordshire pearlware figures. 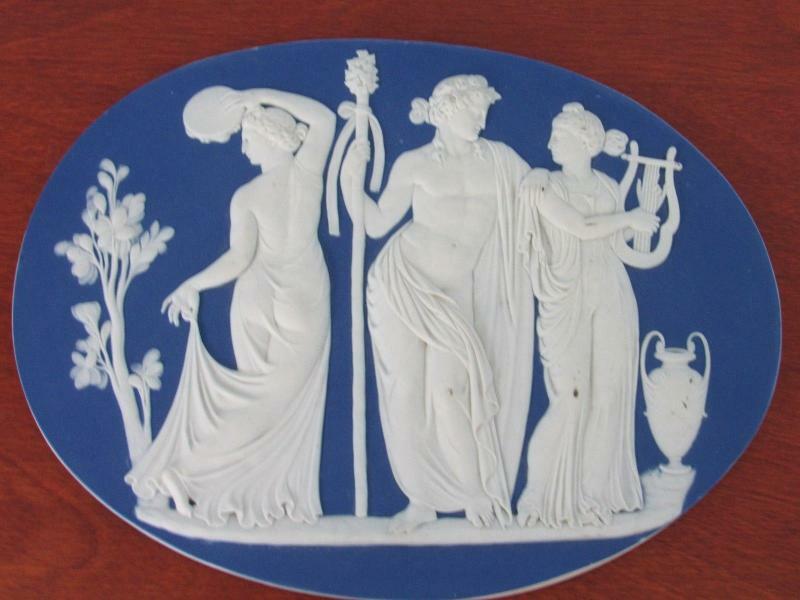 Selection 18th and 19th century Wedgwood jasperware plaques in the neoclassical taste. 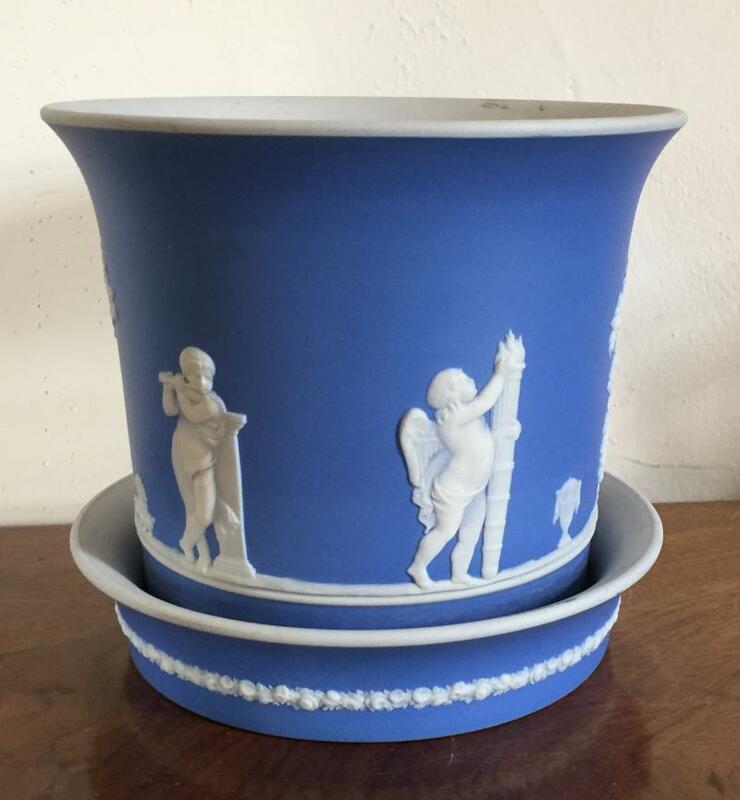 Large 19th c. light blue jasperware flower pot & stand. 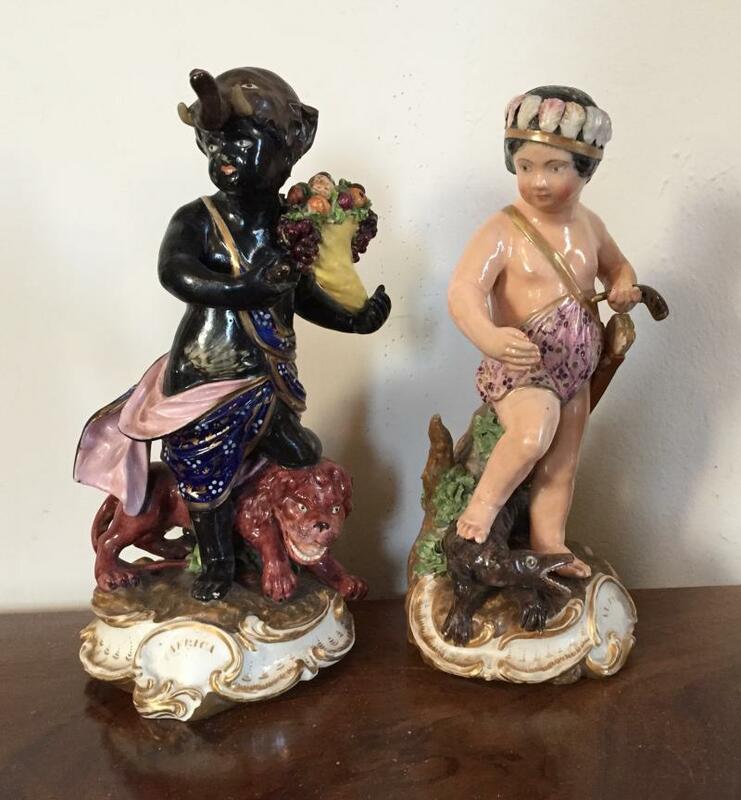 Worcester Blind Earl plates - we have a dozen in stock ranging in age from 18th to early 19th c.
Pair early pearlware figures of a standing deer and recumbent doe in bocage. 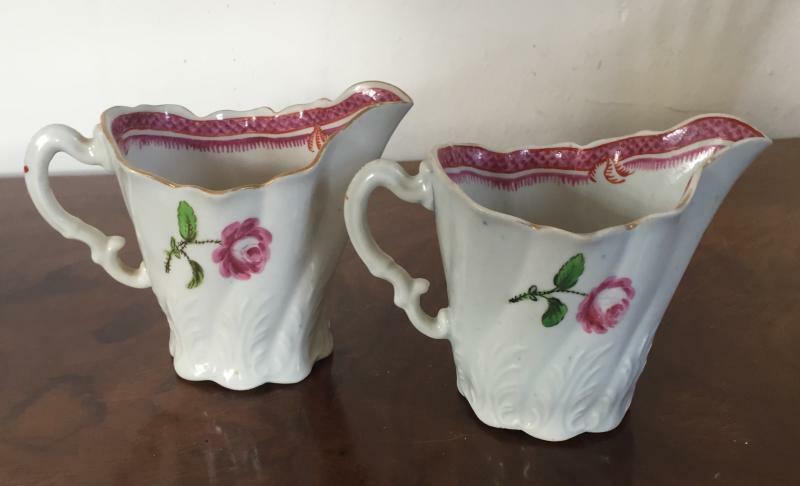 Pair 18th c. Worcester / Caughley flower pots. 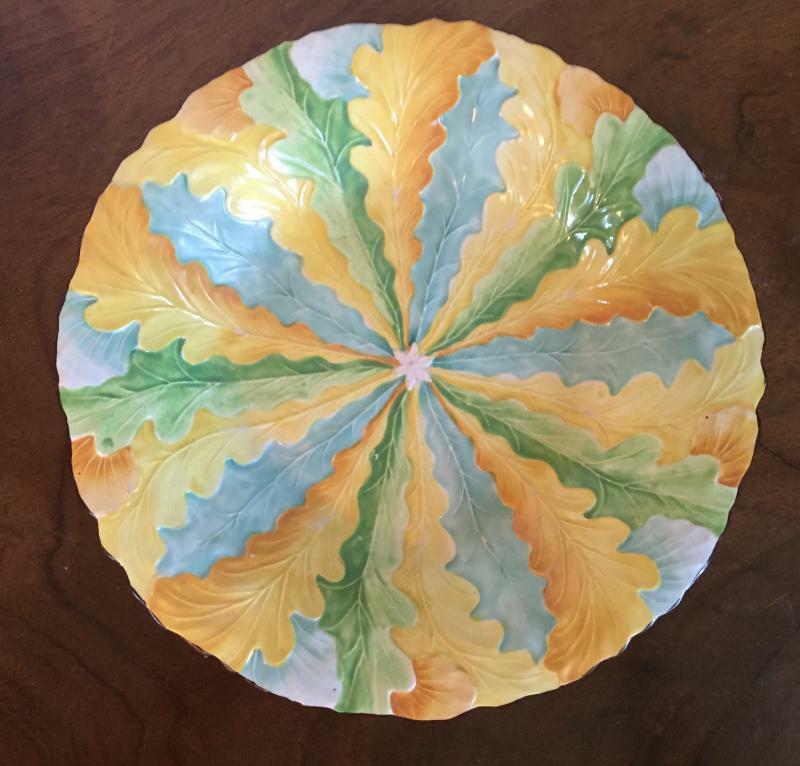 Collection lettuce leaf majolica tureens and plates. 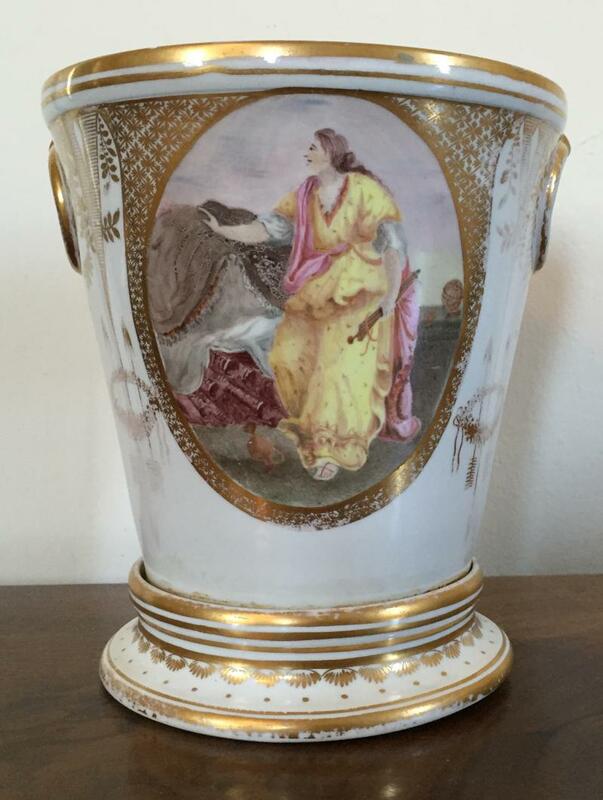 Early 19th c. pink luster flower root pot and stand decorated with classical scenes in white sprigging. Early 19th c. pink luster urn vase decorated with classical figures representing the arts. 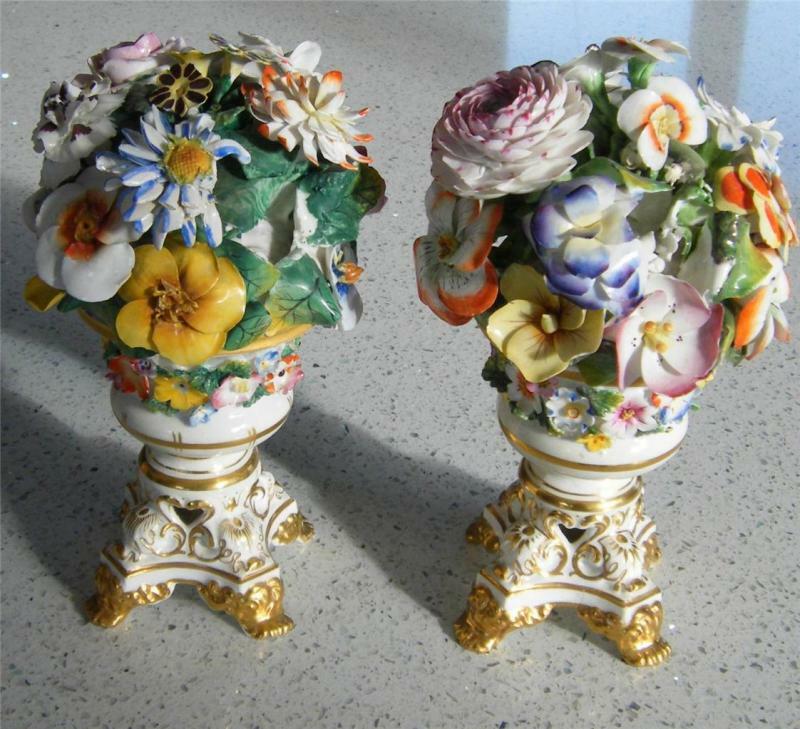 Fine pair 18th century Chelsea Derby porcelain trophies in the form of flower bouquets in gilt cachepot. 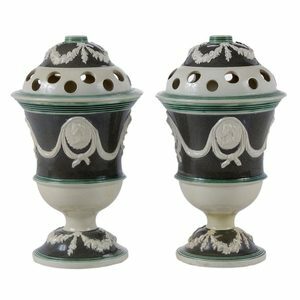 Pair early 19th century jasperware cachepot urns. 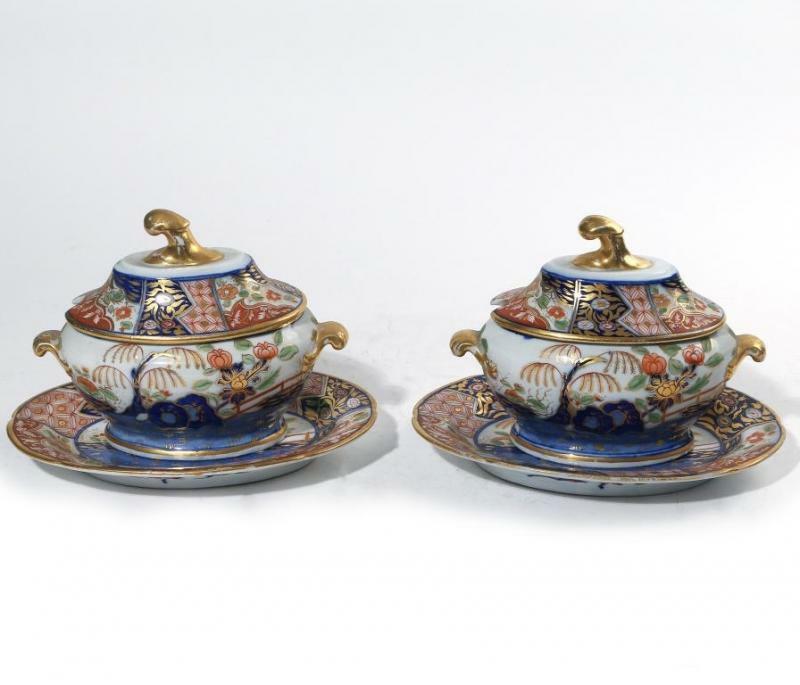 Fine pair 18th c. Derby porcelain pastille burners with guilloche and greek key borders c. 1790. 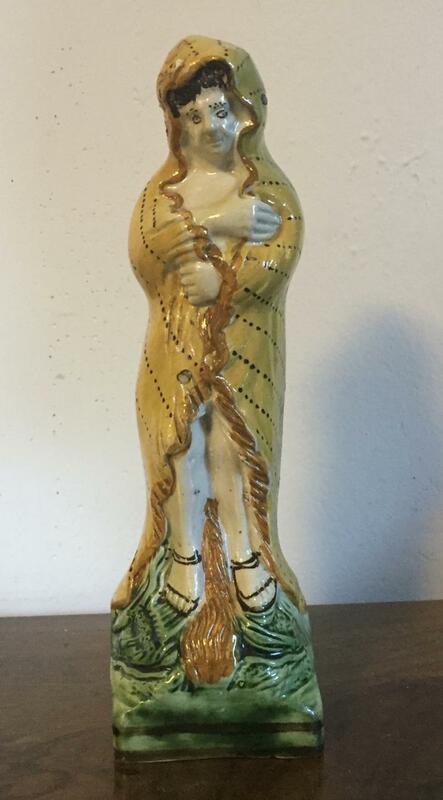 Large 18th century Prattware figure of the Four Seasons - Winter c. 1800. 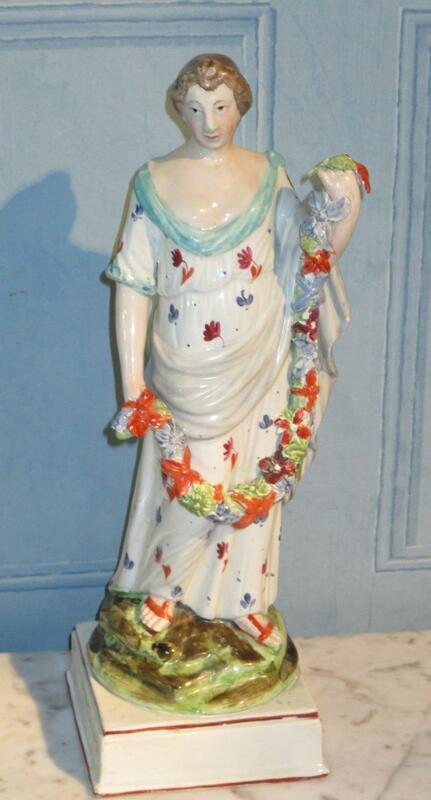 Large 18th century pearlware figure of the Four Seasons - SUMMER c. 1790. 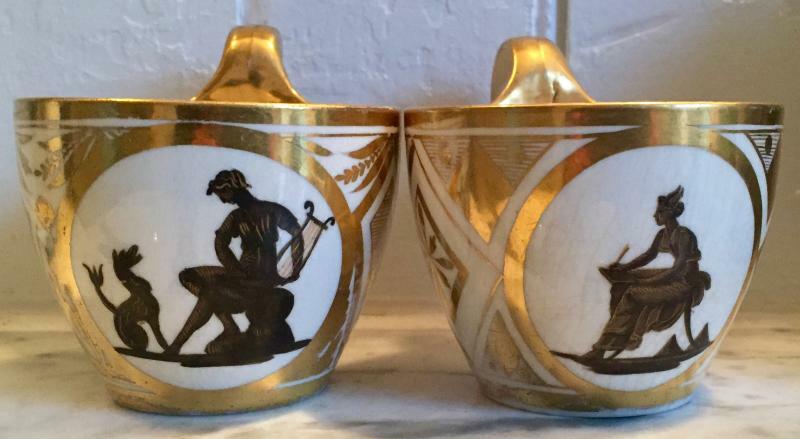 Two similar Regency Wedgwood jasperware urns c. 1820. A near pair - one slightly taller. Pair William Duesbury Derby Porcelain continents - Europe and Africa c. 1780 - identical models in the collections of the Victoria & Albert Museum, London. 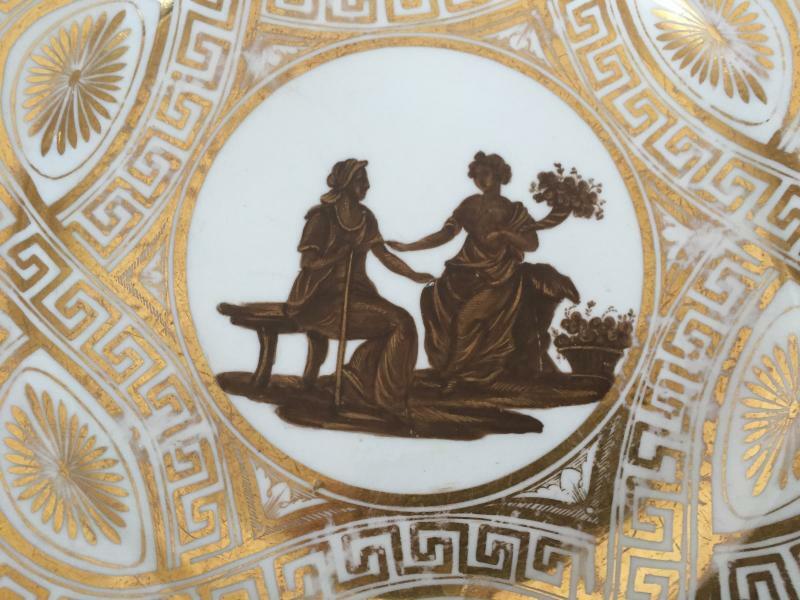 Large Derby porcelain flower encrusted centerpieces - early 19th c..
Coalport porcelain plate London decorated en grisaille with classical figures. Expert gilding, c. 1805. 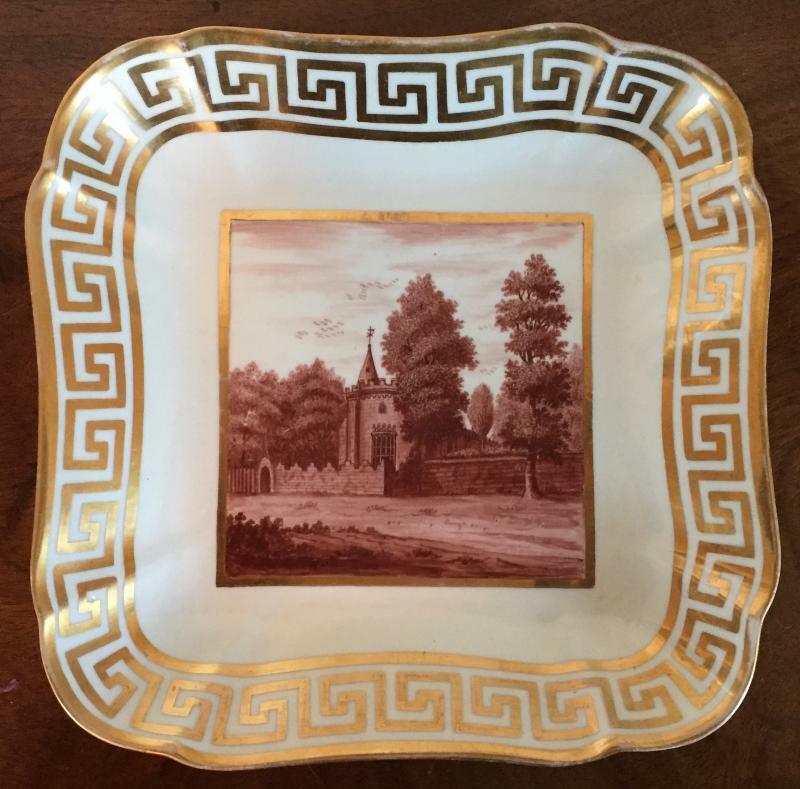 Coalport dessert dish featuring a classical silhouette enhanced with gilding. 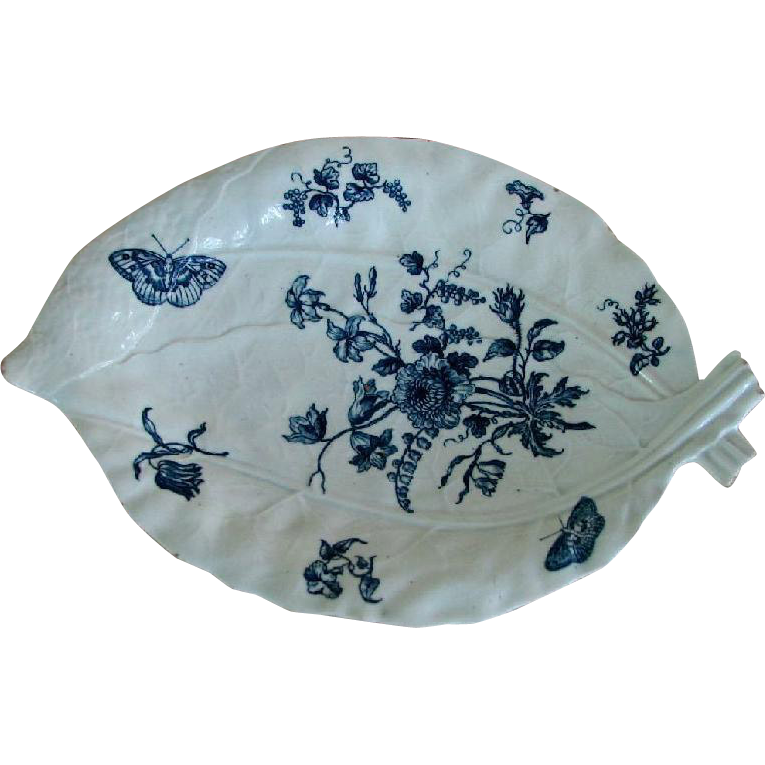 18th century Bow porcelain pickle dish in the form of a leaf. Staffordshire portrait bust of Prime Minister George Canning c. 1827. 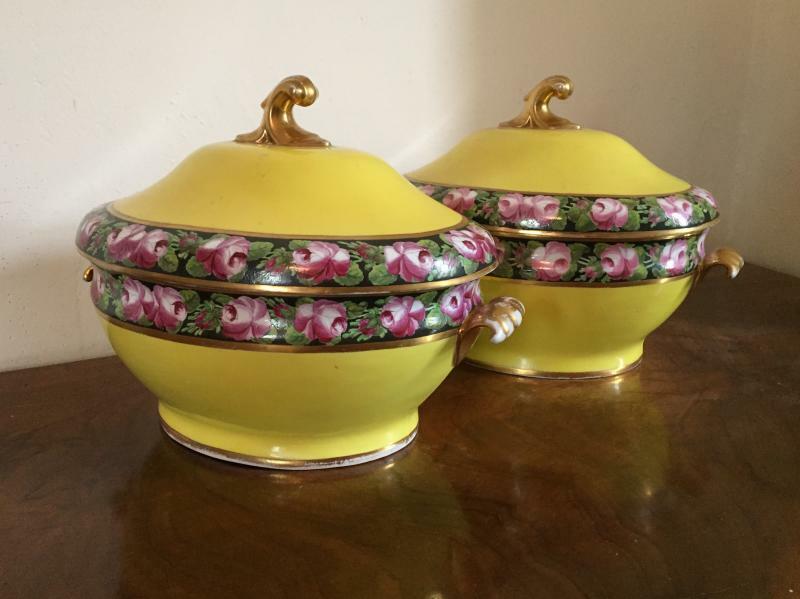 Pair hot pink Rockingham porcelain sauce tureens - early 19th century. 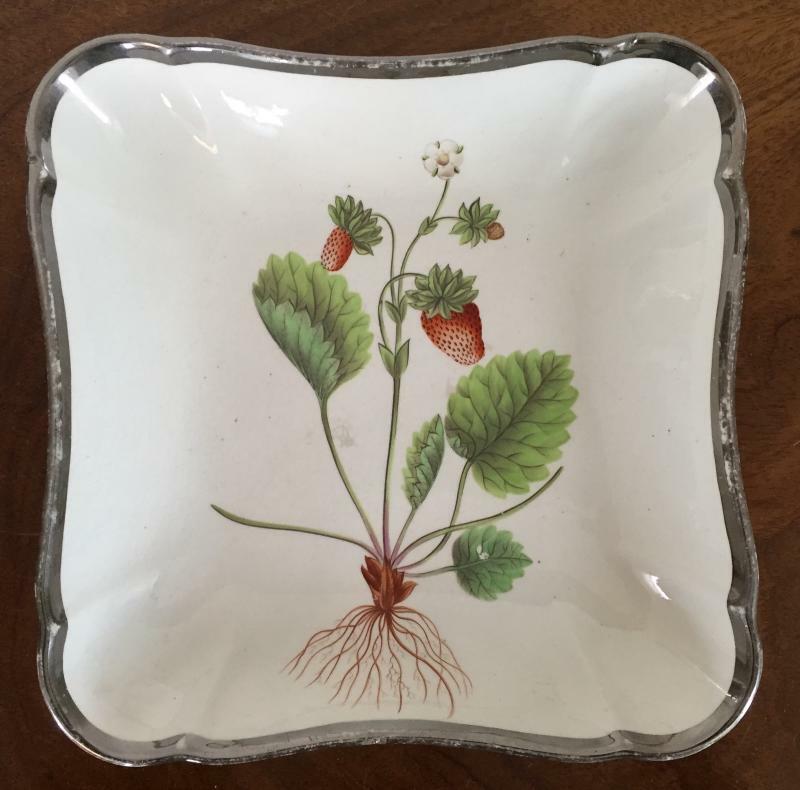 Coalport footed centerpiece tazza decorated with strawberries and gilding. Early 19th century. Chamberlain's Worcester plate with fruit decoration finely executed. 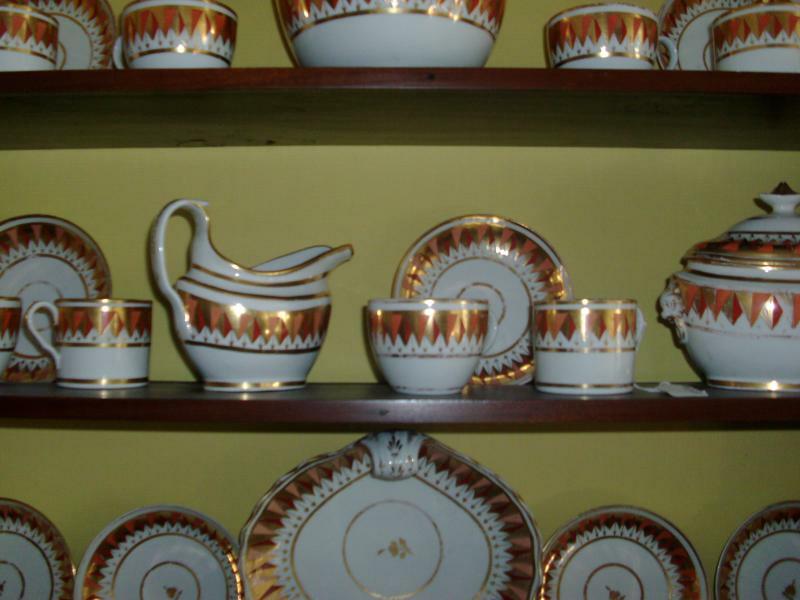 Coalport dollar pattern dinner plates and serving dishes dating from 1805. Wedgwood & Bentley Agate Bulb Pot - 18th century. Wedgwood buscuit porcelain urn shaped lemonade cup and cover c. 1820. 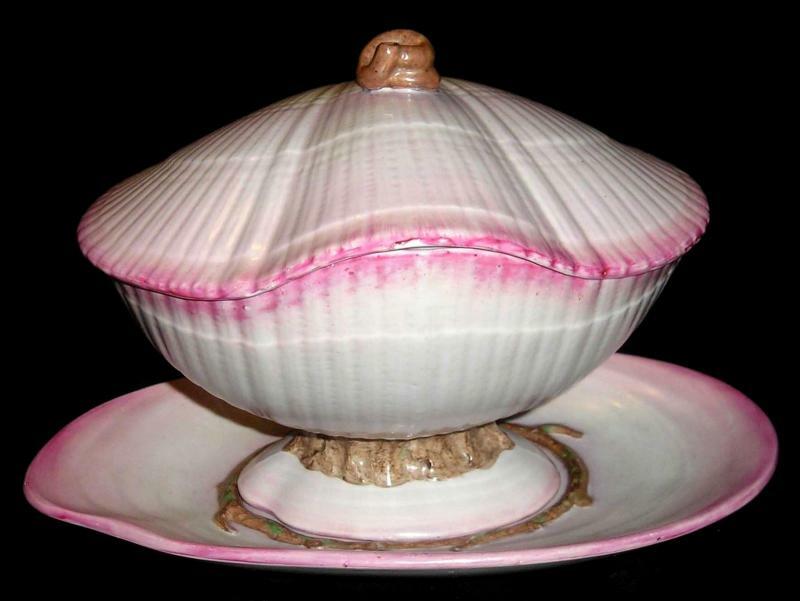 Extensive 19th c. Wedgwood pearlware shell service in beautiful shades of pink and yellow. 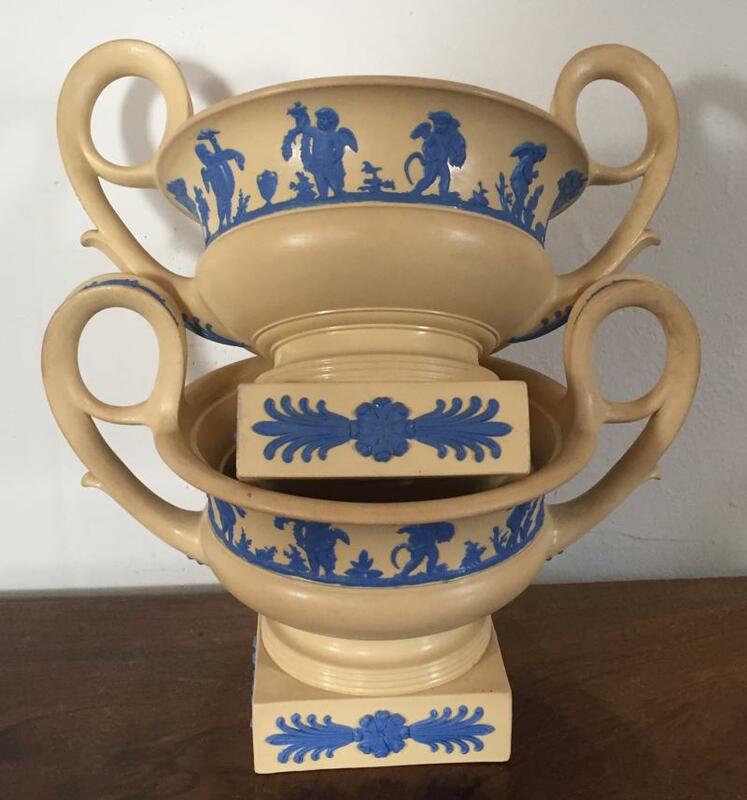 19th c. Spode brown glazed jasperware flower root pot and stand or cachepot with classical relief decoration and ring handles. Pair 19th c. pearlware Staffordshire seated hounds measuring 8" tall. 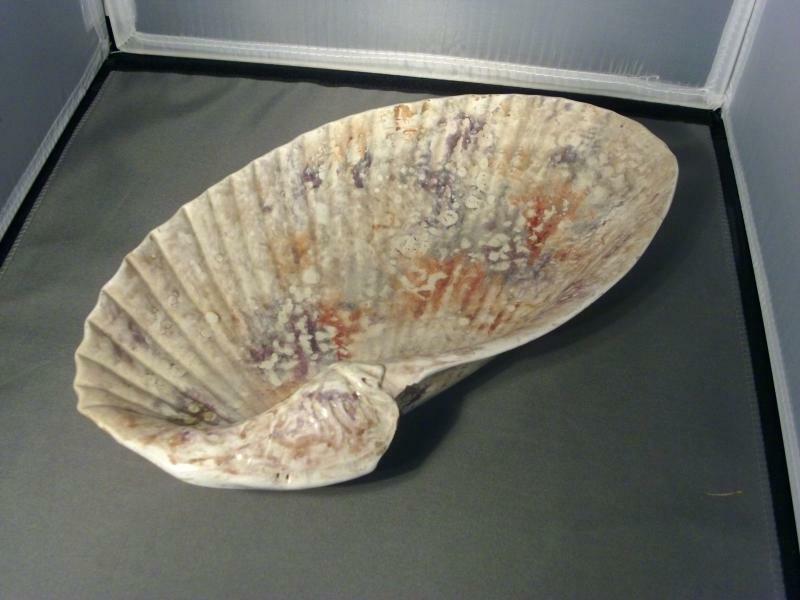 19th c. Worcester porcelain model of a murex conch shell - date mark for 1865. Wedgwood majolica shell / nautilus service in wonderful mottled shades of green and brown - c. 1870. 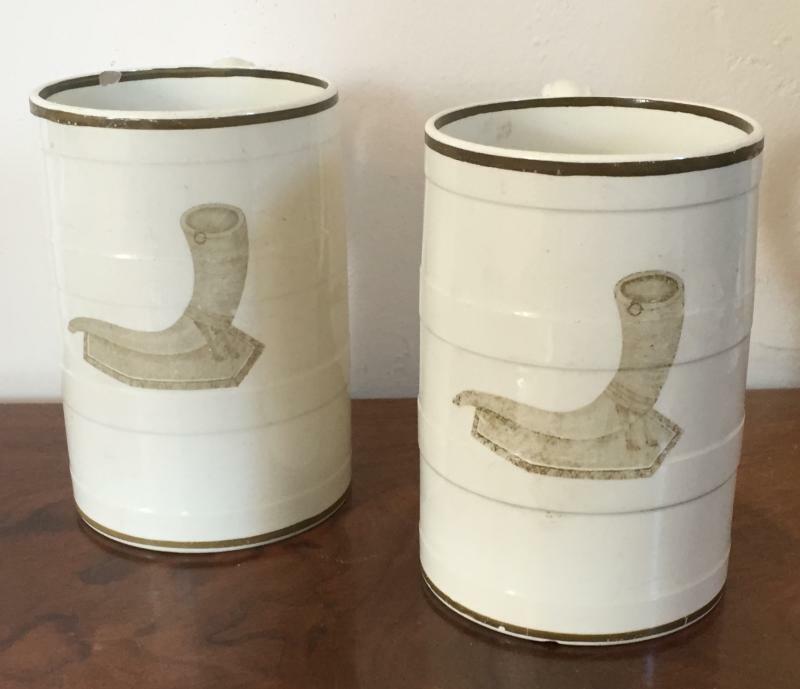 Rare pair early 19th c. Wedgwood creamware tankard ale or beer mugs decorated with a shepherd's horn or shofar. Made with relief rings to imitate a cooper's hoops. Large size. First Period Worcester Japan scarlet sparrow beak jug c. 1765. 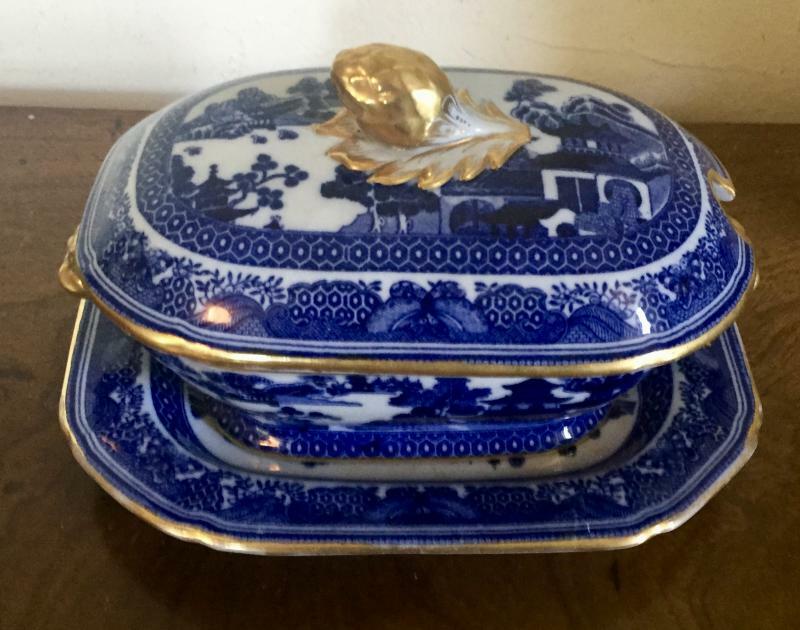 Pearlware blue feather edge tureens - two for sauce (7" over handles) and one for soup (12" over handles) - early 19th century. 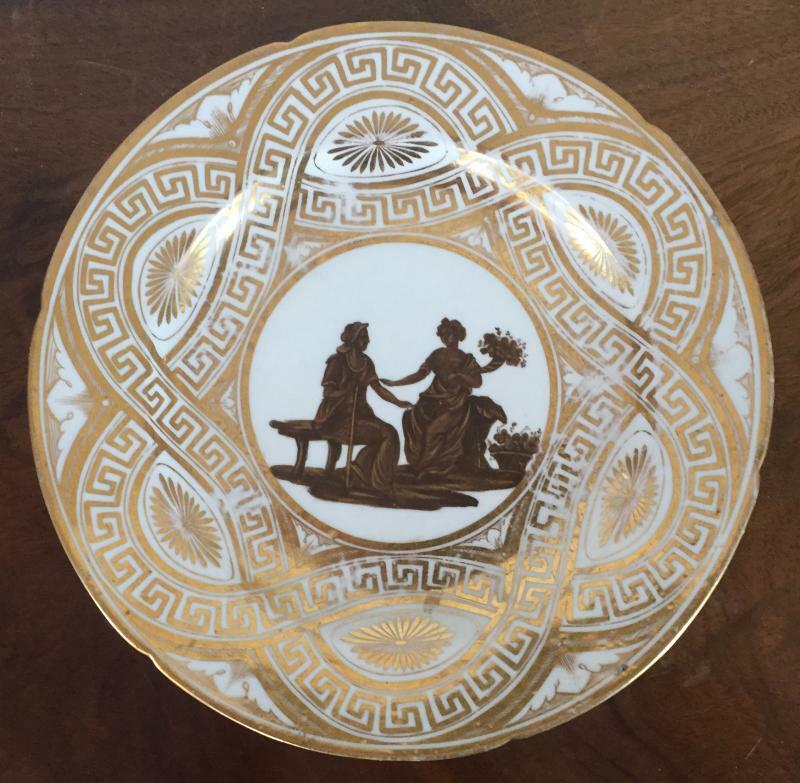 Pair large Spode cake or serving plates - c. 1820. 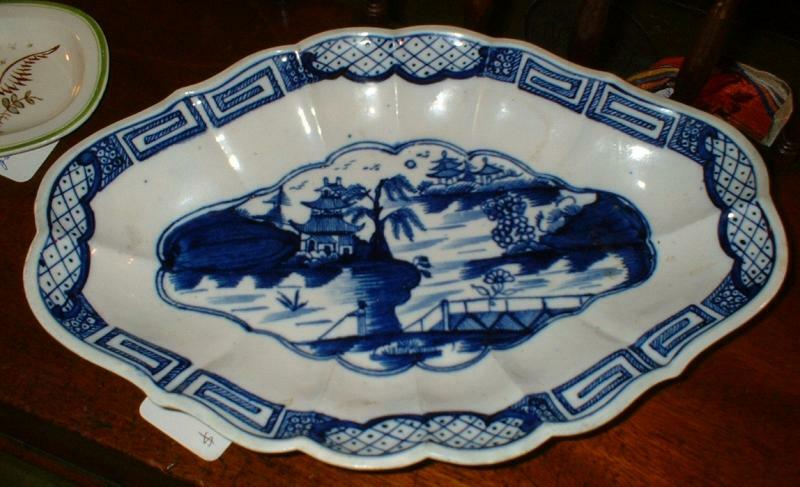 Large early 19th c. Derby porcelain dish. Decorated with floral sprigs and bright apple green border. Measures 12" long x 9.5" wide x 1.5" deep. 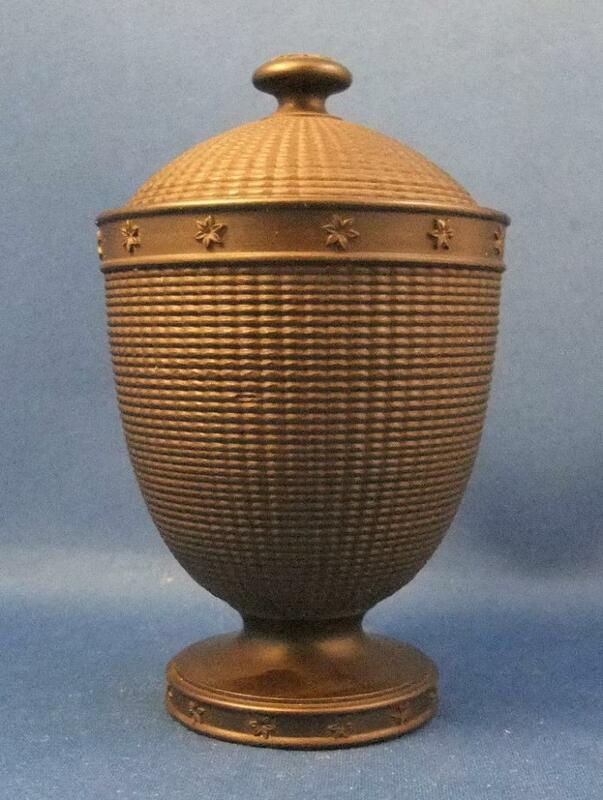 Early Derby urn form inkwell c. 1800 measuring just under 5" tall. 18th c. Dr. Wall Worcester bat pattern after Chinese Kangxi design. 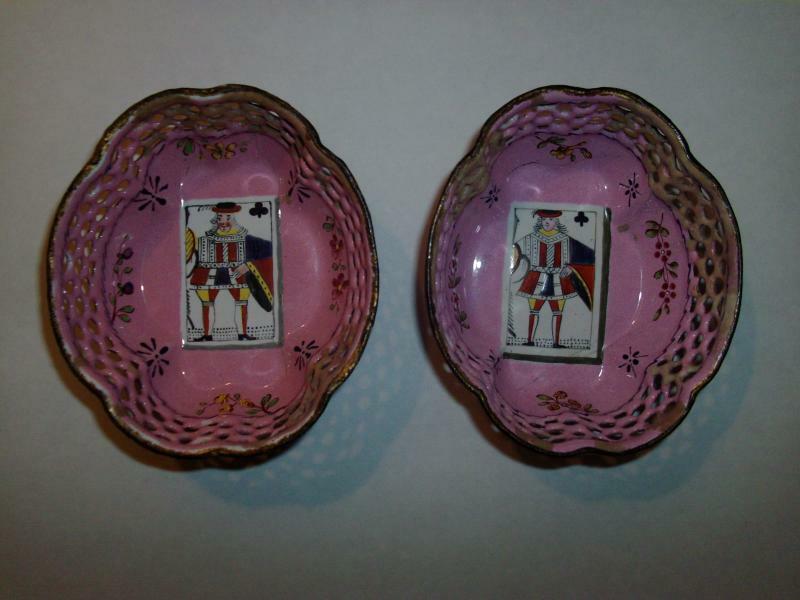 Pair 18th c. Battersea / Bilston enamel dishes with pierced gallery. Provenance - Estate of Greta Garbo; purchased from Philip Suval New York.Measurement: 3" long. 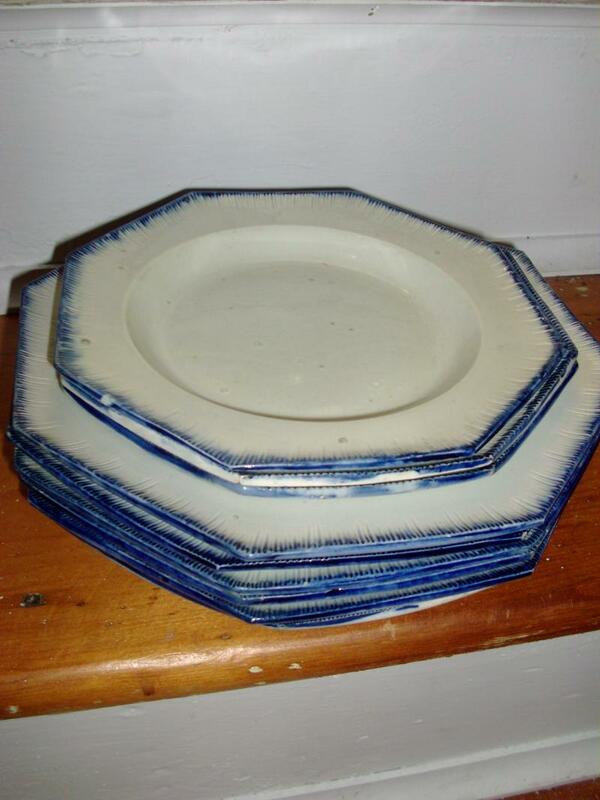 Nine octagonal 18th c. Leeds pearlware featheredge plates.Measurement: 10". 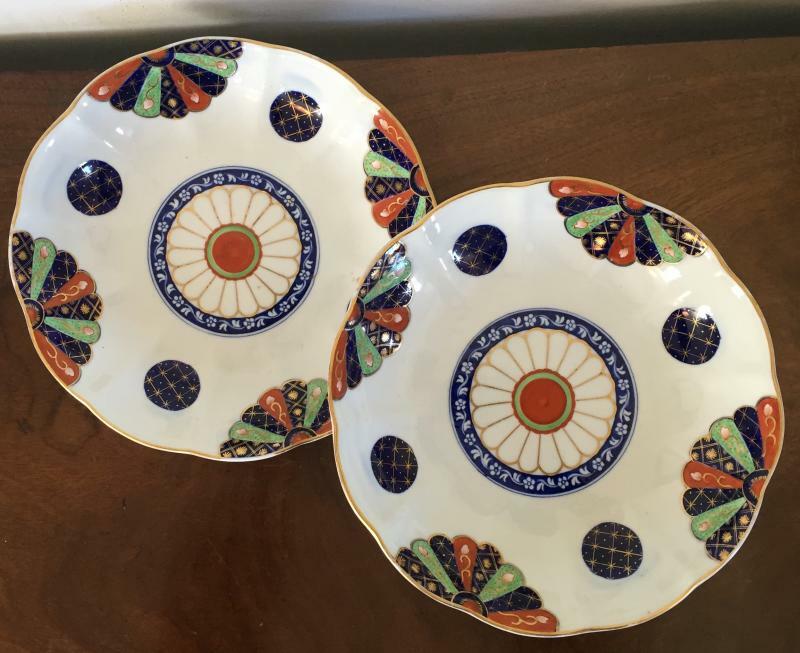 Pair serving plates with floral decoration. 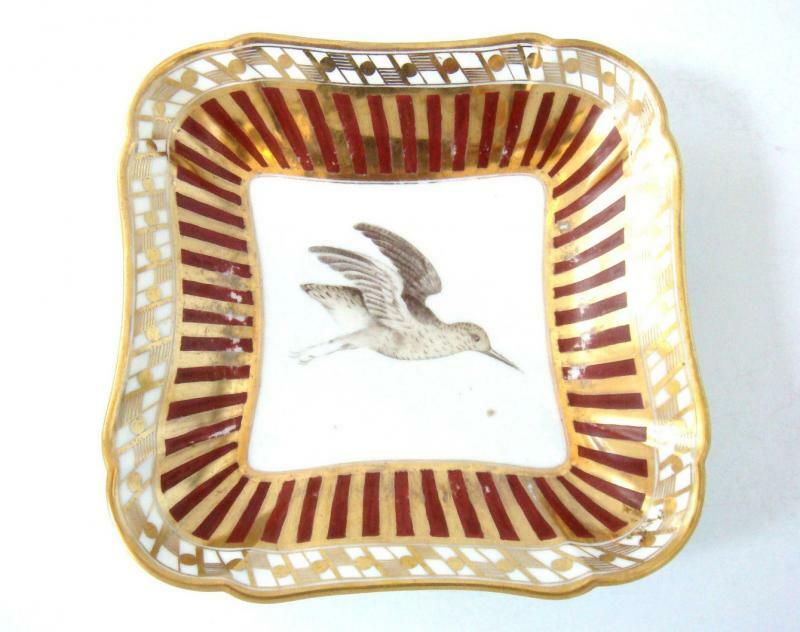 Worcester Blind Earl dish - Flight Barr c. 1810. Extensive Coalport tea service comprised of sugar, cream jug, 2 slop bowls, cake dish, 9 tea cups, 4 coffee cans and 8 saucers - c. 1807. 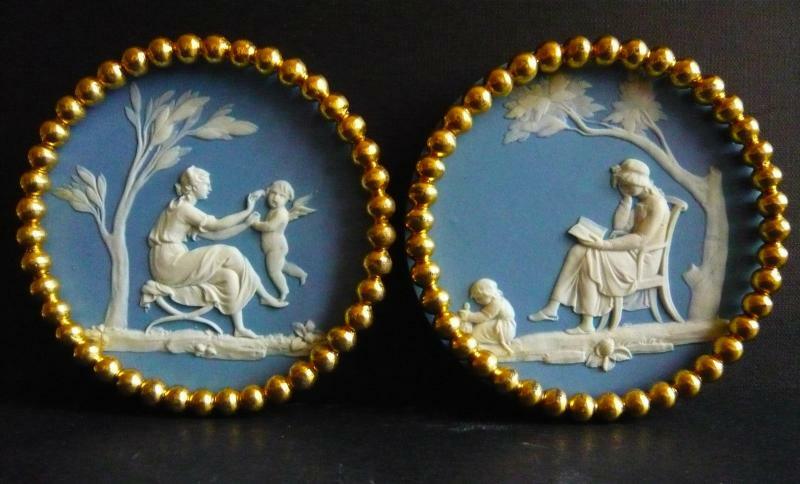 Early 19th c. Wedgwood jasperware plaques depicting the Seasons - Winter and Summer. 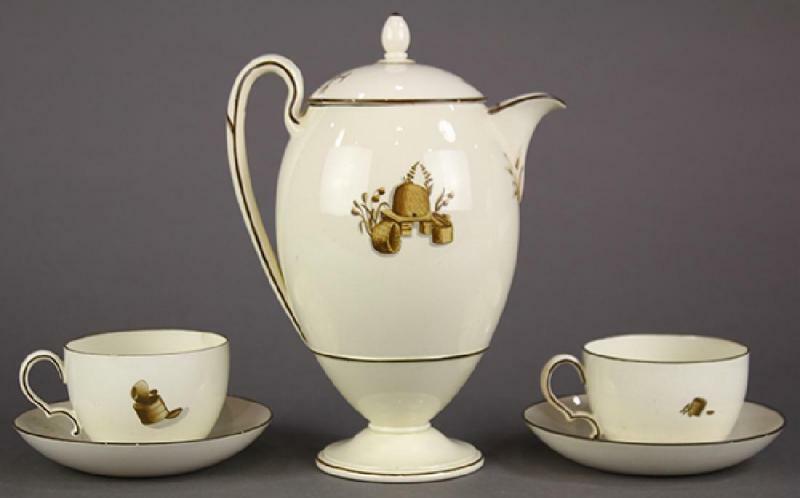 Coalport classical tea wares c. 1805. 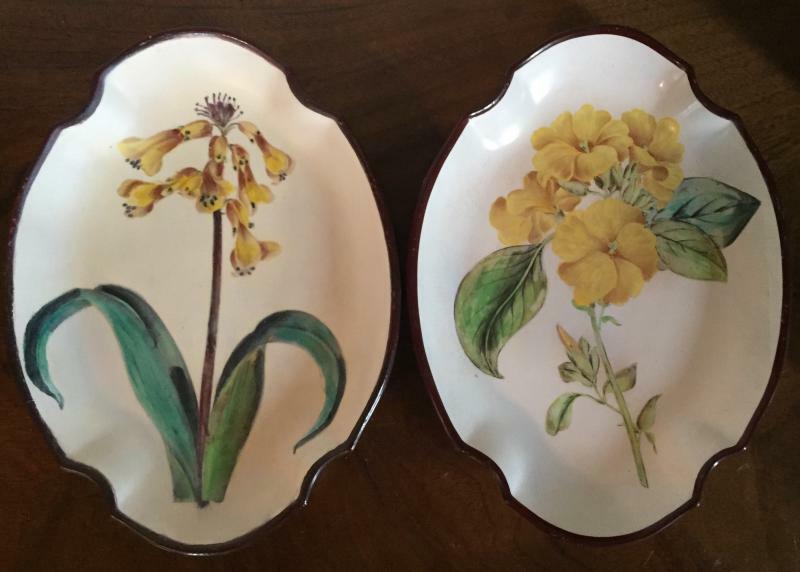 Pair Ridgway husk shaped botanical dishes each depicting different flower specimens - c. 1830. 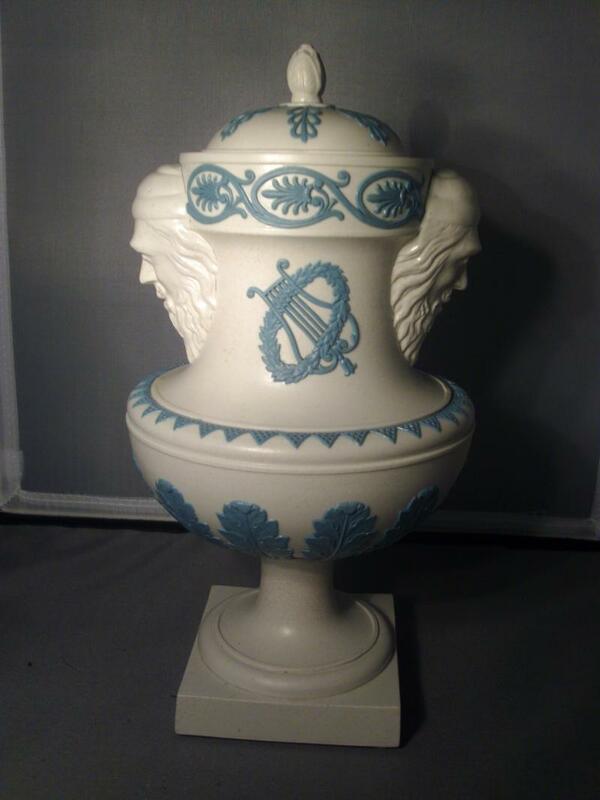 Early 19th c. Spode spill vase with powder blue ground. 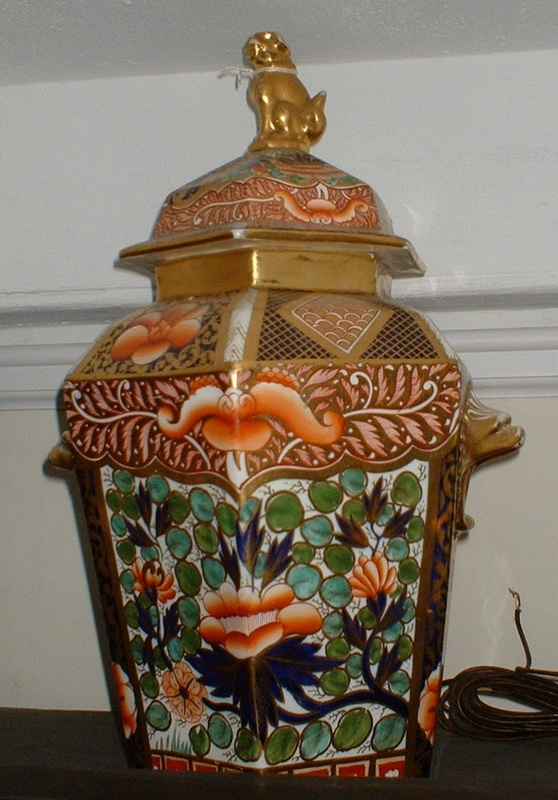 Regency urn decorated inside and out with bands of flowers - rams head handles - Coalport or Swansea c. 1810. 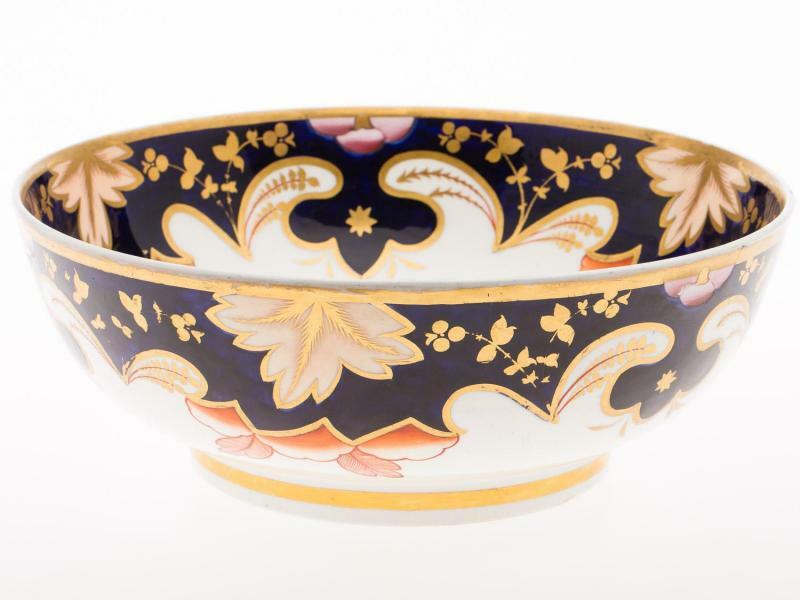 Regency slop bowl with tactile bas relief decoration of flowers and gilt edge c. 1810. 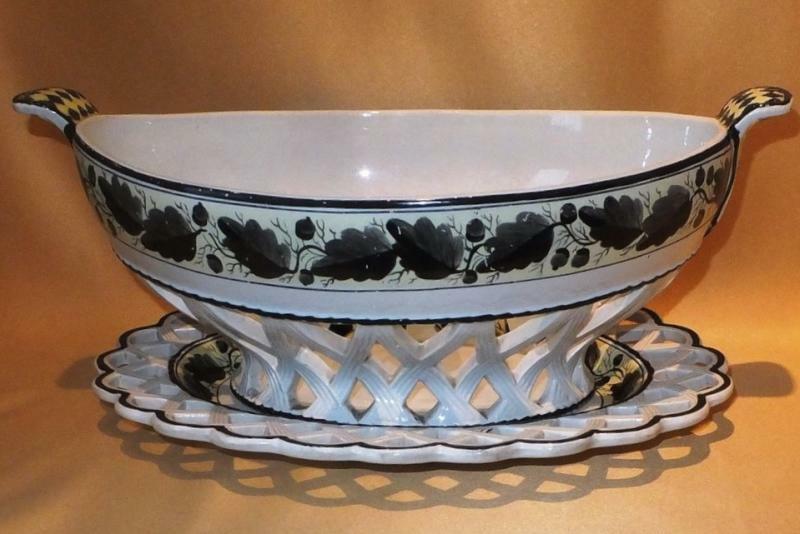 Drabware quatrefoil shaped dish with relief detail - early 19th c.Measurement: 11" long. Dolphin handled tureen with knop handle and gilt decoration - c. 1815.Measurement: 10.25" over handles. 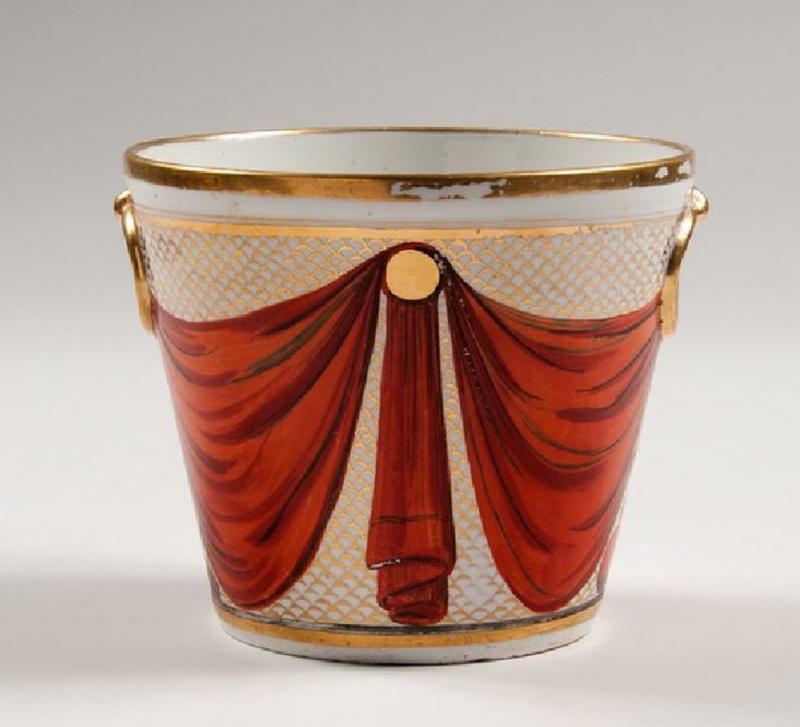 Regency Worcester fruit cooler with grapevine motif - c. 1810.Measurement: 9" tall. Regency model of a sphinx. Spode Platewith powder blue ground and butterfly decoration c. 1810. Pair Bow models of Florentine boars.Measurement: 5.5" wide. 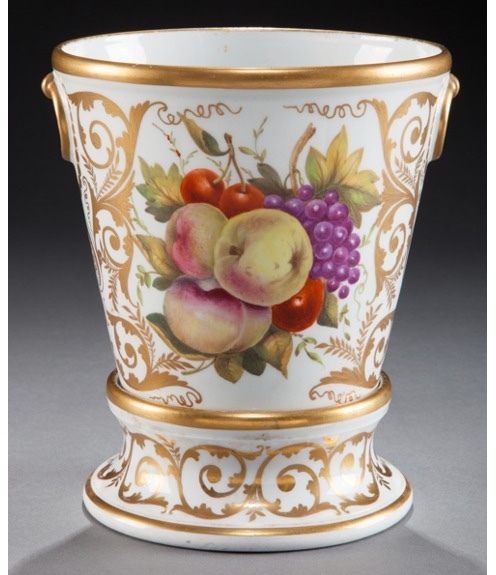 Coalport porcelain fruit cooler in white & gold with shell handles - c. 1810.Measurement: 10.5" tall. Derby Bough Pot with floral medallions and ram head handles c. 1820. Pair Wedgwood jasperware vases in the consulate pattern - early 19th c.
Spode Imari pattern 3154 with peonies in shades of pink, orange, brown and green. 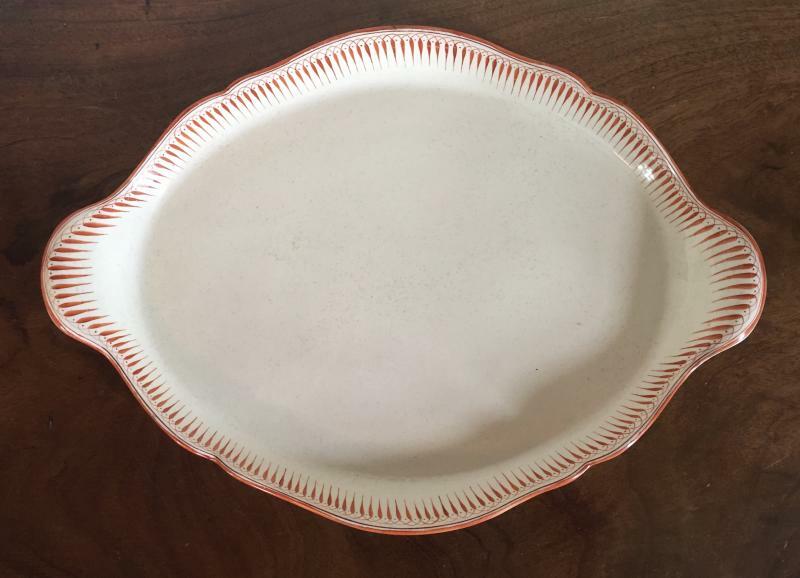 Large 18th c. salt glaze charger and plate in the form of a silver meat platter. 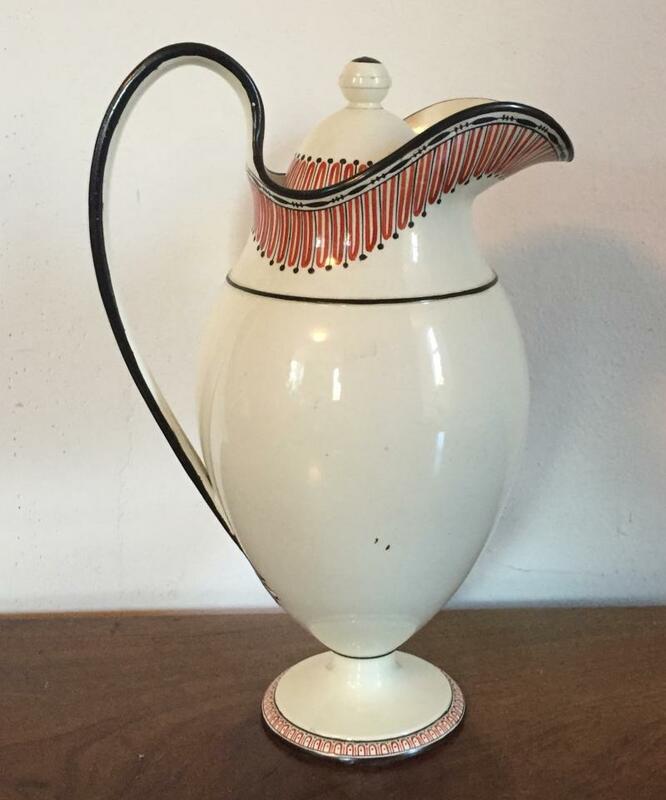 Unusual and large 19th c. salt glaze pitcher measuring 11.5" tall. 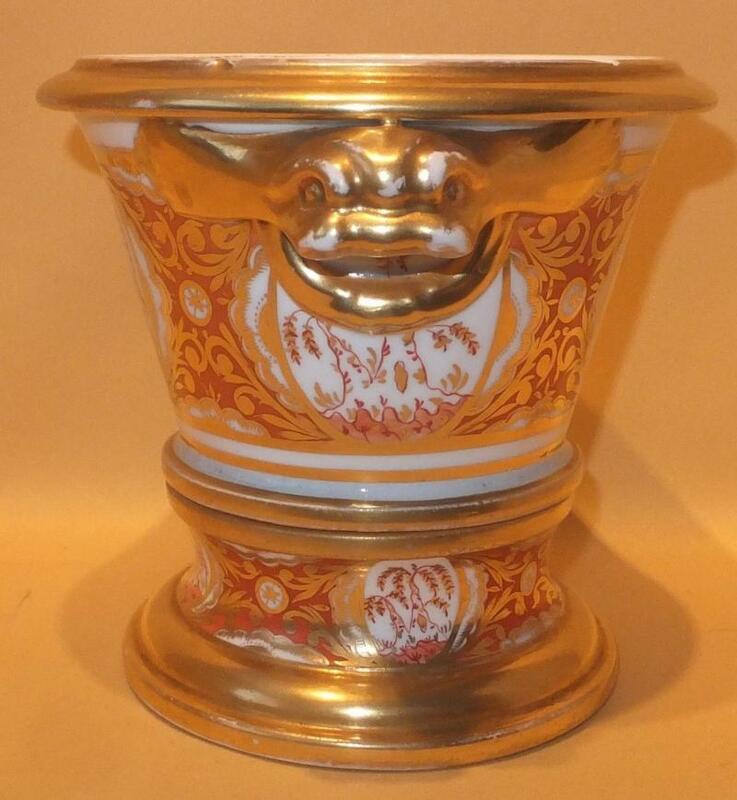 Worcester covered vase - large size with two handles, yellow ground and double armorial. Mimics a contemporary silver shape. 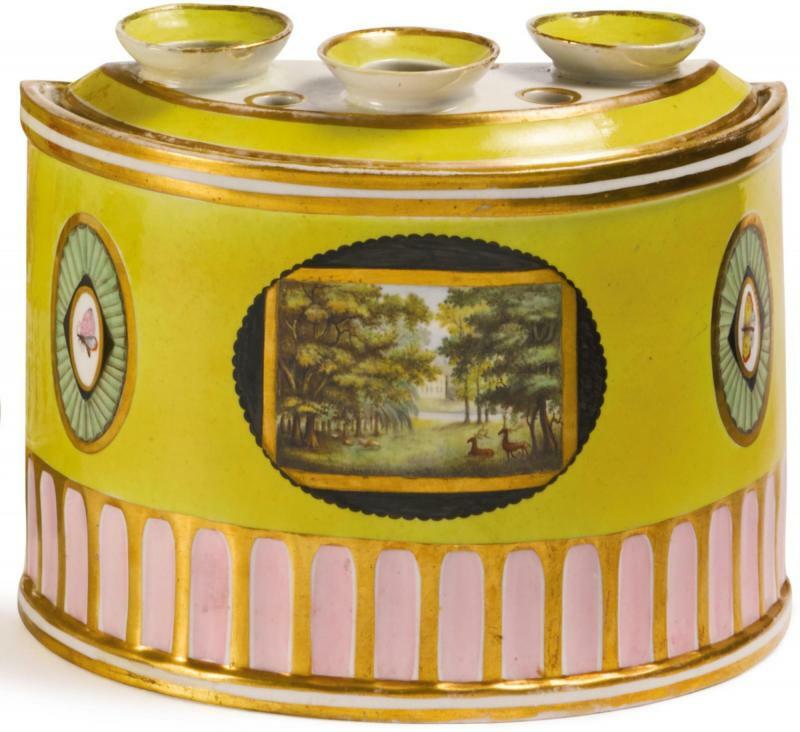 Coalport cooler with interesting handles, pink ground and black silhouettes of war trophies. 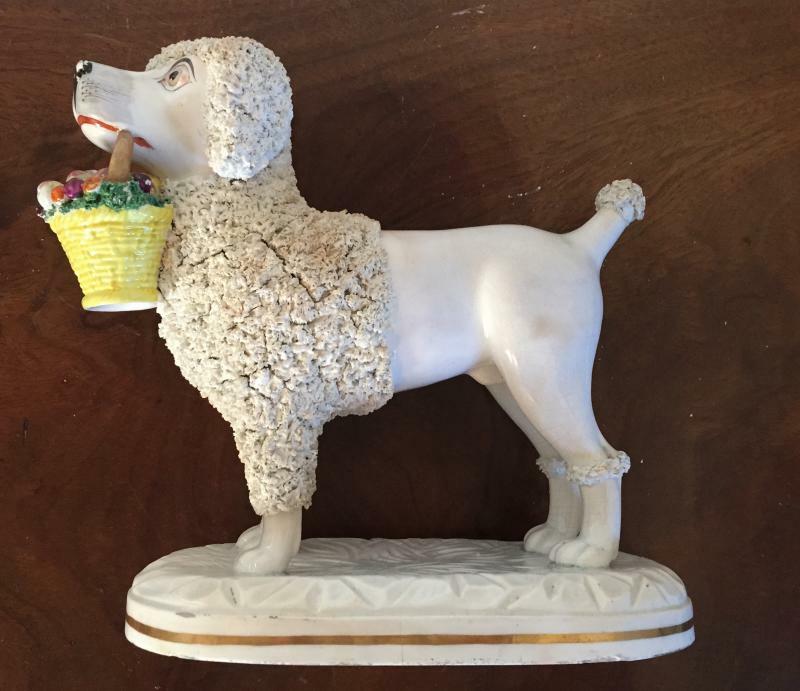 Large model of a poodle with vermicelli decoration - 19th c.
Selection of cow creamers including luster and Bennington glazes. 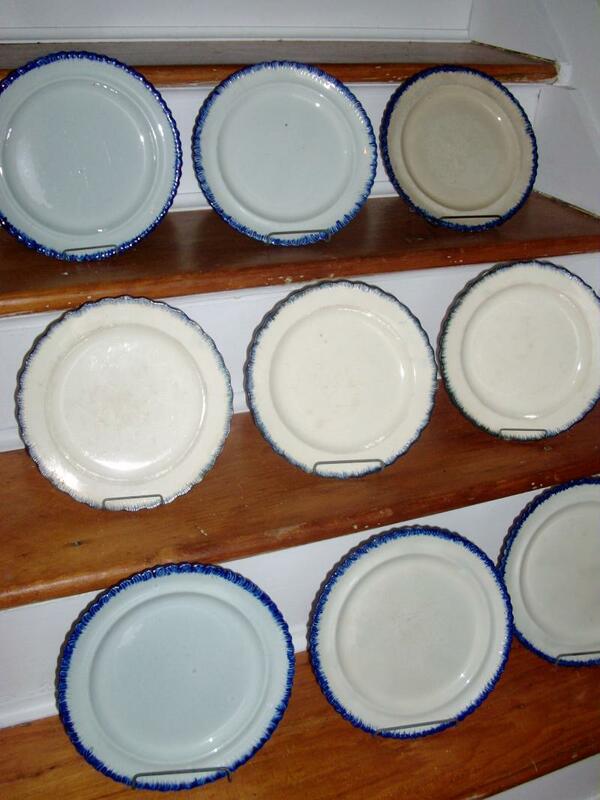 Sanded pearlware pots with piecrust edges and engine turned banding - early 19th c. Sometimes called agateware or graniteware, these items are sophisticated and tactile. Selection of 18th c. Worcester. 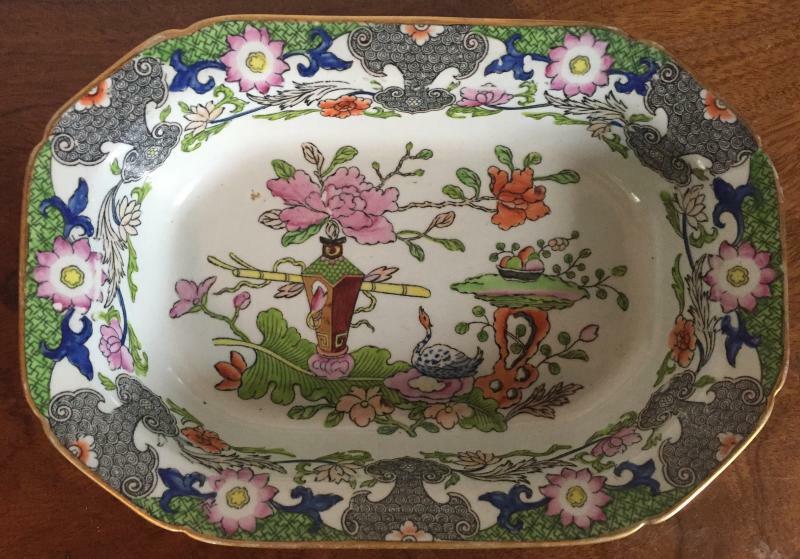 Regency quatrefoil shaped dish with pink ground and reserve painting of fruit. 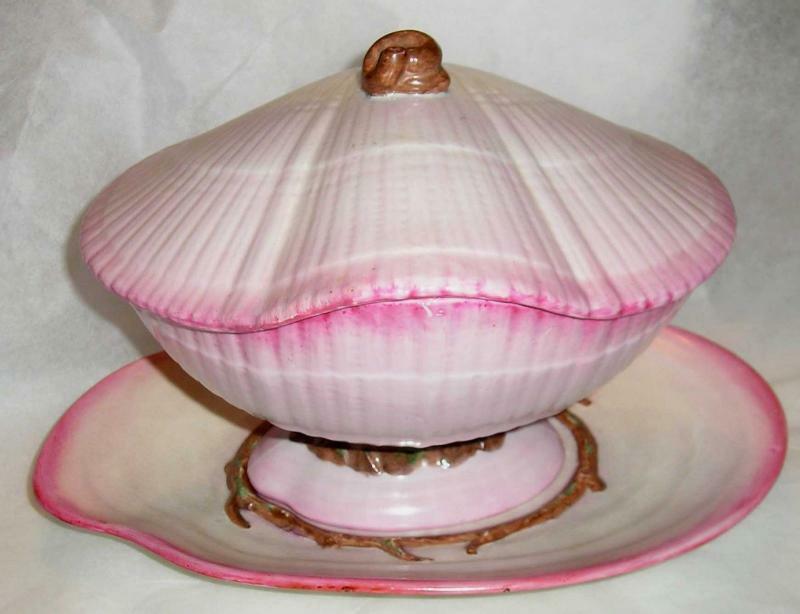 Early Derby shell form inkwell with pink ground and brown highlights. 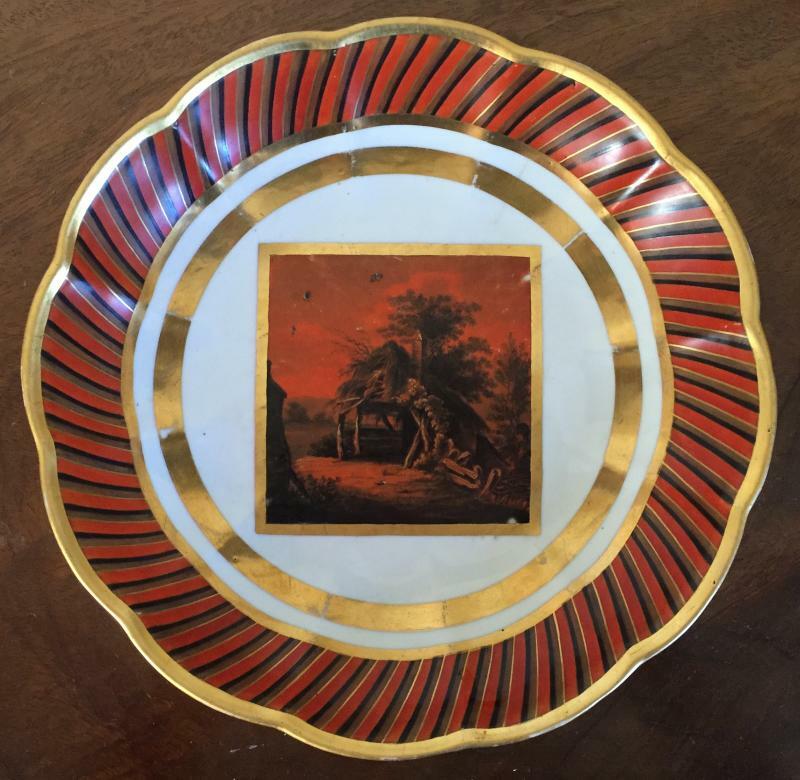 Worcester losenge shape porcelain dishes decorated with landscape reserves on orange ground with vermicelli gilding. 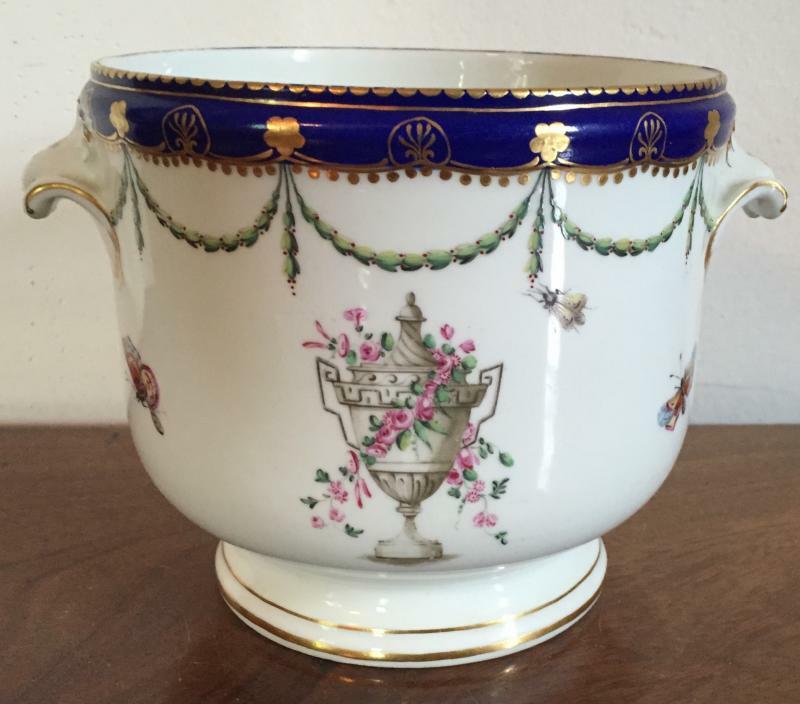 Spode 967 violet pot c. 1810. 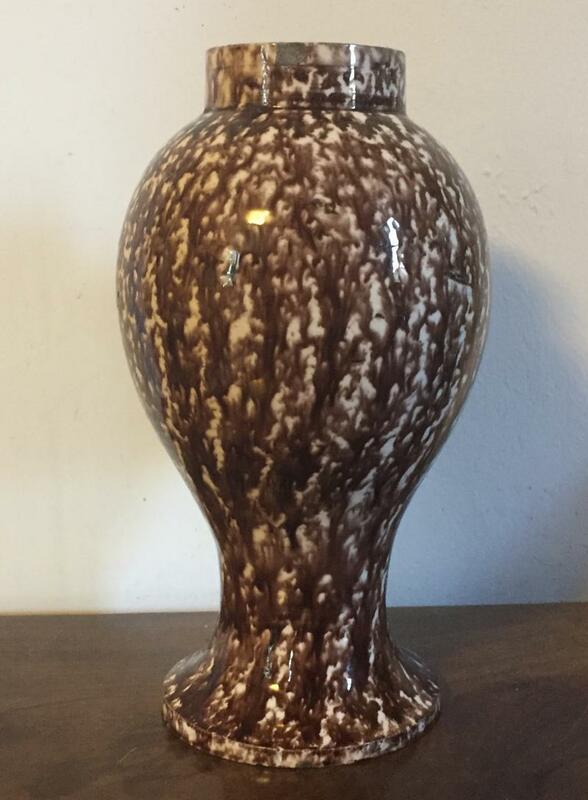 Spode 967 vase with animal paw feet. 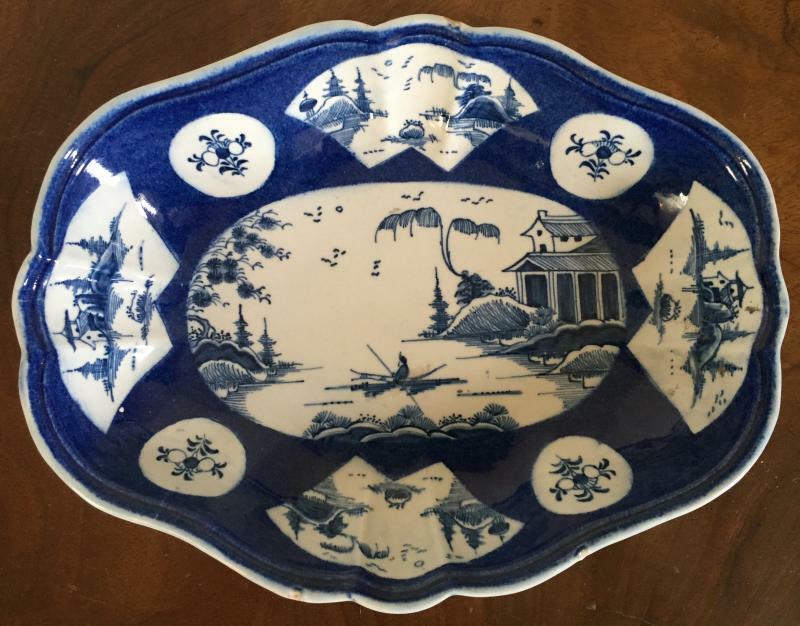 Large Wedgwood moonlight luster dinner plate - early 19th c.
Worcester blue and white shaped bowl c. 1780 with Chinese motifs and Greek key border. 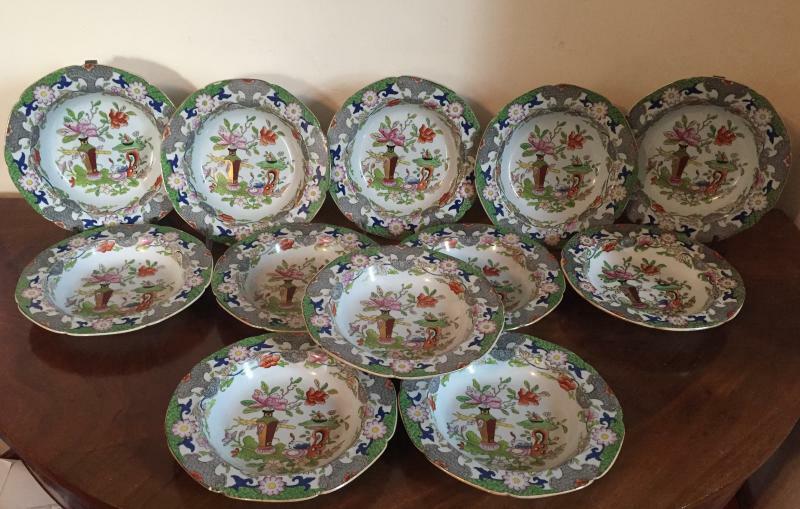 From a large selection of Worcester including chestnut bowls and small tureens. Coalport covered imari urn with dolphin handles and foo dog finial c. 1810. 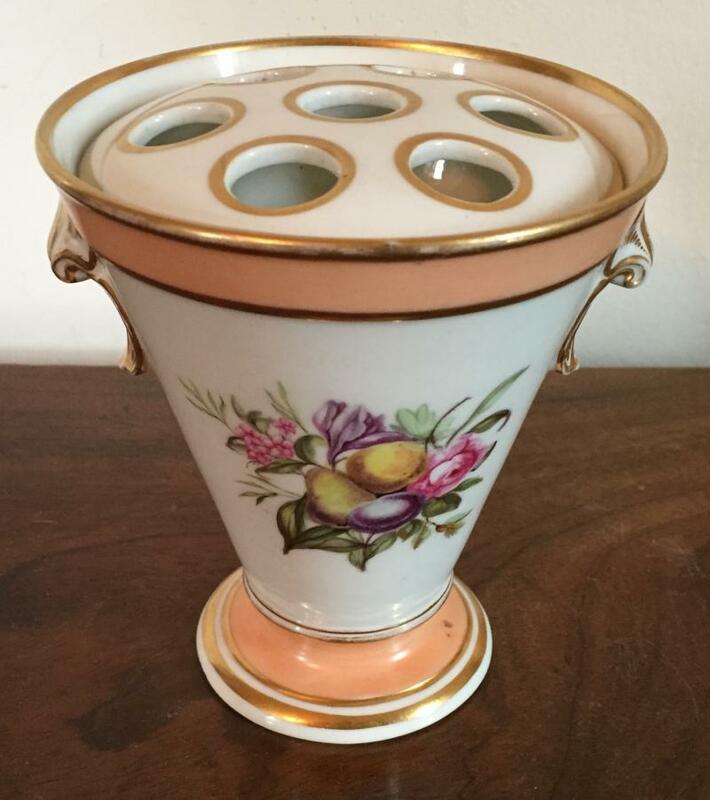 Large 19th c. pearlware trumpet vase with pink luster bands in the Old Paris porcelain taste. 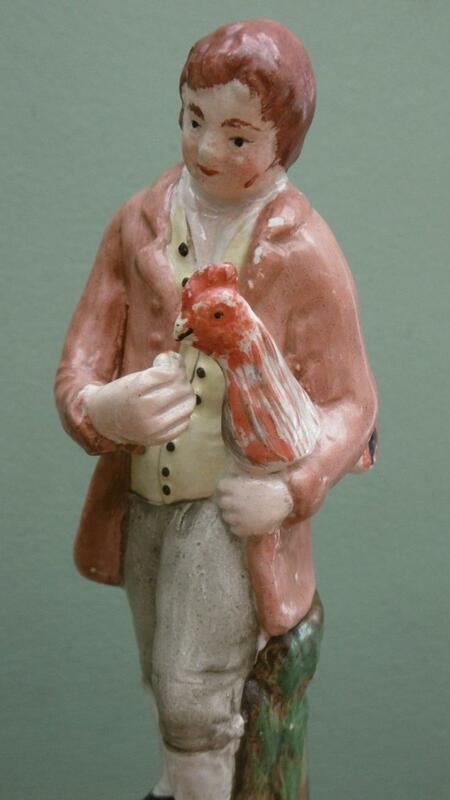 18th c. salt glaze figure of a gardener. 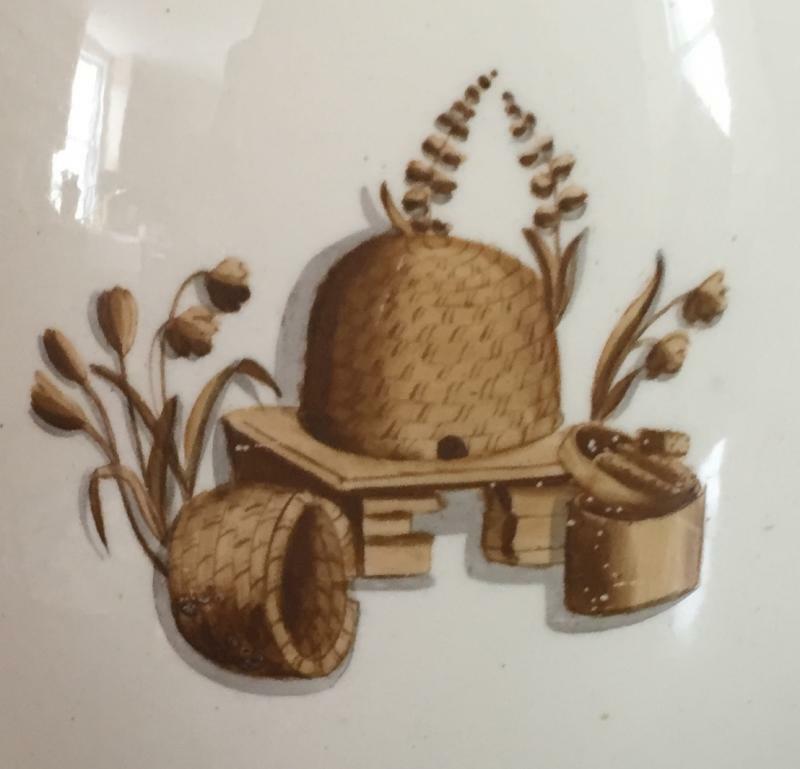 Coalport porcelain root pot in the Church Gresley pattern c. 1805. 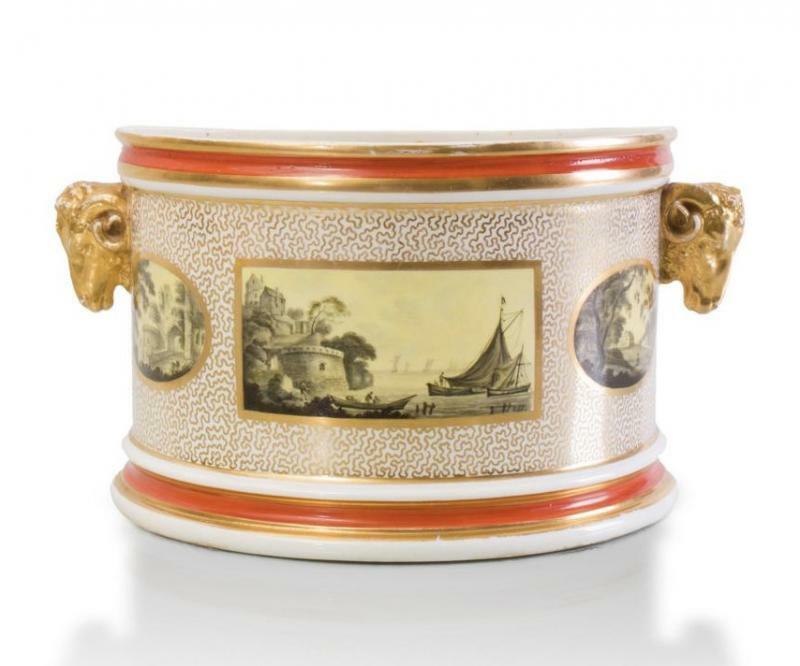 Early 19th century Derby porcelain bough pot decorated with nautical landscape scenes. 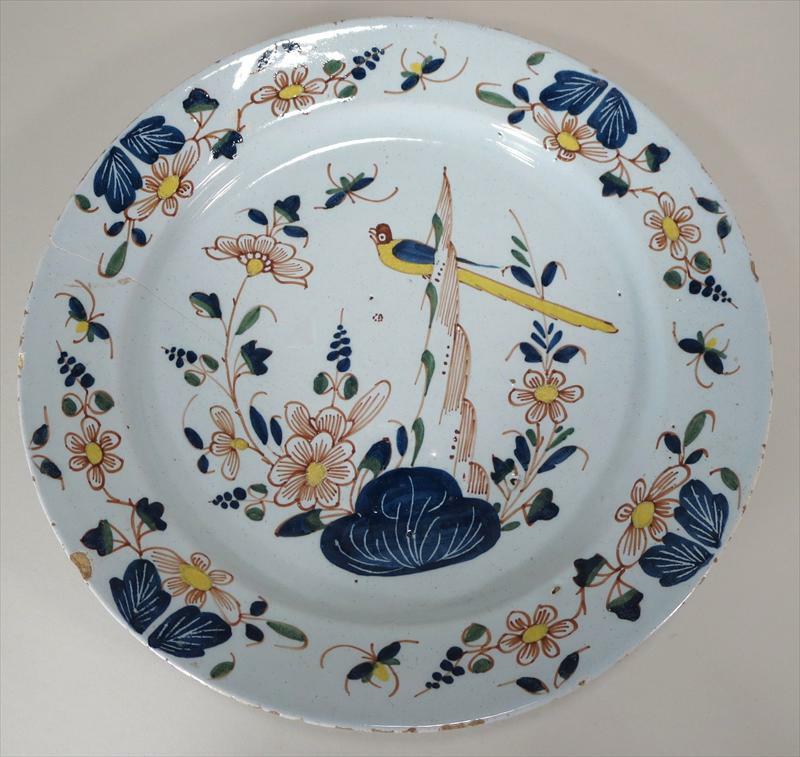 18th century Bristol Delft manganese and polychrome plate decorated in the Chinese taste. 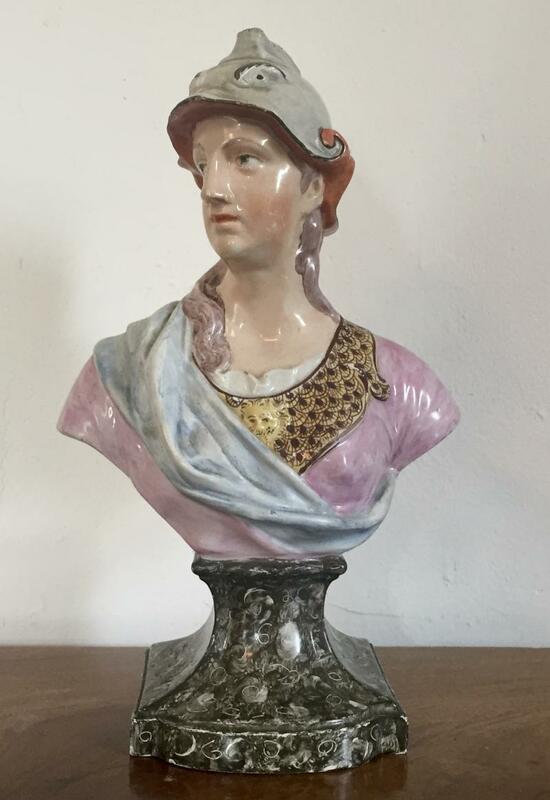 Large Staffordshire pearlware portrait bust of Minerva with faux marble plinth, circa 1810. 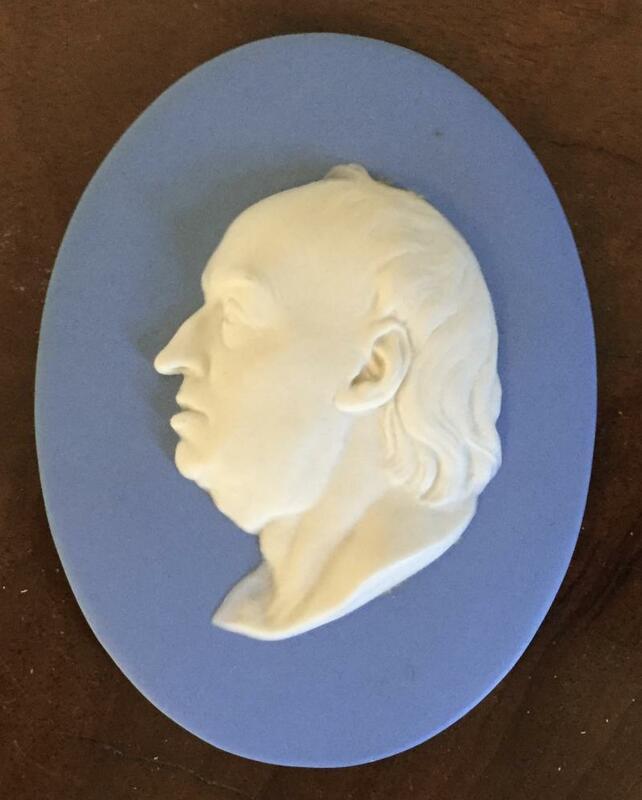 18th century Wedgwood jasperware portrait medallion plaques of Benjamin Franklin, Dr. Samuel Johnson, James Stuart and Carl Linnaeus. 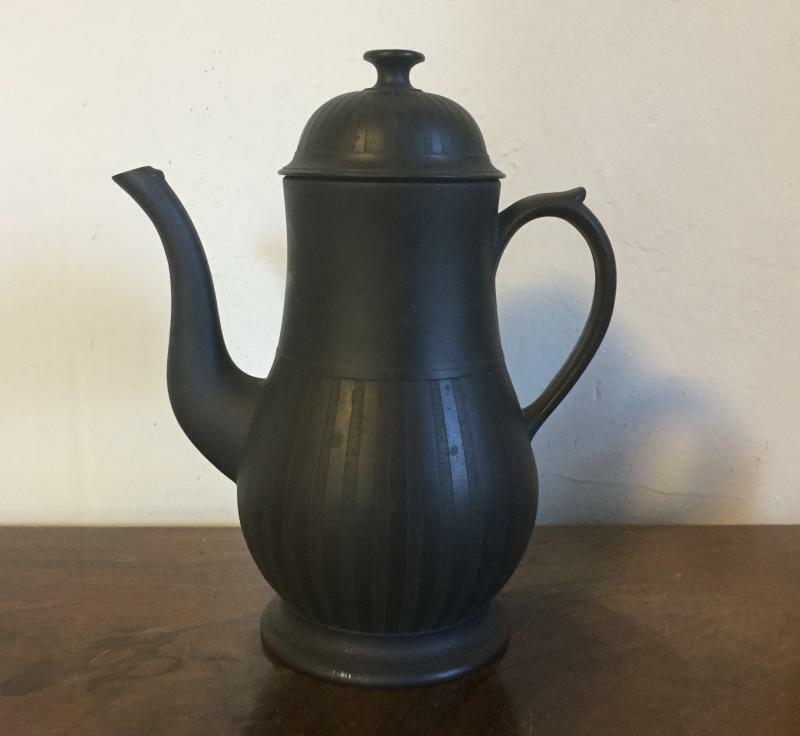 Wedgwood black basalt coffee pot. 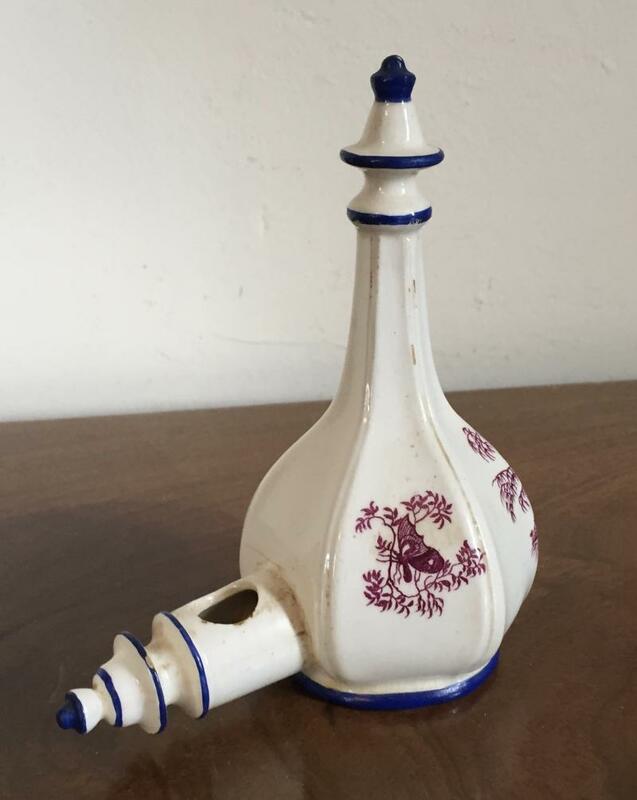 18th century pearlware sucrier and cover. 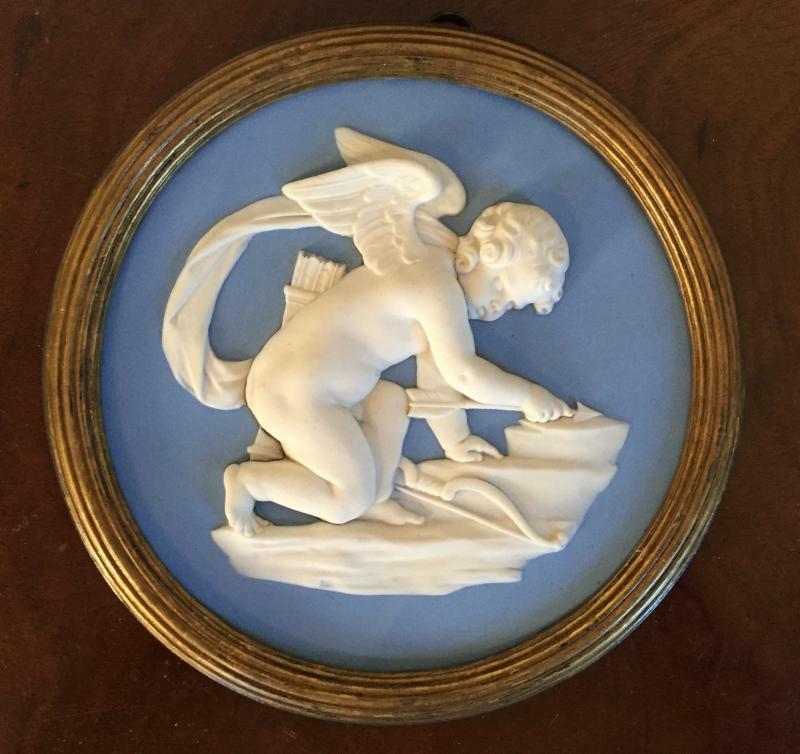 18th century Bow blanc de chine porcelain saucer dish decorated with relief molded garlands and cherubs. 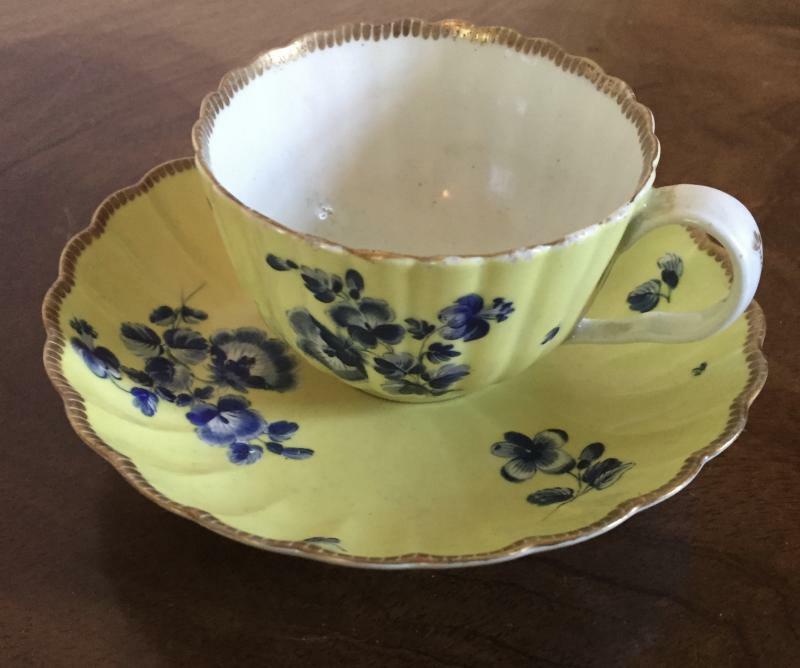 Rare 18th century Worcester porcelain tea cup & saucer with yellow ground c. 1760. 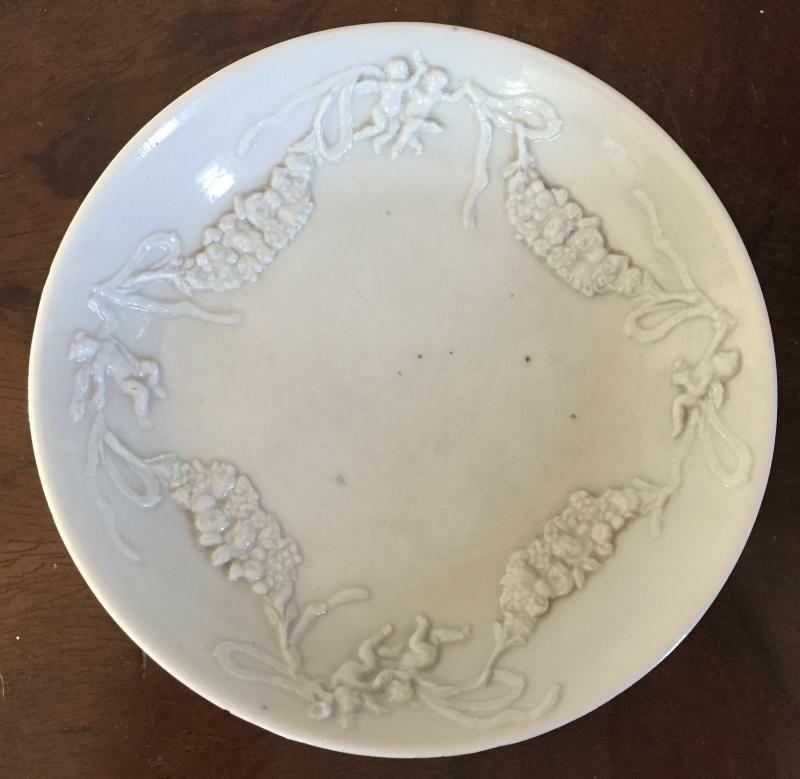 Large Spode creamware charger platter 16.75" diameter, circa 1810 - 1820. Wedgwood Rosso Antico wine bottle cooler in the Egyptian taste. 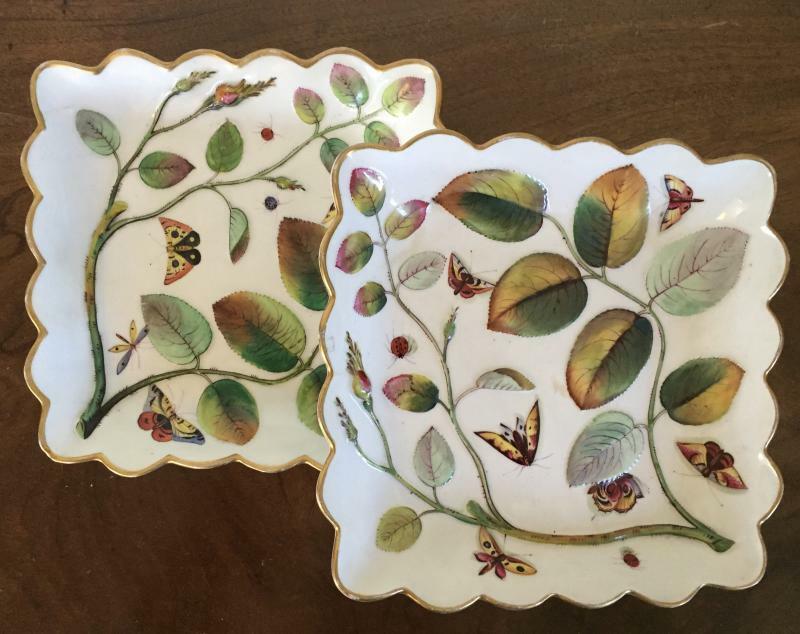 Pair 19th century Chamberlains Worcester porcelain blind earl square dessert dishes decorated with insects and butterflies. 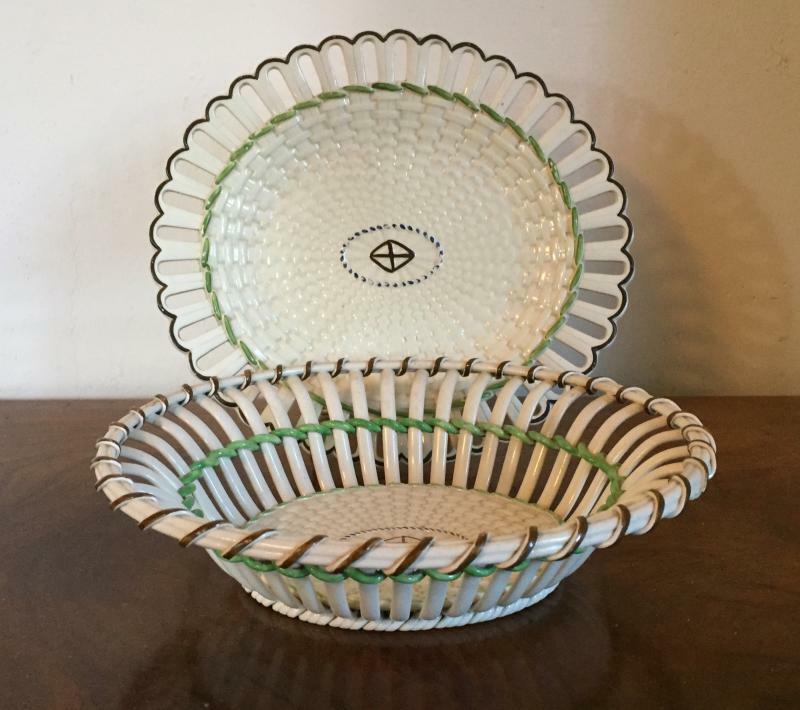 Pair 18th century Spode neoclassical creamware quatrefoil shape dishes with green band. 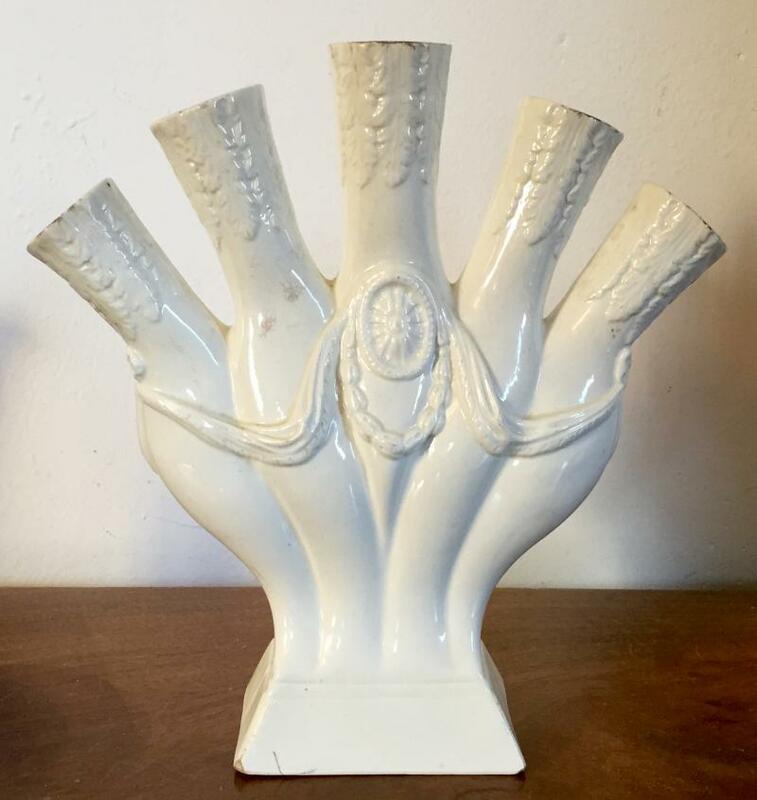 18th century English George III creamware five finger posy holder with relief molded paterae and garland swags. 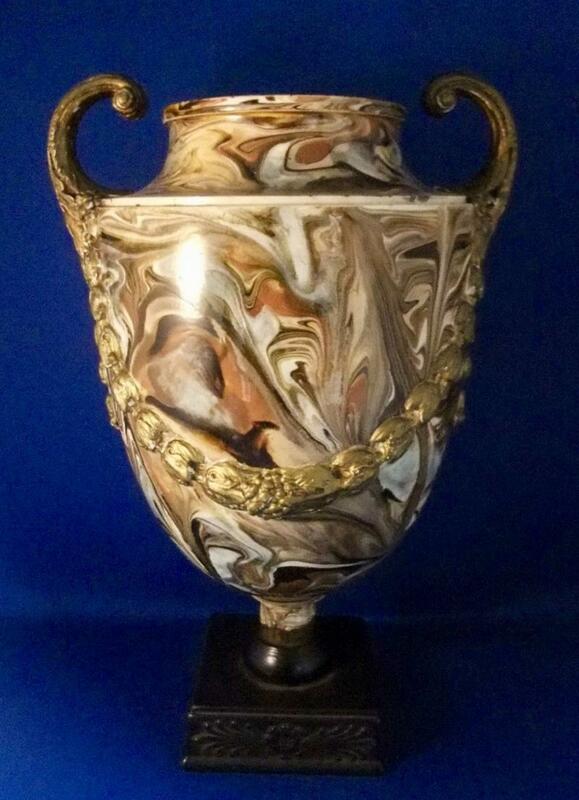 Wedgwood agate urn on a basalt base c. 1780. 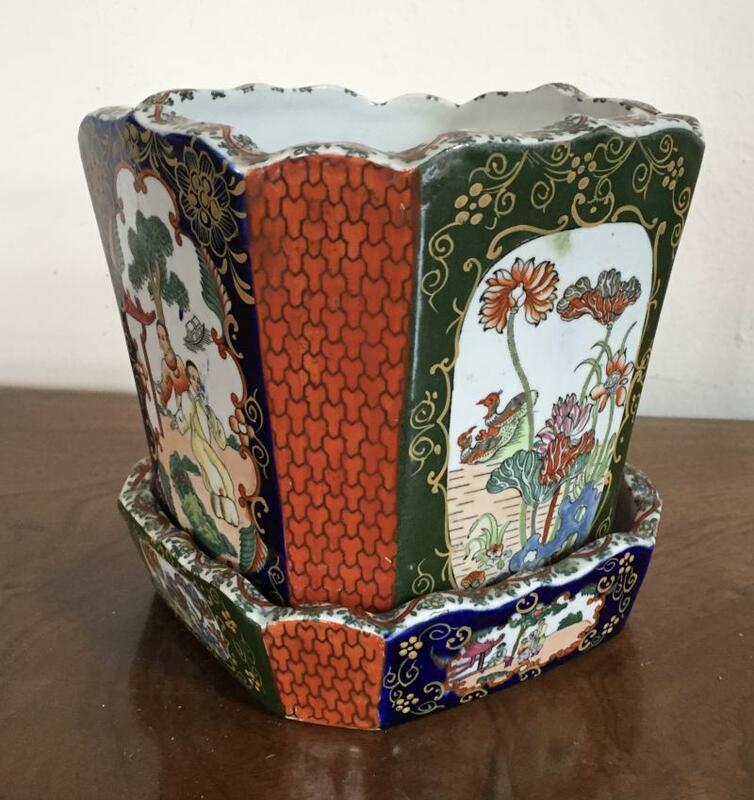 19th century Mason's ironstone flower pot and under tray in the Chinese taste. 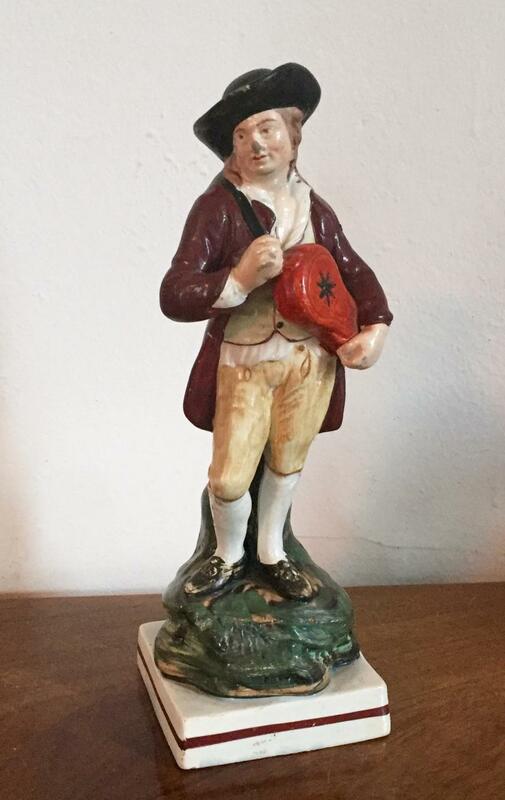 18th century Derby porcelain Continents figure. 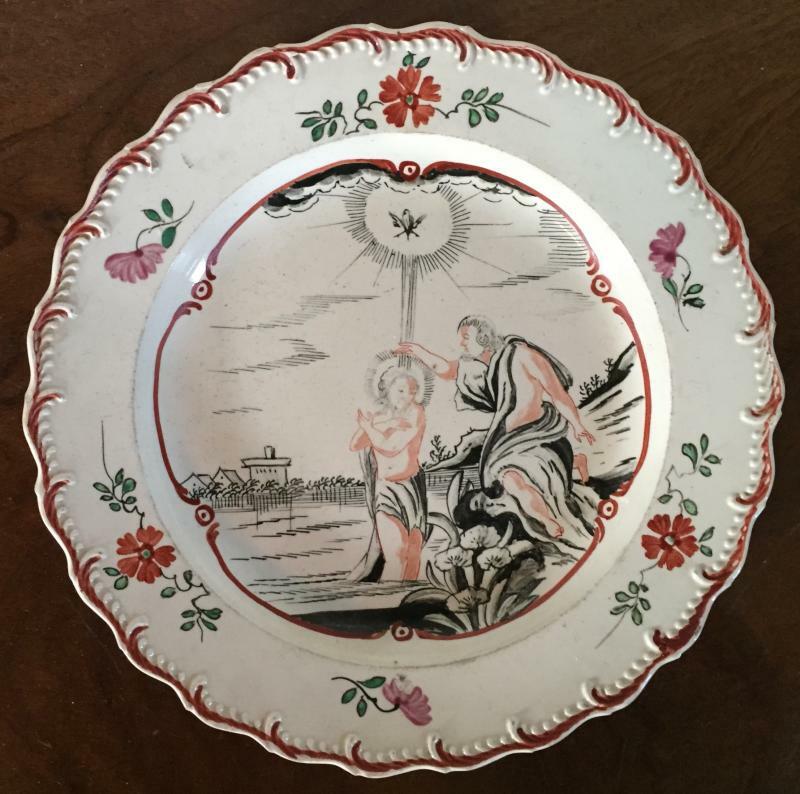 Two similar 18th century Leeds creamware plates depicting the baptism of Christ 1780 - 1790. 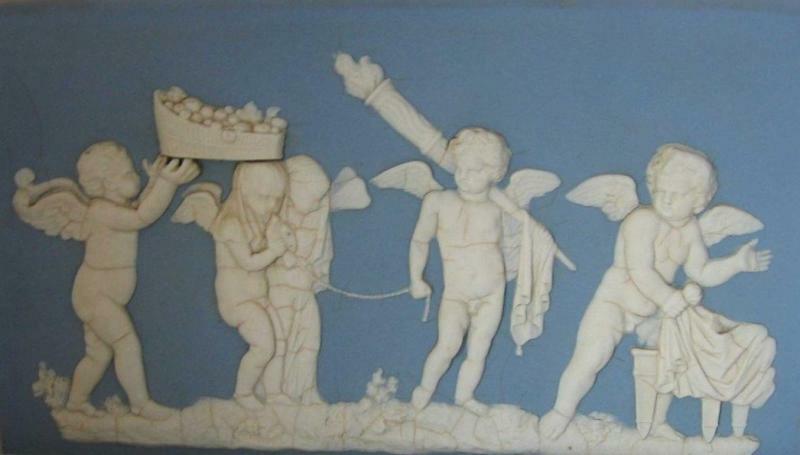 Early Wedgwood jasperware plaque depicting Cupid in high relief. Original Regency frame. Selection 18th century creamware including a leaf shape pickle dish; egg strainer, salt and marked Leeds tea pot stand. 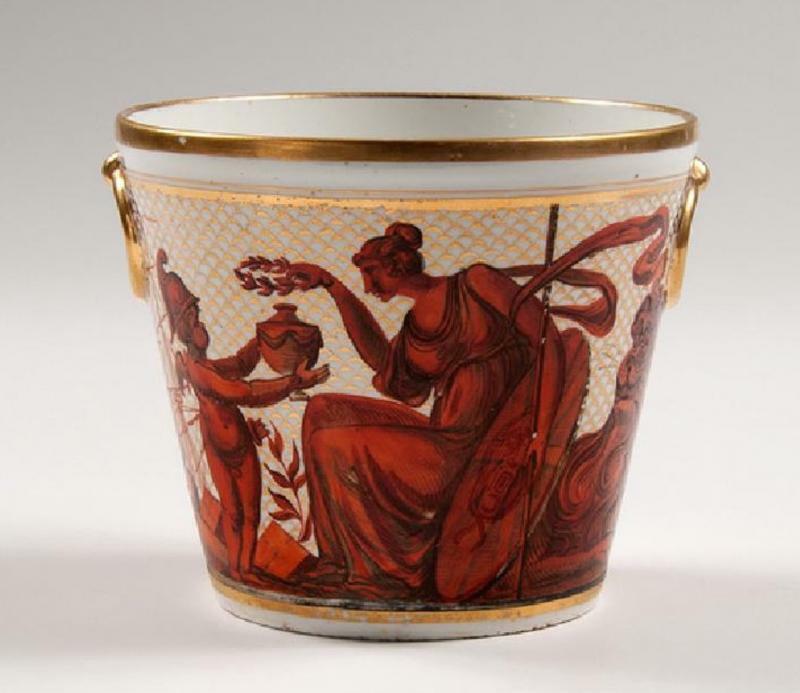 Early 19th century Coalport porcelain neoclassical cachepot planter or root pot decorated with neoclassical figures and drapery in bright orange red enhanced by gilding c. 1805. Creamware plates decorated with named botanical specimens and a silver luster border. 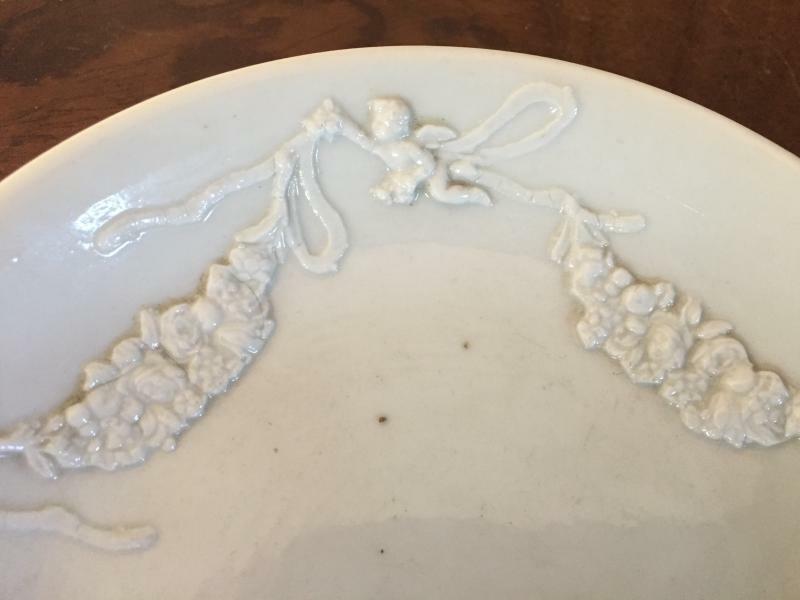 Early Davenport creamware leaf shape dishes with impressed anchor mark. 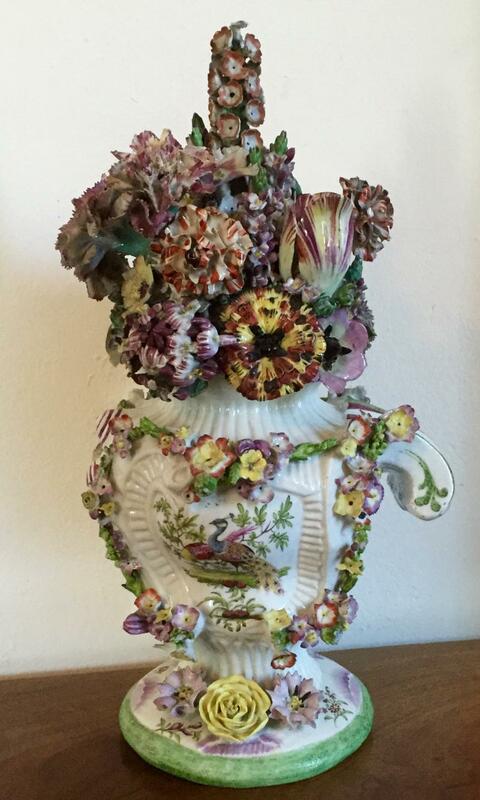 Early 19th century Worcester Barr Flight Barr porcelain vase decorated with floral sprig. 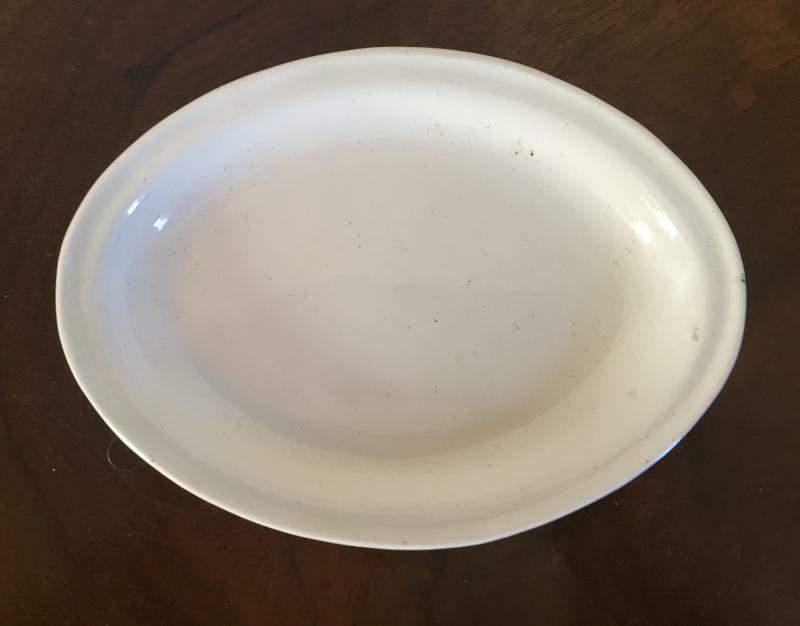 Early Wedgwood creamware plates and entree dish. 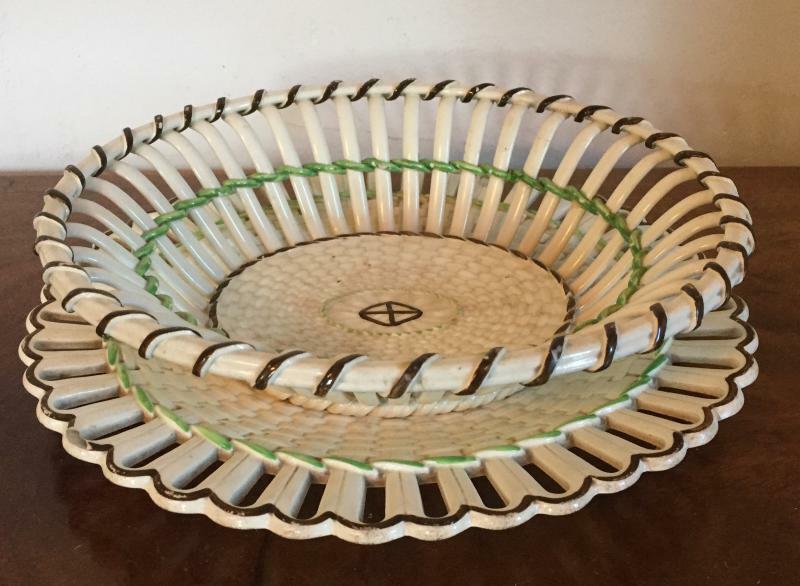 Two 19th c. Wedgwood creamware chestnut baskets & stands with green and brown bands. 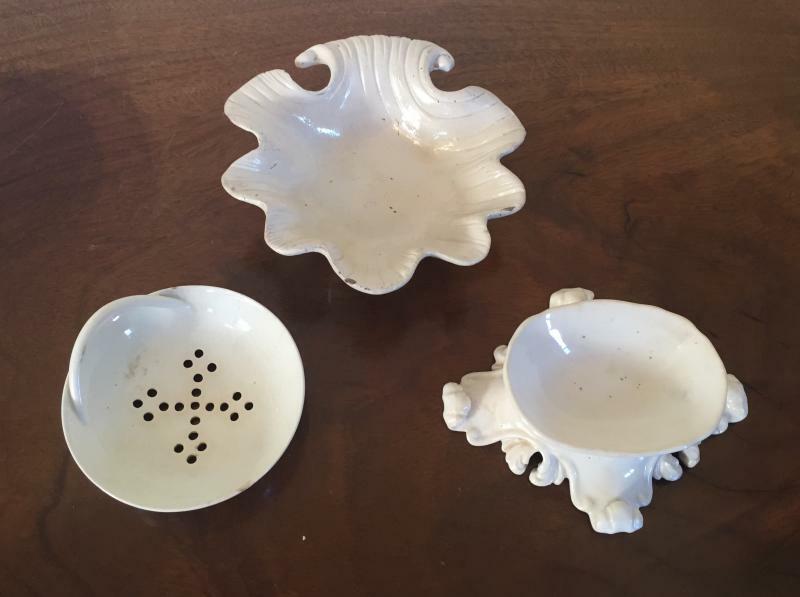 18th century creamware botanical quatrefoil dishes with named specimens. Pair large 18th century creamware botanical soup plates with named specimens. 18th century Whieldon type creamware vase with brown tortoise glaze - Chinese shape. 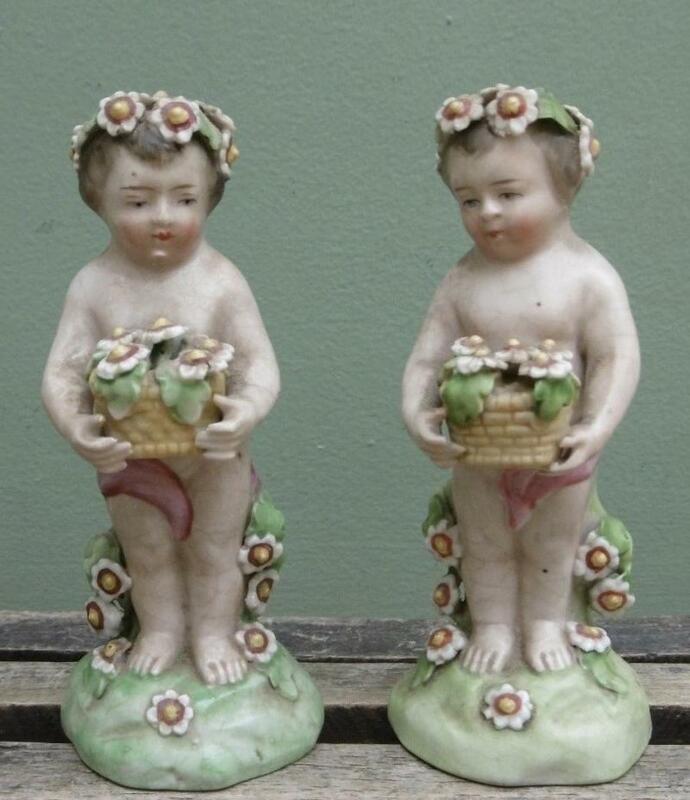 Two pairs of Chelsea Derby porcelain cherubs or chldren holding flower baskets - 18th century. 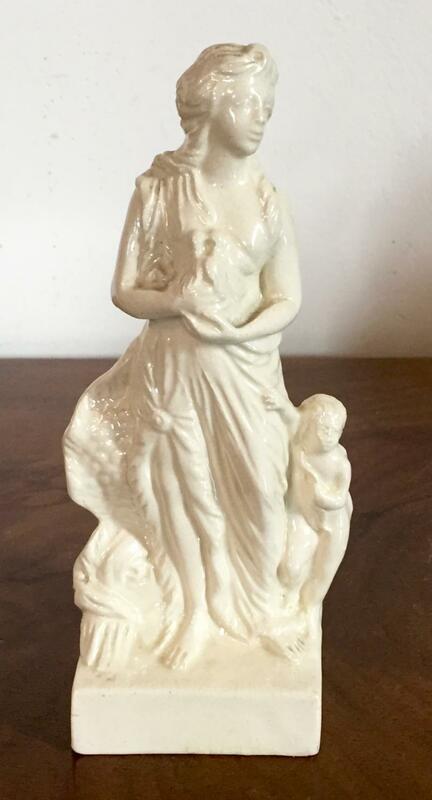 18th century Leeds Pottery figure of Venus and Cupid with impressed mark 1790 - 1800. 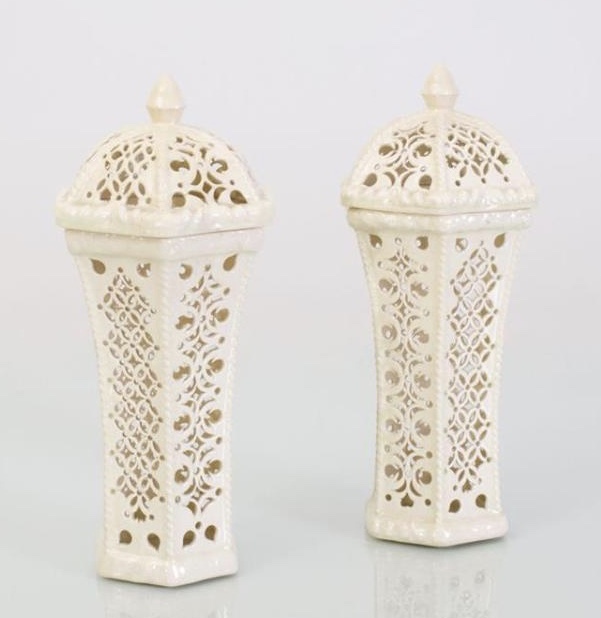 Pair early 19th c. English creamware urns or vases with pierced flower frog covers. 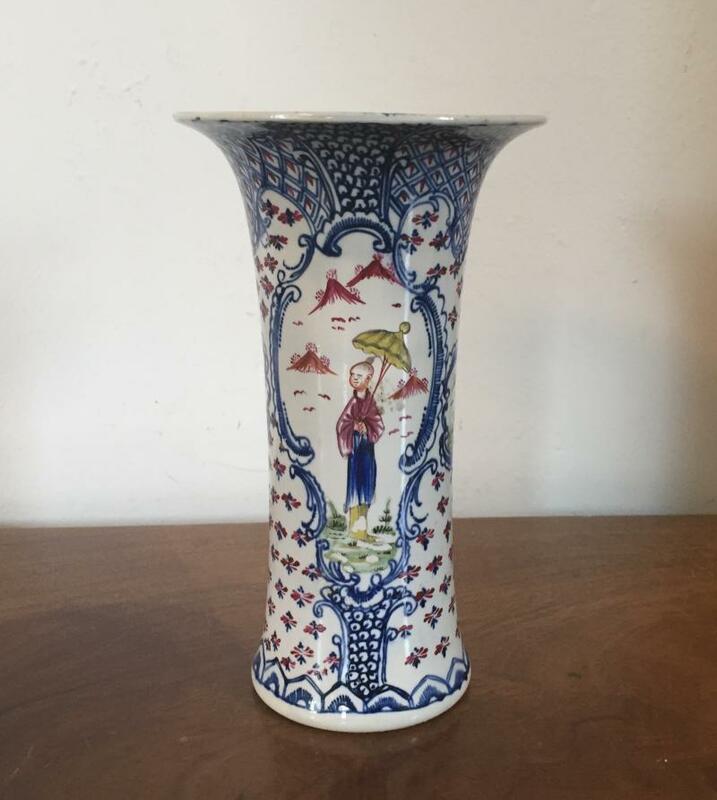 18th century pearlware trumpet garniture vase in the Chinese taste. Trio of graduated Mason's ironstone imari pitchers with lion mask serpent handles. 18th c. Leeds jug in the Chinese taste. 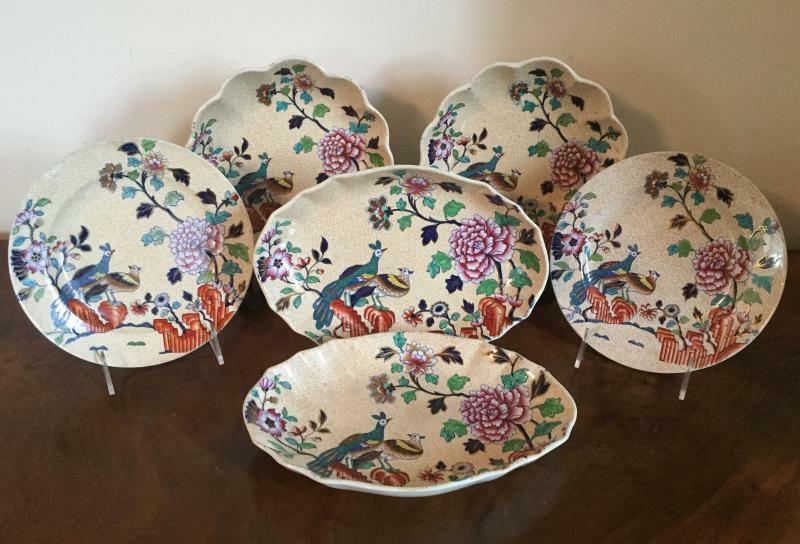 Early 19th century Spode Chinese peacock & peony dessert dishes. 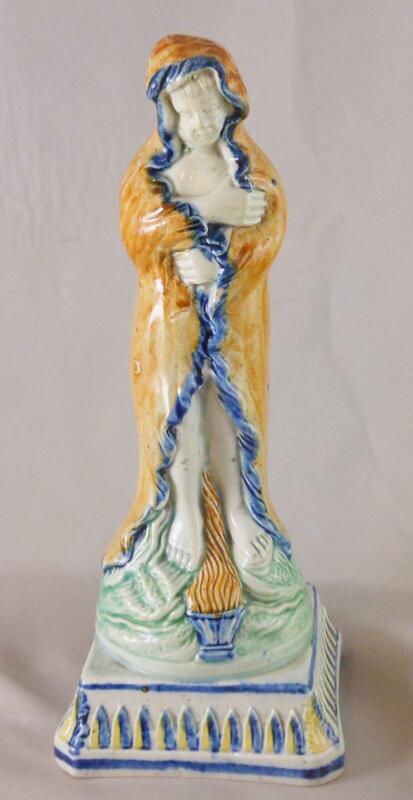 18th century Ralph Wood mochaware pearlware obelisk 1780 - 1790. 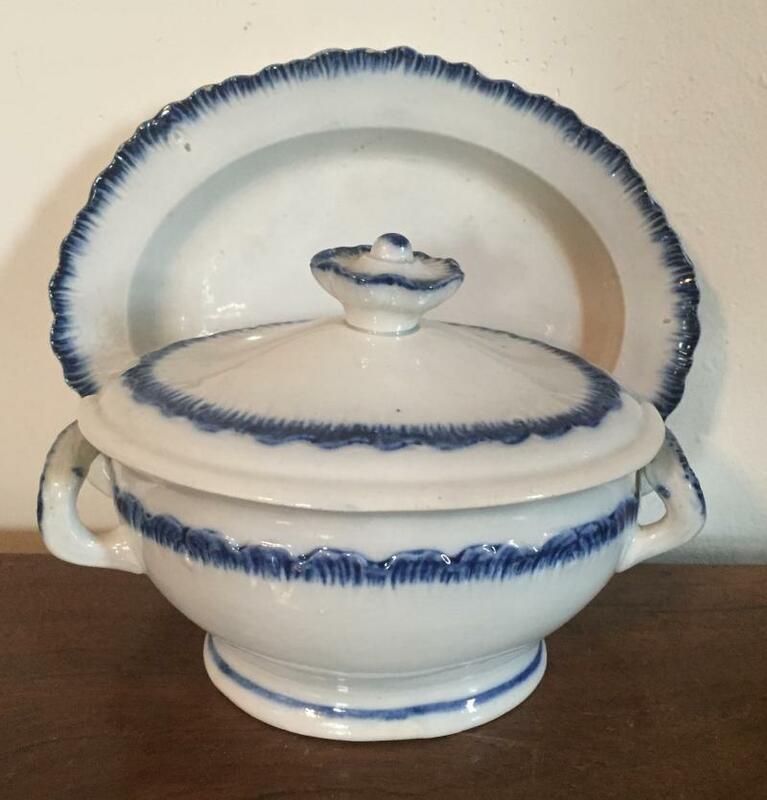 Early 19th century blue feather edge creamware sauce tureen and platter. 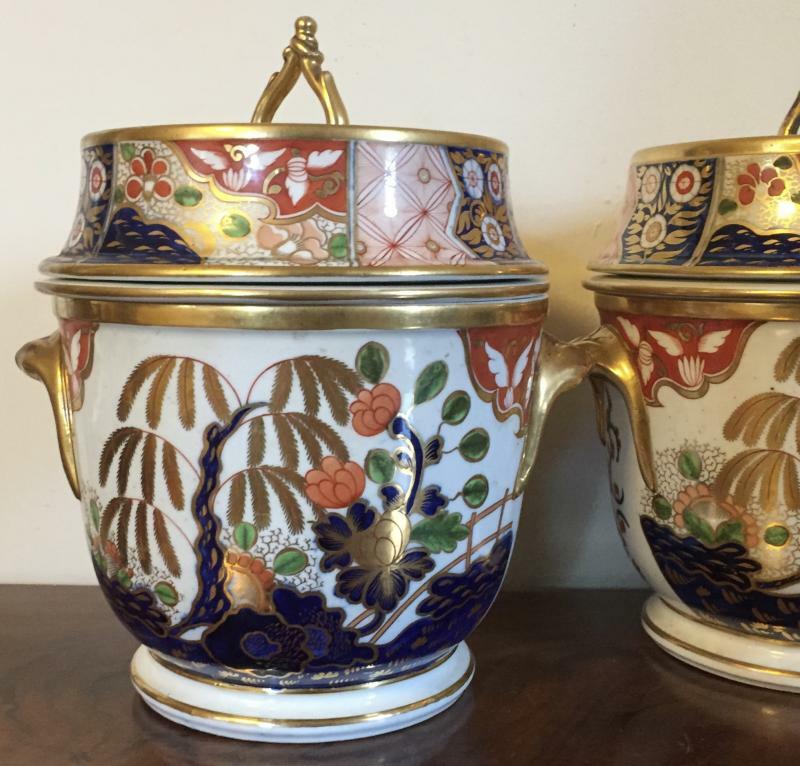 Two large Worcester porcelain bough pots. 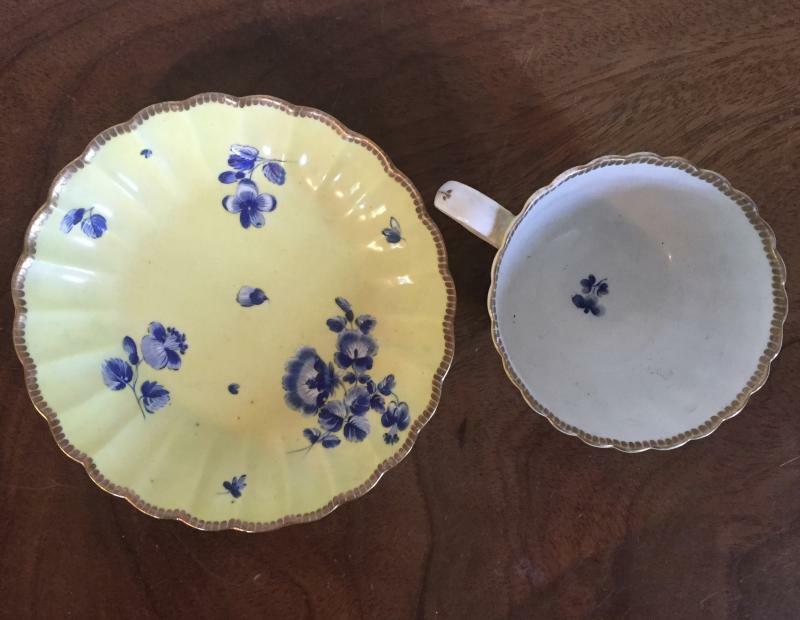 The first decorated with an urn and cornucopia on a rich faux bois ground; the second with neoclassical geomentric scheme..
Trio early Derby porcelain low bowls decorated in the Dr. Wall Worcester Old Japan Fan pattern - early 19th century 1810. 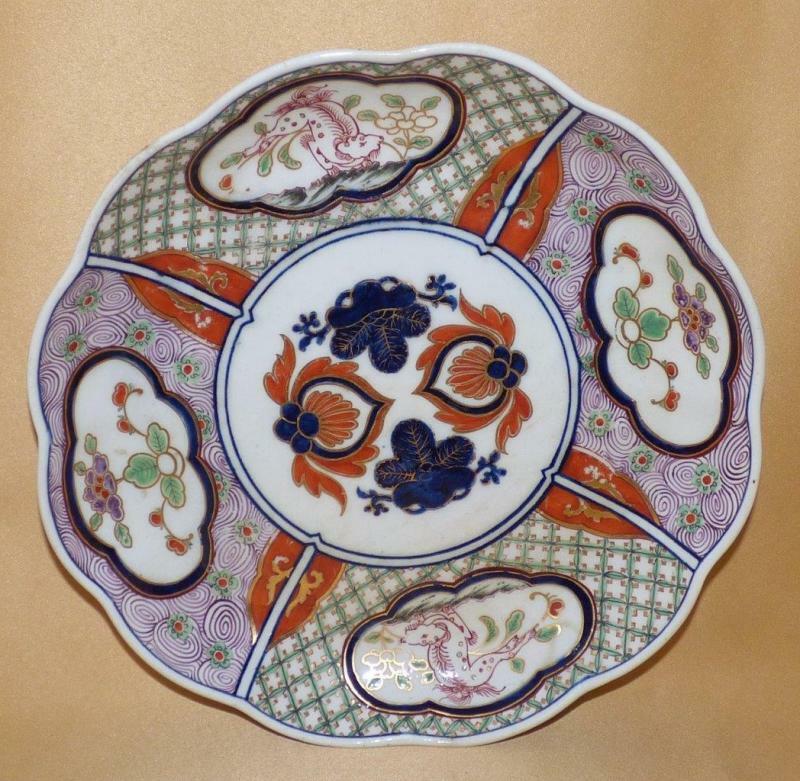 18th c. Derby porcelain imari dish in the Kakiemon or Kylin pattern. Large Coalport root pot & stand decorated with fruit & flowers c. 1810. 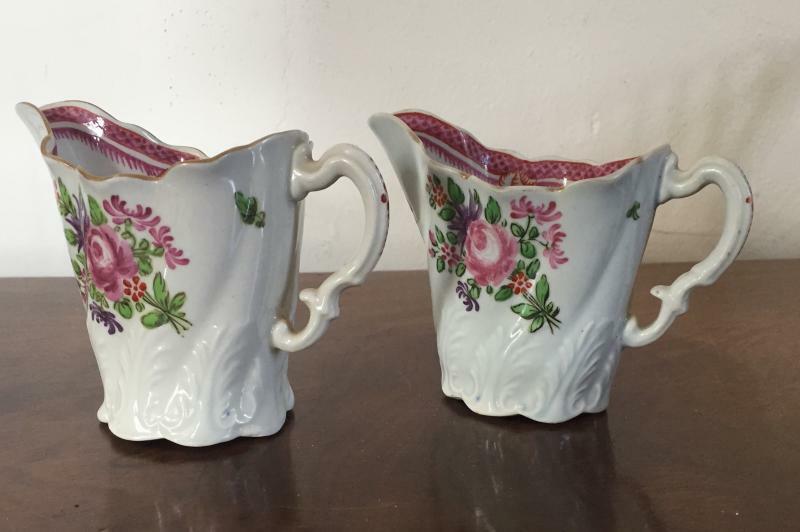 Pair 18th century First Peirod Worcester porcelain "Tall Chelsea Ewer" cream jugs c. 1760 - 1765. 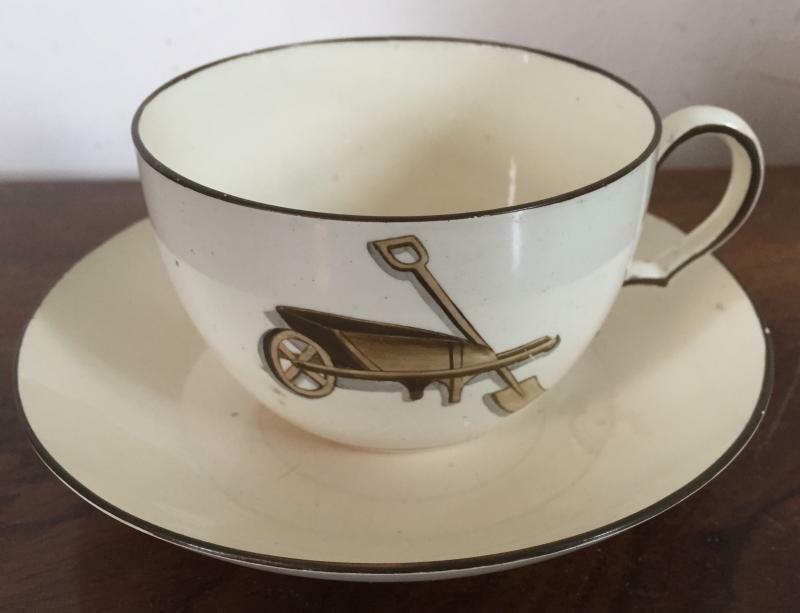 Early 19th century Wedgwood creamware agricultural devices coffee pot, cups and saucers decorated with garden implements and domestic tools c. 1810. 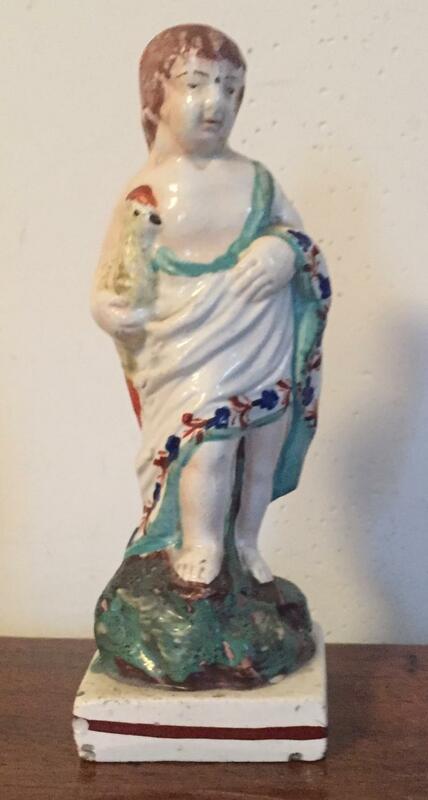 18th century English prattware figure emblematic of summer. 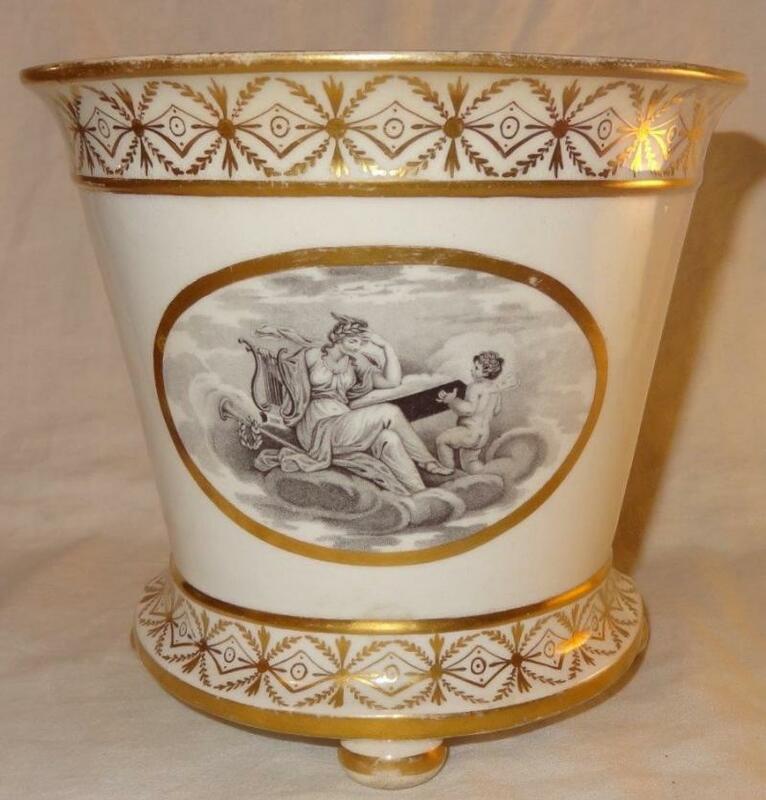 Large antique early 19th century English Regency porcelain bough pot with neoclassical scene enhanced by rich gilding. 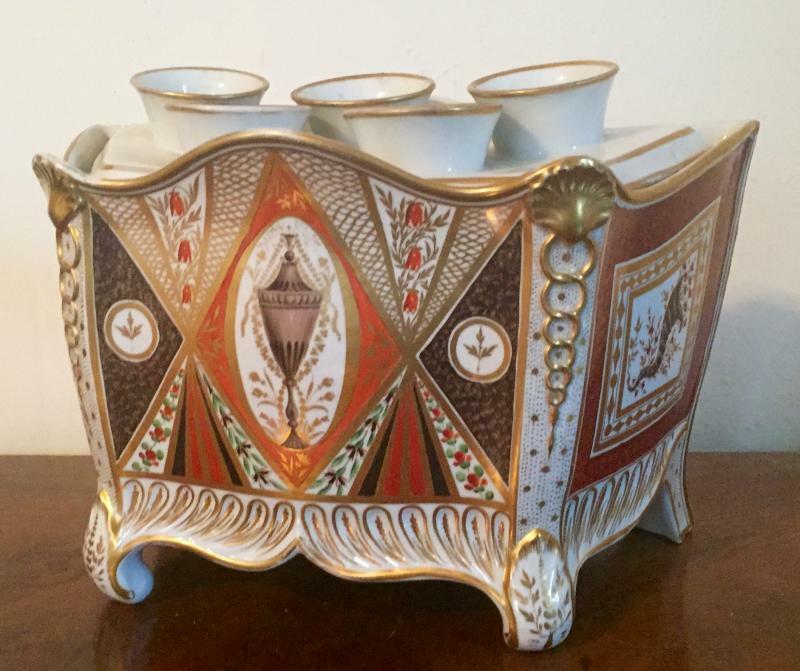 Coalport porcelain toasting stand holding six cut crystal stirrup cups for wine or whiskey tasting - early 19th c.
Large antique early 19th c. Coalport porcelain porter's tankard mug in the imari dollar pattern circa 1810. 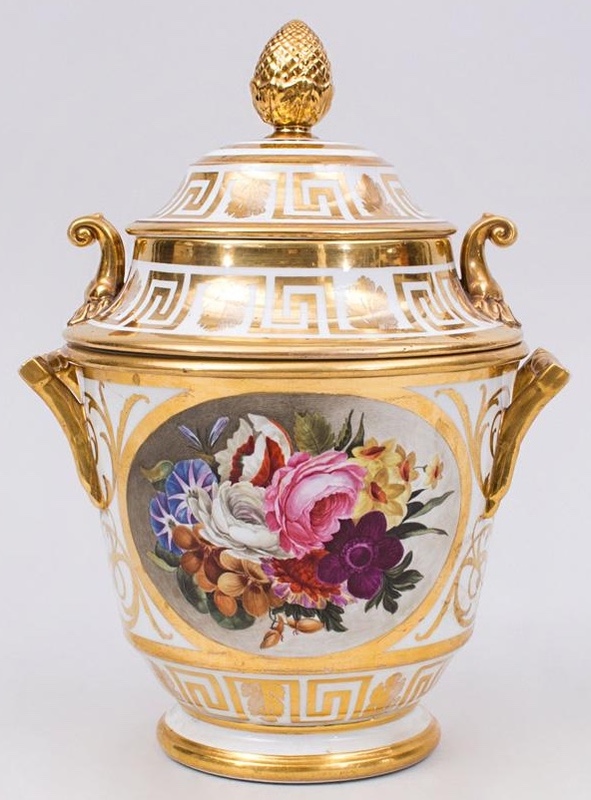 18th c. Derby porcelain bough pot with hand painted fruit & flowers between apricot bands and gilt shell form handles. 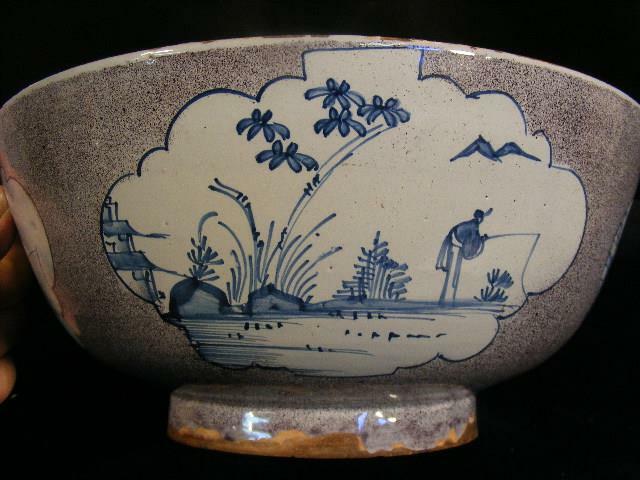 Large English Delft punch bowl in the Chinese Kangxi taste with four reserve panels showing the fisherman in landscape on manganese powder ground c. 1750. 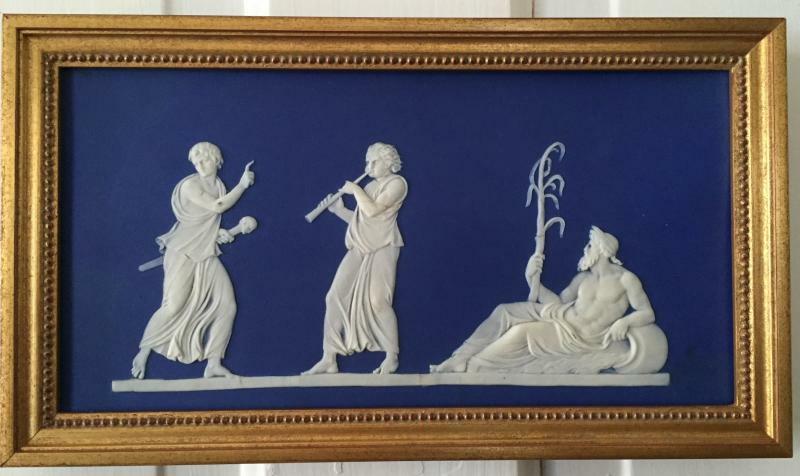 Large 19th century Wedgwood neoclassical jasperware plaque - from Baccanalian Triumph. Provenance - Edward L. Knowles Collection. 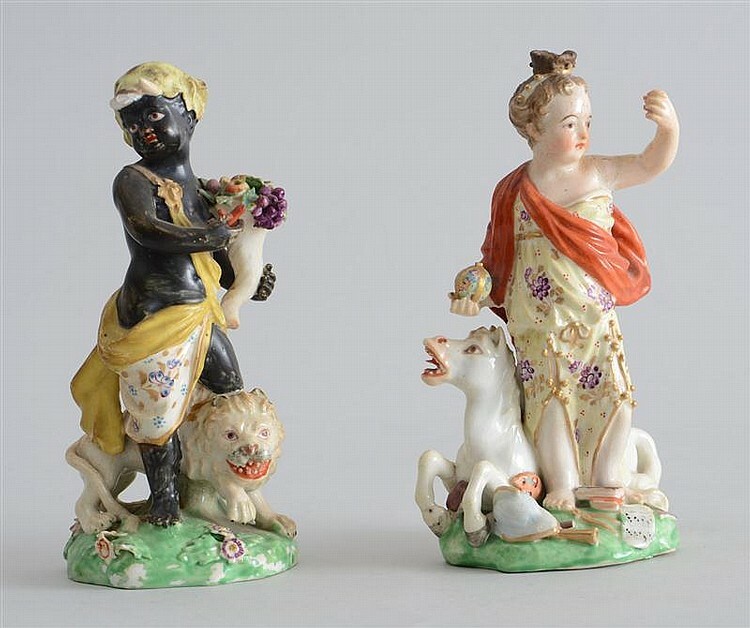 Large Derby porcelain figures representing the four Continents - America, Asia, Europe and Africa. 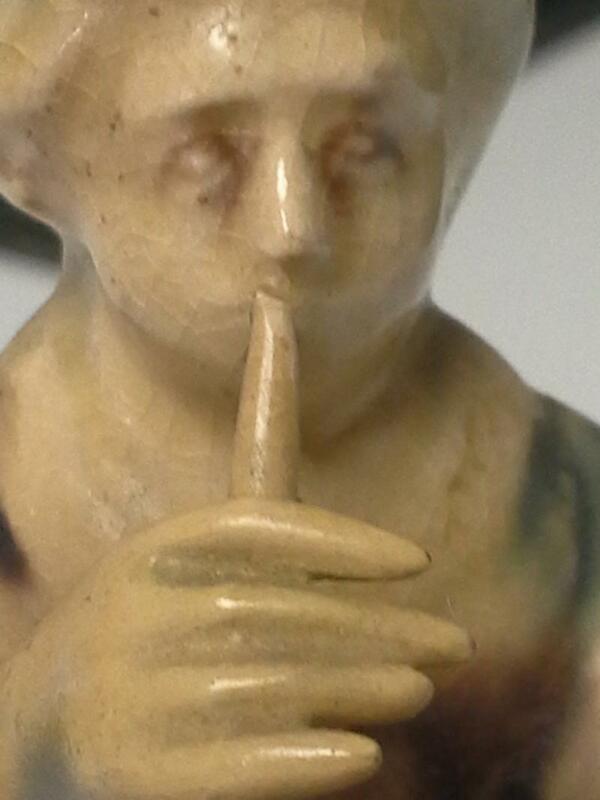 Late 18th century jasperware bough pot mounted on black basalt base in the Wedgwood manner marked Turner. 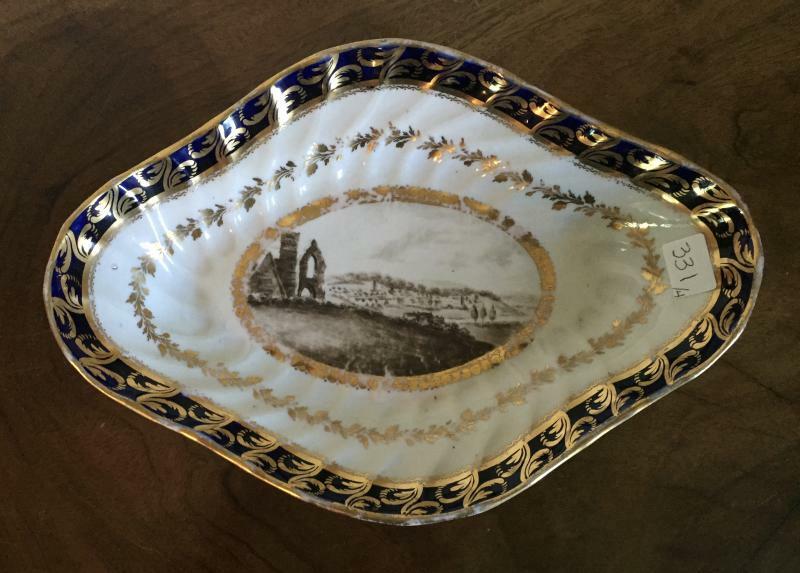 Large Coalport Church Gresley porcelain plate c. 1805. 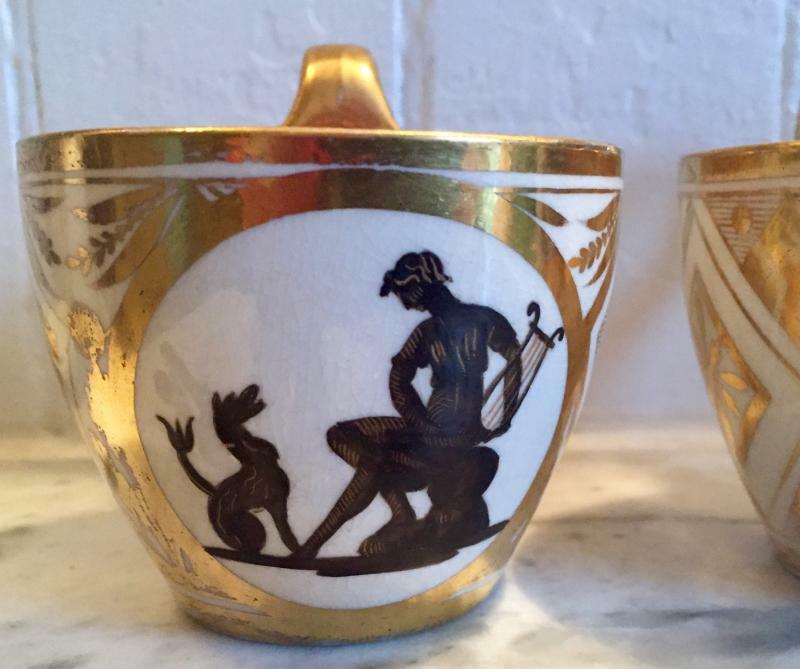 Pair early 19th c. Coalport tea cups decorated with neoclassical silhouettes enhanced by rich gilding 1800 - 1805. Monumental Longton Hall flower encrusted vase & cover c. 1755. Measures 15 1/4" tall. 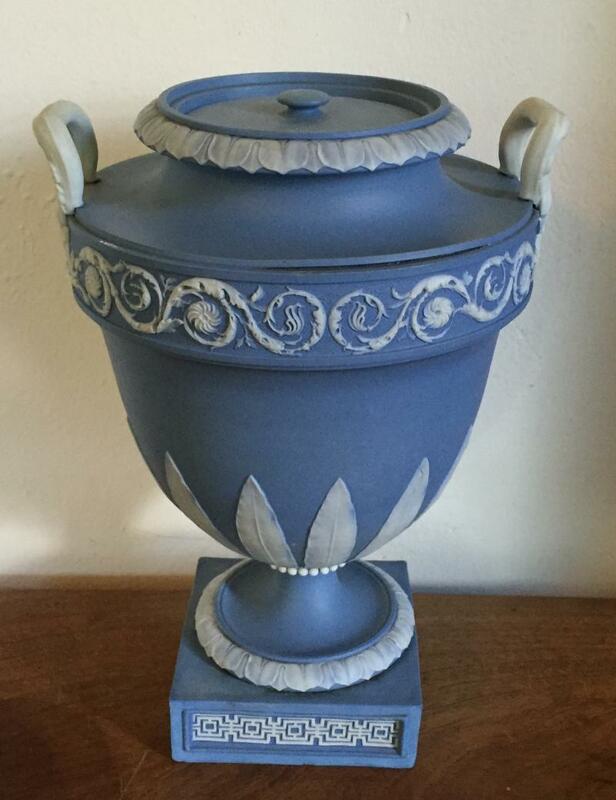 Wedgwood neoclassical solid blue jasperware urn & cover - 18th century. 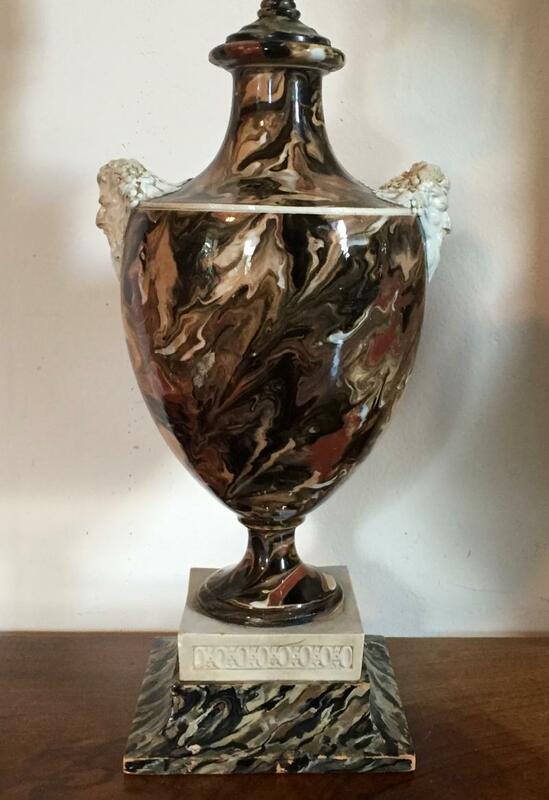 Large Coalport porcelain urn decorated en grisaille with classical figures on original black hard stone plinth - 1800 - 1805. 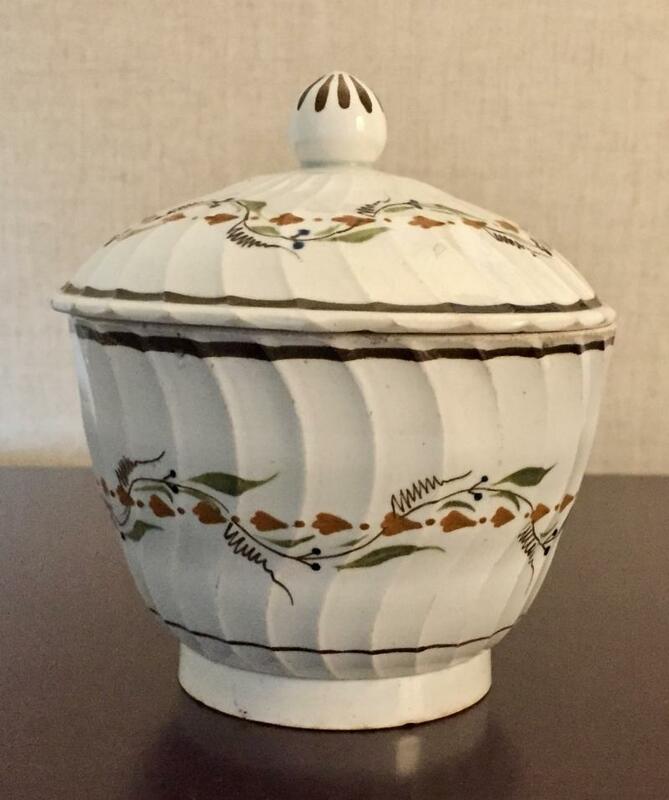 19th c. porcelain bough pot and cover left in the whtie. 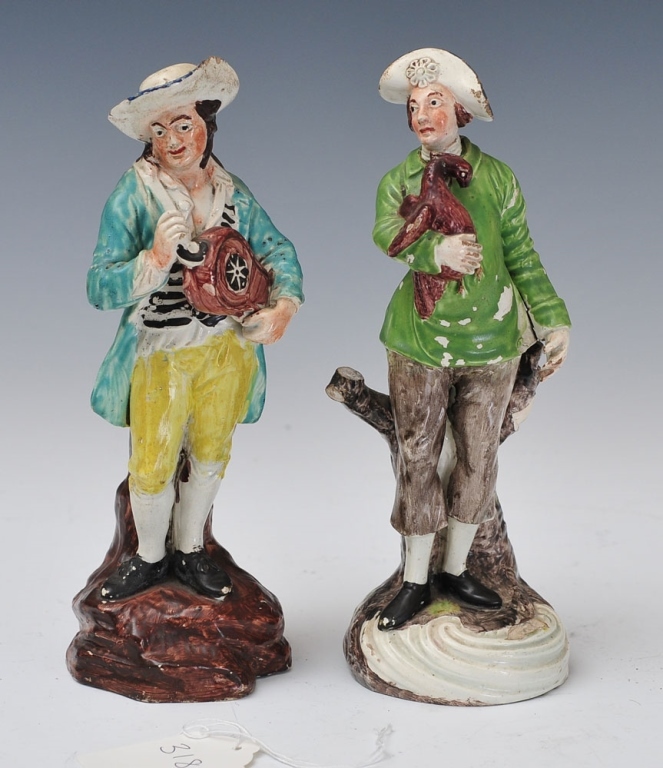 Pair 18th century Derby porcelain figures of a stag and hind at lodge. 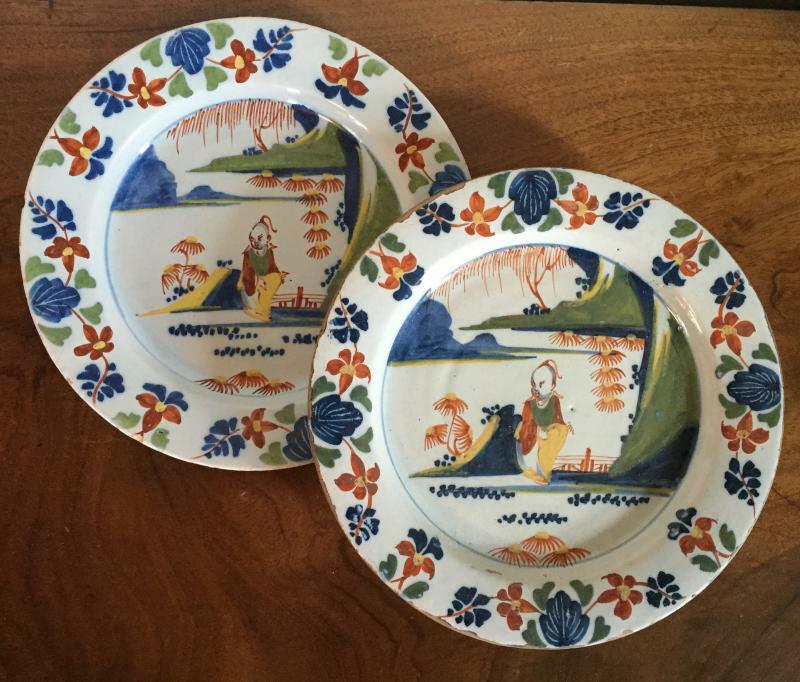 Pair London Delft polychrome plates decorated in the Chinese taste c. 1765. This pattern found at Williamsburg. 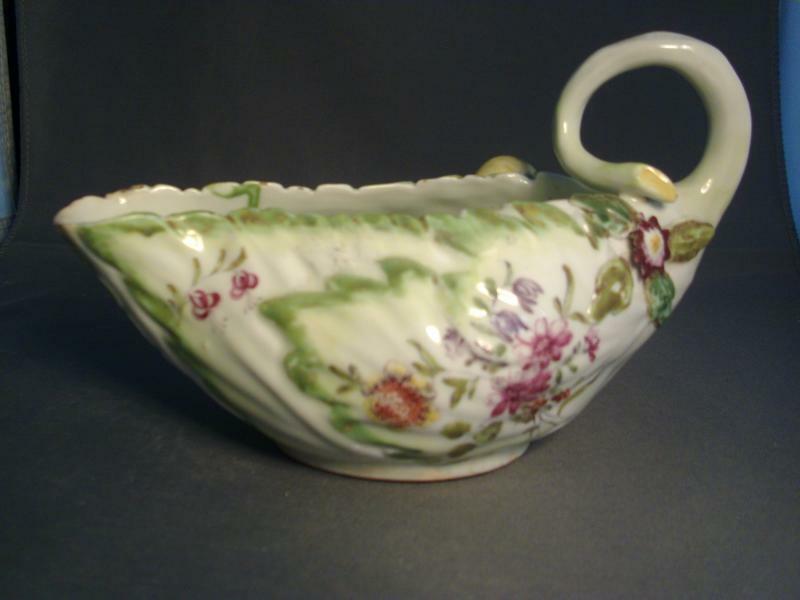 Pair 18th century Derby porcelain lettuce leaf form sauce boats decorated with floral sprigs. 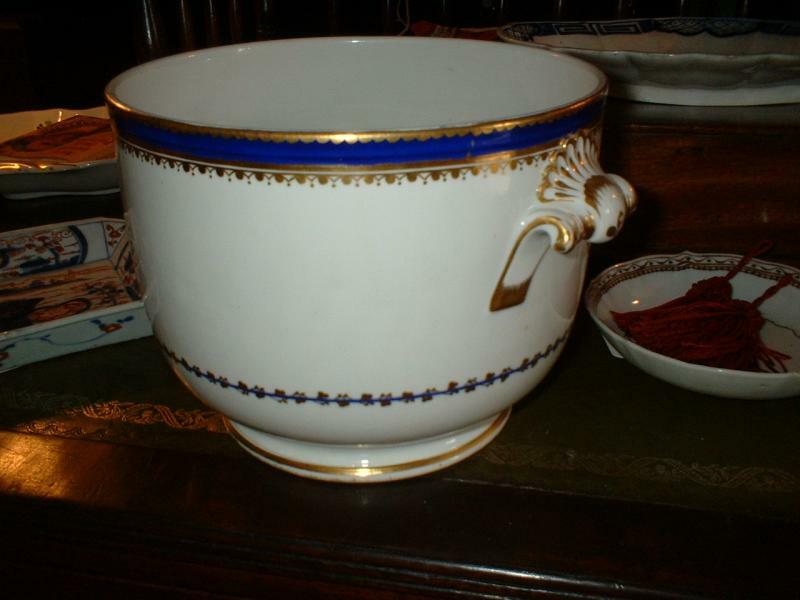 Large Coalport porcelain root pot & stand, London decorated by Thomas Baxter c. 1800 - 1805. Measures 7" tall. 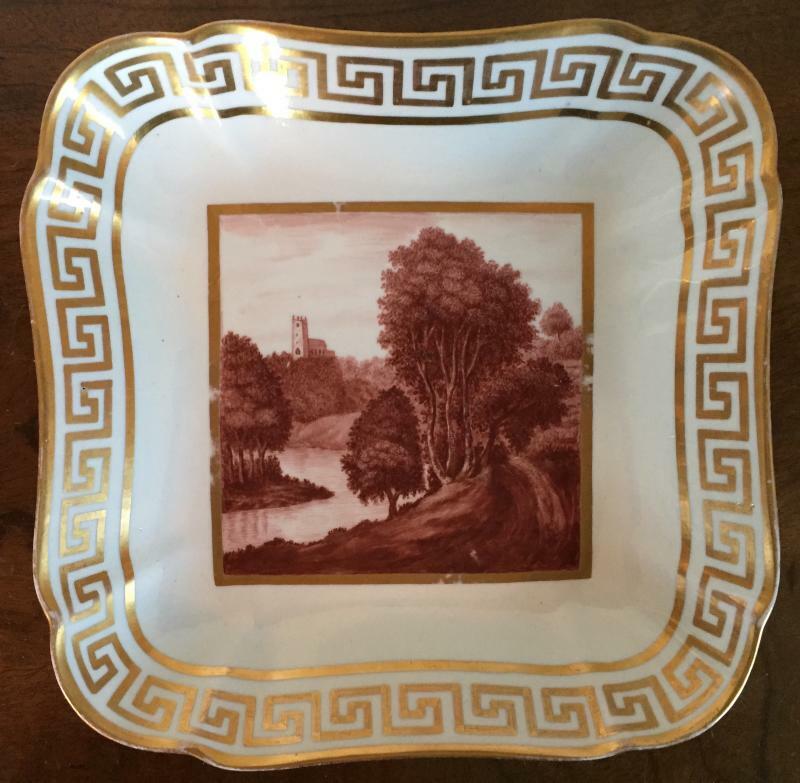 Pair Coalport square dessert dishes hand painted with topographical landscapes in sepia tones with bright gilt Greek key border. Named views. 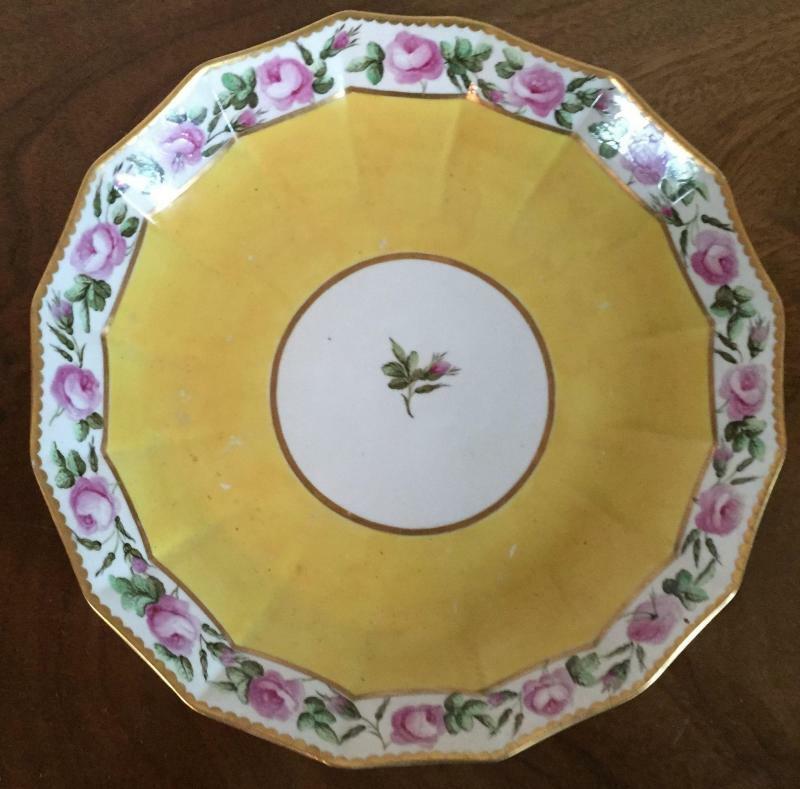 18th c. Derby porcelain cake dish decorated with a band of pink roses on bright yellow ground. 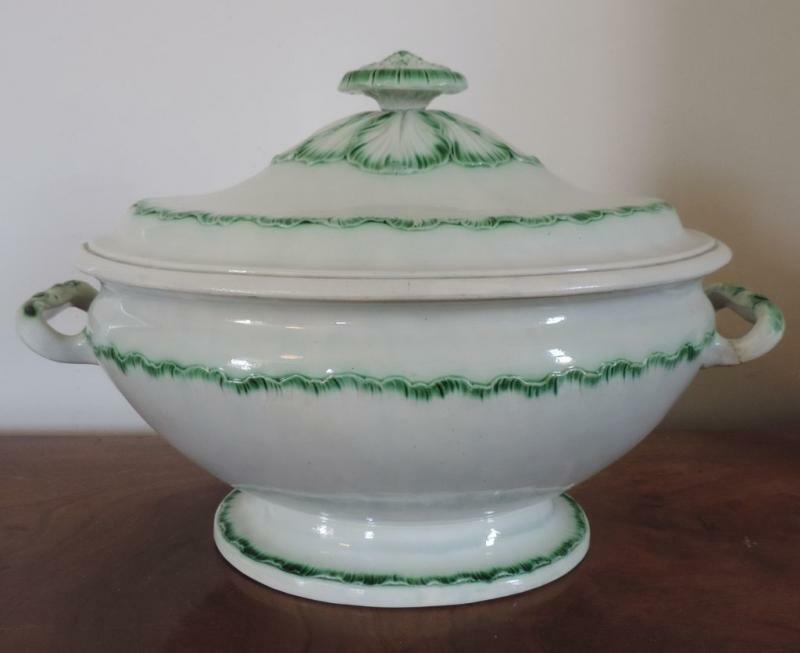 Spode porcelain bough pot with bright green ground c. 1810. Pearlware tulipiere vase in the Adam taste with paterae and swag garlands on yellow ground c. 1800. 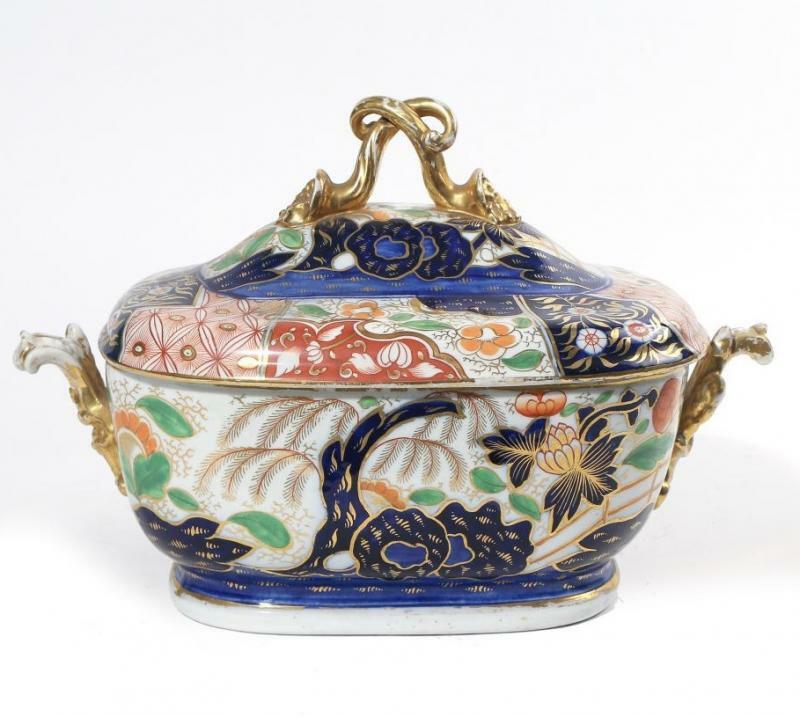 Davenport porcelain bough pot in an imari palette - early 19th century. Pair 18th century creamware cornucopia form wall pockets marked LEEDS POTTERY. 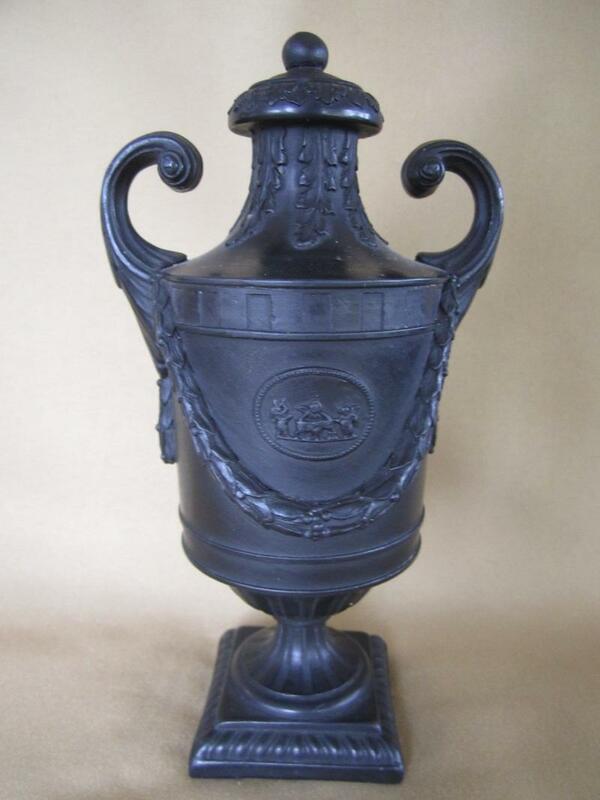 19th century Wedgwood black basalt engine turned urn in the Empire taste. 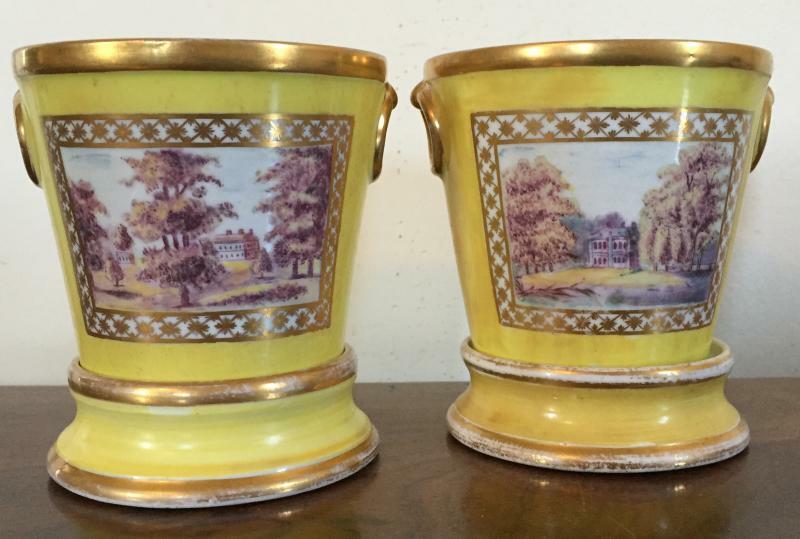 Pair Coalport porcelain root pots with sepia landscapes featuring country houses on bright yellow ground - 1800 - 1805 - William Billingsley at Mansfield. 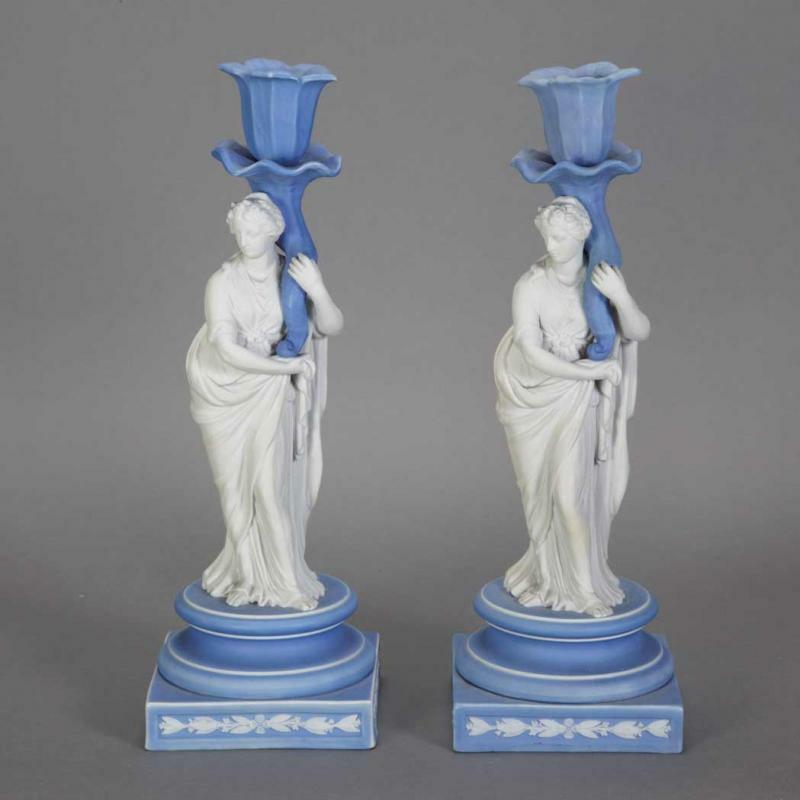 Wedgwood light blue jasperware candlesticks c. 1800 - 1810. 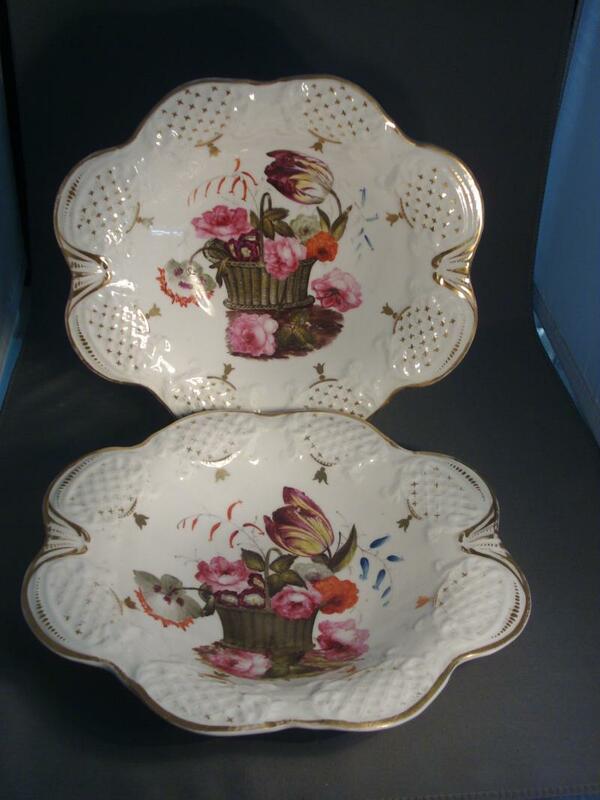 Pair 18th century Chelsea Derby porcelain floral bouquets in white banded tubs. 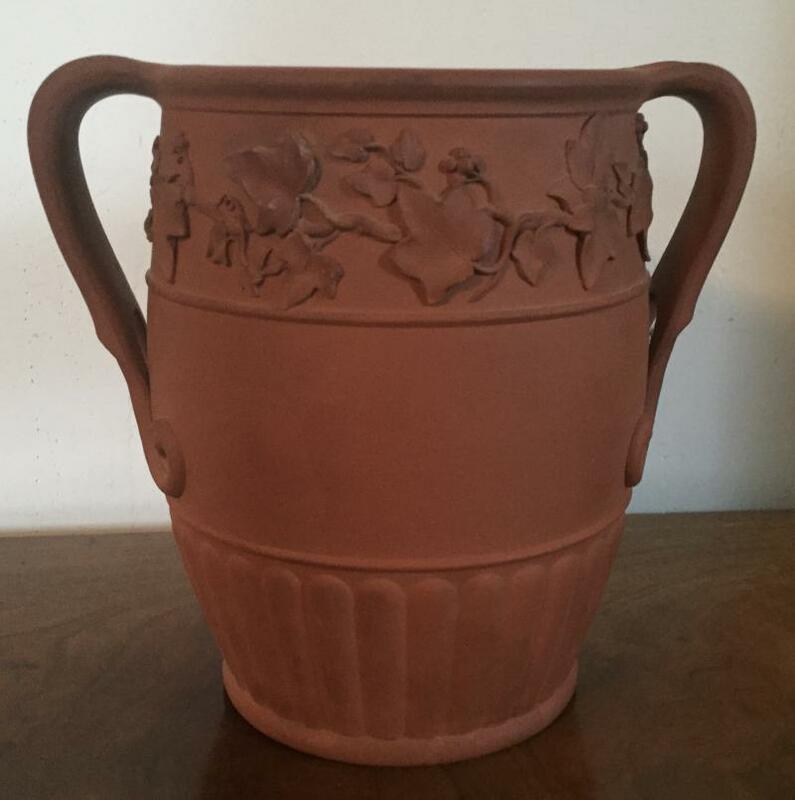 Early 19th century Derby porcelain bough pot decorated with Roman ruins. 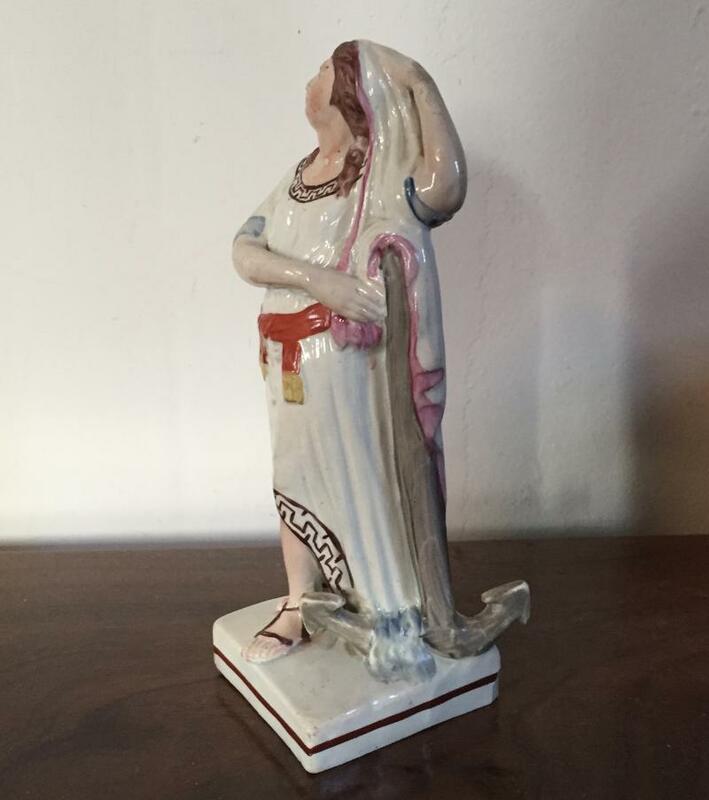 18th century prattware classical figure with polka dot gown. 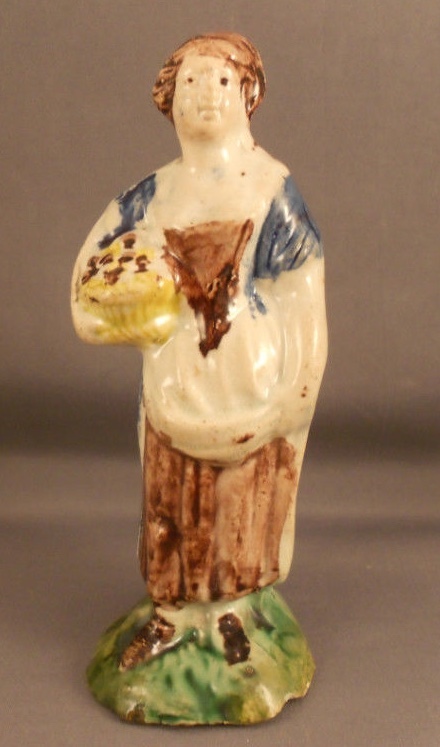 Rare 18th century Whieldon figure of a flute player with mottled tortoise glaze. 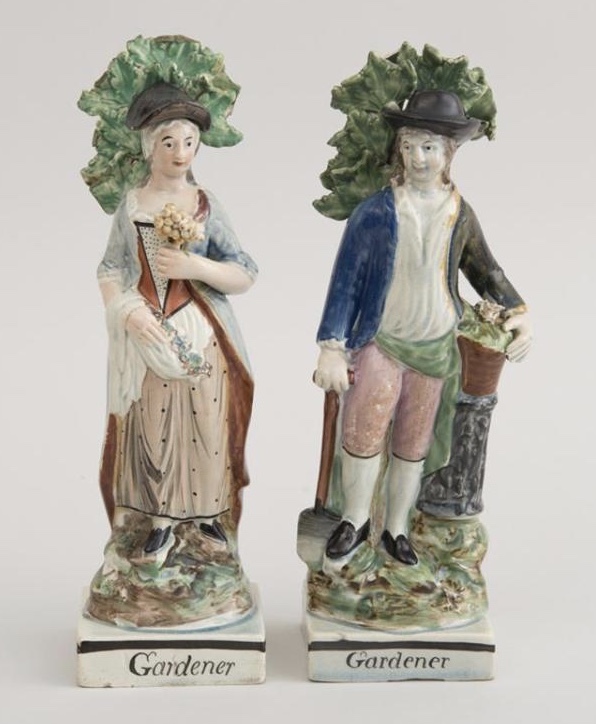 Chamberlain's Worcester flower pot and stand c. 1805. 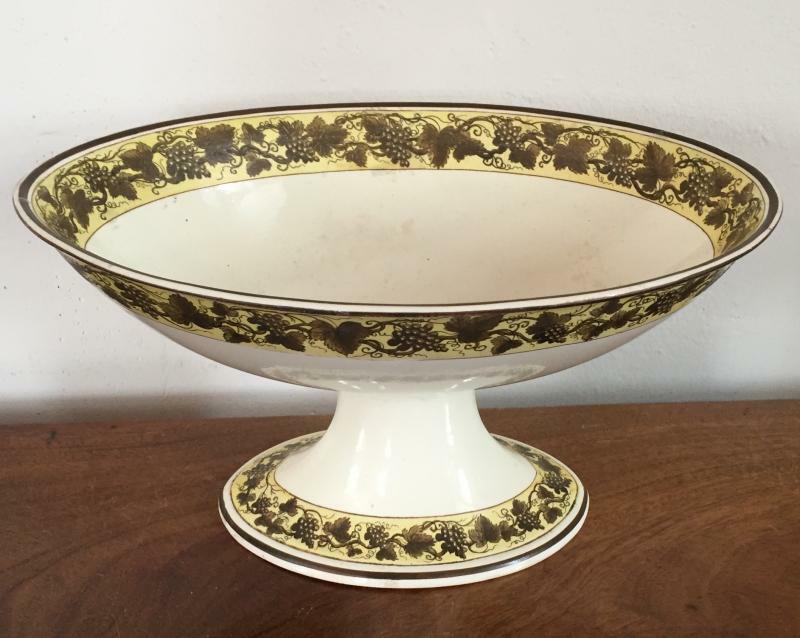 Wedgwood pearlware centerpiece compote or fruit bowl decorated inside and out with grapevine on a yellow ground c. 1810. Large Bloor Derby botanical potpourri urn and cover with ram's head mask handles, c. 1820. 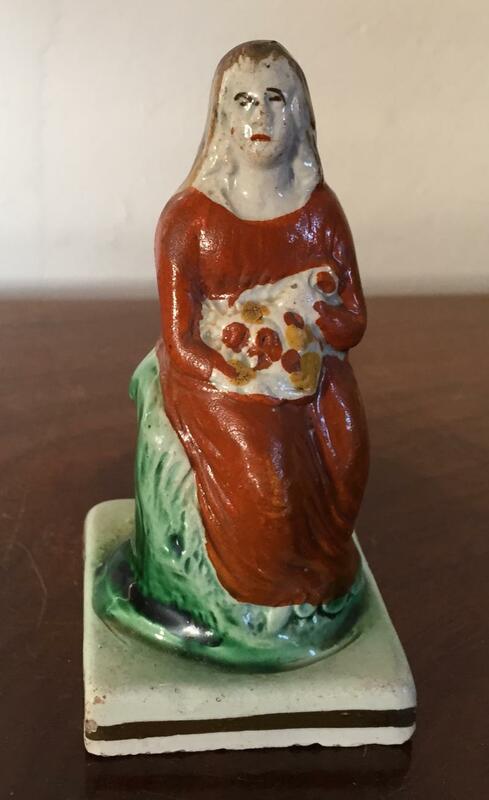 Chelsea gold anchor porcelain figure of a seated doe at lodge - 18th century. 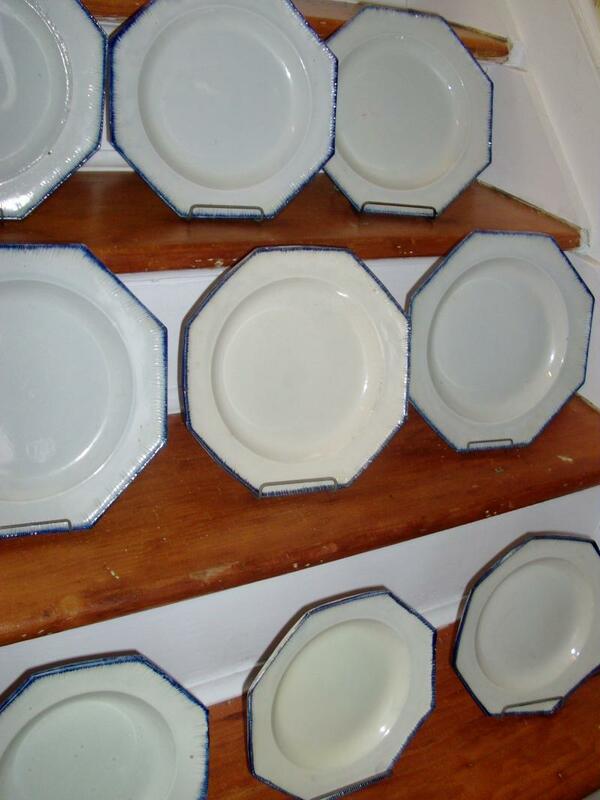 Six early 19th c. Wedgwood creamware plates. 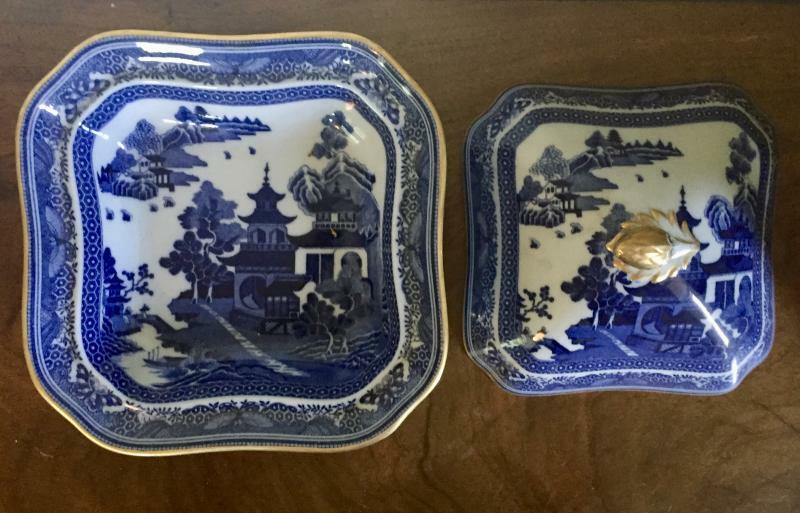 Large early 19th c. English Staffordshire blue & white turkey platters in the Chinese taste. Top example marked Heath, bottom example marked Mason's Ironstone. 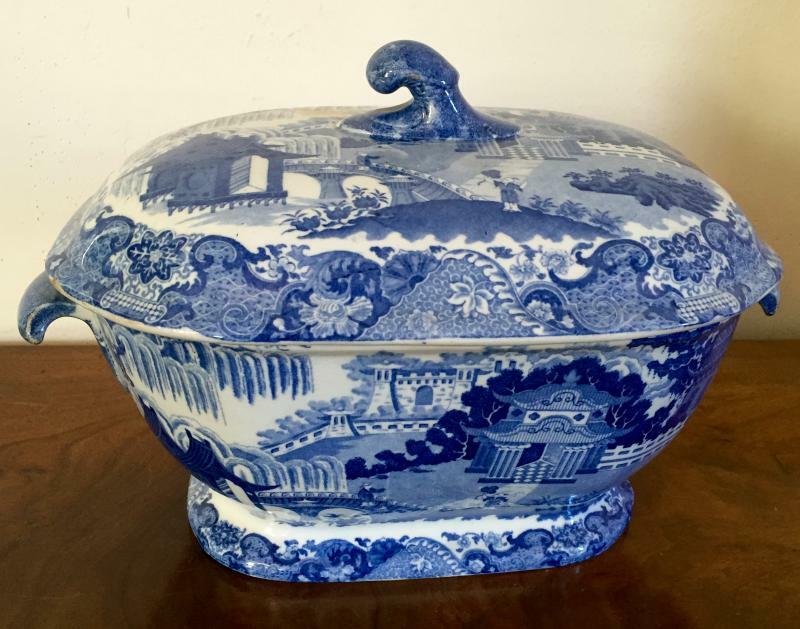 Large early 19th c. English Staffordshire pearlware blue & white soup tureen decorated in the Chinese taste. 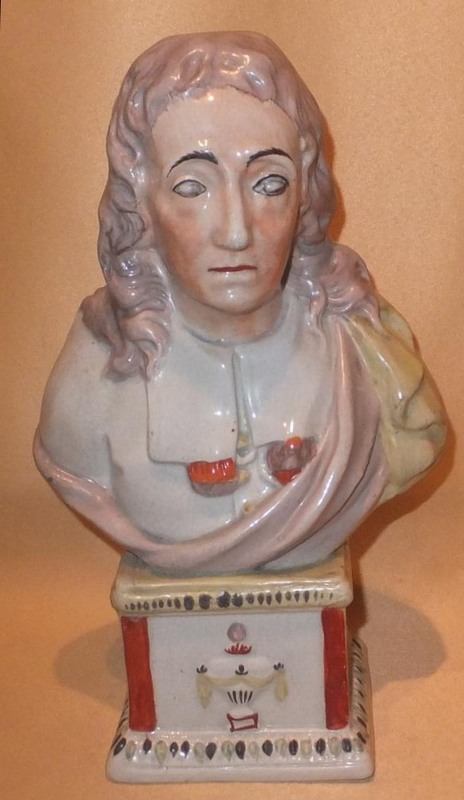 Large pearlware bust of John Milton c. 1800. 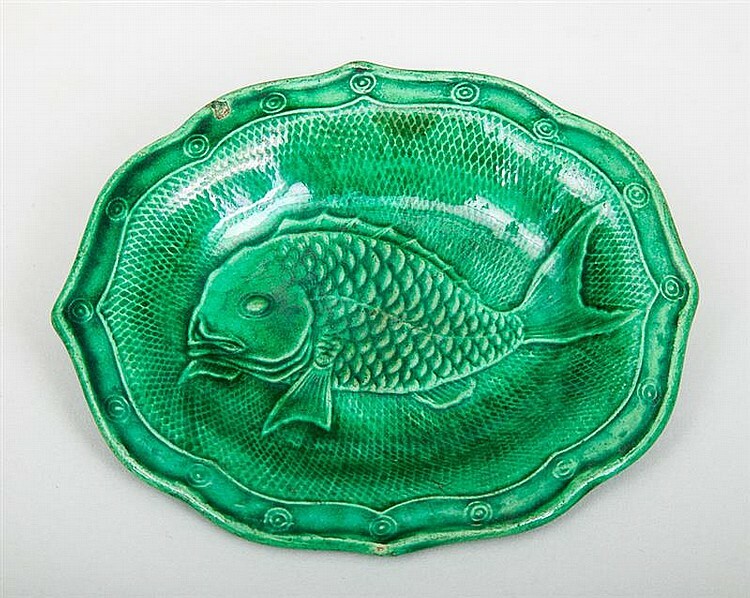 18th c. green pearlware plate decorated with a cod fish. 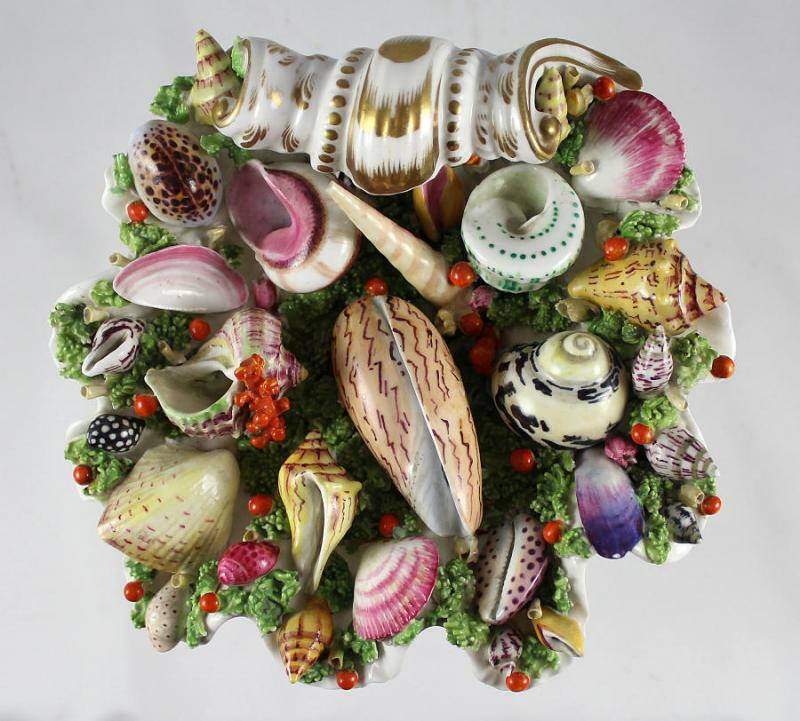 Large Camberlain's Worcester porcelain compote filled with sea shells and coral - 1820. 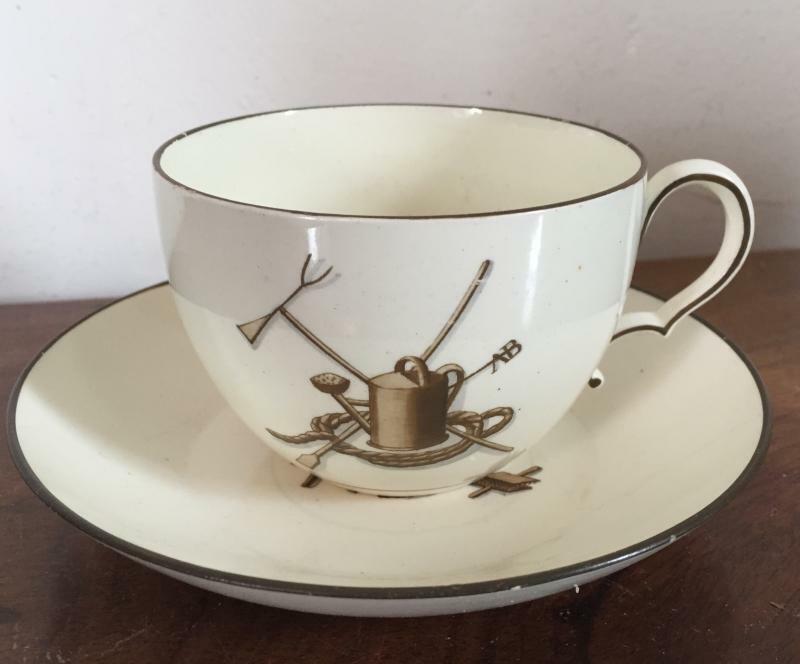 18th century Chelsea gold anchor porcelain coffee can decorated with fruit and butterflies. Pair 18th c. Ralph Wood pearlware obelisks 1780 - 1790. Large early 19th c. Regency pink moonlight lustre tankard mug. Extra large 10 oz. Worcester Flight Barr tea cups and saucers decorated in orange red ground - 18th c.
Pearlware figure of a gardener c. 1800. 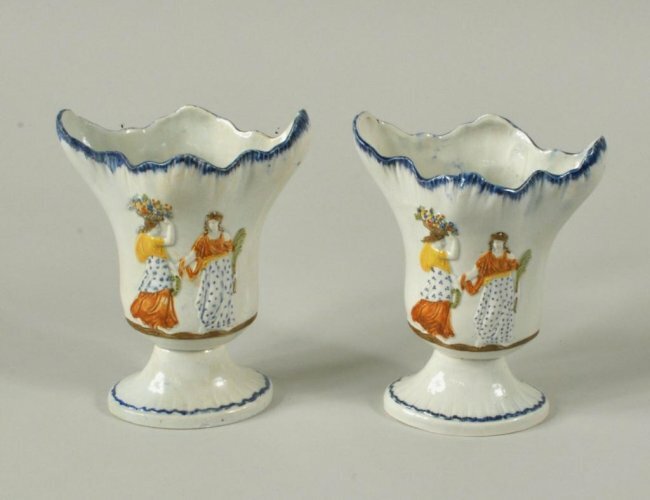 Pair Coalport porcelain root pots and stands c. 1810. Flower baskets on cafe au lait ground; applied ring handles and fine gilding. 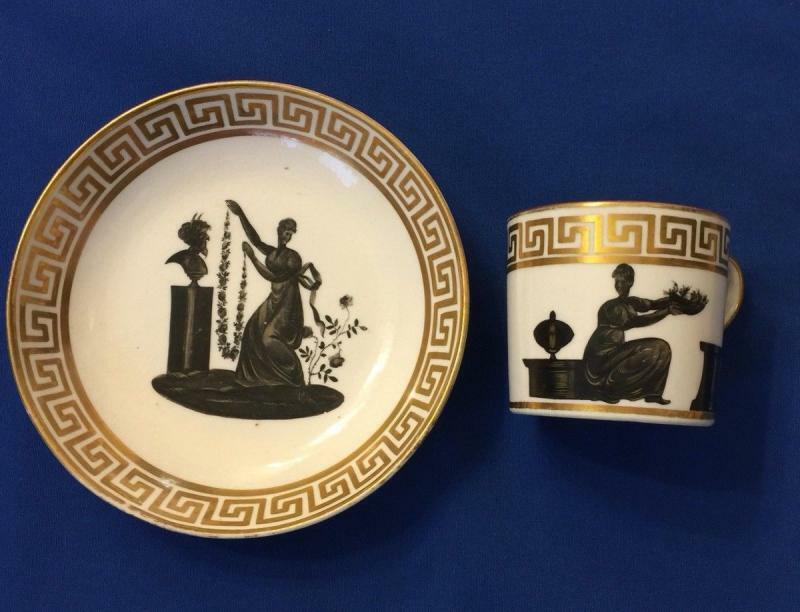 Pair Worcester Flight Barr porcelain dessert cake dishes and a bowl decorated with classical scenes. 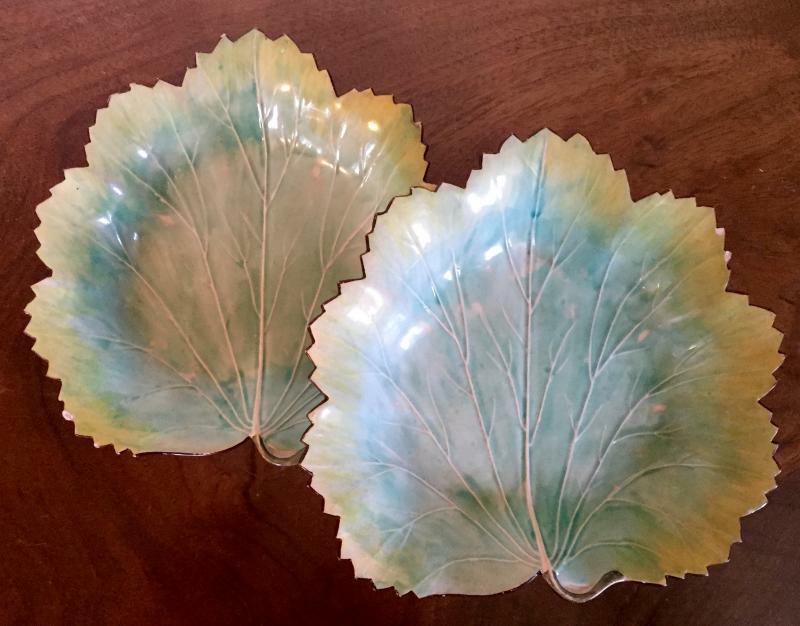 Leaf form dishes naturalistically molded with bright green glaze - 19th century. 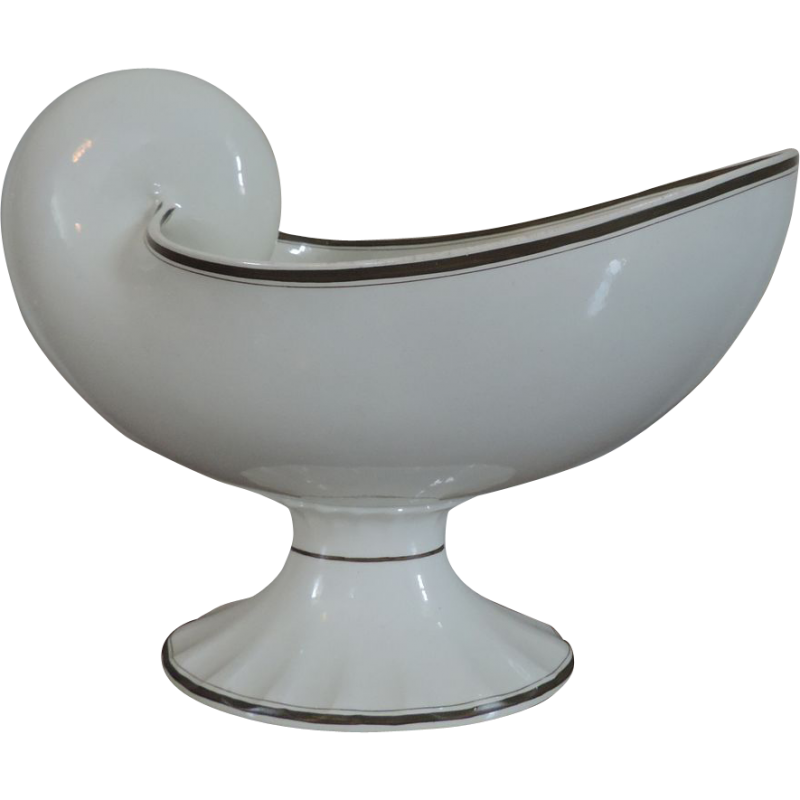 Early 19th c. Wedgwood creamware nautilus shell form centerpiece compote. 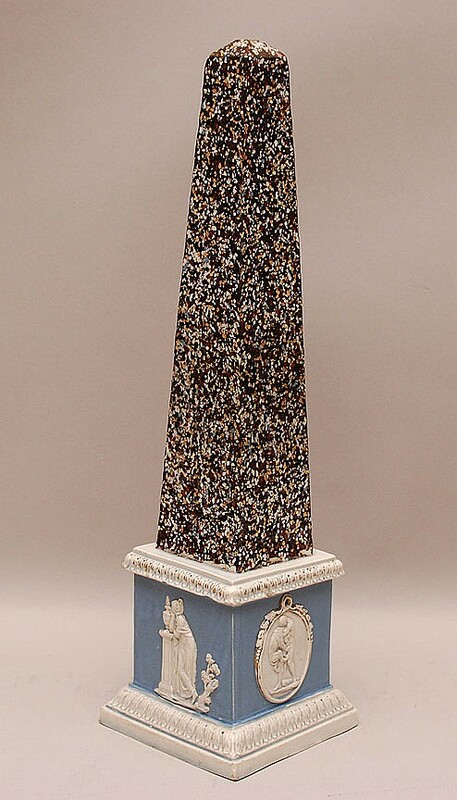 Large 18th century Wood pearlware obelisk made to imitate porphyry. 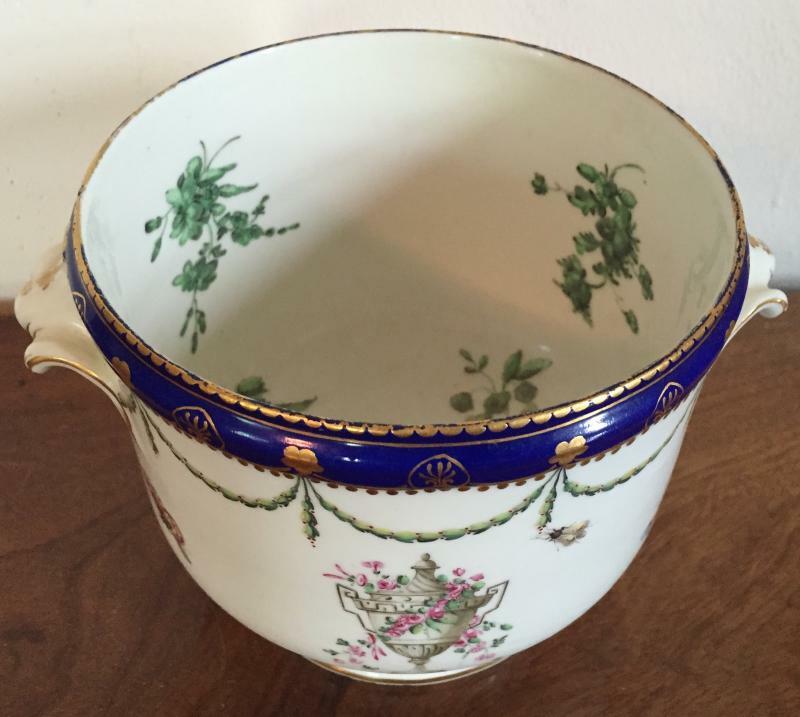 Derby porcelain bough pot c. 1800. 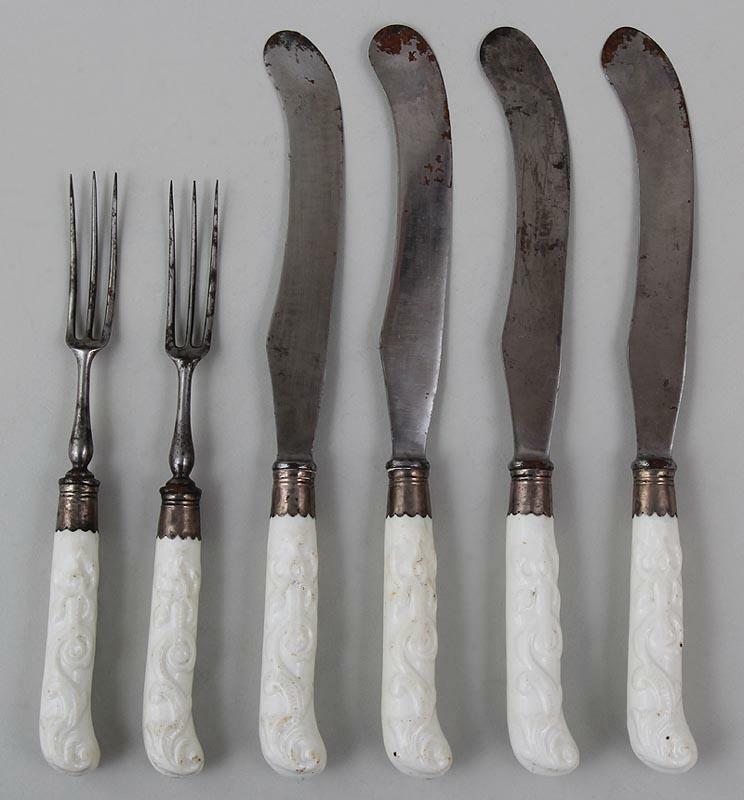 18th century Bow blanc de chine porcelain handles for knives & forks. 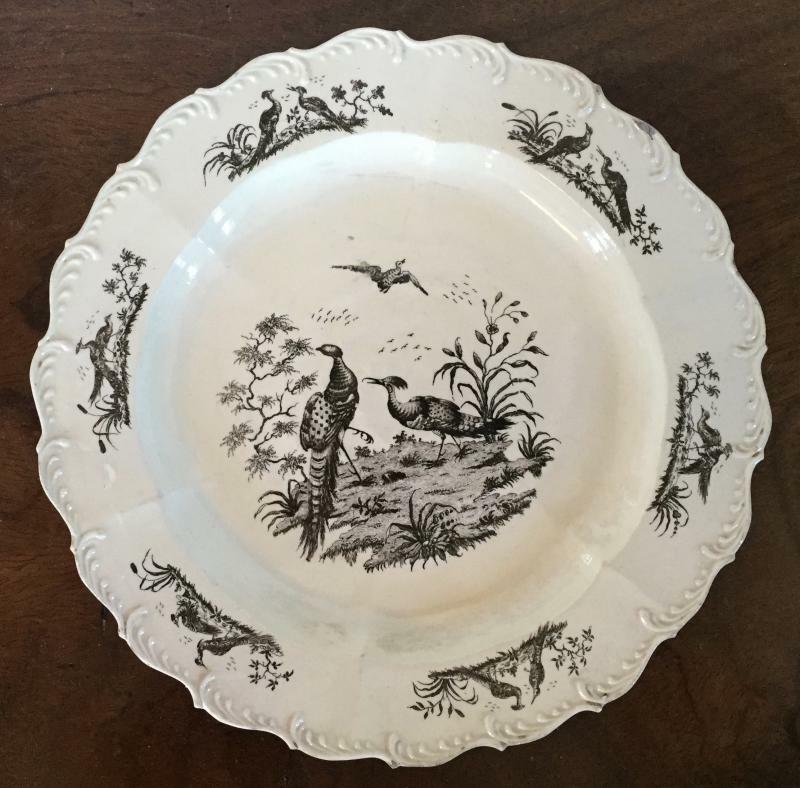 Worcester ornithological porcelain dish London decorated by Thomas Baxter 1800 - 1805. 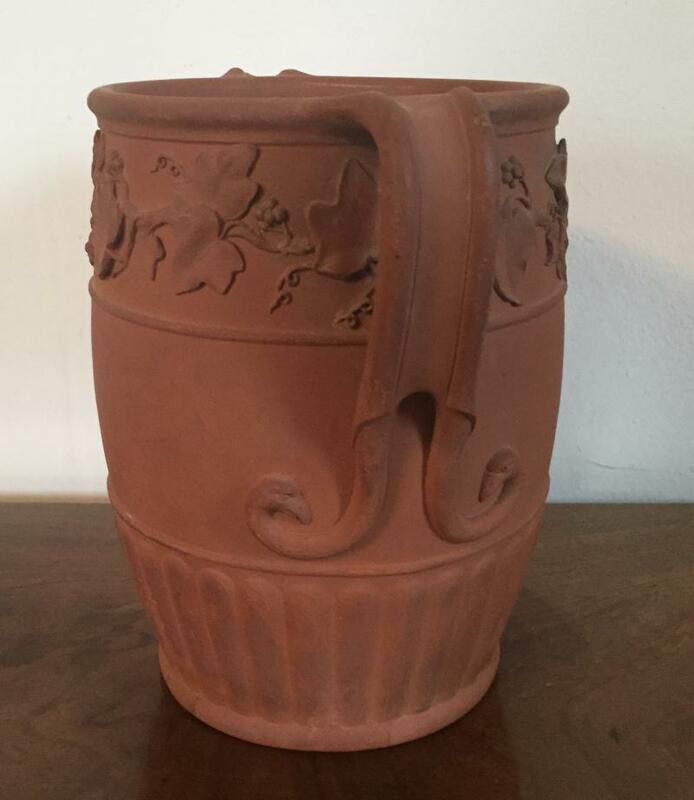 18th c. Chelsea Derby porcelain bottle cooler or cachepot planter decorated inside & out. 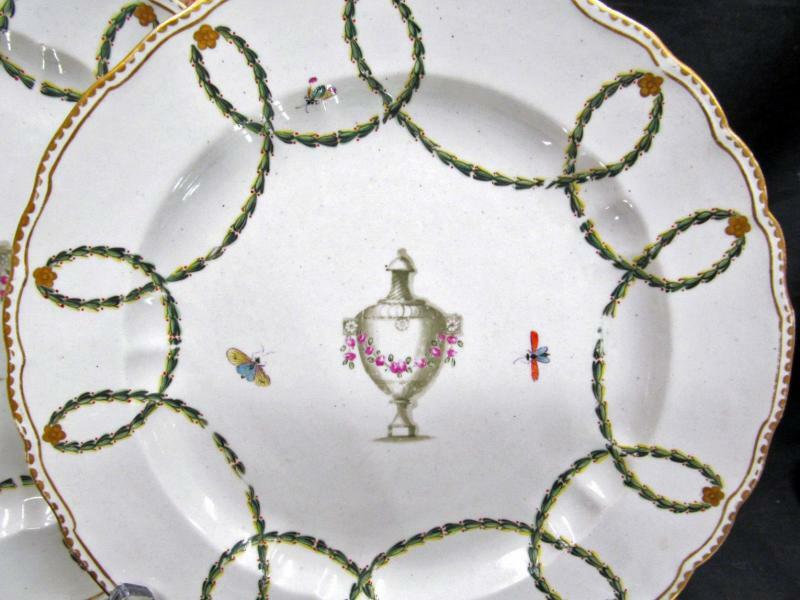 Pair 18th c. Chelsea Derby porcelain plates decorated with urns, butterflies and insects with an exuberant sprig garland all enhanced by gilding. 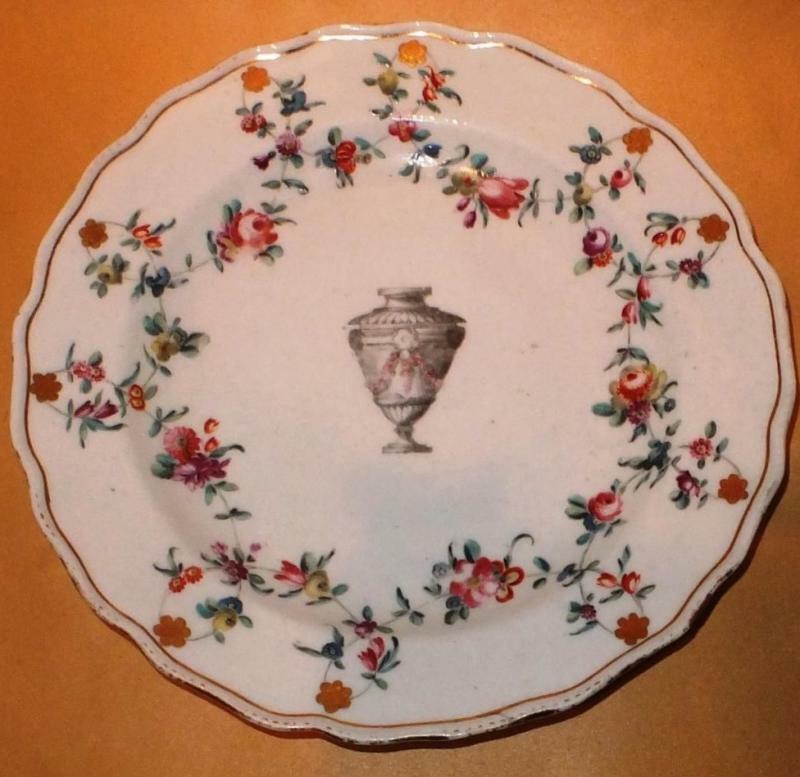 18th c. Chelsea Derby plate with urn and floral garland. 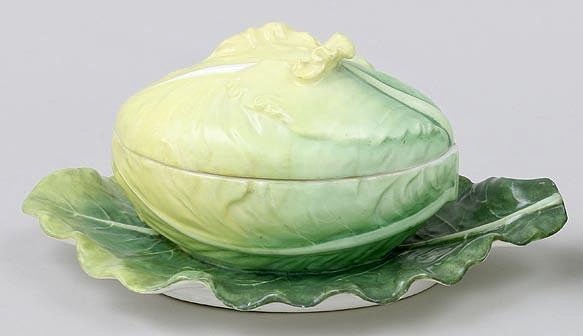 Davenport soup tureen and platter with cabbage finial. Yellow ground and hand painted brown neoclassical decoration. Coalport vase decorated en grisaille with domestic scenes of classical figures and musical instruments. Applied ring handles to the sides - c. 1805. 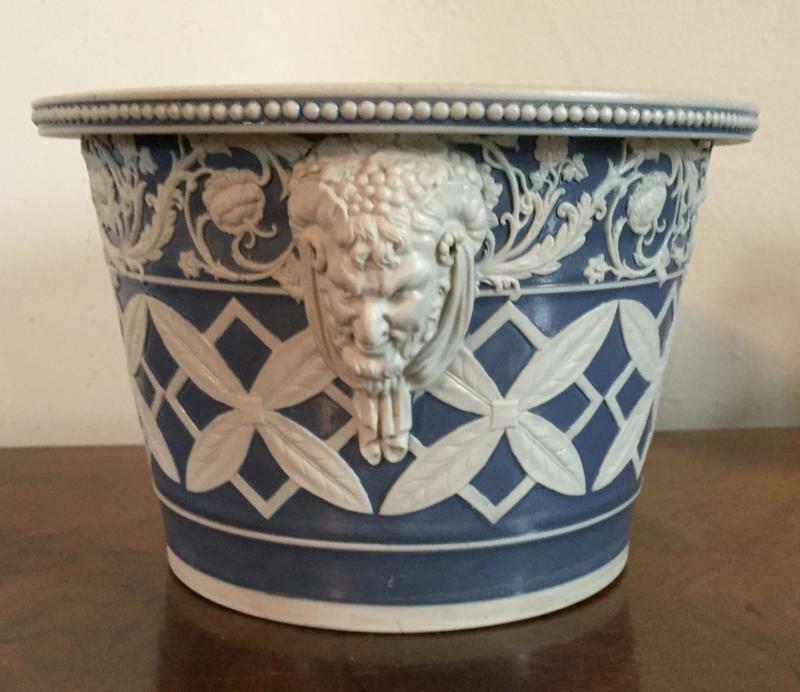 Early 19th c. neoclassical Spode sprigged root pot and stand. 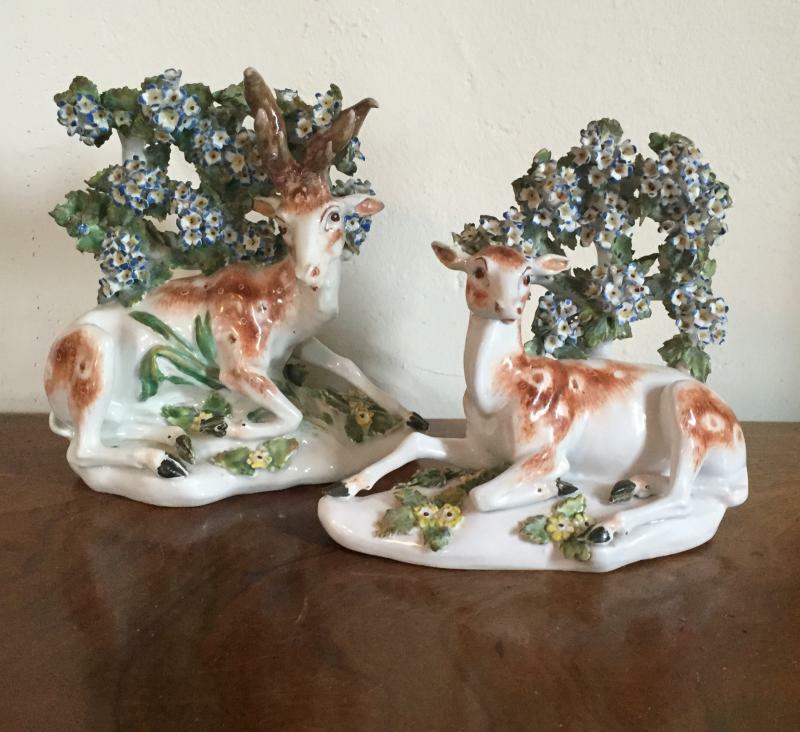 Pair 18th century pearlware models of recumbent deer - a doe and buck. 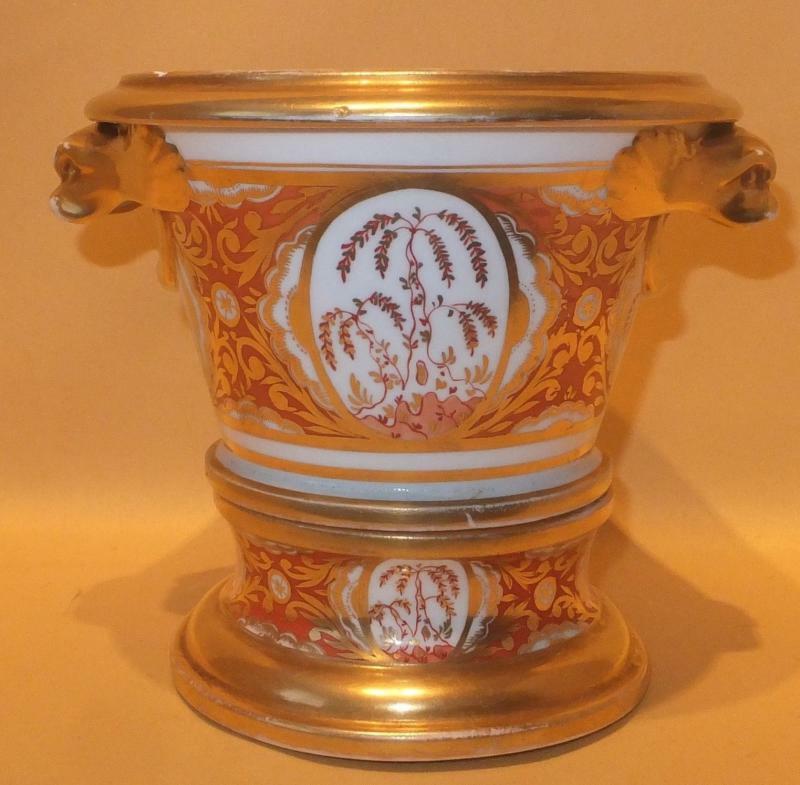 Early 19th c. pink luster urn with applied ring handles and orange red ground. 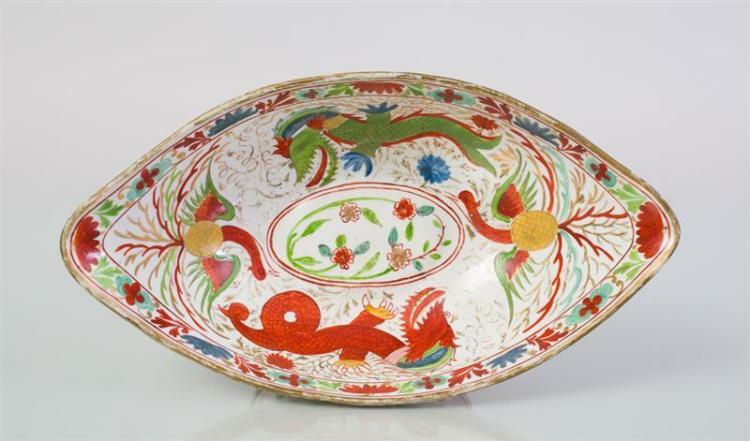 Chamberlains Worcester imari porcelain supper dish in the 'dragon in compartment' pattern with a central armorial reserve c. 1800. Pair 19th c. Davenport vases in apple green faux marble glaze. 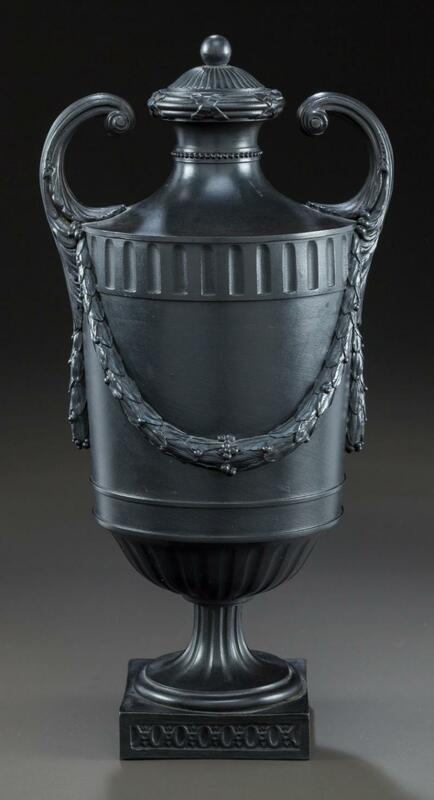 18th century neoclassical Wedgwood black basalt urn & cover. Early Wedgwood basalt canopic jar in the Egyptian revival taste. 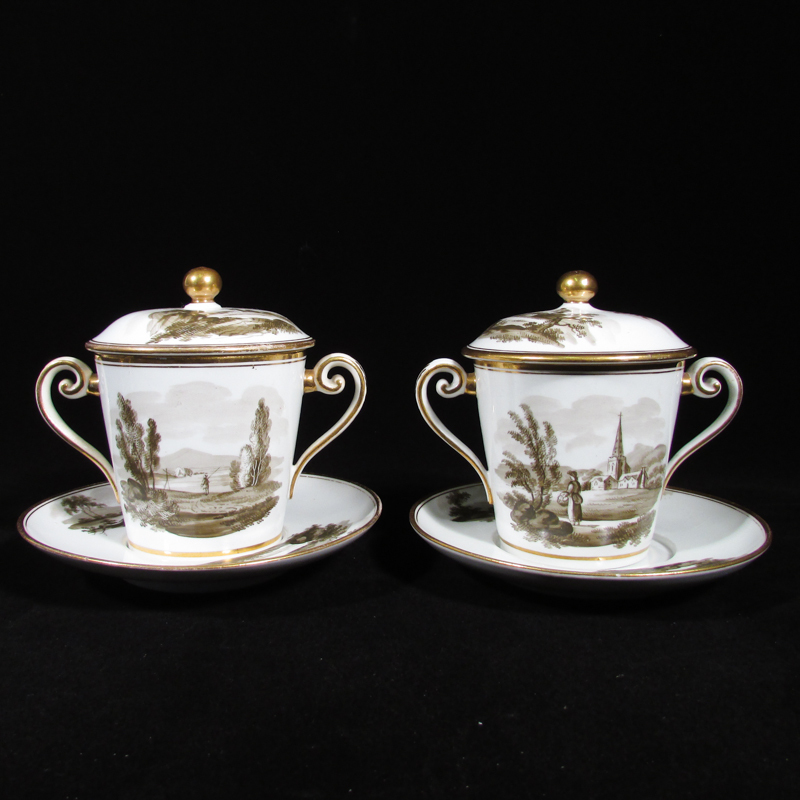 Large pair chocolate cups and covers decorated with sepia landscape scenes. 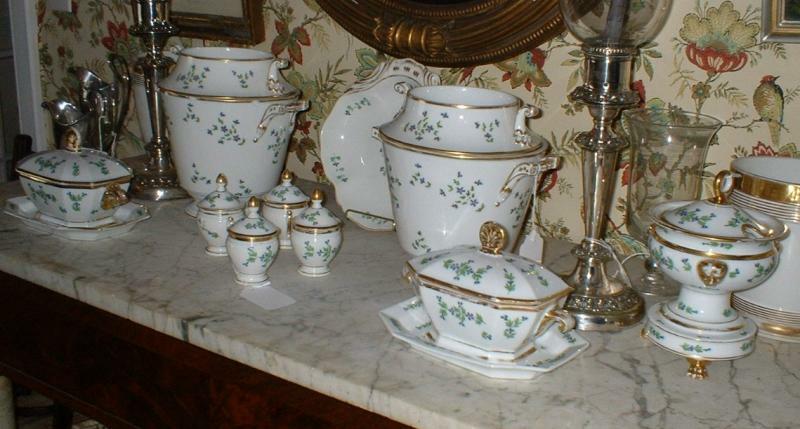 Fine English mantle garniture including a pair of root pots & stands and a crescent bough pot. 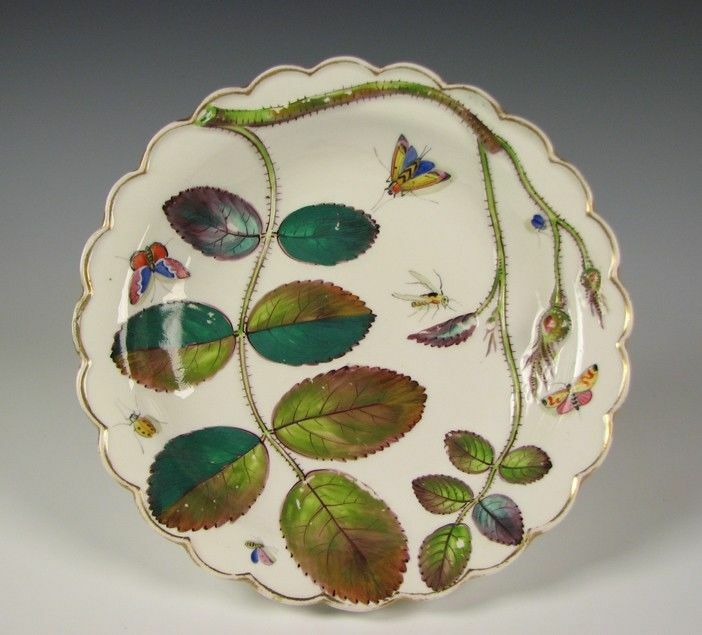 Decorated with butterflies and insects enhanced by gilding - Spode c. 1800. 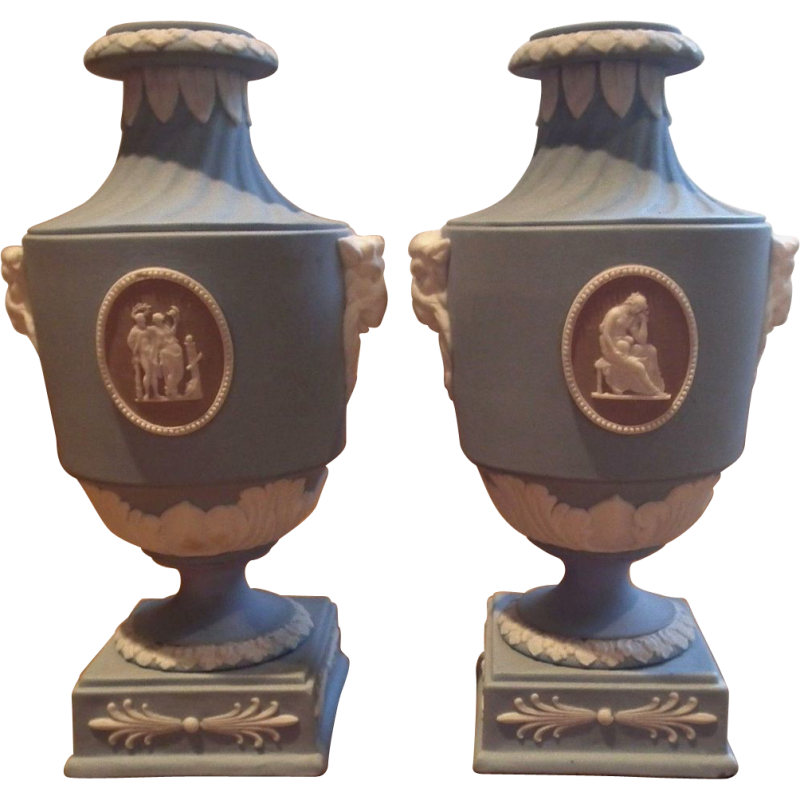 Pair 18th c. Prattware urns with blue feather edge and relief molded decoration based on John Flaxman's Sacrifice to Ceres. 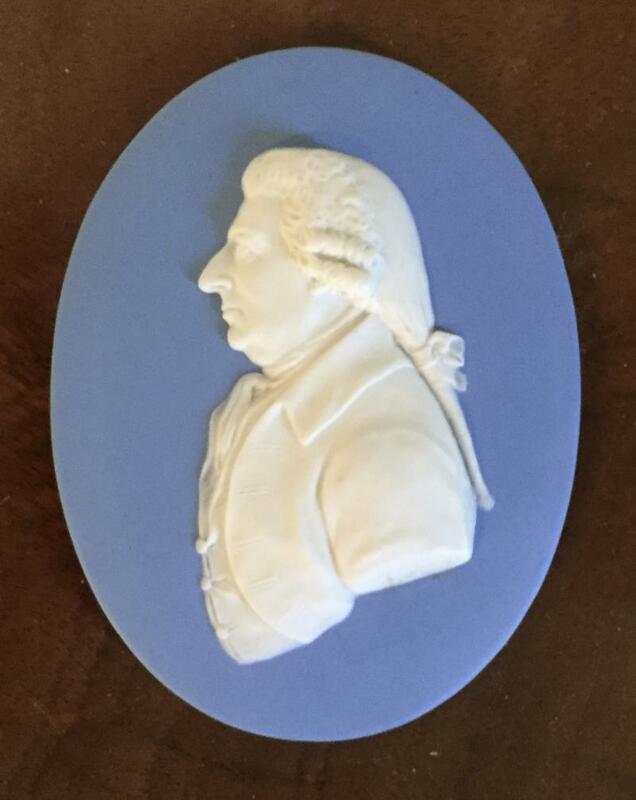 Fine & rare Wedgwood bouquetiere c. 1785. 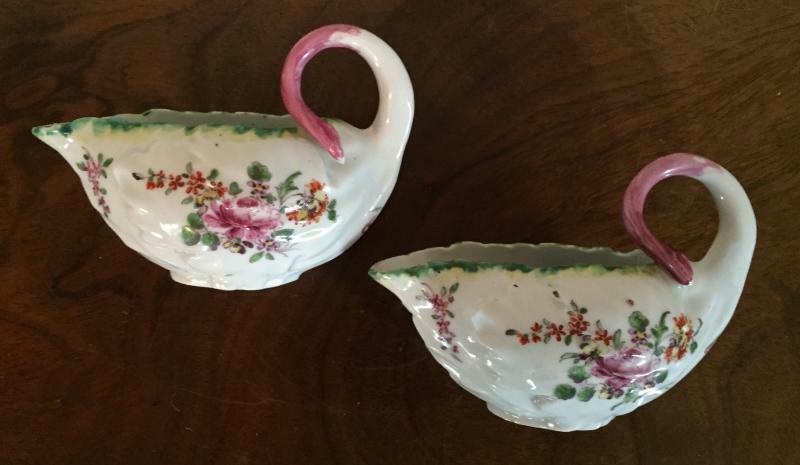 Rare pair 18th c Prattware vases with wyvern handles. Pair 18th century English creamware vases mounted as lamps. For an identical example see collections of the Victoria & Albert Museum 304-1869. 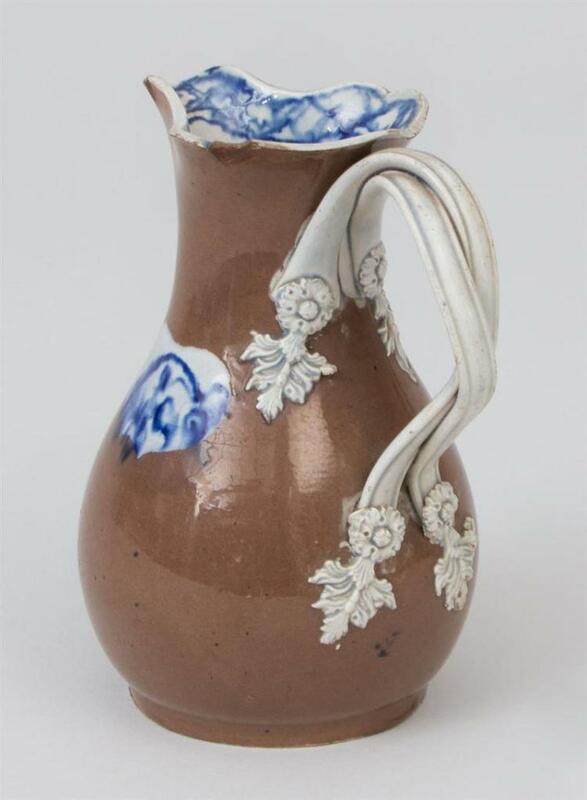 V&A catalogues this vase as Neale or Palmer & Humphrey 1770 to 1780. 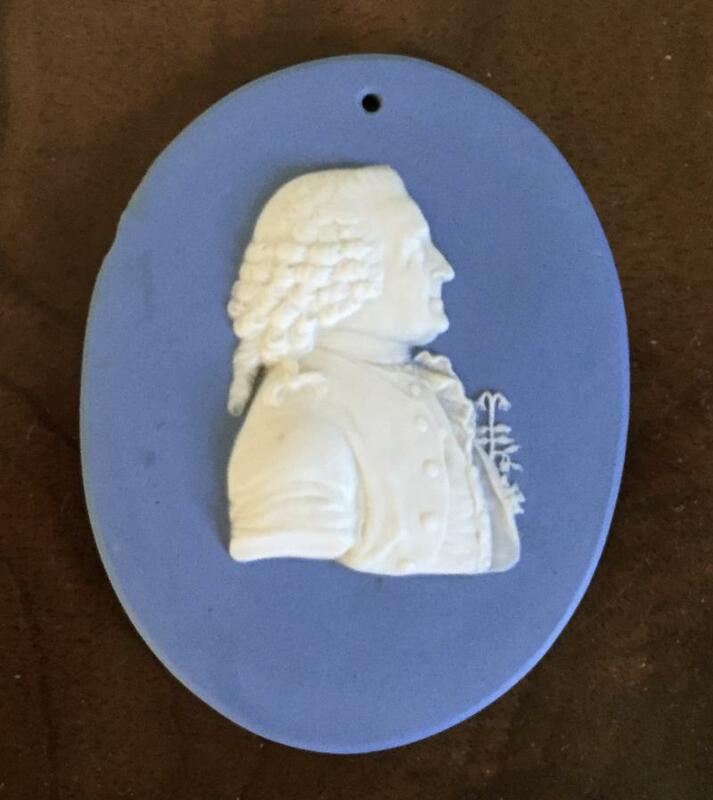 Both contemporaries of Wedgwood & Bentley. Applied medallions of Hercules on a porphory ground to imitate stone. Early 19th c. Wedgwood dolphin form basalt candlestick. 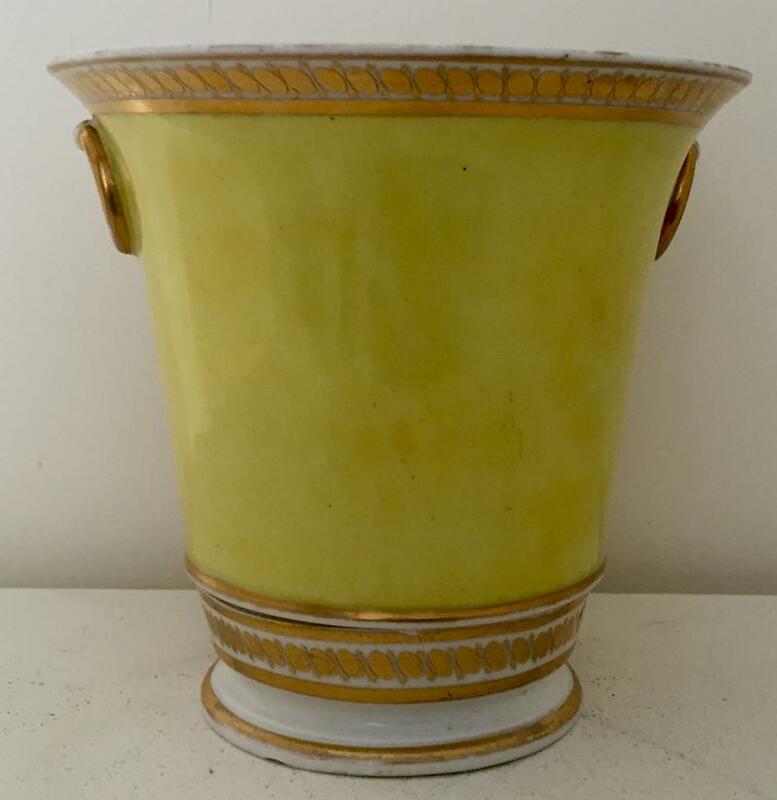 Derby porcelain bough pot with interesting geometric design on a bright yellow ground. 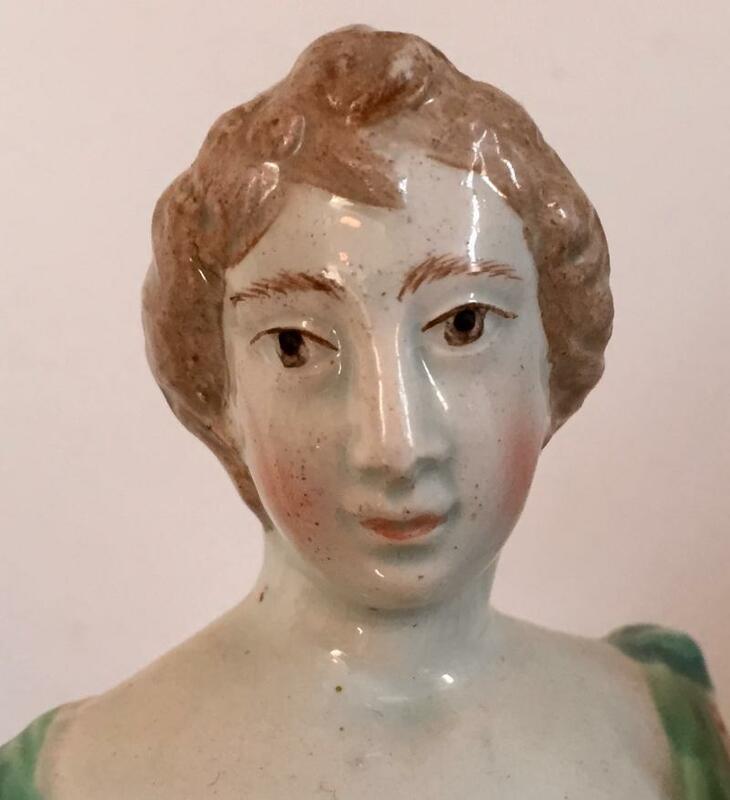 Early 19th century jasperware sprigged urn on stand in two colors. Two similar large 19th century Staffordshire pearlware model of a sheep barn and cottage. Measure 9 1/2" across. 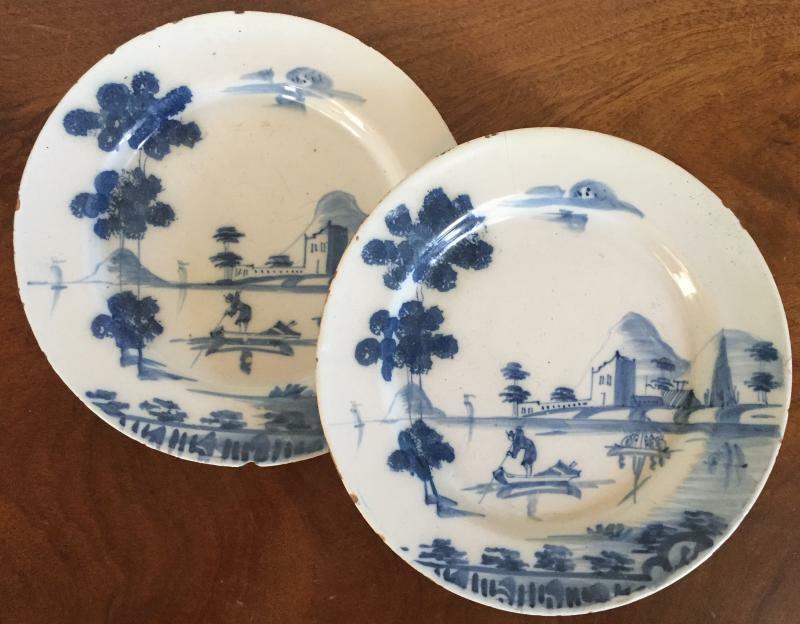 Pair 18th century English Delft tin glaze plates decorated with Chinoiserie landscapes. 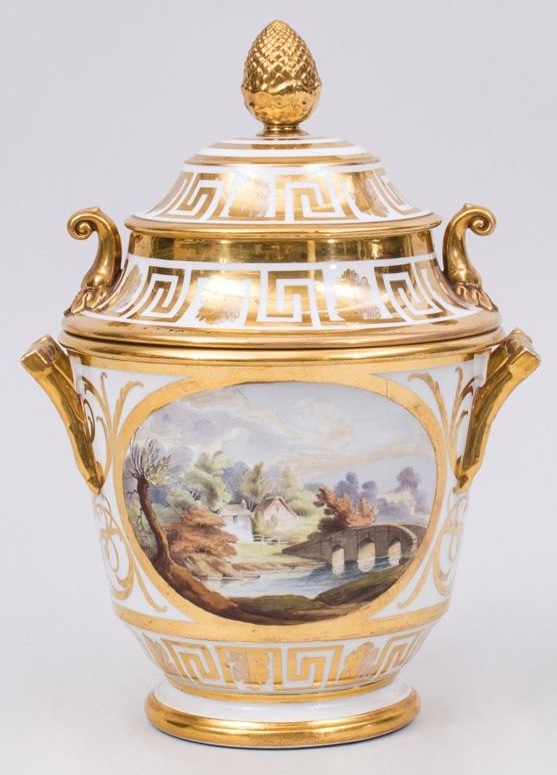 Turner neoclassical bough pot in the French taste c. 1810. 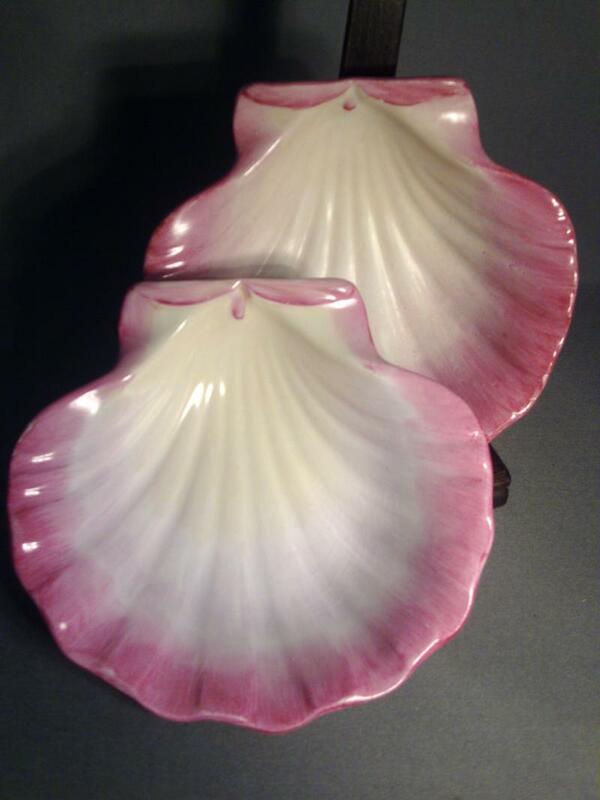 Pair Chamberlain's Worcester shell form dessert dishes with bright red ground. 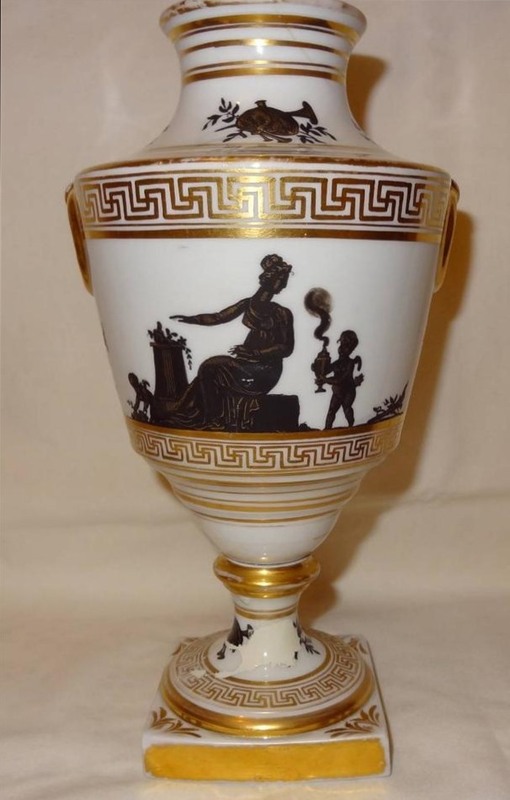 Coalport spill vase decorated en grisaille with continuous classical scenes. 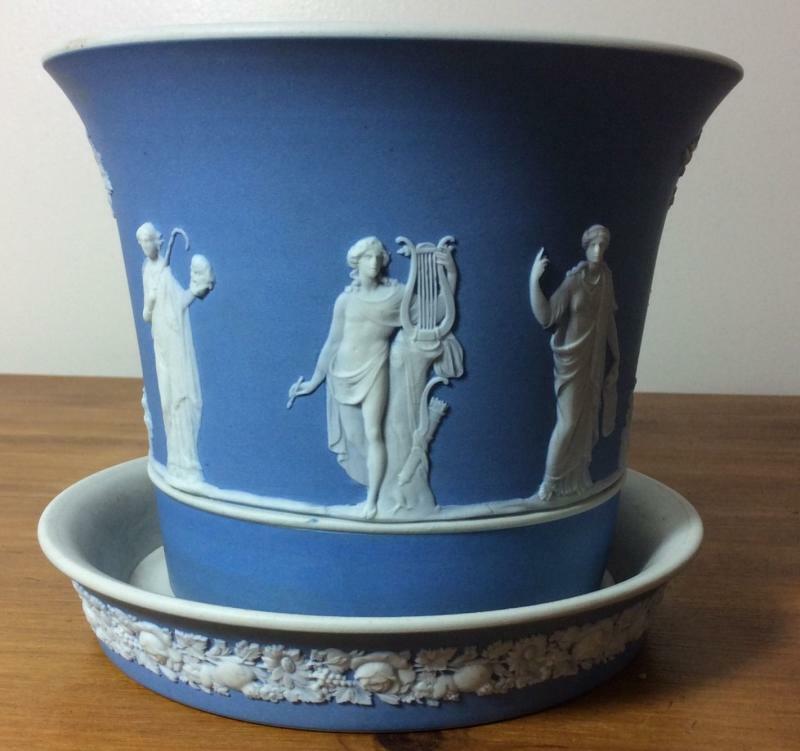 19th century Wedgwood root pot or jardiniere and stand in light blue jasperware. 18th c. Worcester sucrier and stand. 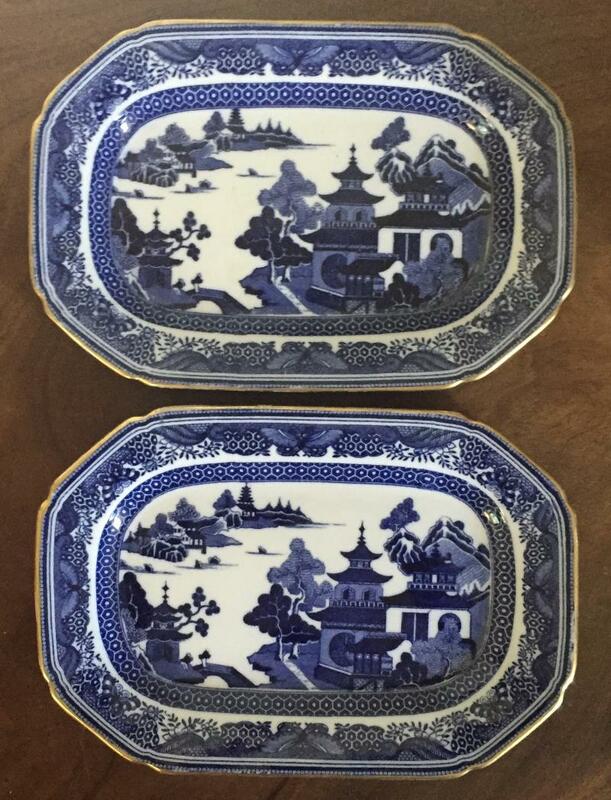 Pair 18th century octagonal English pearlware blue and white plates in the Chinese taste 1790. 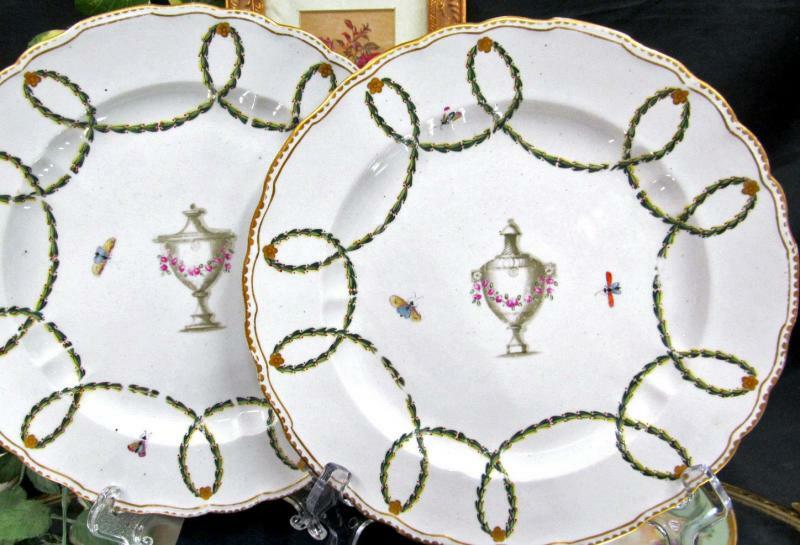 Pair early 19th c. Flight Barr Worcester shaped dishes with anthemion handles and apple green ground enhanced by gilding. 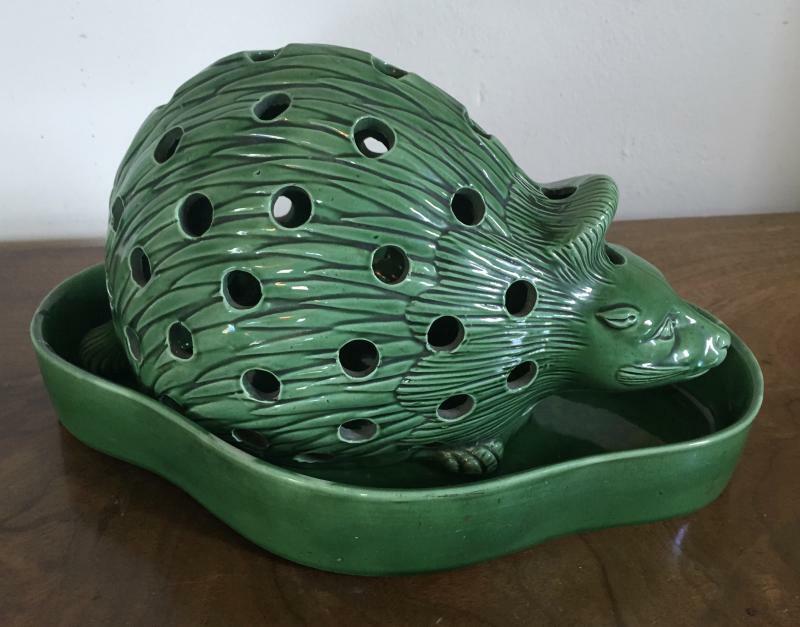 19th century salt glaze bulb pot in the form of a hedgehog. 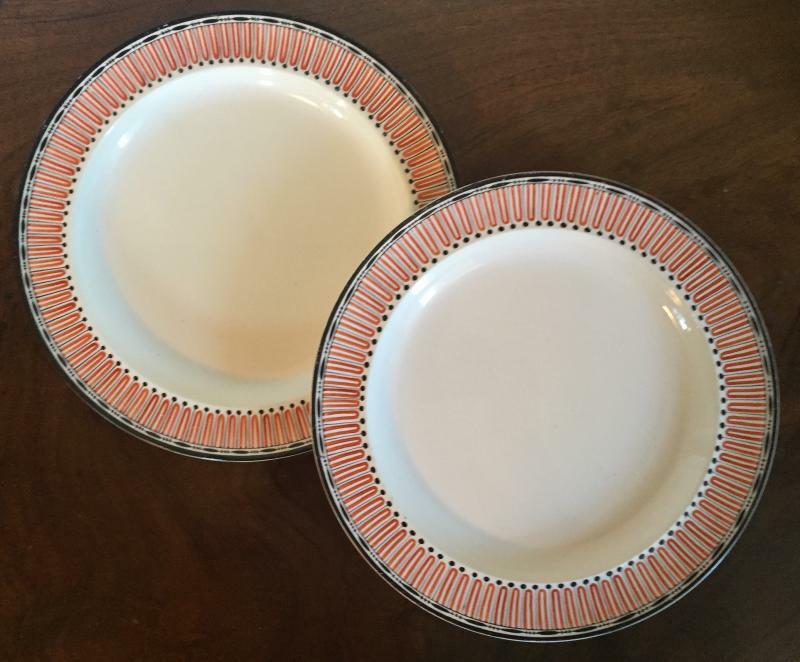 Pair Coalport imari porcelain thumb pattern lozenge shaped dessert dishes. 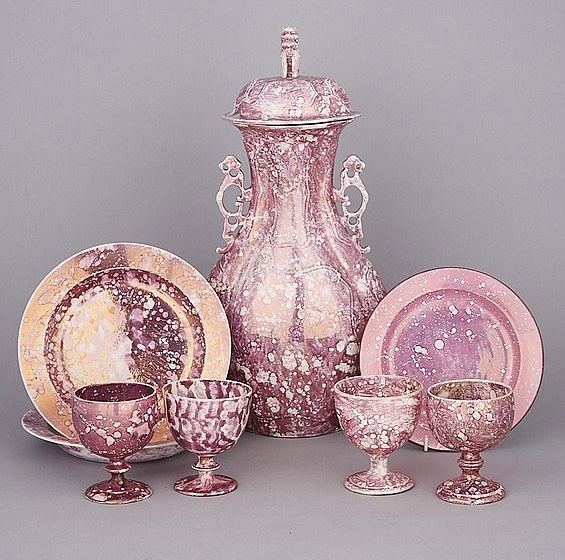 Set 8 19th century pink luster pearlware dinner plates decorated with scenes from Dickens. Rare 19th century Staffordshire model of a tabby cat c. 1865. 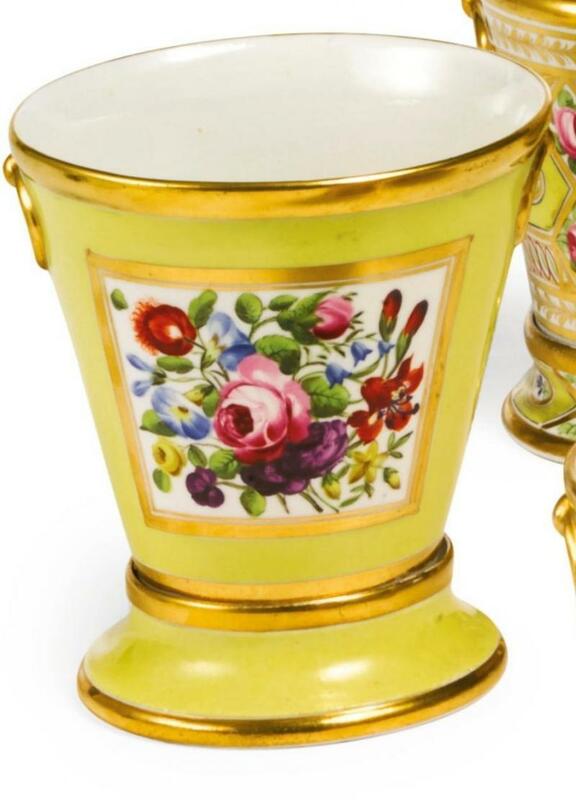 18th c. crescent shaped bough pot with floral reserves on a bright yellow ground. 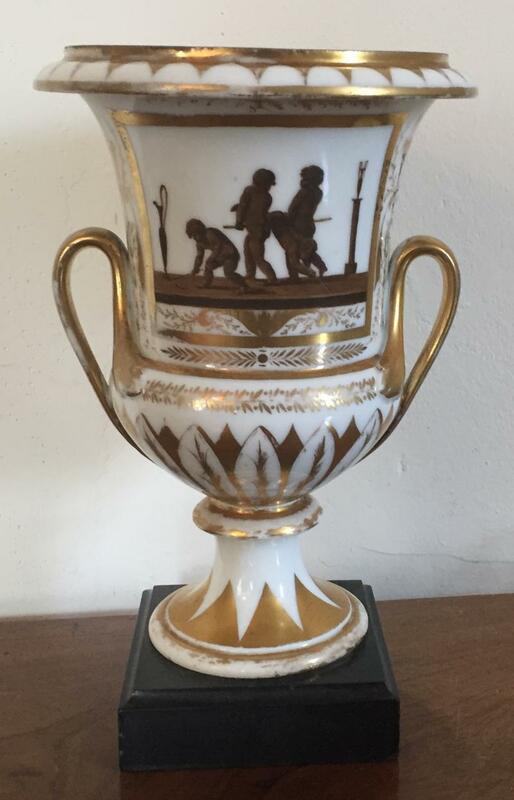 Rare Coalport Egyptian revival urn decorated with black silhouettes of Pharaohs and hieroglyphics. Gilt Greek key border and matte dolphin handles c. 1805. 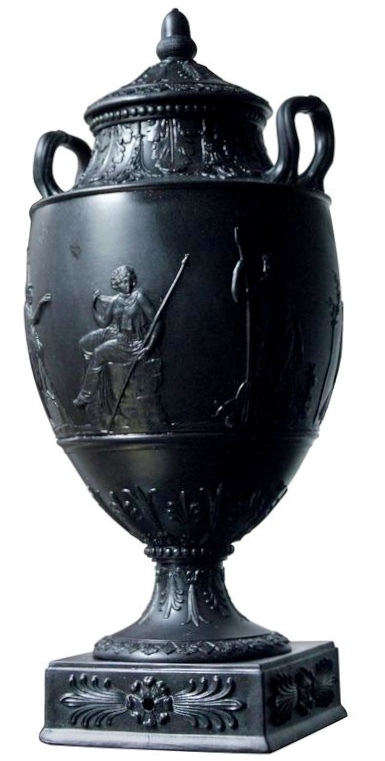 Wedgwood & Bentley black basalt classical urn c. 1770. 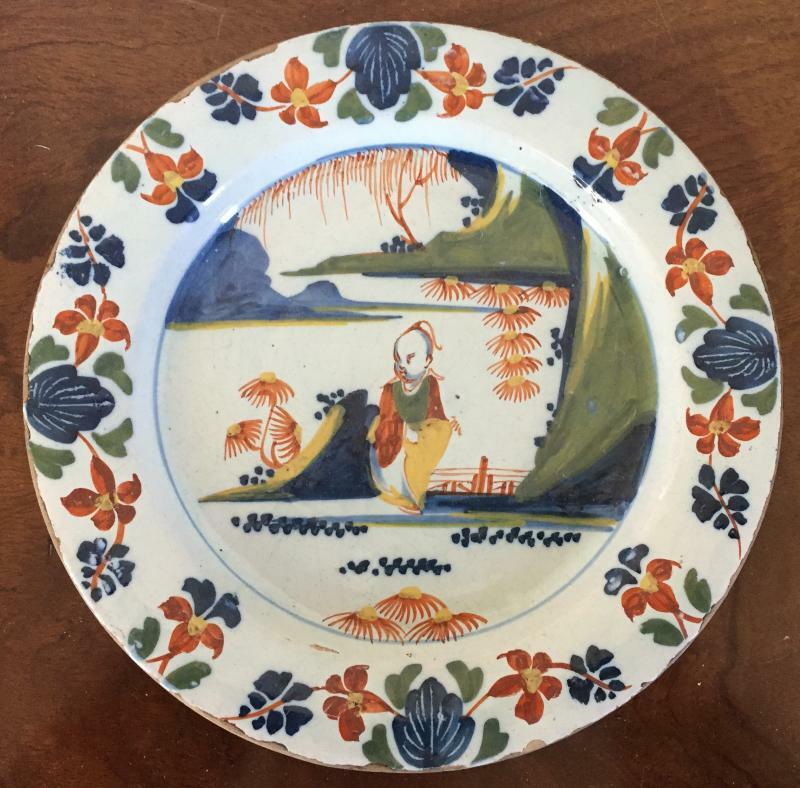 18th century creamware plate decorated with polychrome landscape. 18th century Derby porcelain plates with named London views - Deptford Kent on the Thames River, London (top) and Near Bulls Cross Enflied Near London (bottom). 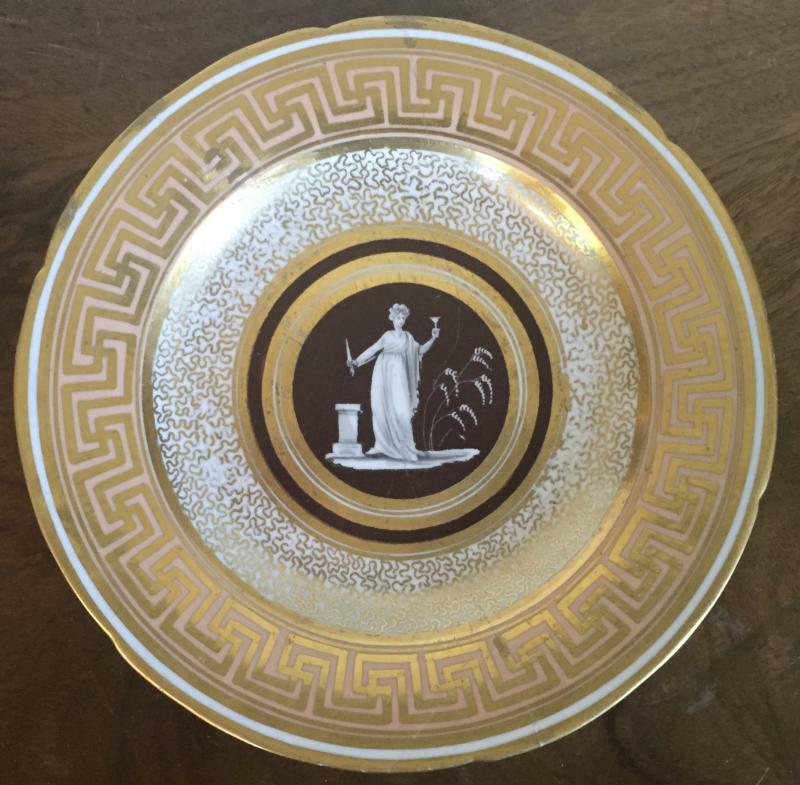 Pair Coalport porcelain classical shell shaped dessert dishes with greek key border. Coalport Church Gresley root pot and stand. 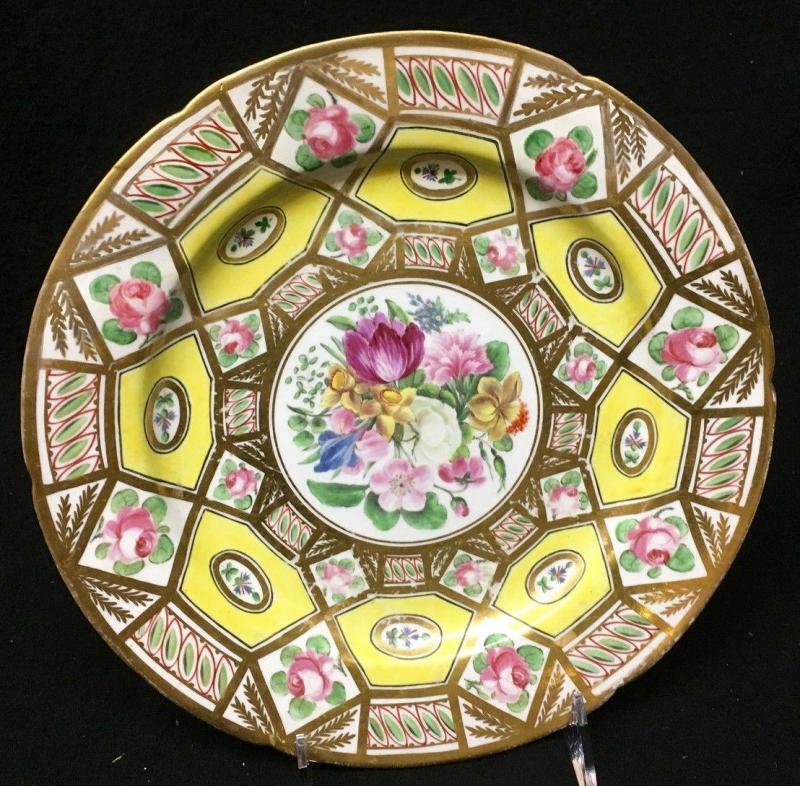 Spode imari rock and tree dinner plate. 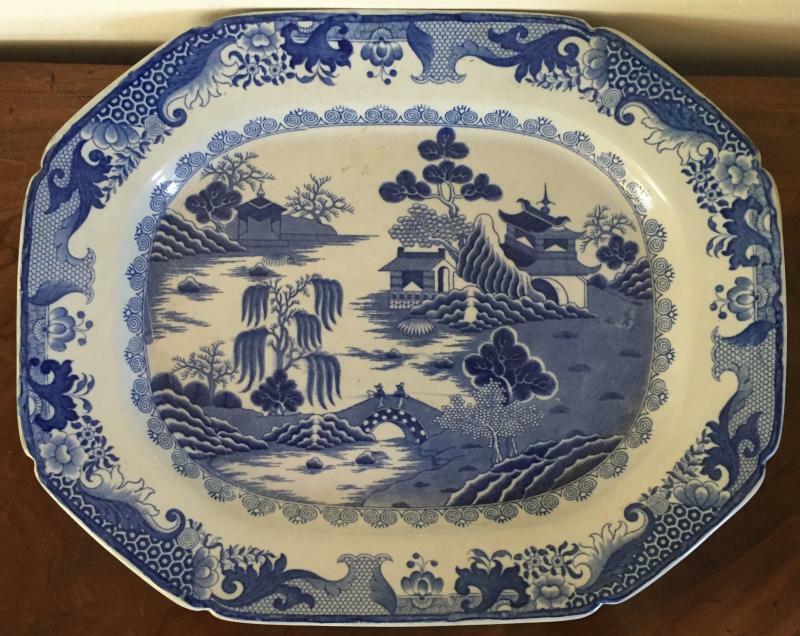 19th c. supper set with mahogany tray..
Derby Duesbury kakiemon imari plates with leaves and chestnuts c. 1770. 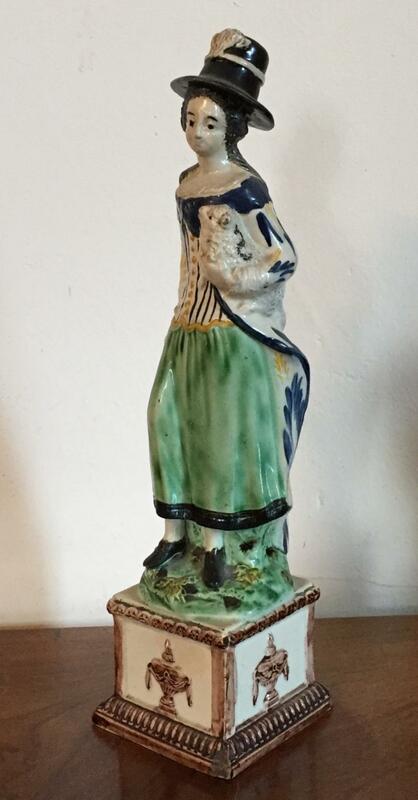 Fine & large 18th century figure of a standing doe in bocage. Derby Mansion House Dwarfs - early 19th century. 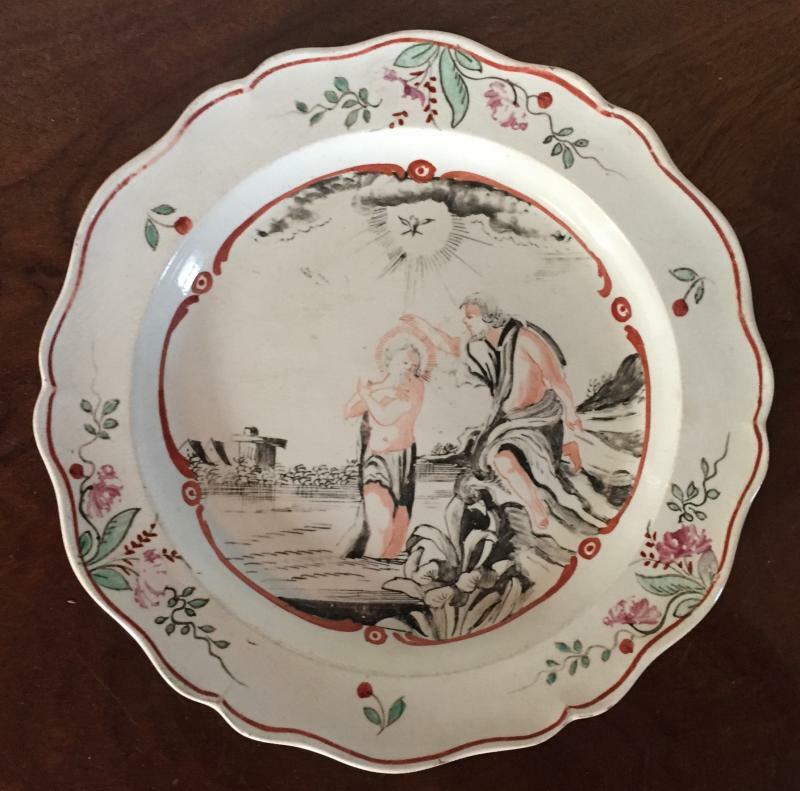 Pair Chelsea Red Anchor plates c. 1760. 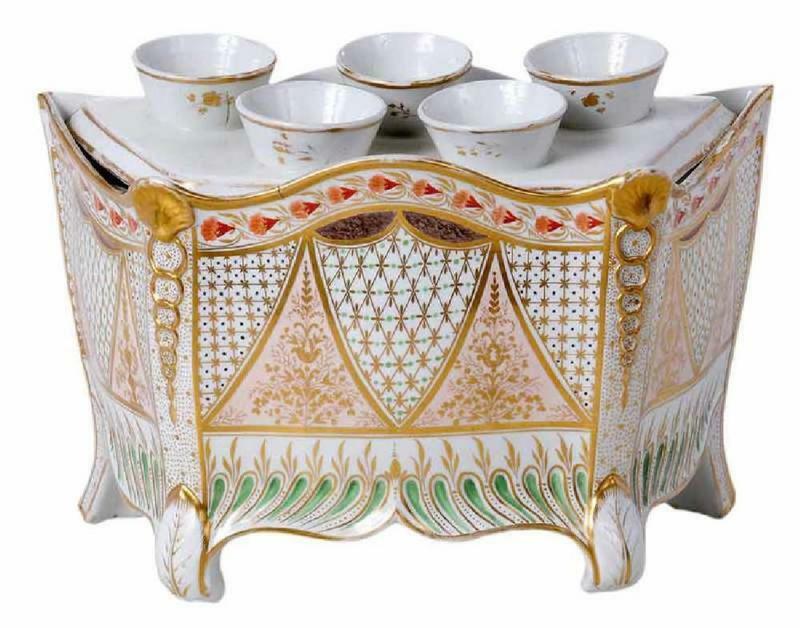 Large footed tazza centerpiece with floral reserve and pink ground. 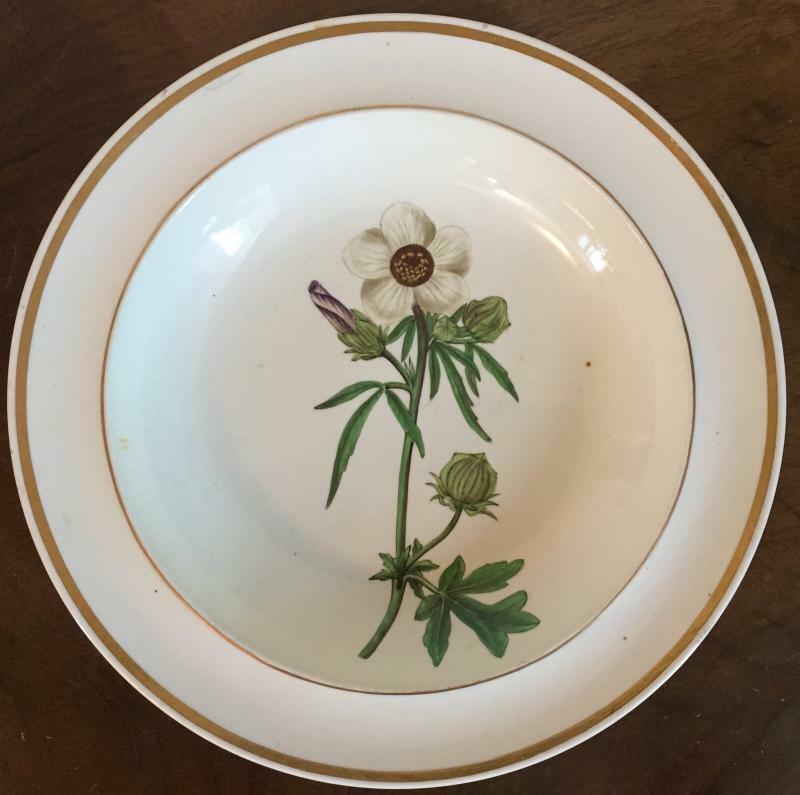 Pair Shorthose creamware botanical plates with named specimens c. 1800. 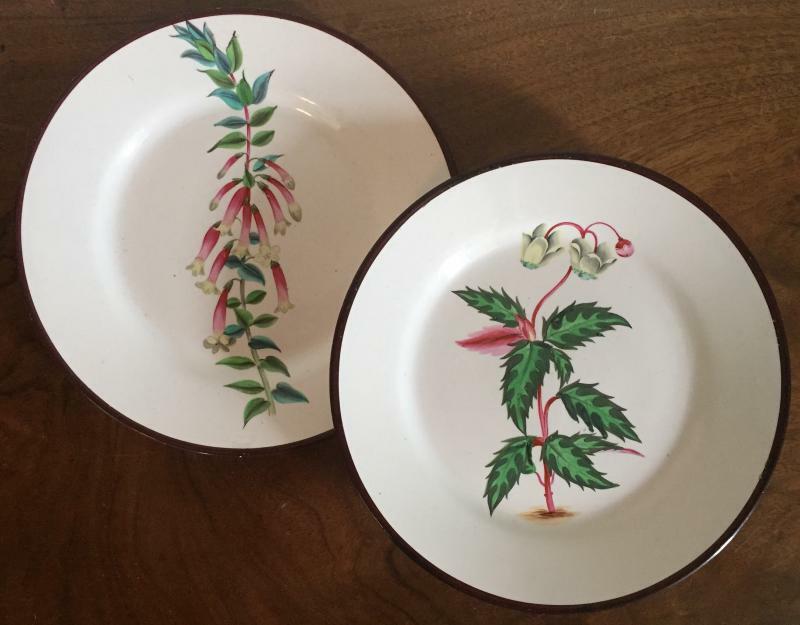 Pair creamware botanical plates - Swansea or Davenport - 1810. 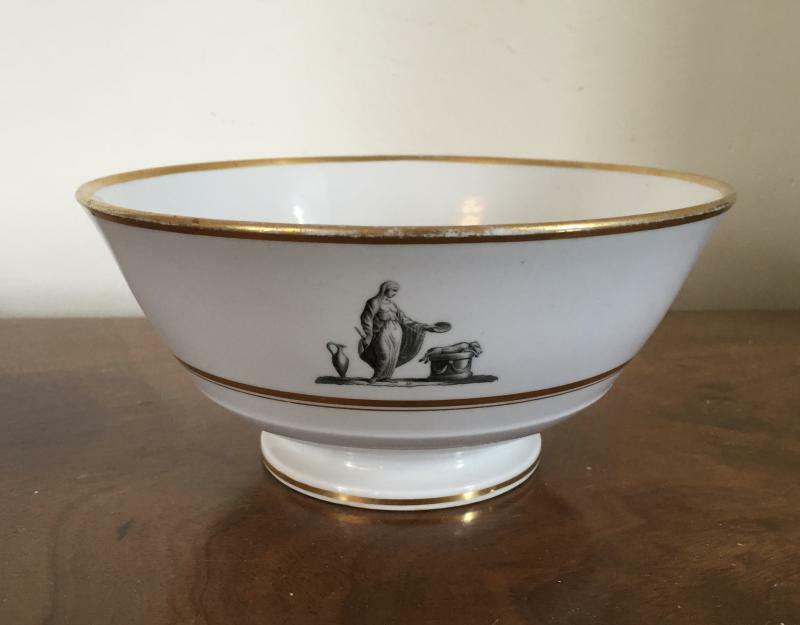 Fine jasperware bowl in brown glaze with three neoclassical reserves commemorating Lord Horatio Nelson's birth, life and death c. 1810. 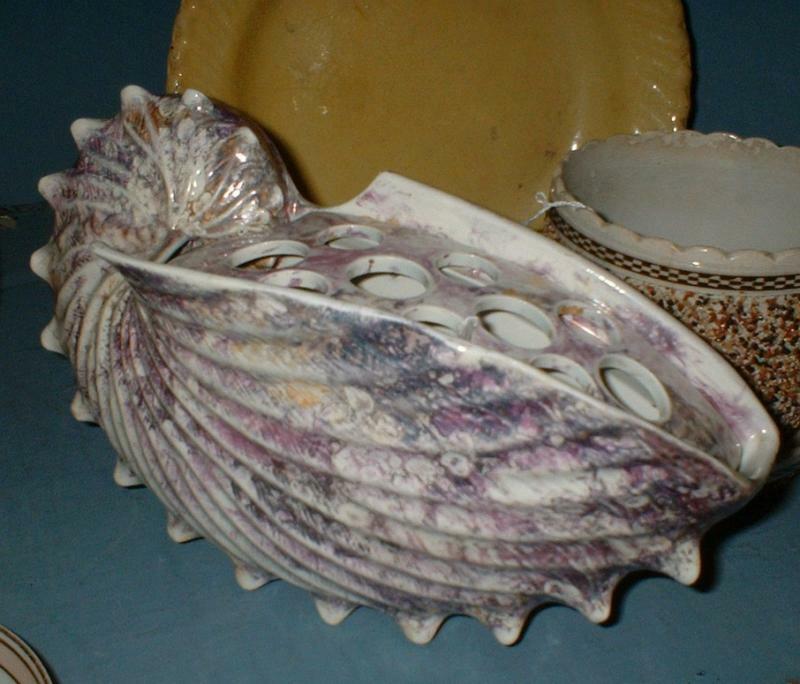 22 Scallop shell plates; 3 scallop bowls; 3 long clams, nautilus compote / tureen and underplate. 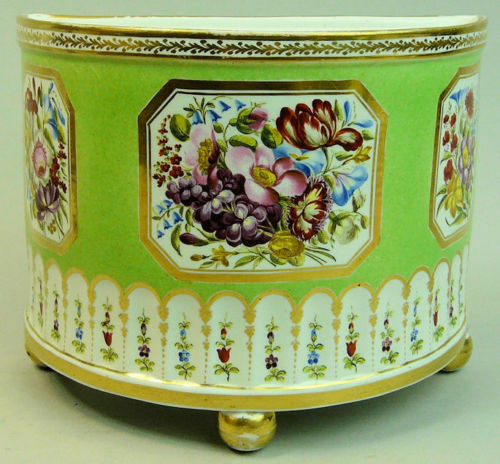 We also have similar examples in moonlight luster and green majolica - all 19th century. Large Swansea creamware botanical plate - named specimen marked on reerse in red script- "Elatior Tall Spotted" c. 1800. 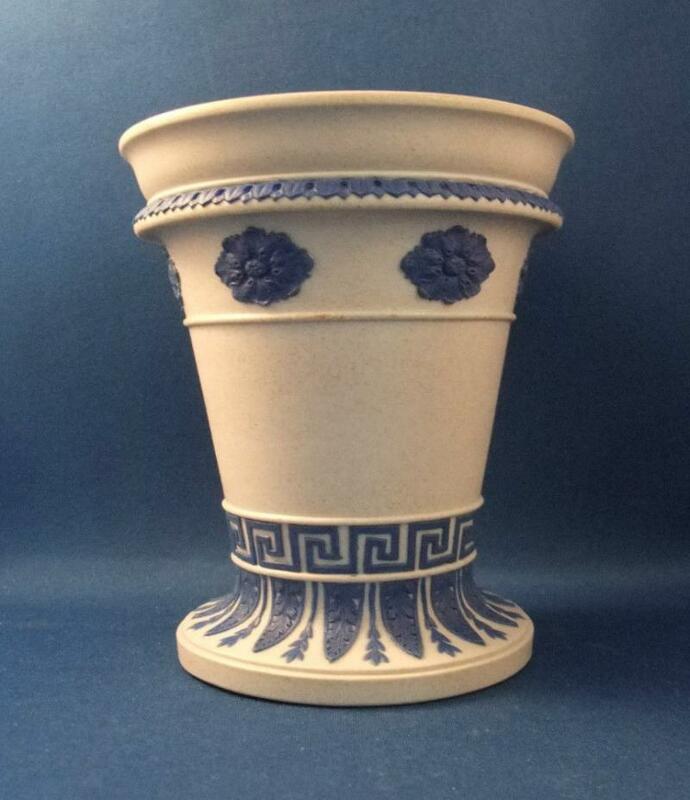 18th c. Wedgwood neoclassical bough pot with zinc fitted liner. 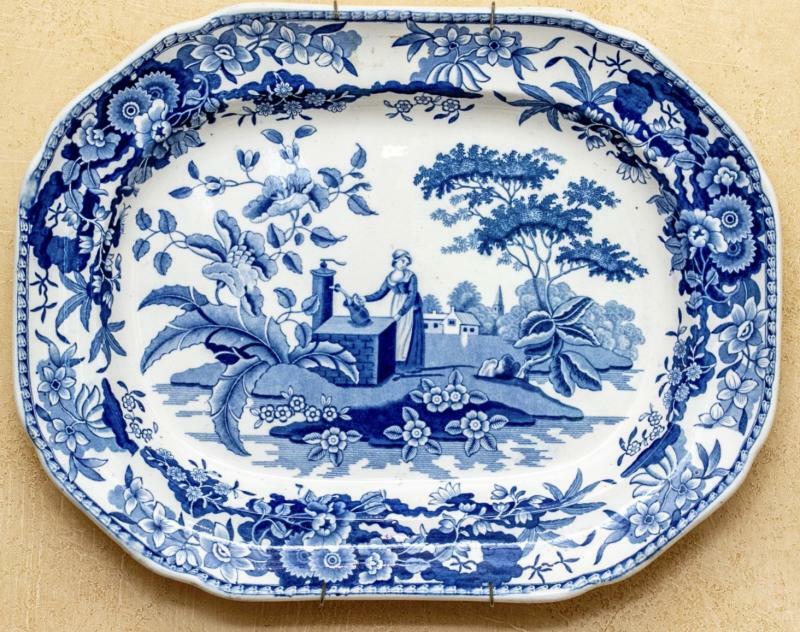 18th century Bristol Delft Charger. 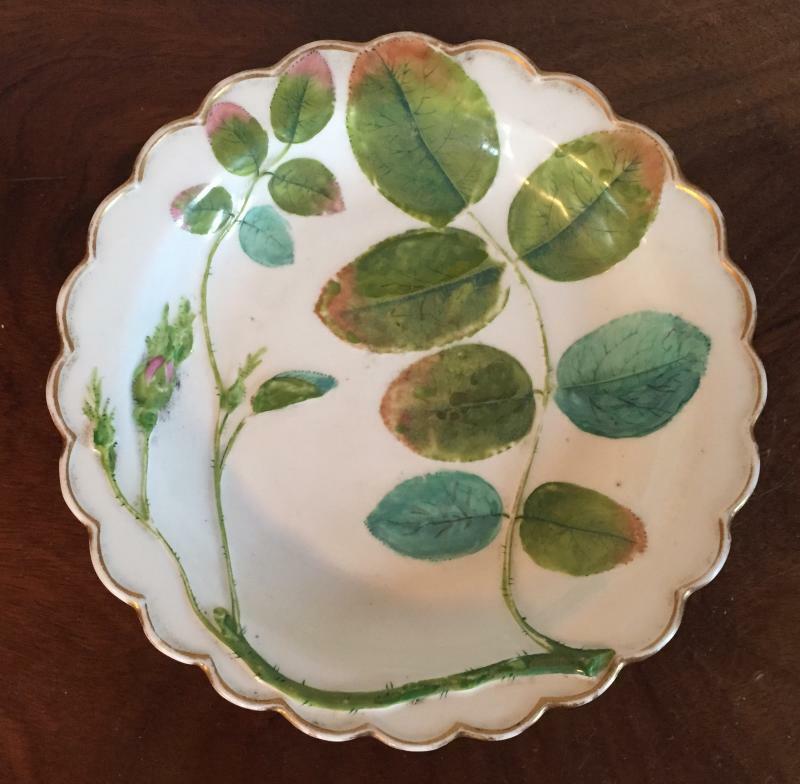 Don pottery creamware plate c. 1810 with large flower basket of roses and primula. 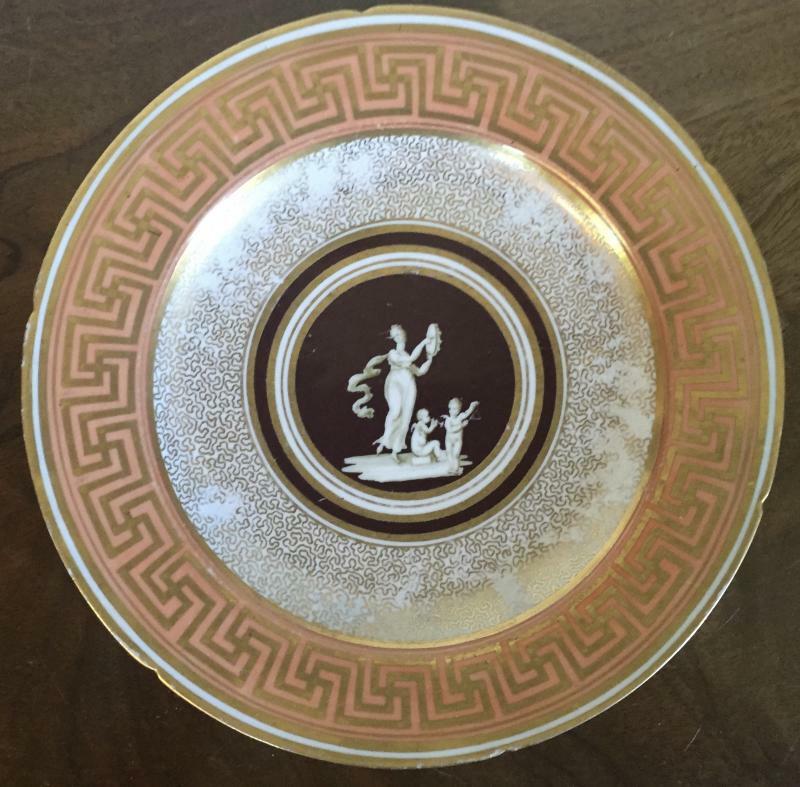 Derby porcelain plate - Roman Forum Ruins c. 1810. 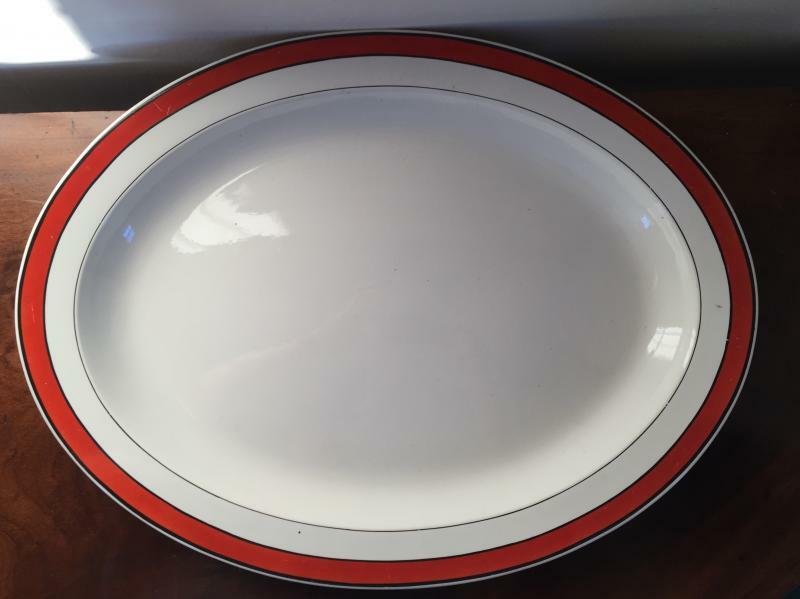 Worcester Flight Barr shell decorated plates - c. 1810. 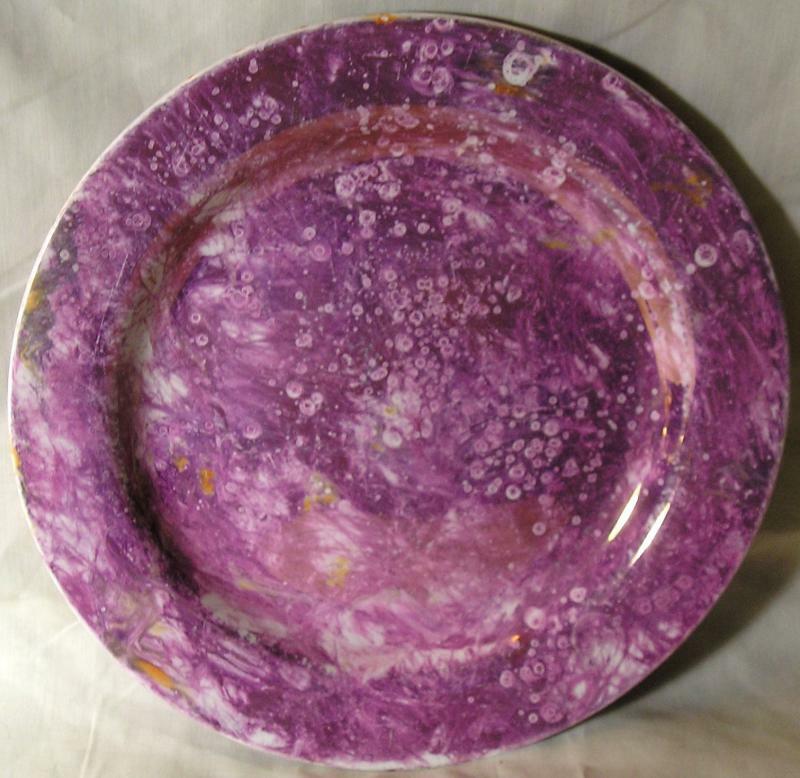 Large plates measure 10" in diameter; bowl 8". 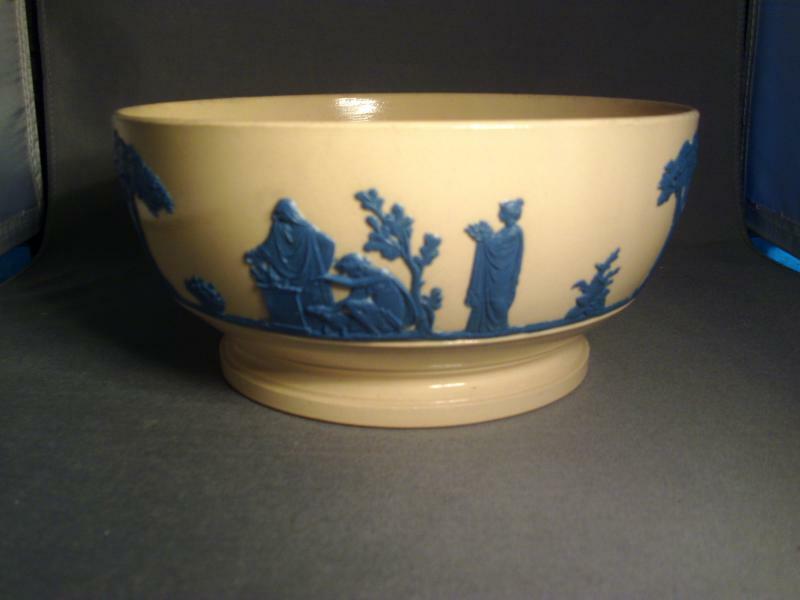 Early 19th c. Spode crescent shaped bough pot decorated with figures in landscape. 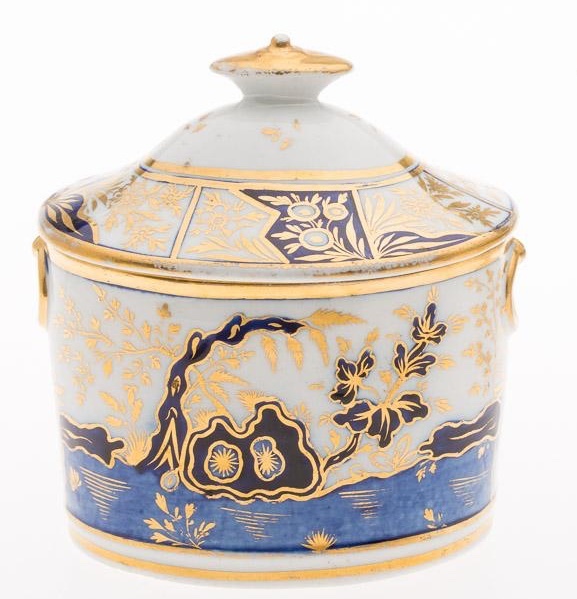 Wedgwood smear glaze jasperware crocus pot and cover c. 1810. 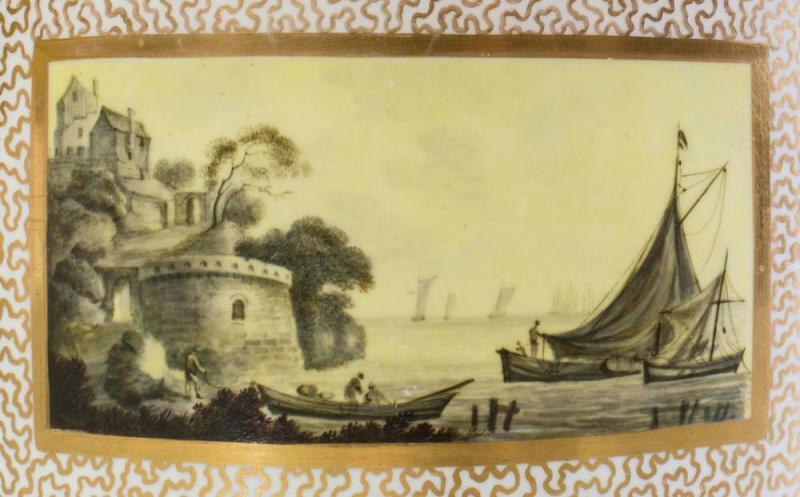 Early 19th c. Spode box and cover with landscape decoration. 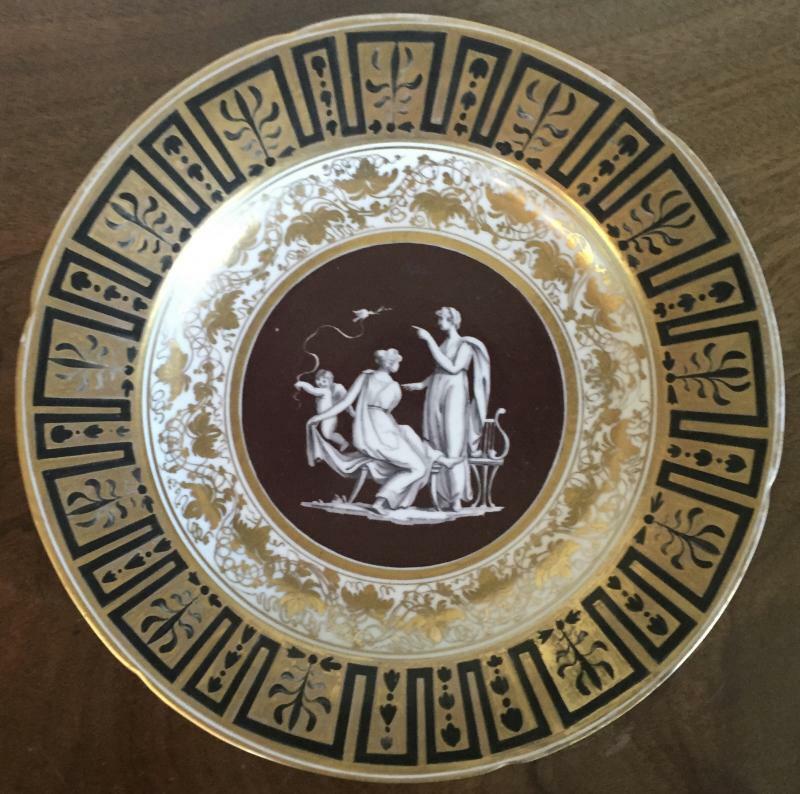 Fine pair Coalport neoclassical plates with grisaille decoration c. 1805. Exceptional large pair Wedgwood Jasper flower pots with ring handles - 19th c.Measurement: 10 3/4" in diameter. 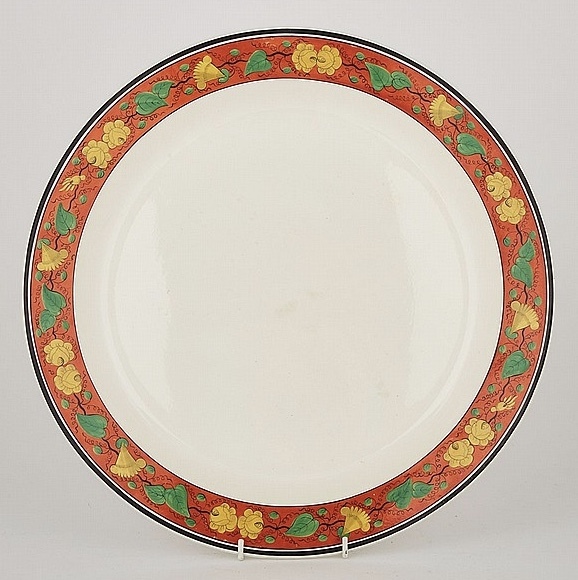 Mason's Ironstone imari c. 1815. 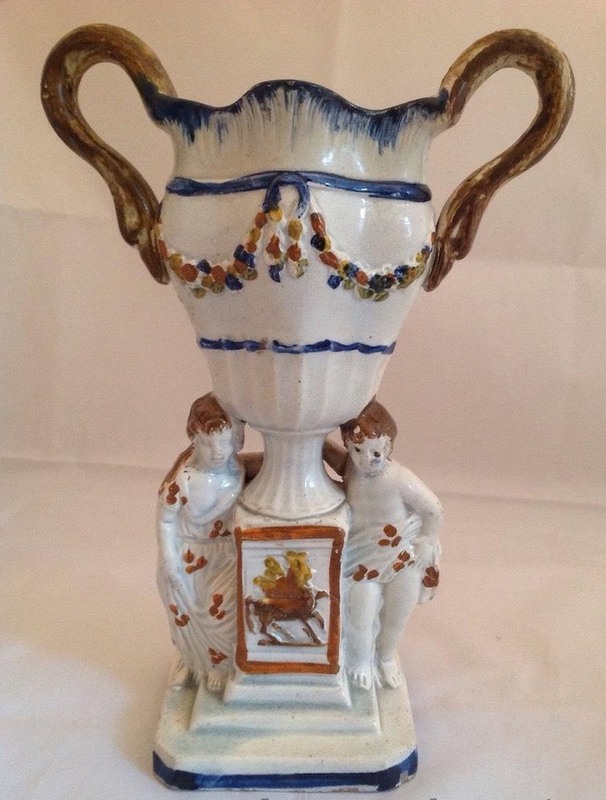 Early 19th c. Turner or Adams Jasper smear glazed vase and cover in the French taste.Measurement: 11" tall. 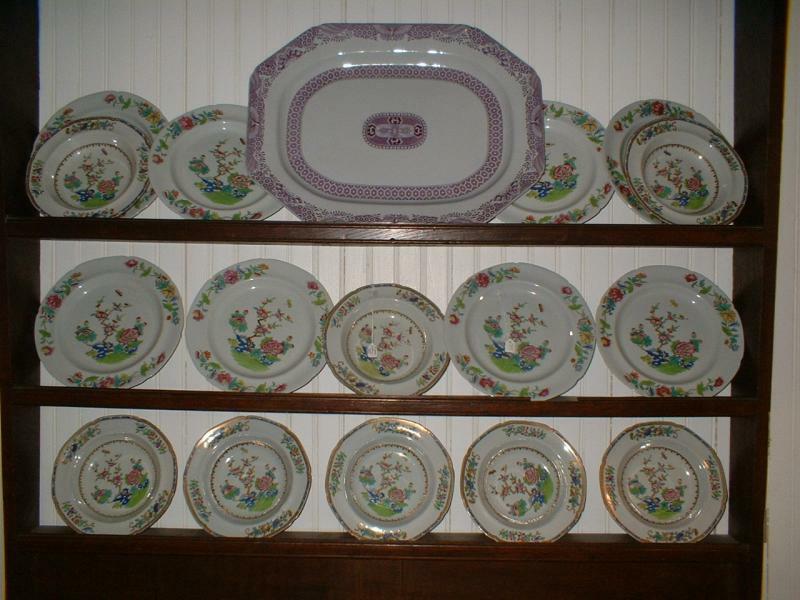 Collection of early 19th c. King's rose pearlware plates and tea wares c. 1815. Nine round 18th c. Leeds featheredge plates.Measurement: 9". 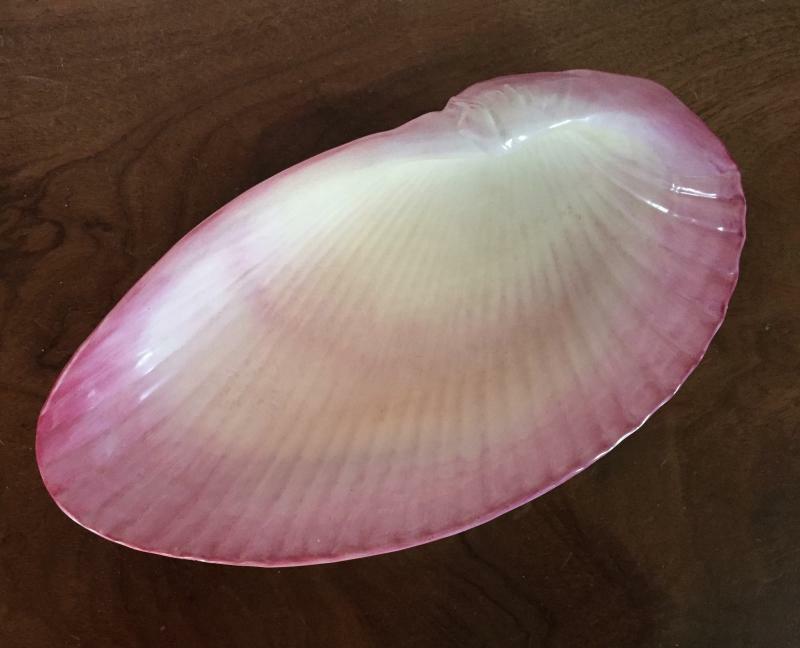 Early 19th c. Wedgwood moonlight luster shell form dishesMeasurement 13" long. 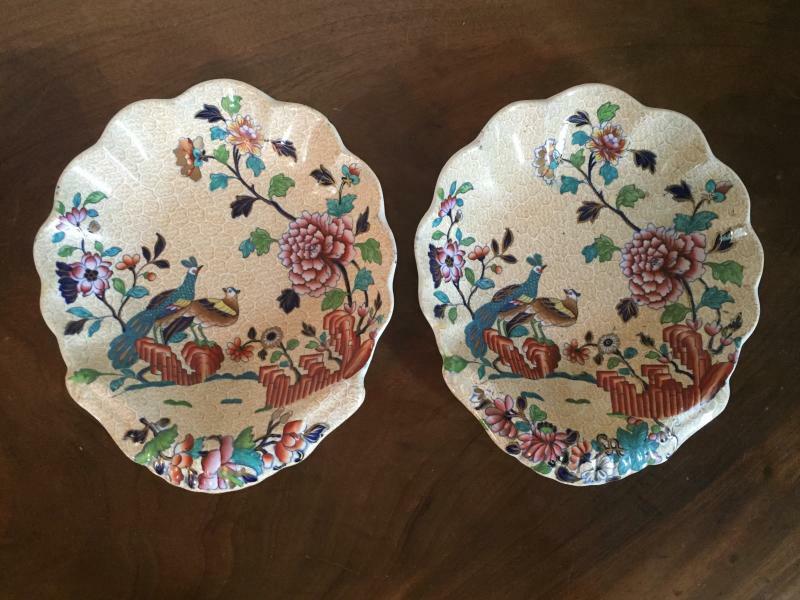 Pair 19th c. Wedgwood pearlware shell dishes. 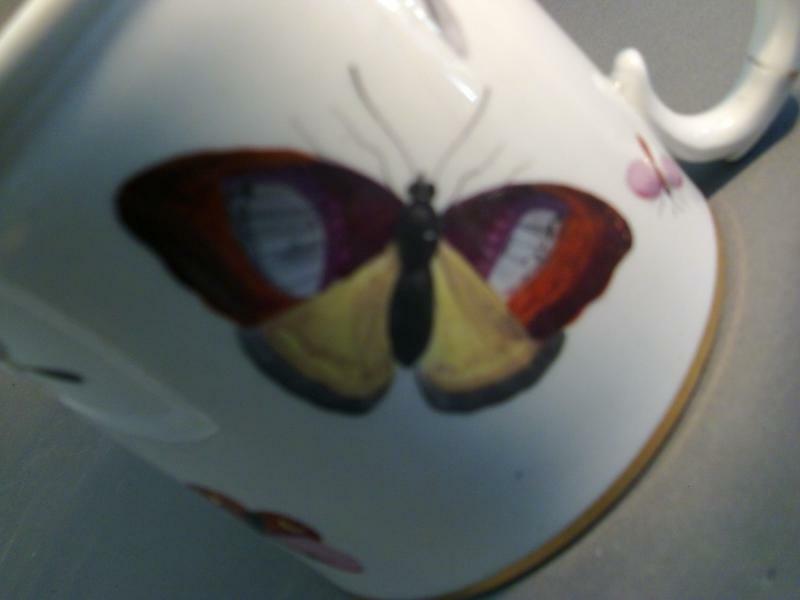 Large 19th c. Coalport Tankard mug decorated with butterflies, insects and a bird. 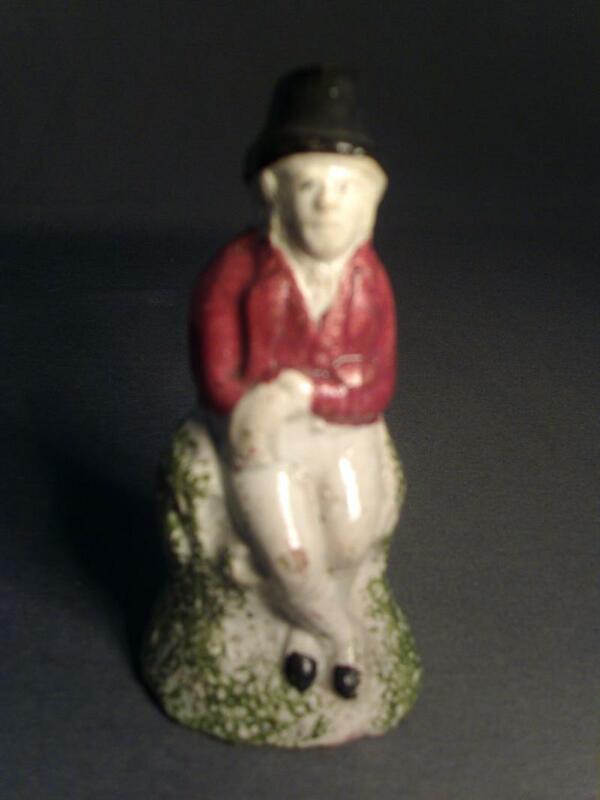 Prattware figure of a hunter in red coat. 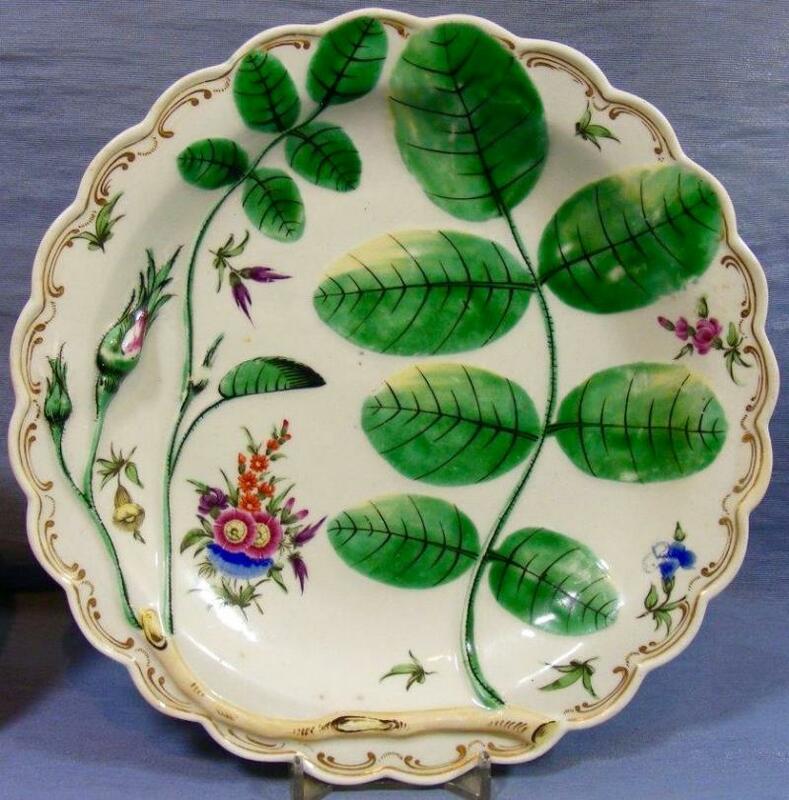 Shorthose or Swansea pearlware botanical dessert dishes decorated with named specimens. c. 1800. 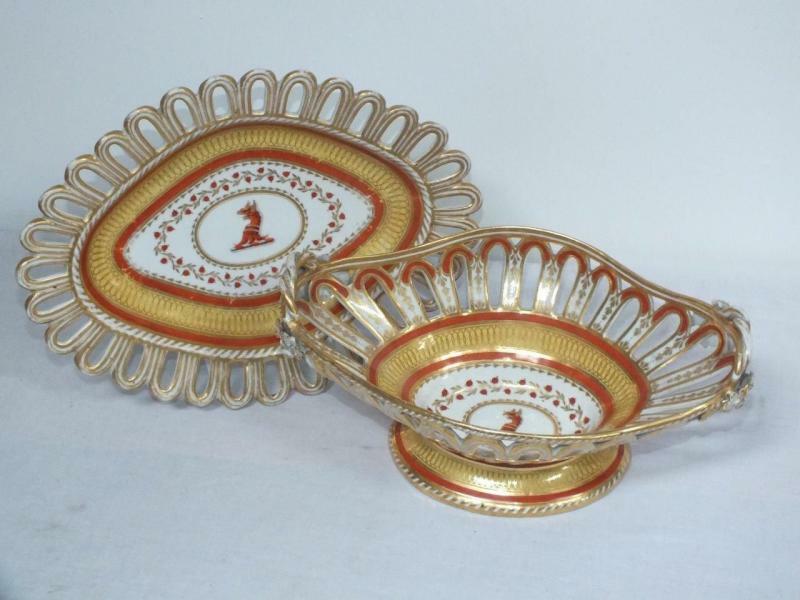 Pair early 19th c. Coalport square dishes in an interesting brown ground - made to approximate Chinese batavian ware. 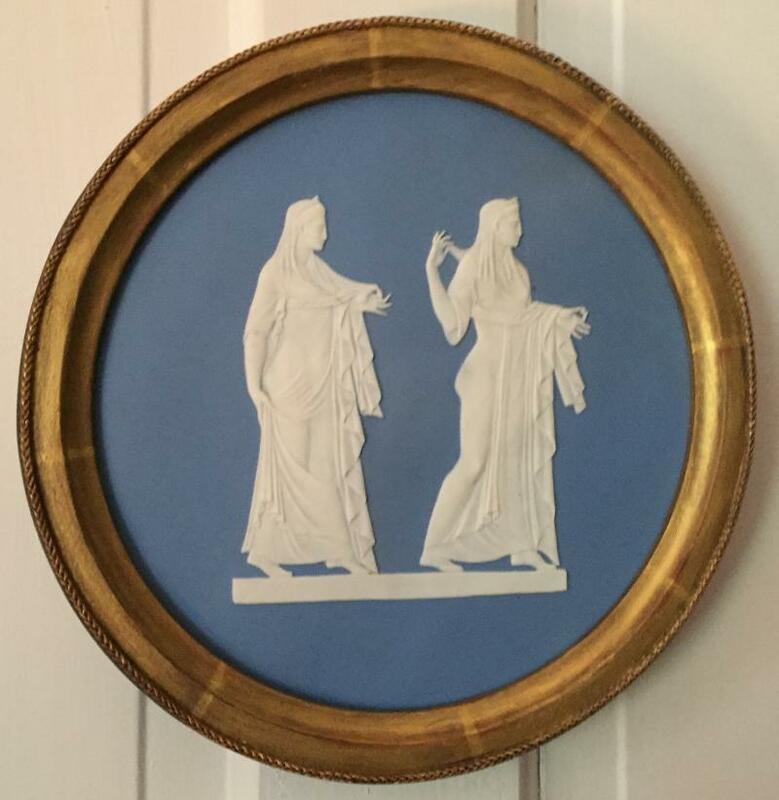 Riley's blue transfer plate - early 19th c.
Wedgwood cane/jasperware bough pot c. 1810. 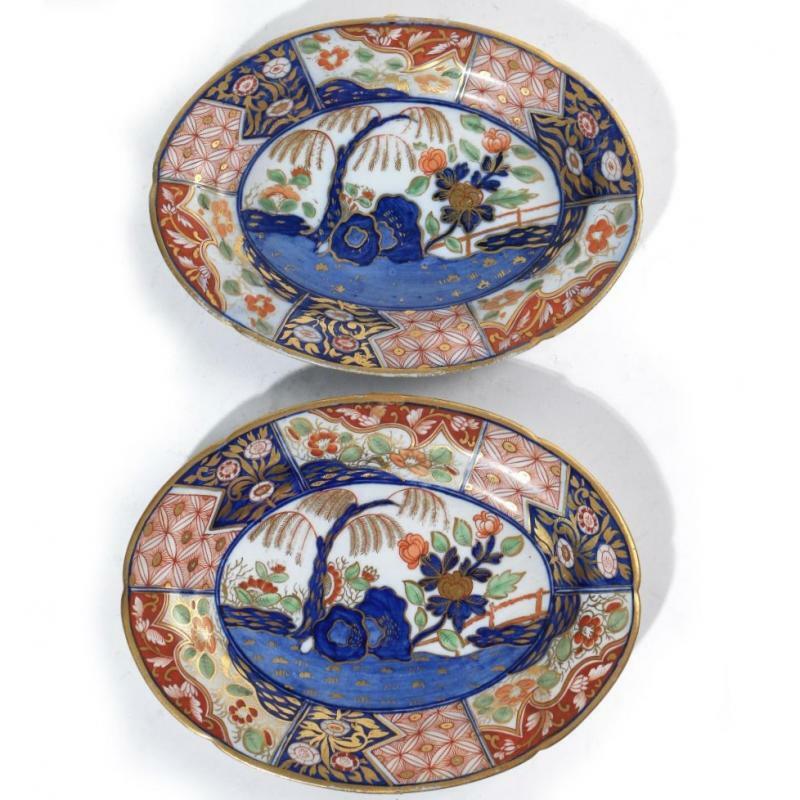 Pair New Hall lozenge shape dishes with imari or Japan decoration in blue and orange - c. 1810. 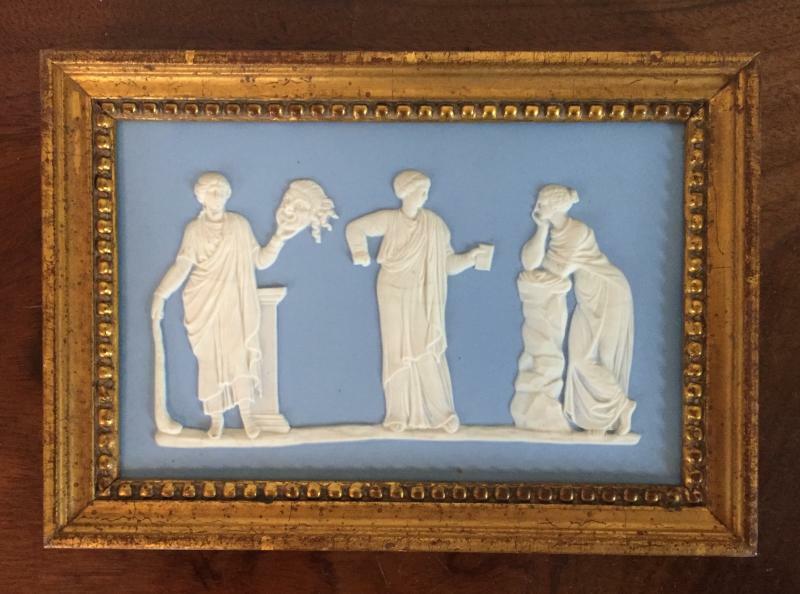 19th c. Wedgwood plaque of the three graces mounted into the top of a velvet box. Wedgwood drabware encrier or inkwell with gilt highlights, lion and ring handles raised on animmal paw feet - c. 1810. 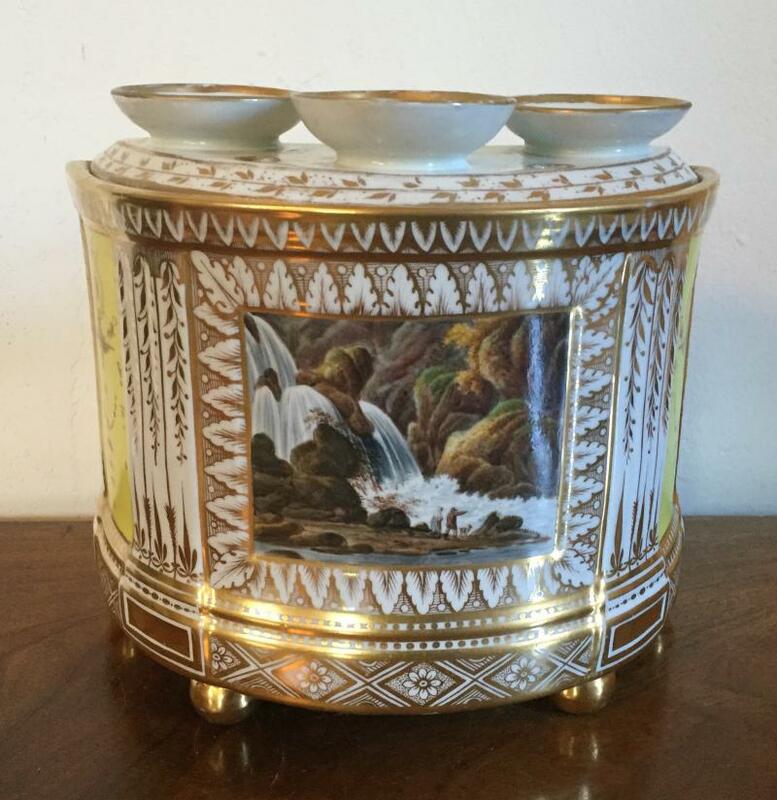 Coalport coffee cans in classical grisaille decoration with plain and Greek key gilt rims c. 1810. 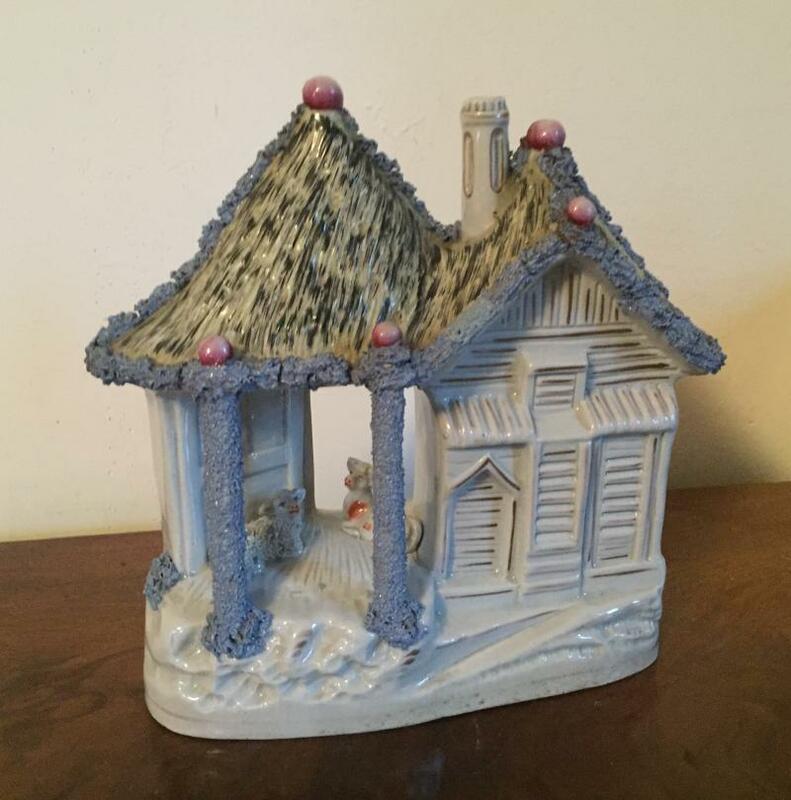 Early 19th century Staffordshire pottery pastille burner in the form of a gothic house.. 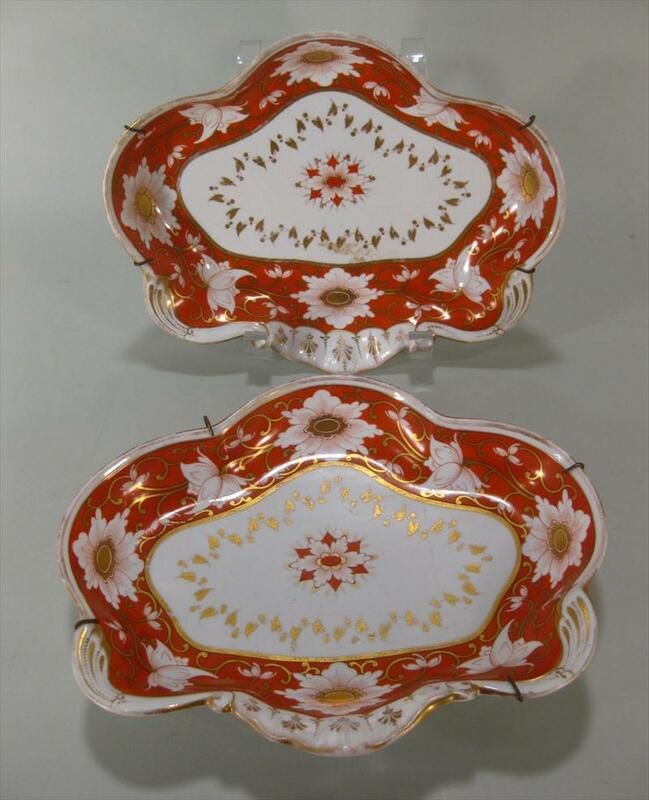 Pair large square Worcester porcelain dishes with orange red ground, gadrooned edges and gilt highlights - early 19th c. Measurement: 9" square. 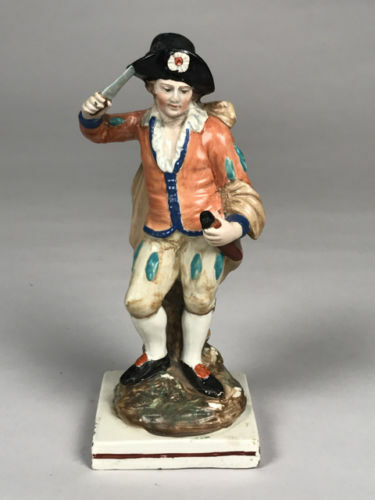 18th c. creamware figure of a drummer. 19th c. silver lustre tea pot, sugar box and creamer. Spode porcelain root pot with grisaille landscape decoration and ring handles.Measurement: 7" tall. 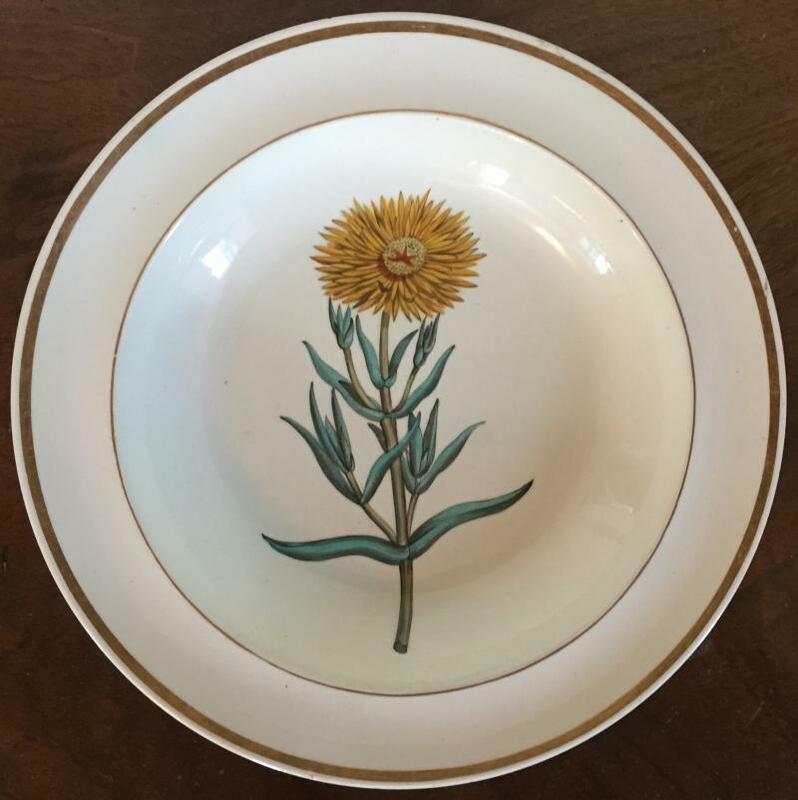 Derby porcelain plate decorated with botanical specimen named on reverse - "Golden Sage" - 1810. 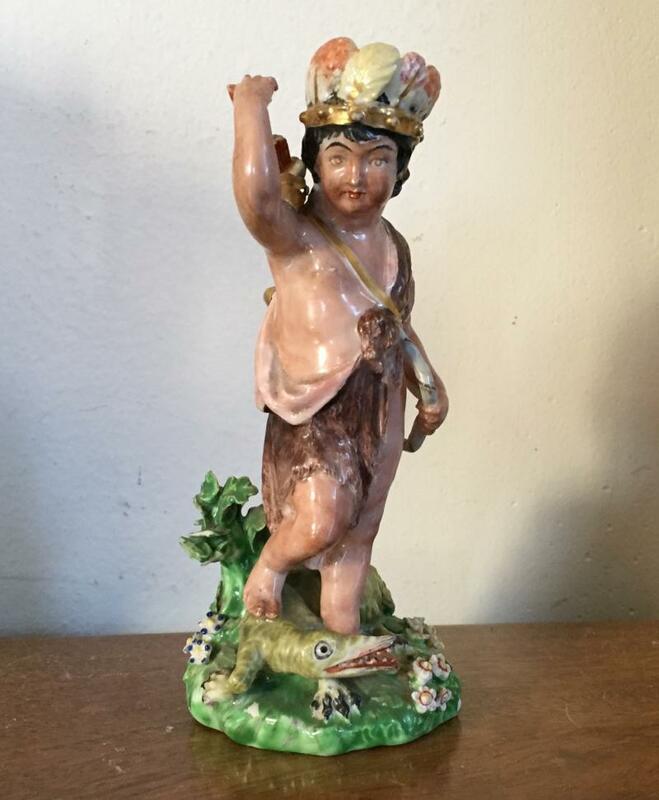 Large Derby cherub on rococo stand - 18th c.Measurement: 7" tall. 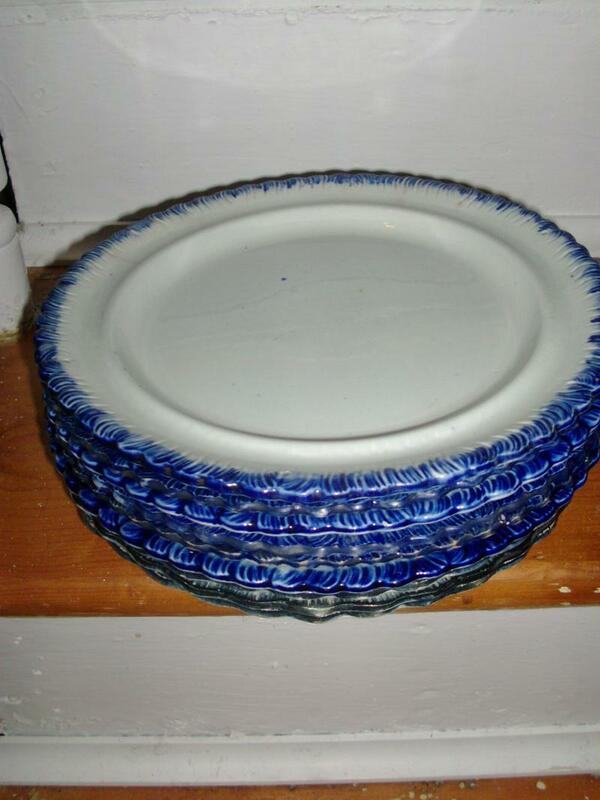 Rare Set of Wedgwood feather edge platters. 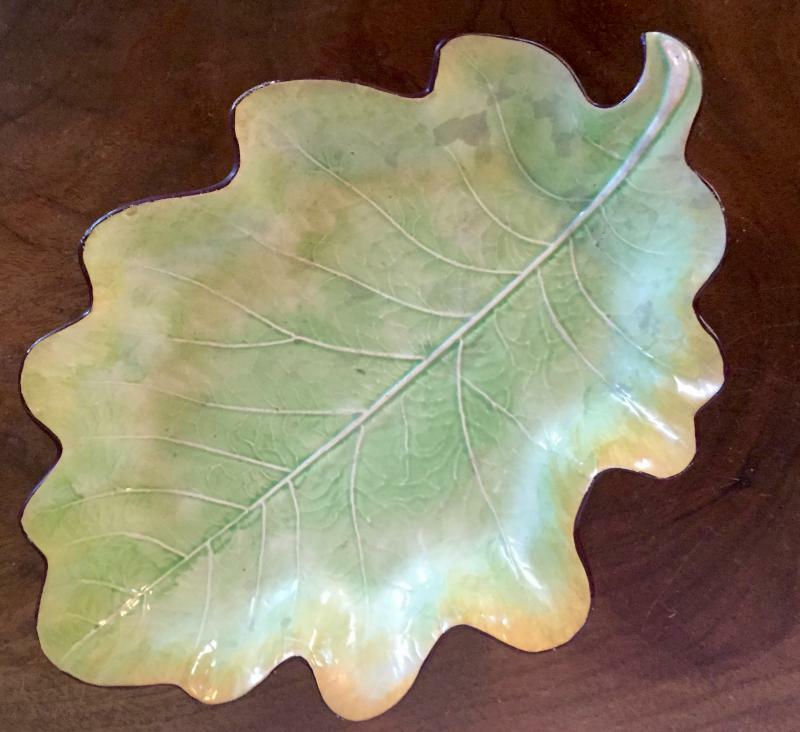 Large size - c. 1800.Measurement: largest is 23"
Herculaneum feather edge platter in green - c. 1800.Measurement: 17.5" long. 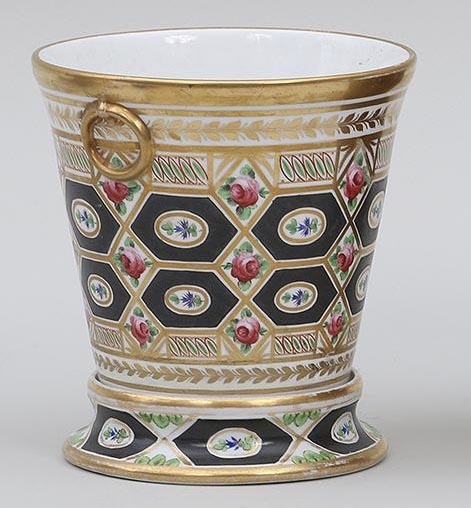 Worcester Flight Barr & Barr porcelain fruit cooler - early 19th century. 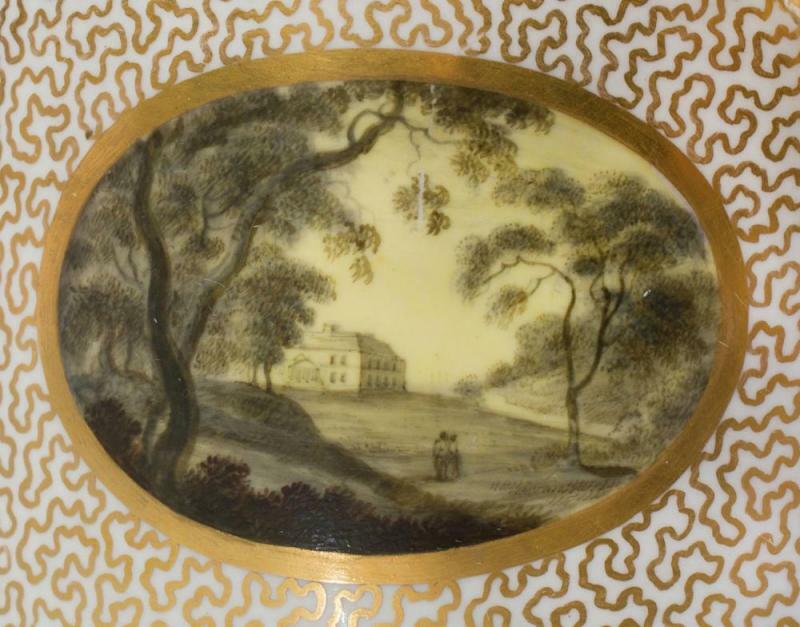 Wedgwood pearlware plate with reserve landscape in brown and yellow c. 1800. Adams classical vase with brown ground c. 1810. 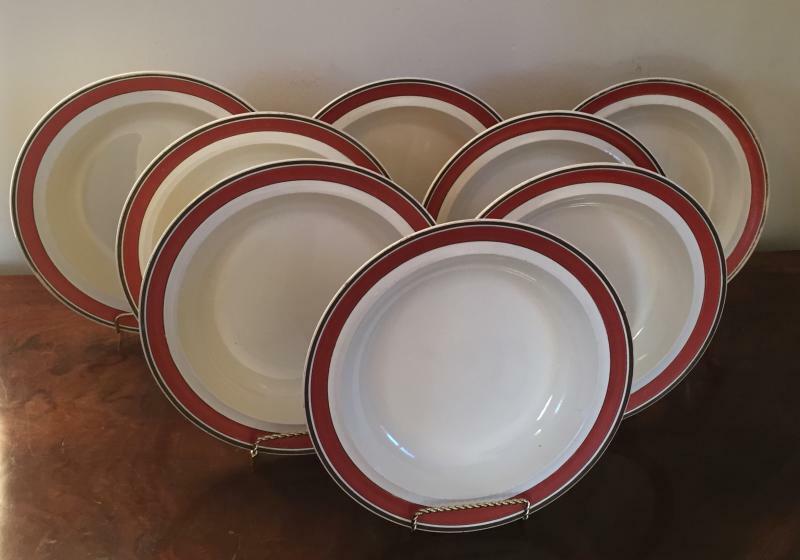 Selection of 19th c. feather edge inclulding plates, tureens and entree dishes. 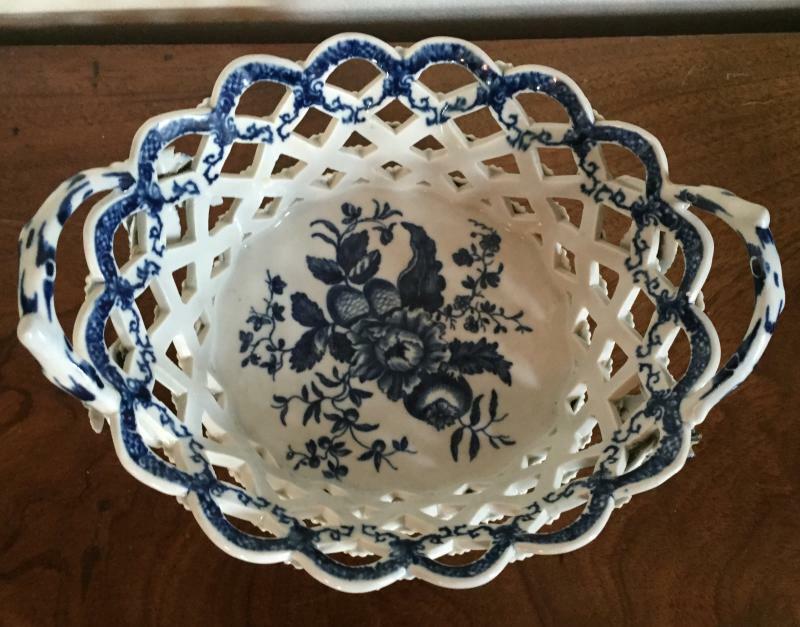 Salt glaze chestnut basket - 18th century. 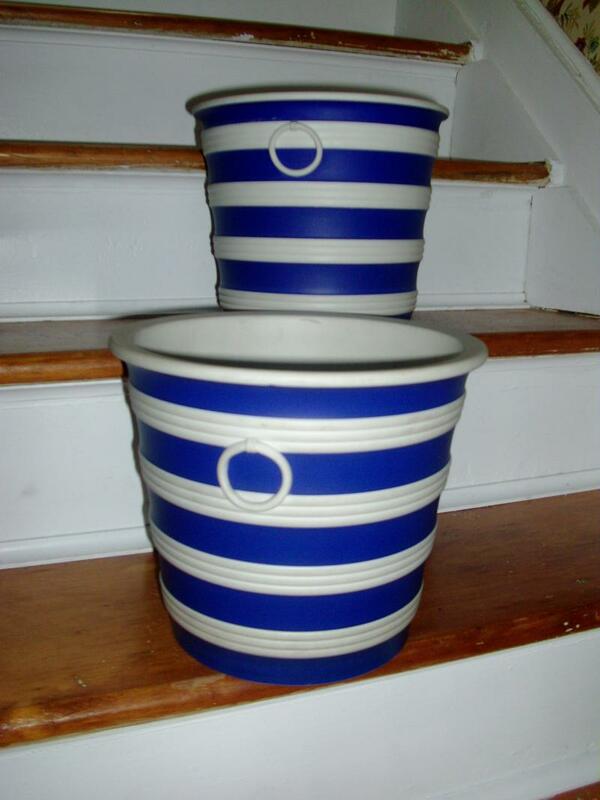 Spode violet pots and covers. Early Bow figural group c. 1760. 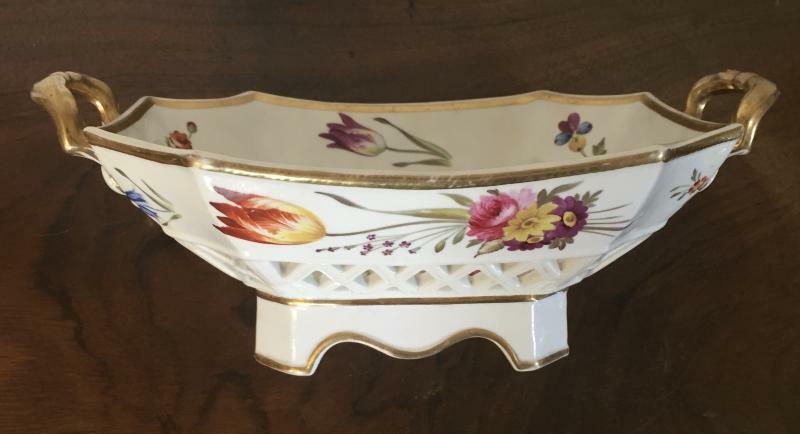 Derby porcelain botanical dish featuring a lily with faux marble ground and sophisticated gilding. Fine Derby porcelain urn with snake handles and reserve painting of fruit and flowers; opposite side with sumptuous landscape. Salmon ground and faux marble design with anthemion and greek key highlights. Early and rare. 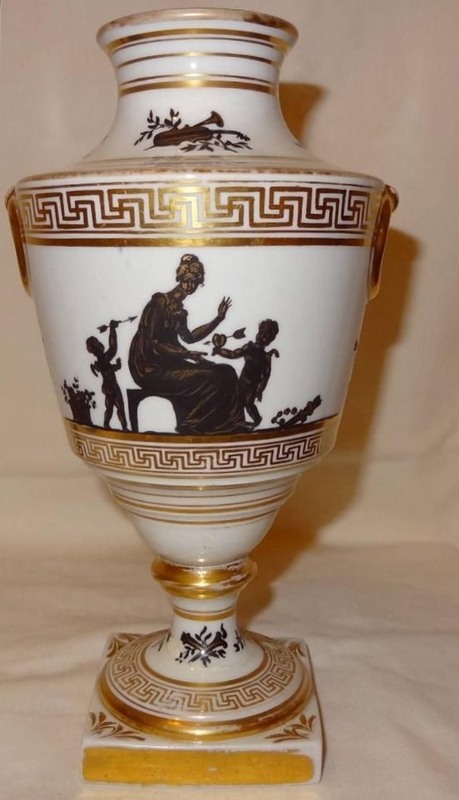 Spode vase with geometric gilding and reserve painting of a named view - Stone Quarry in Devon. 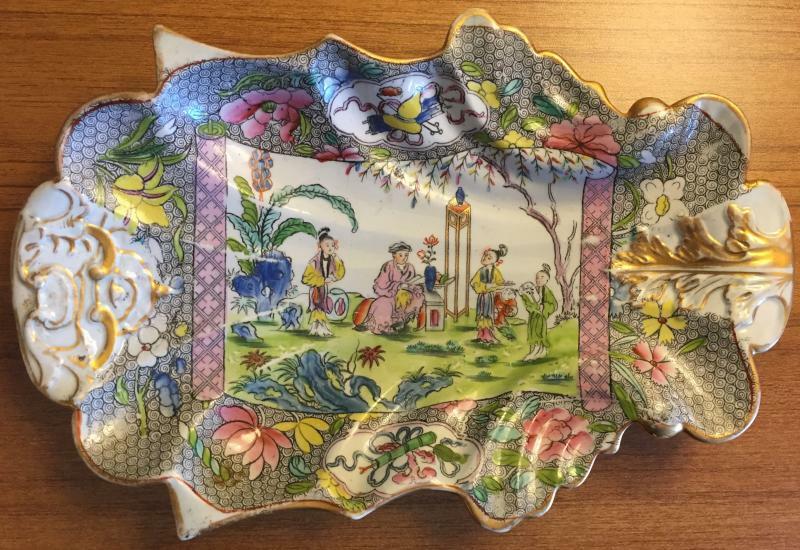 Worcester porcelain square dish in the orange blossom pattern with grisaille landscape painting in the center c. 1805. 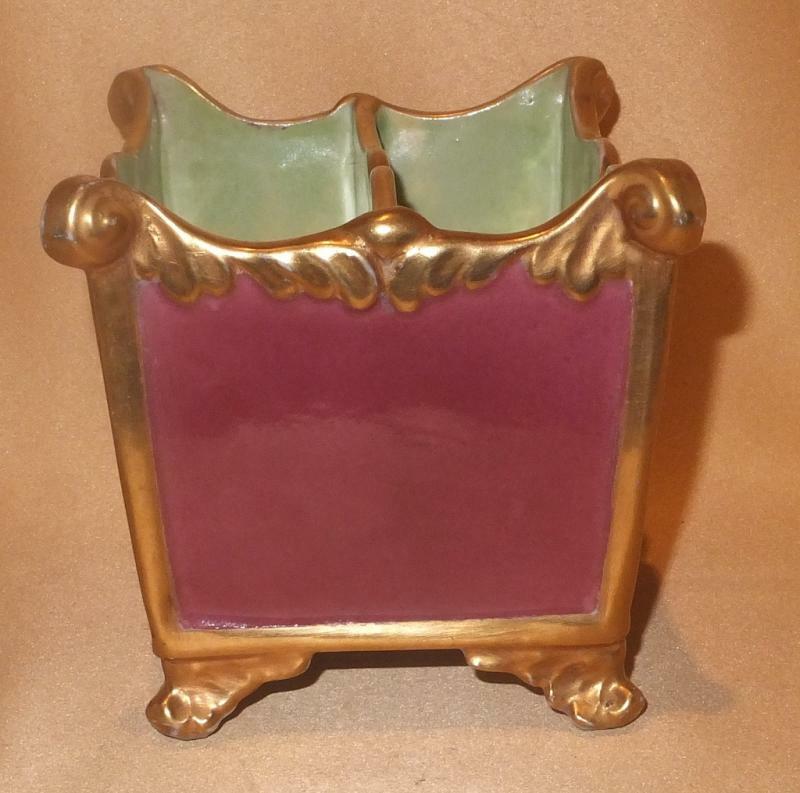 Derby cooler or planter with cobalt and gilt decoration. England c. 1795. 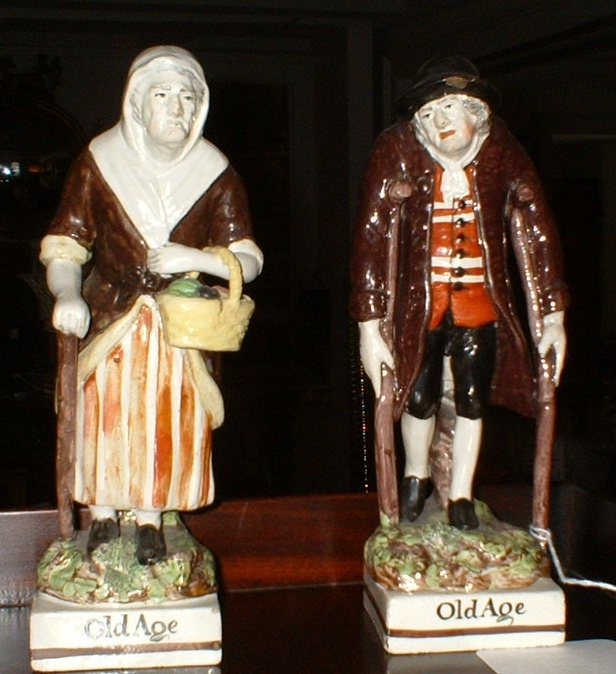 PAIR Staffordshire figures depicting old age in great browns and reds c. 1810. Wedgwood pearlware moonlight luster shell form wall pocket or bough pot c. 1810. 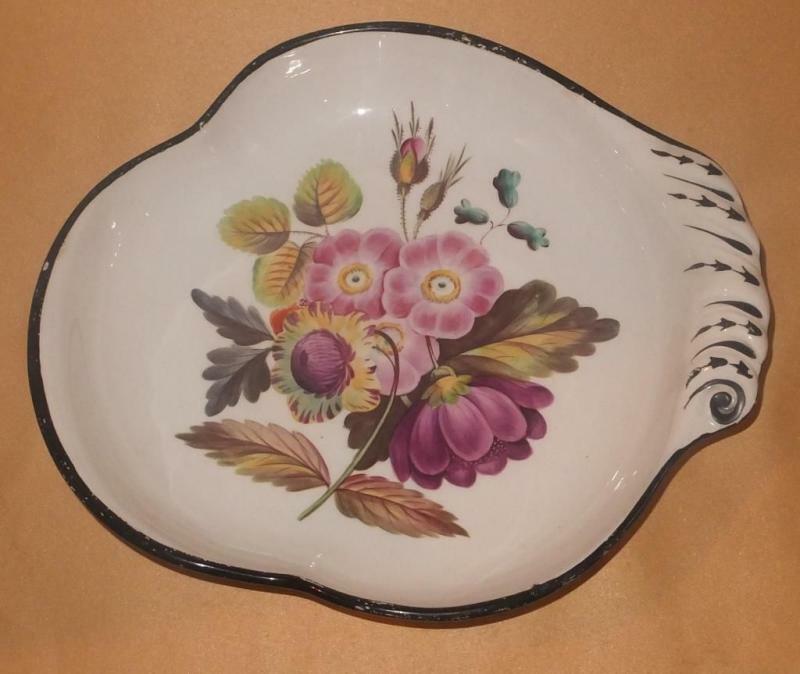 Wedgwood pearlware lustre shell form dish c. 1810. 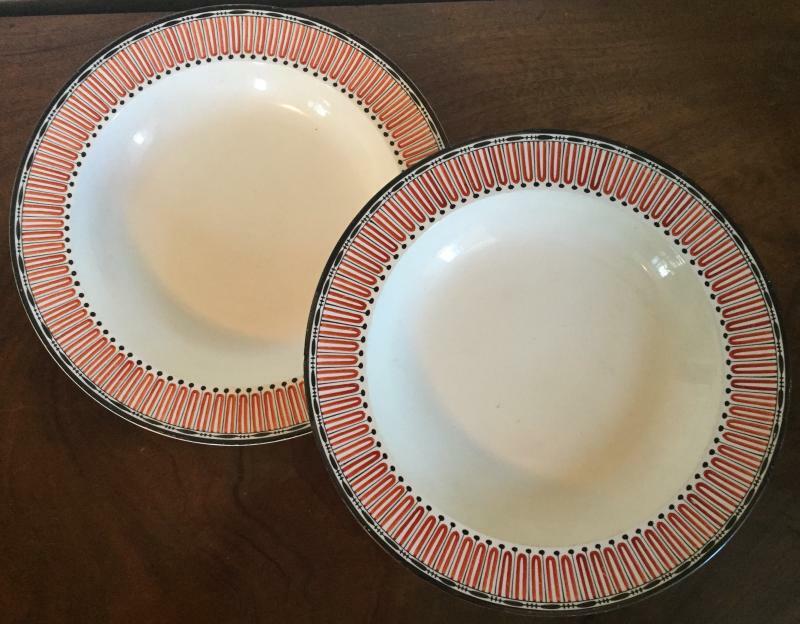 Spode ironstone imari dinner plates and soup bowls -eight of each - c. 1815. Early 19th c. Staffordshire pearlware figural window support in the form of a lion. 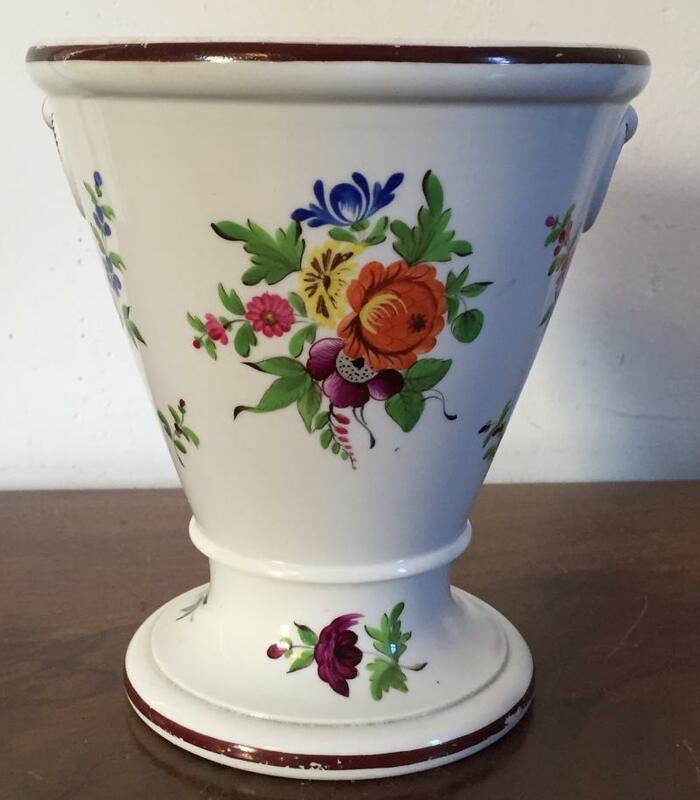 Large Coalport root pot with reserves showing birds and flowers. Lion mask ring handles, rare salmon and purple ground picked out in matte and burnished gold. 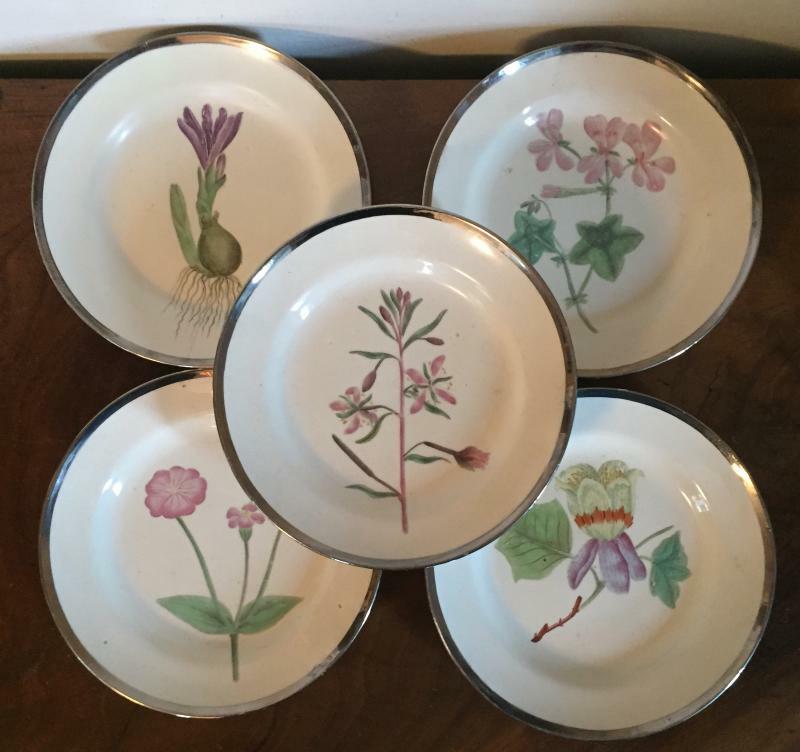 Collection of Paris and Derby cornflower sprig decorated serving pieces including coolers, sauce tureens, pot de creme and dessert dishes c. 1790 - 1820. This pattern was used by Jefferson at Monticello and is found on exhibit there today. 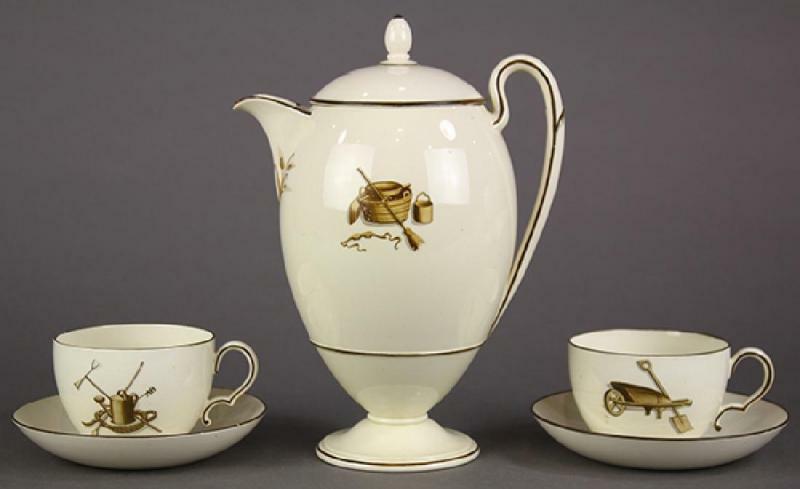 Wedgwood drabware personal tea service c. 1800.